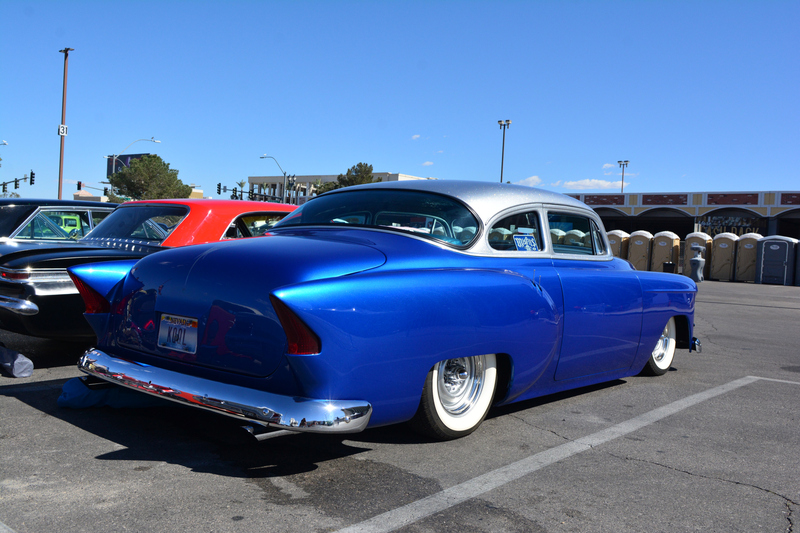 For Saturday the club met at registration, at 6:15 AM and we all went in together so that we could park together. 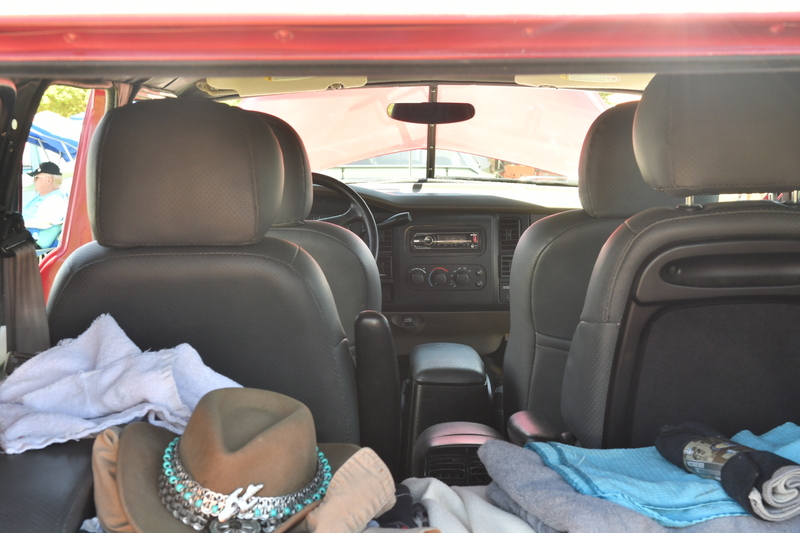 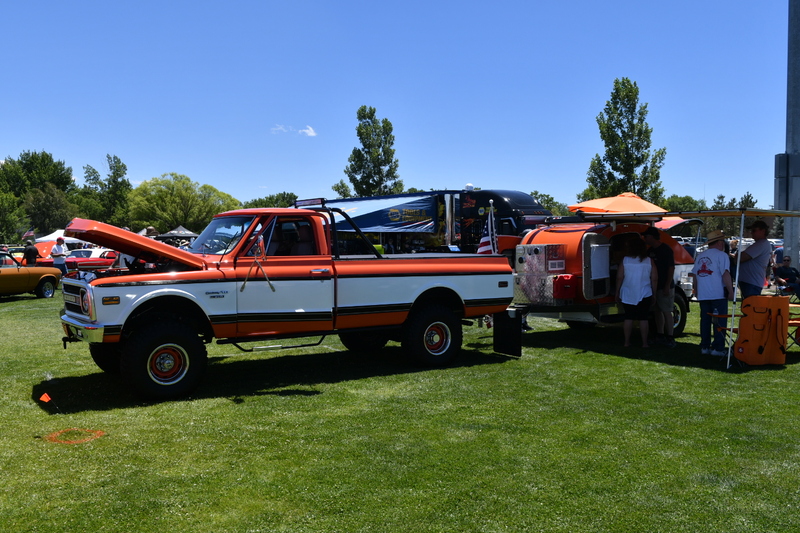 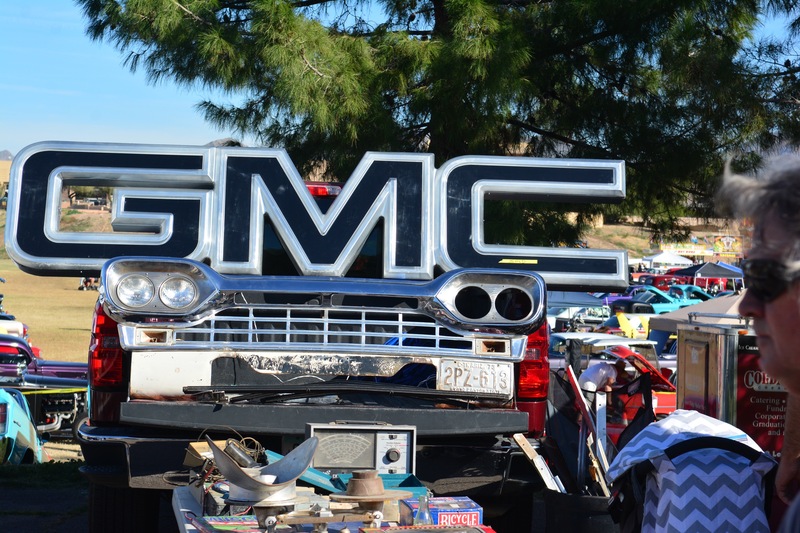 We parked midway down the field and close to the Swap Meet. 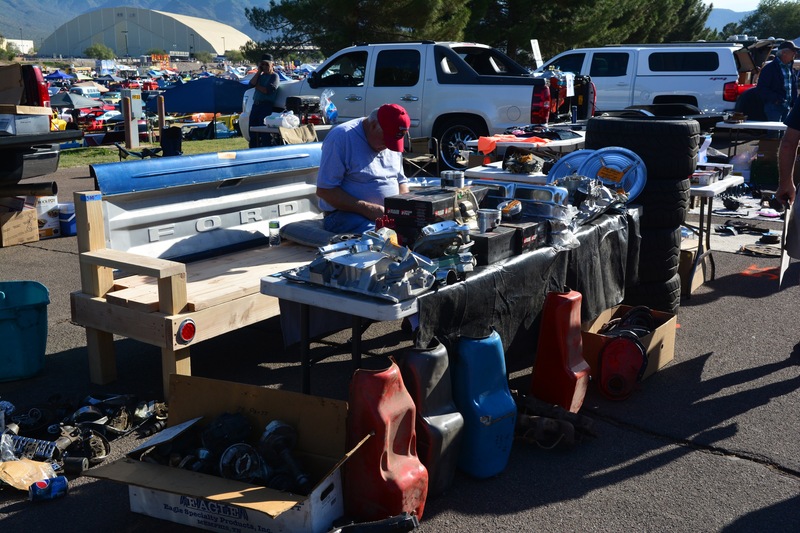 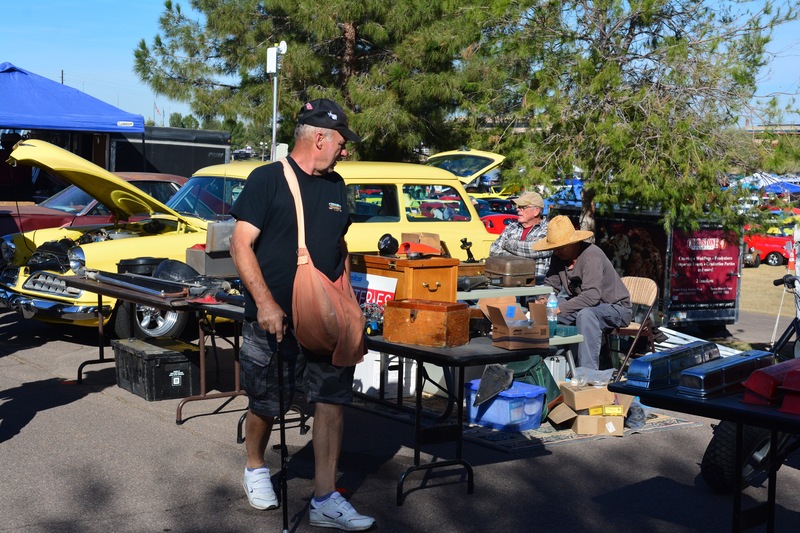 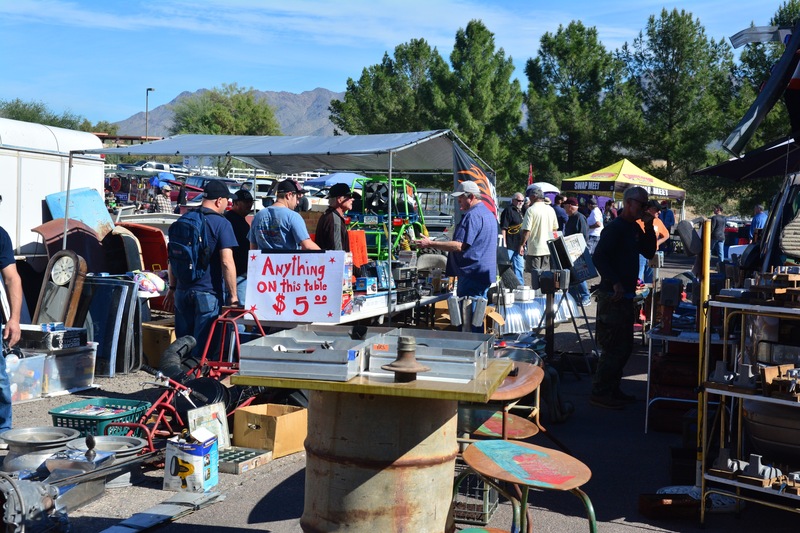 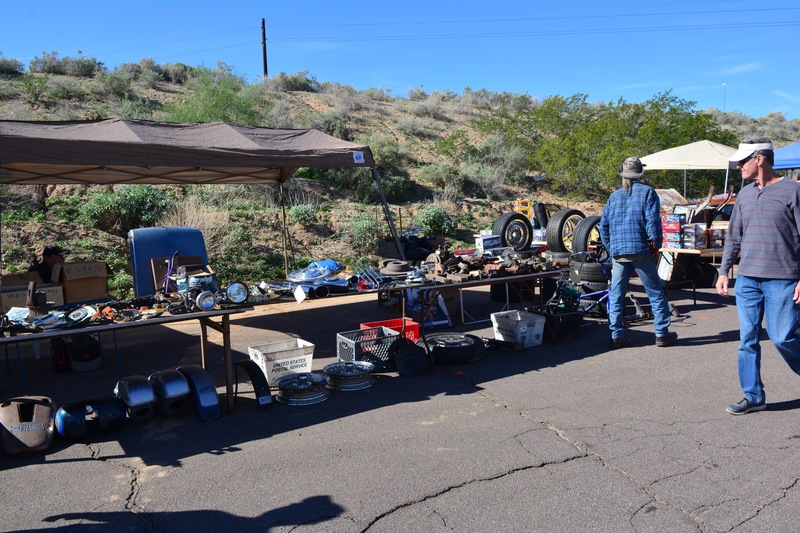 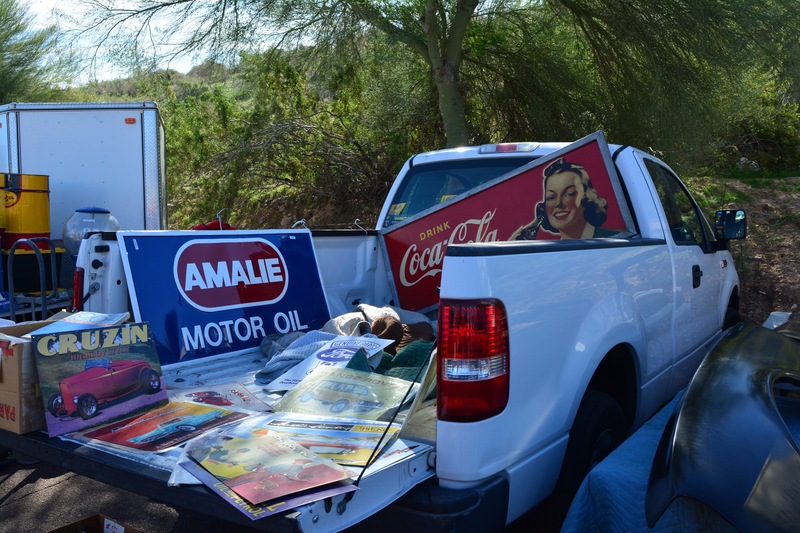 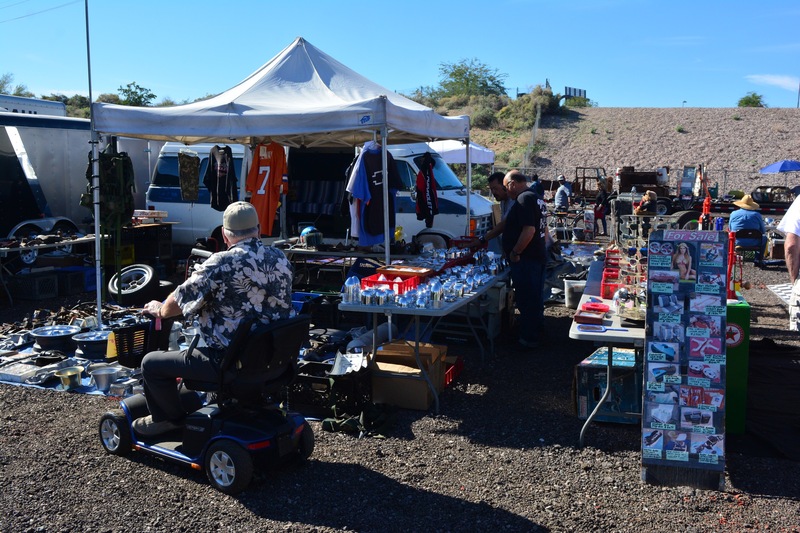 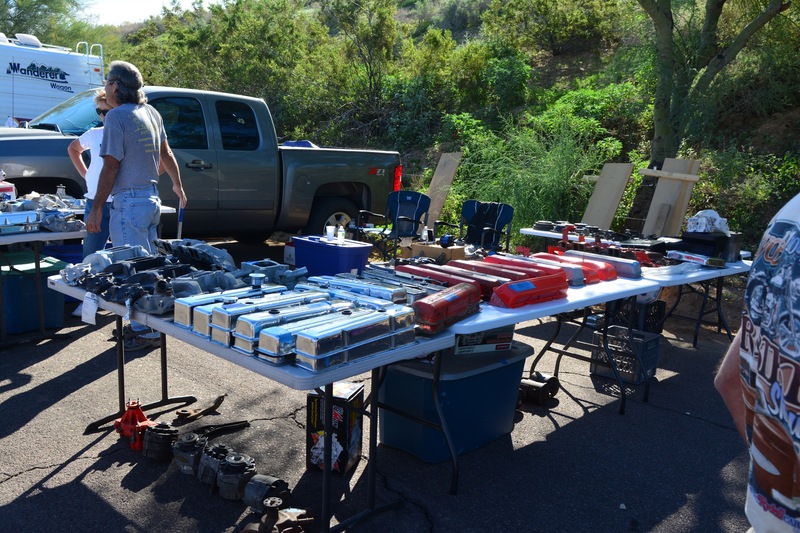 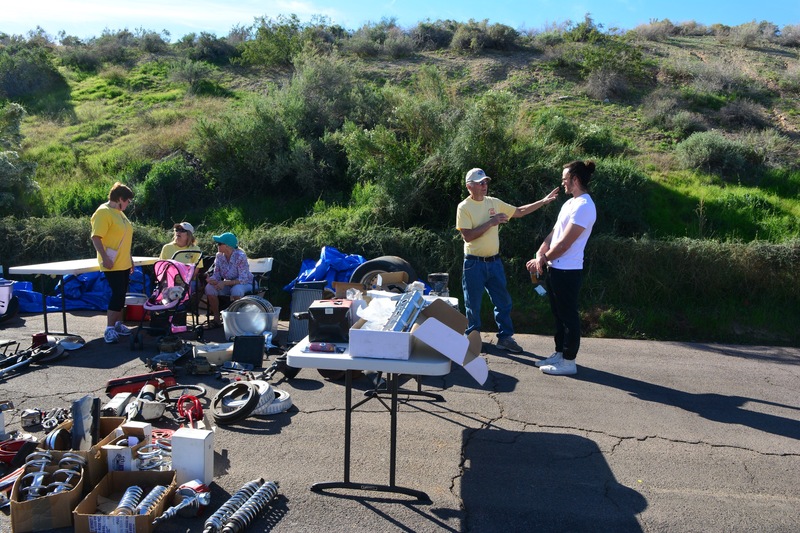 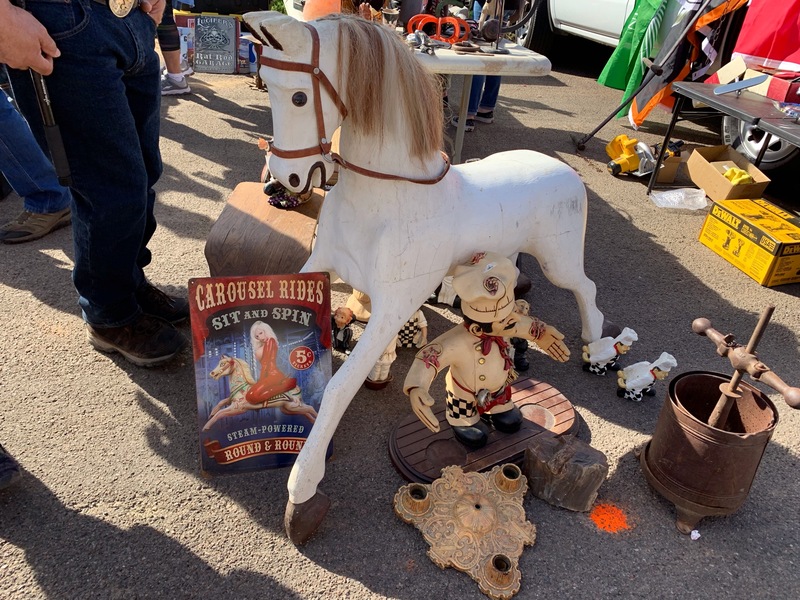 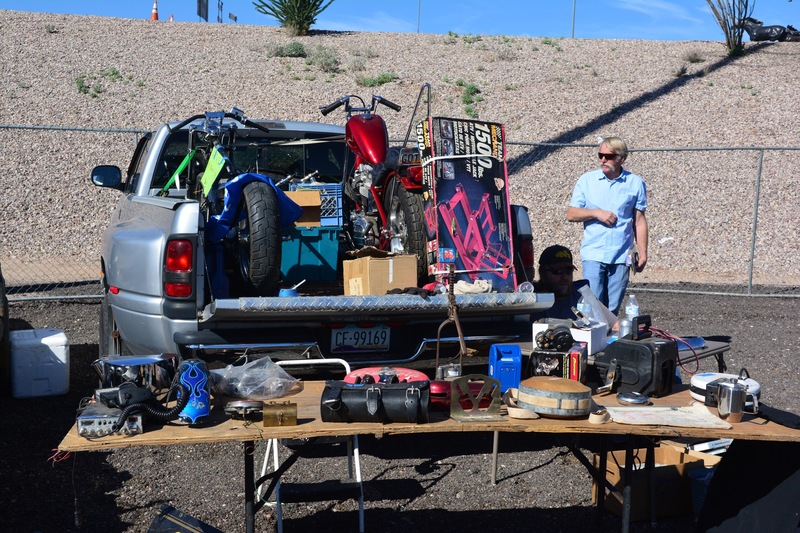 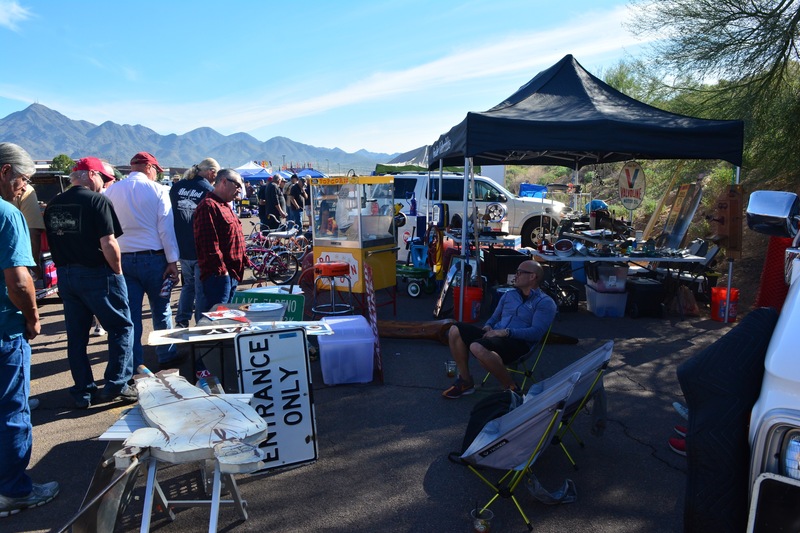 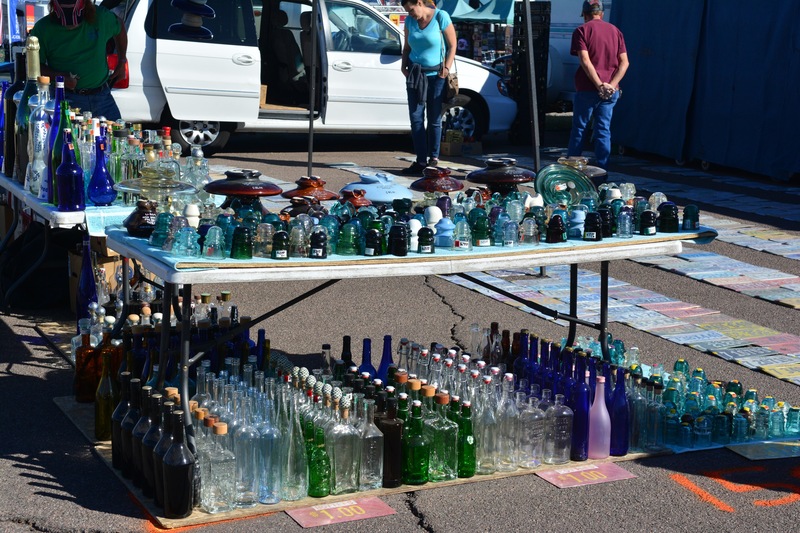 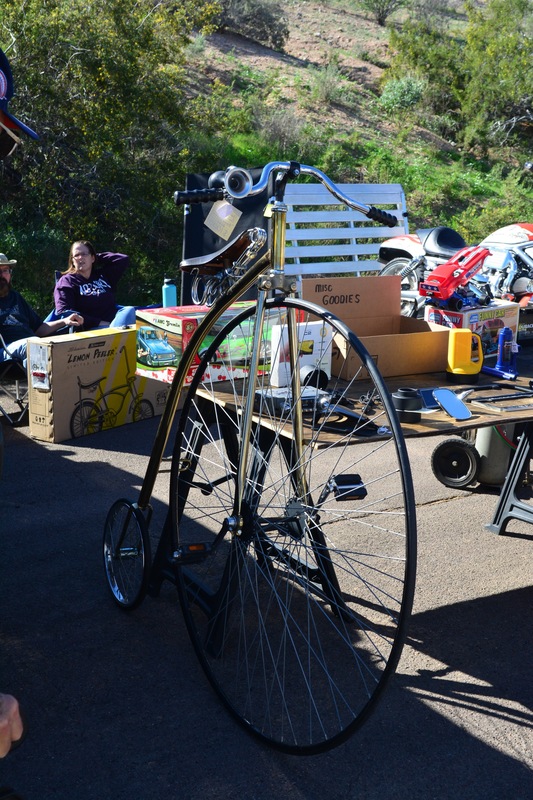 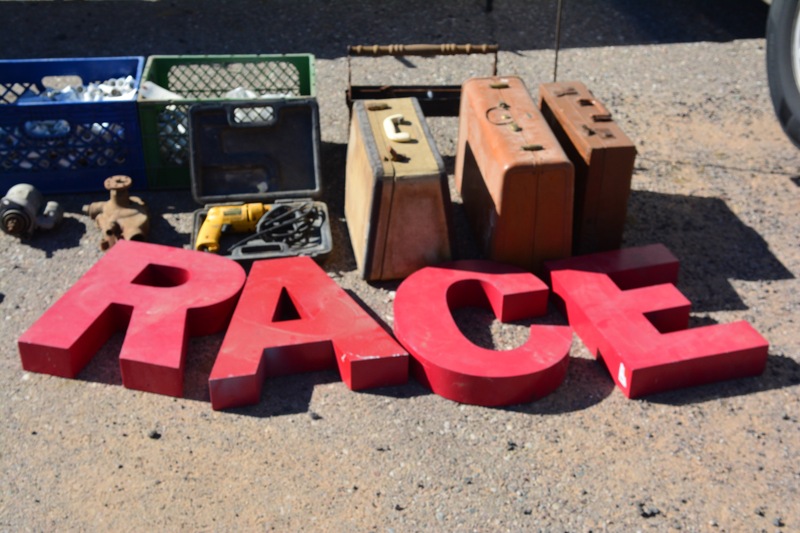 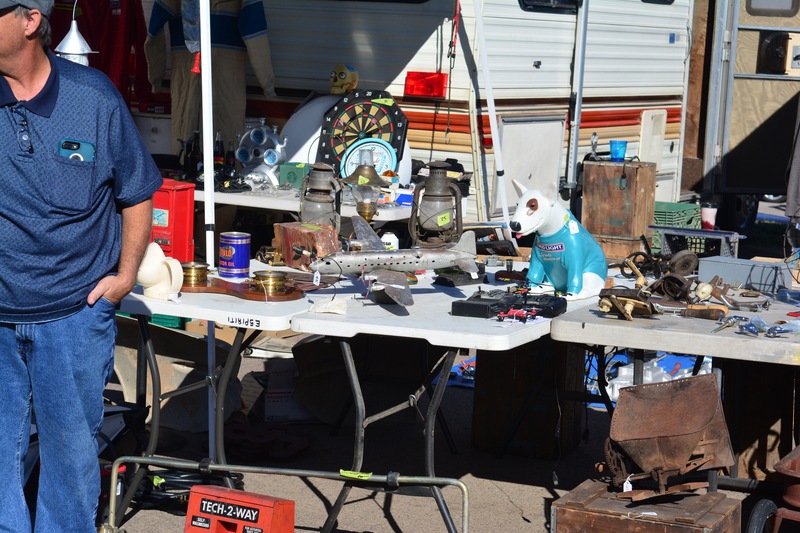 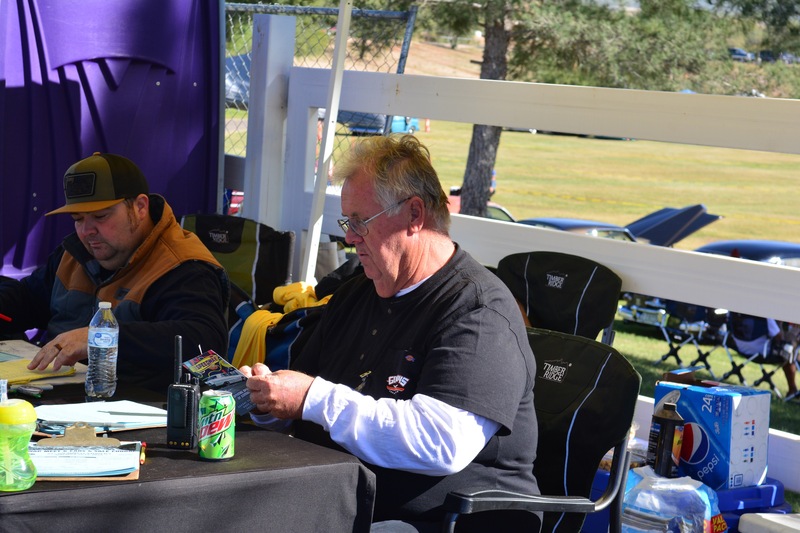 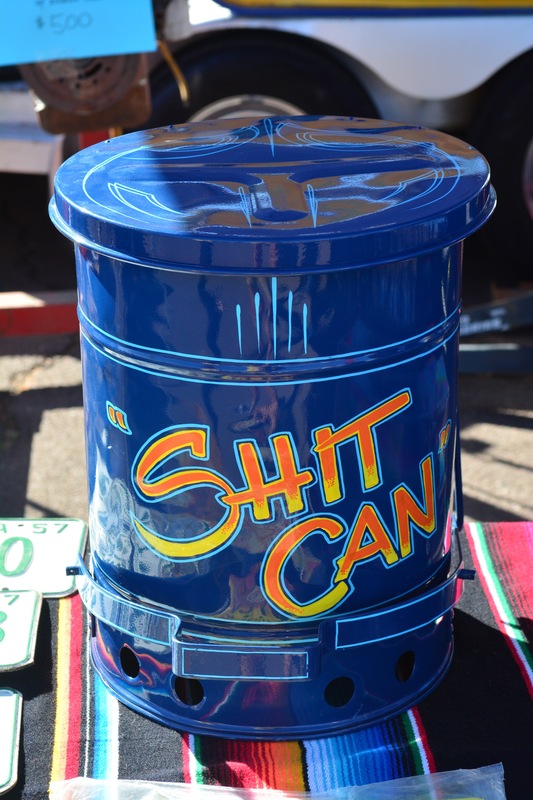 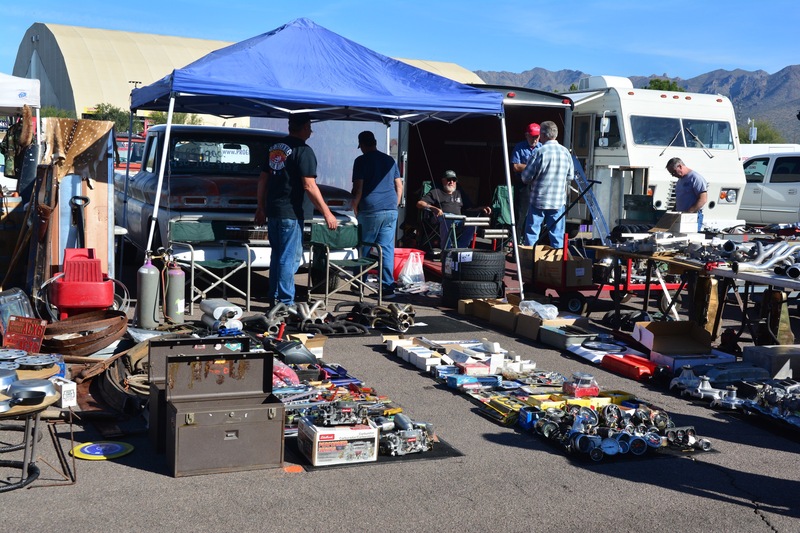 Paul, Bob and Greg had spaces in the Swap Meet and all three did quite well selling most all of what the had brought in. 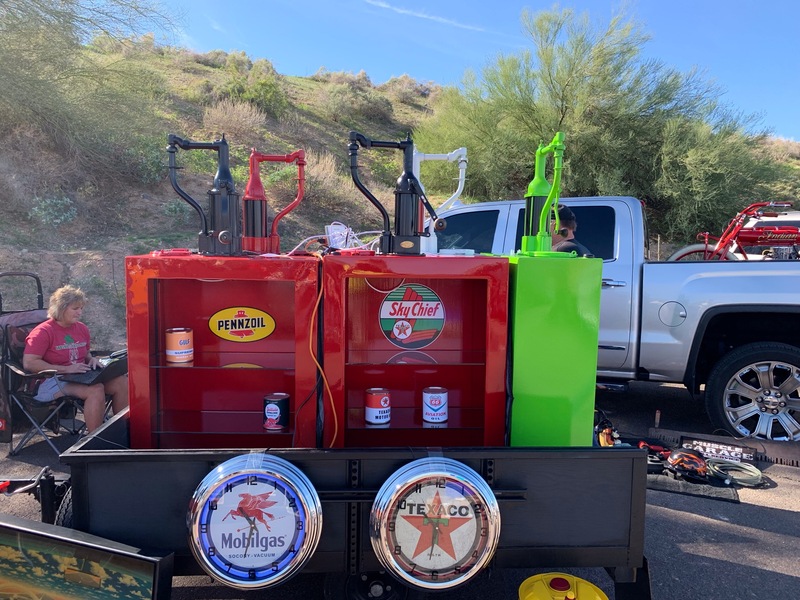 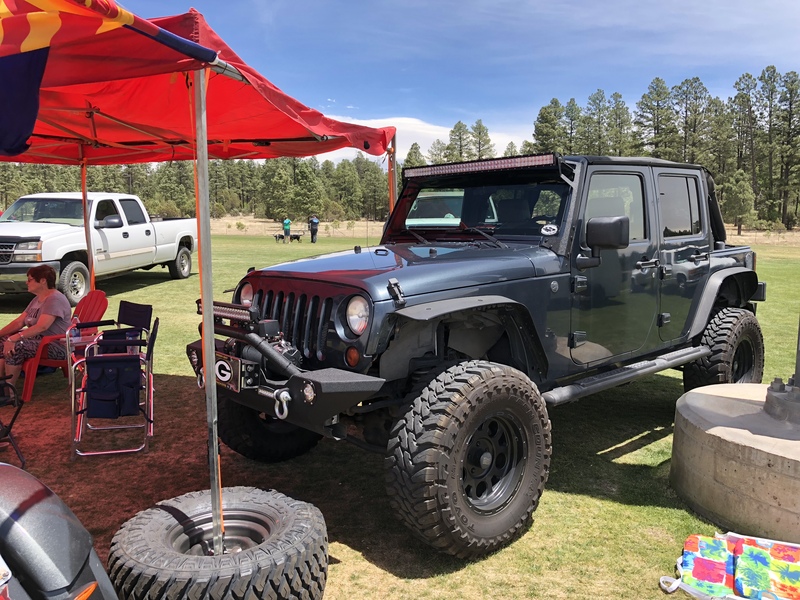 Dan Burdett brought coffee and donuts for Saturday morning, unfortunately the Scottsdale Police came by and told us that it was against the rules to bring in any kind of potluck, BBQ, cans or bottles. 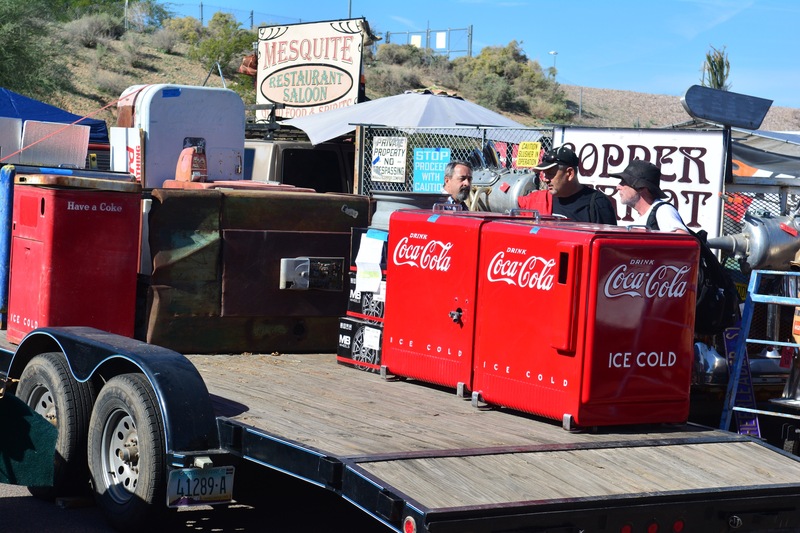 All food and drink was to be purchased at one of the food vendors. 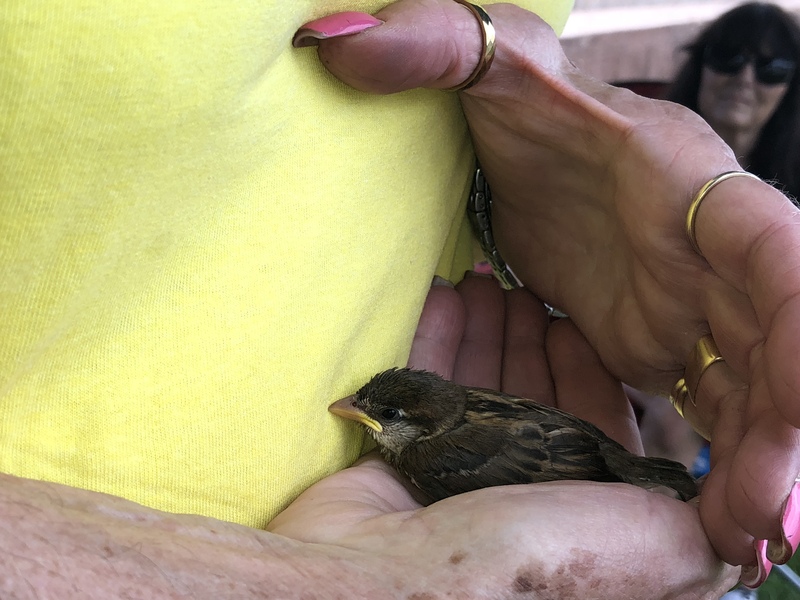 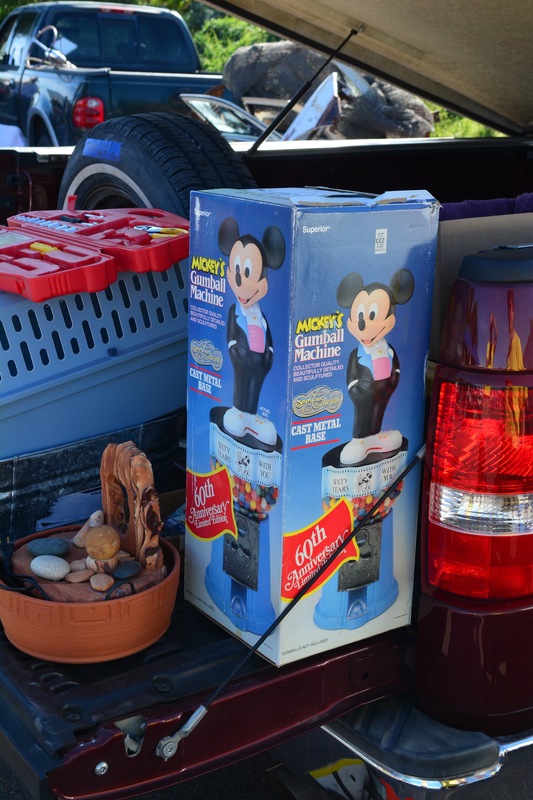 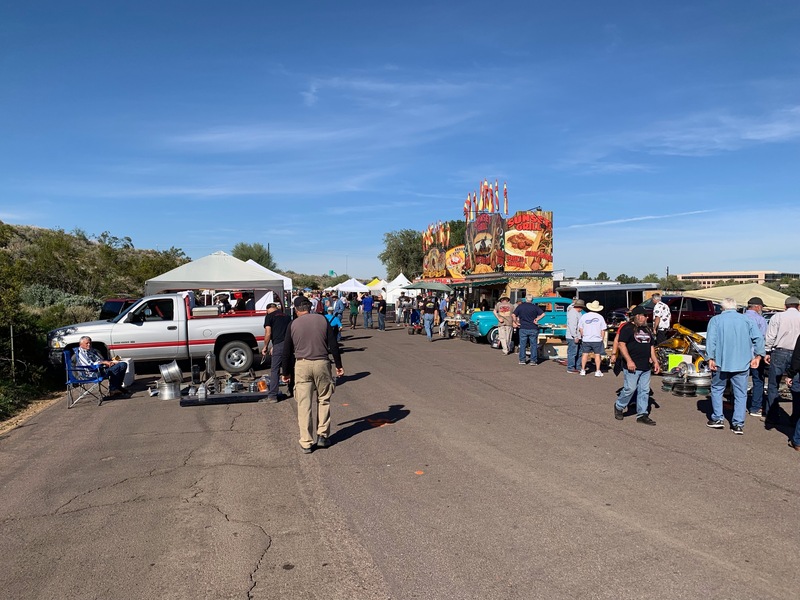 Everyone had brought in food for the pot luck lunch which we had surreptitiously so as not to call the attention of the considerable number of Scottsdale Police Officers. 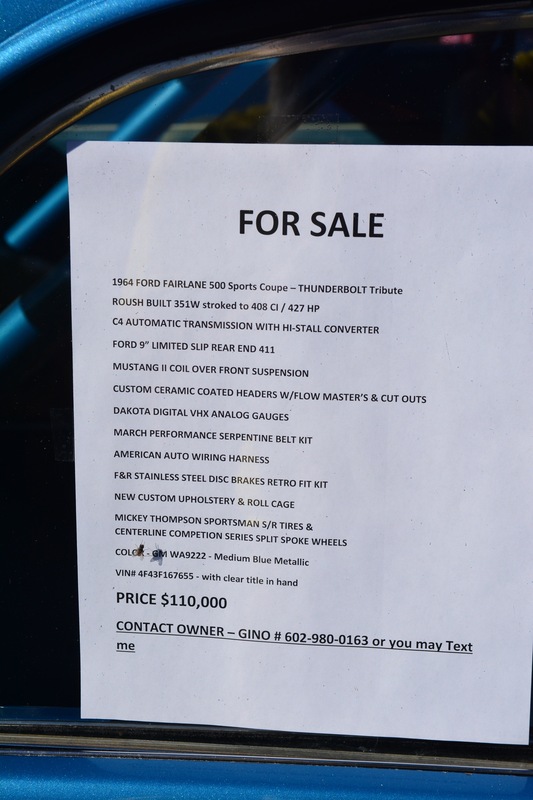 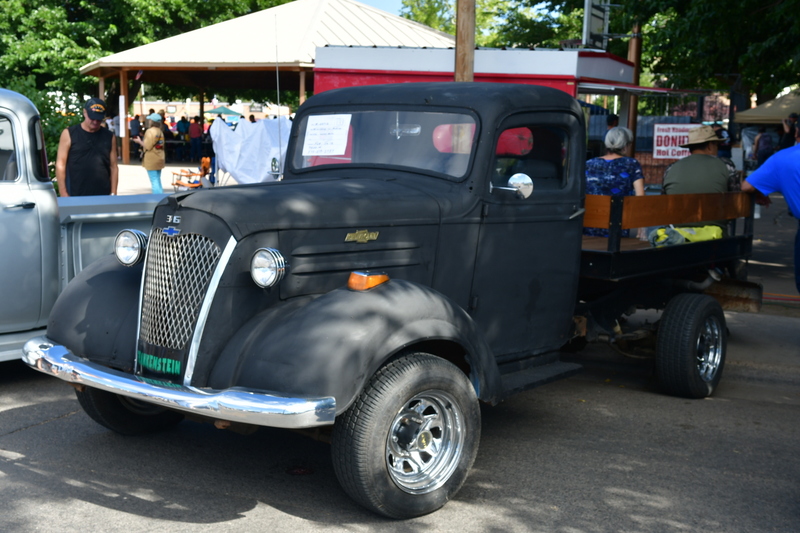 Sorry Steve Besore I did not see your Chevy Truck! 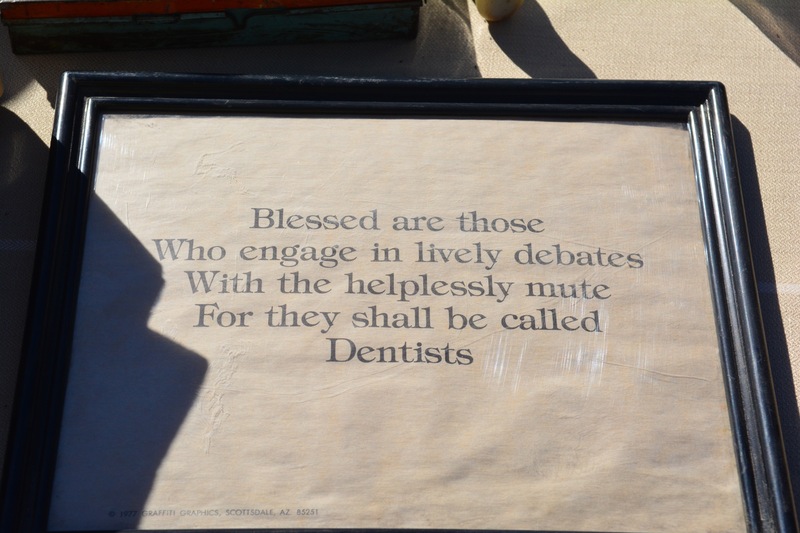 That about sums it for this time. 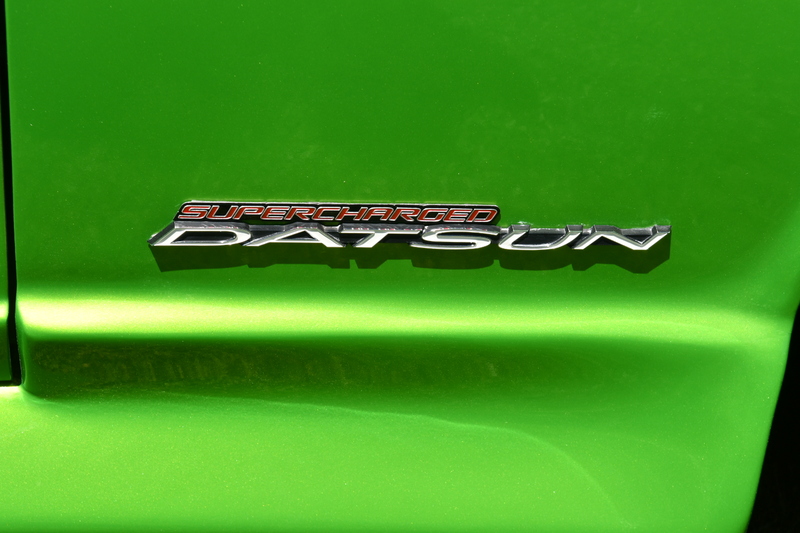 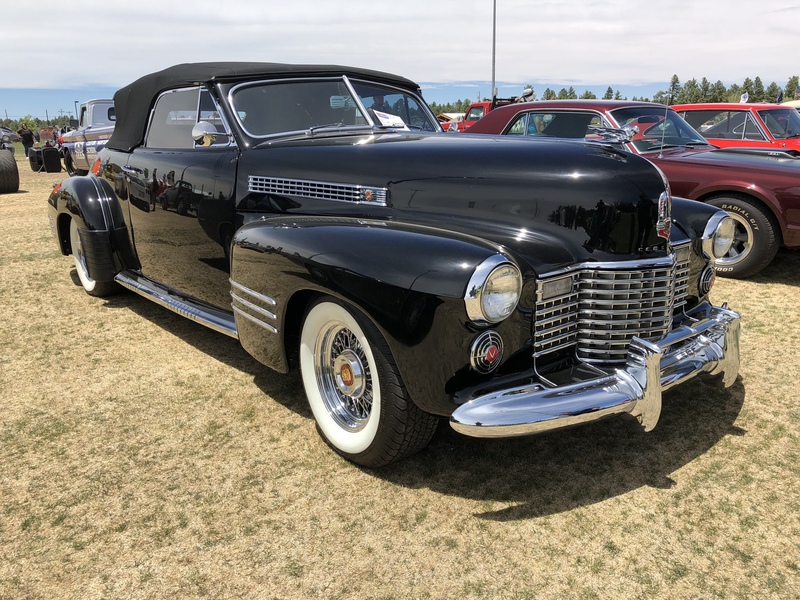 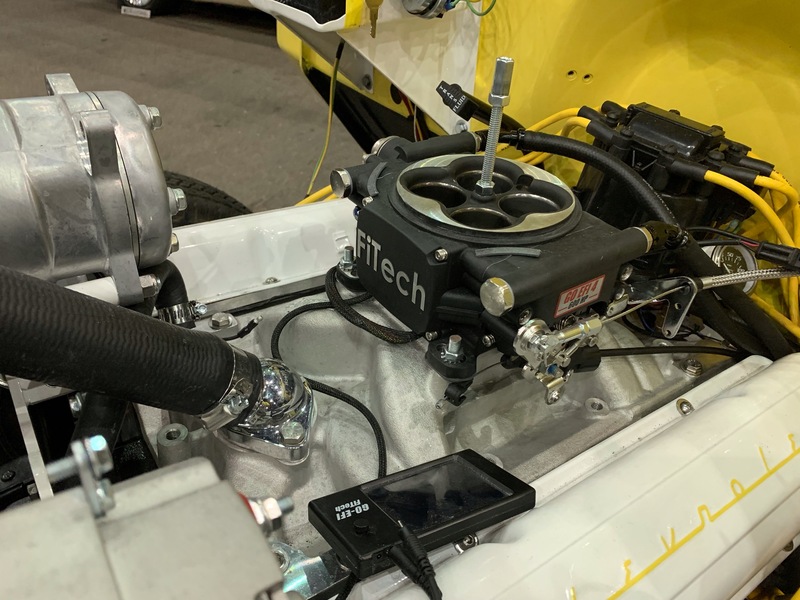 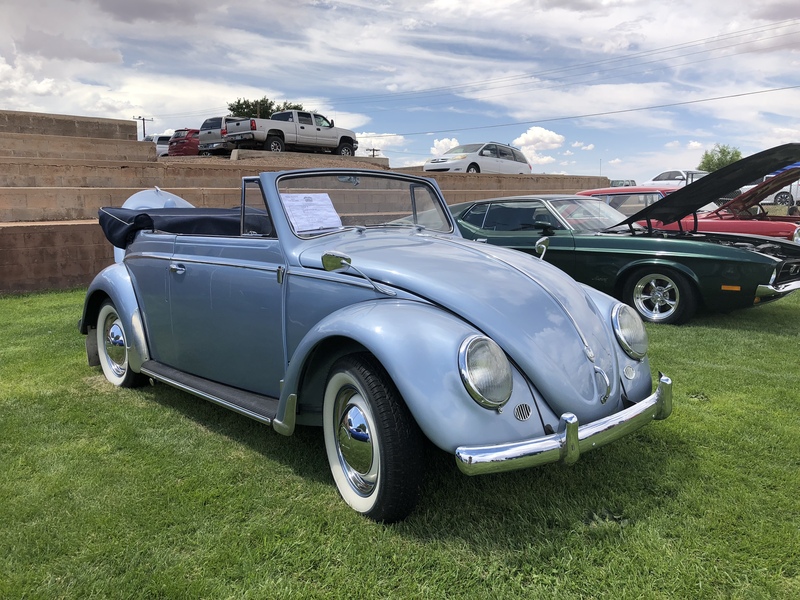 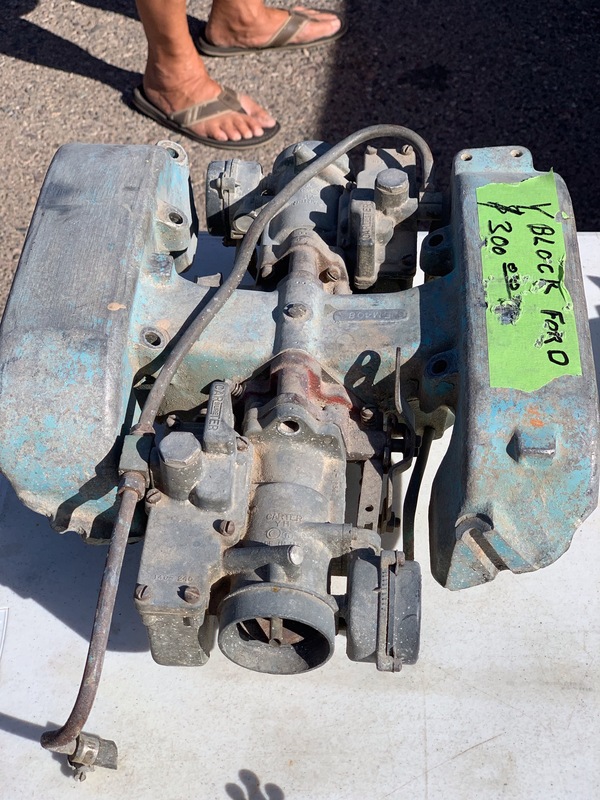 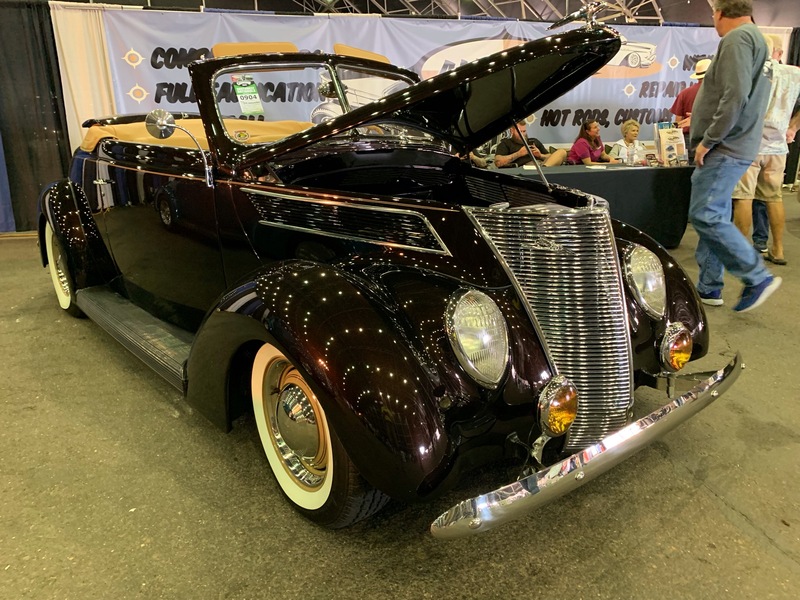 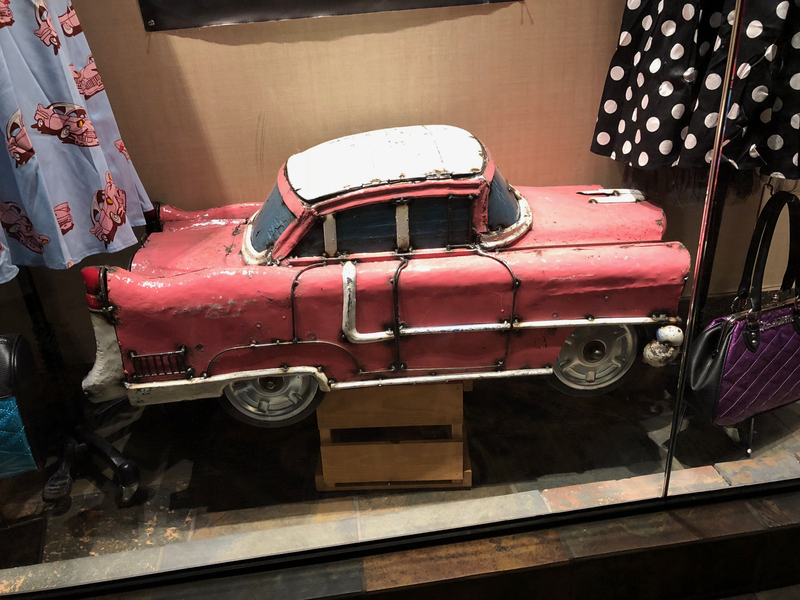 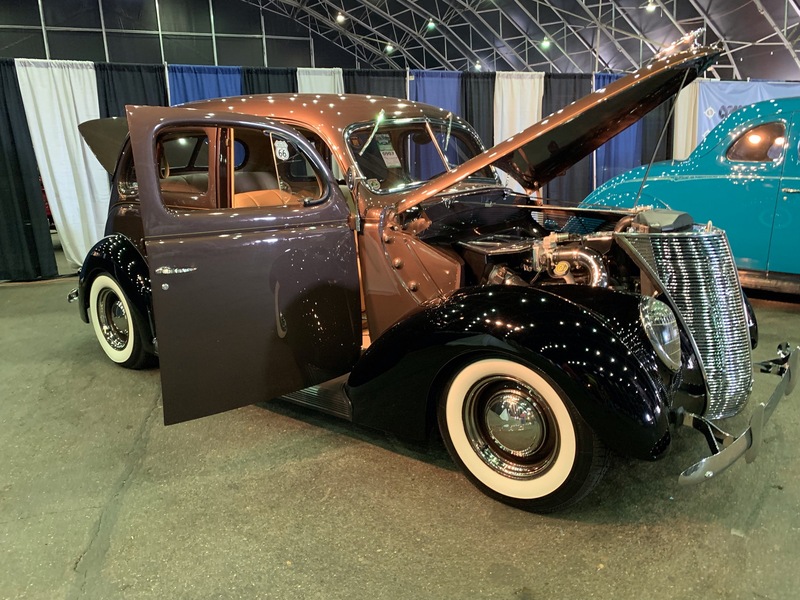 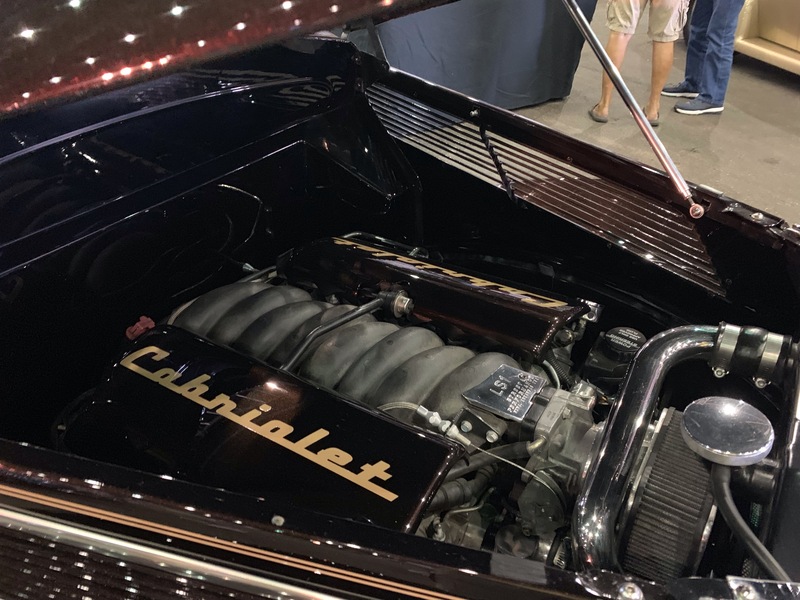 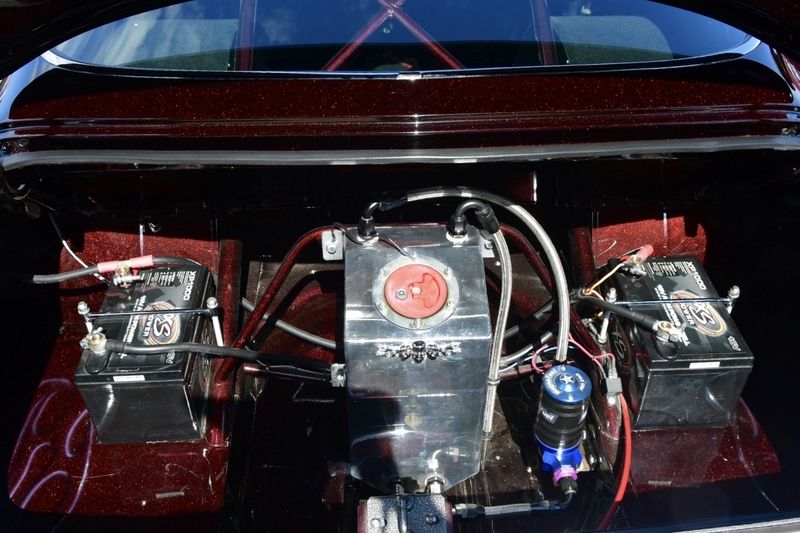 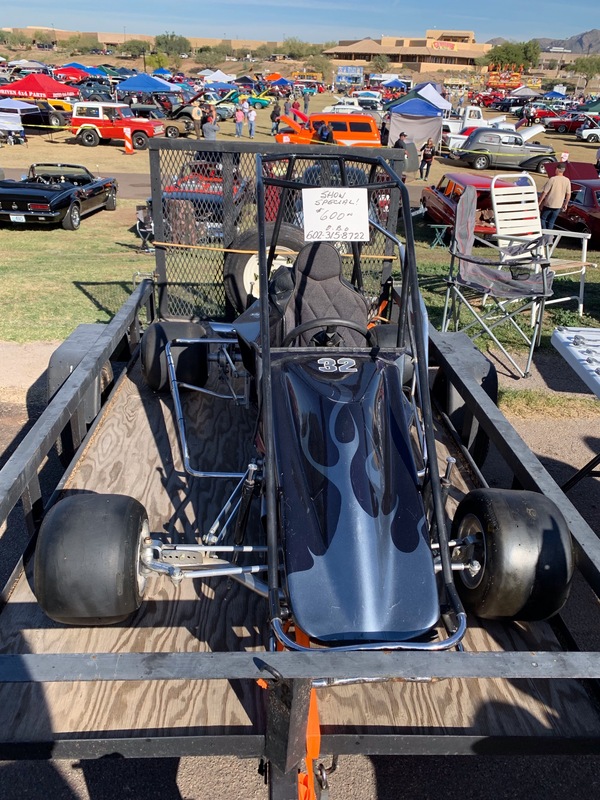 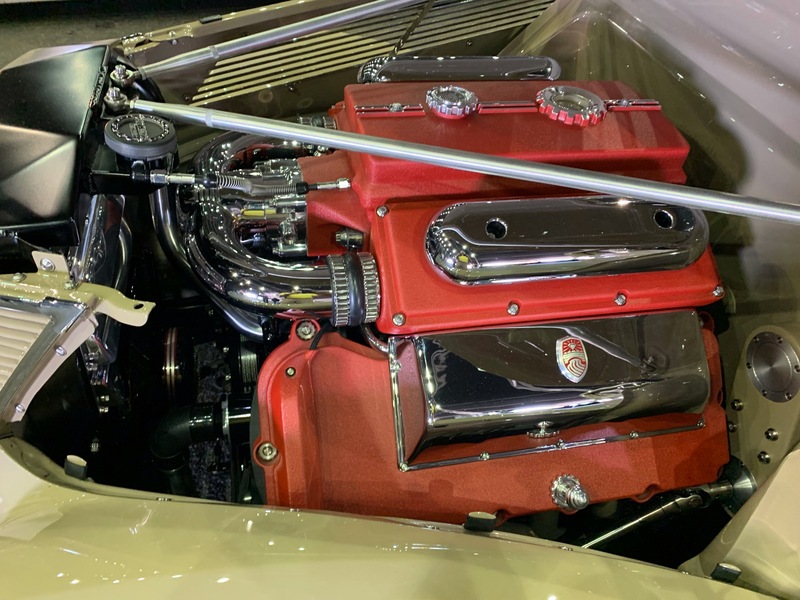 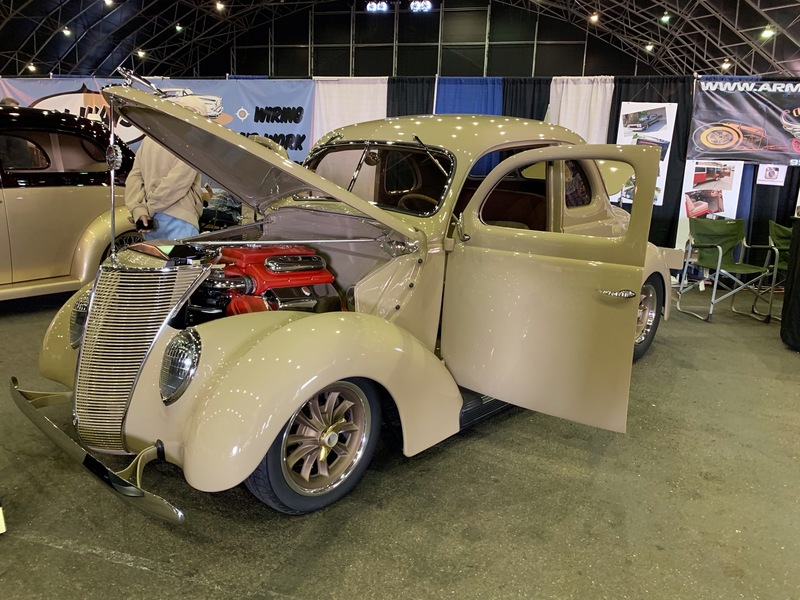 With all of the negative changes that have been made to this show I am beginning to question the value of these shows to the folks with prewar hotrods and customs. 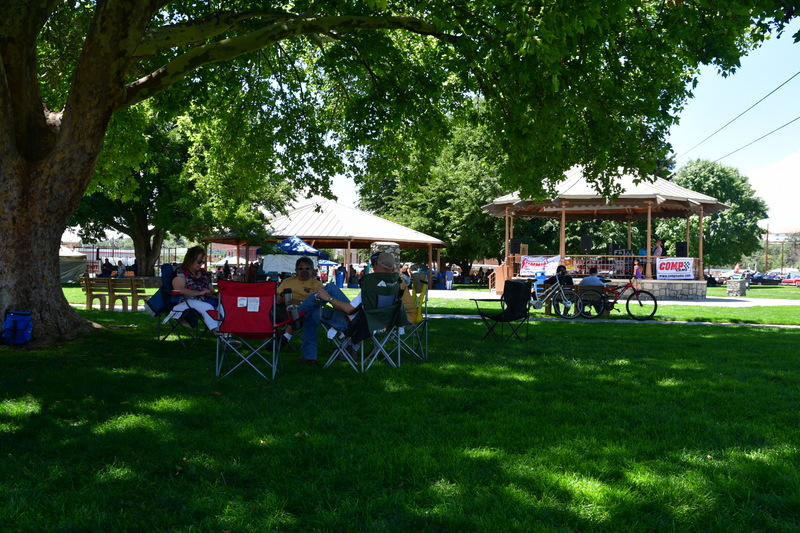 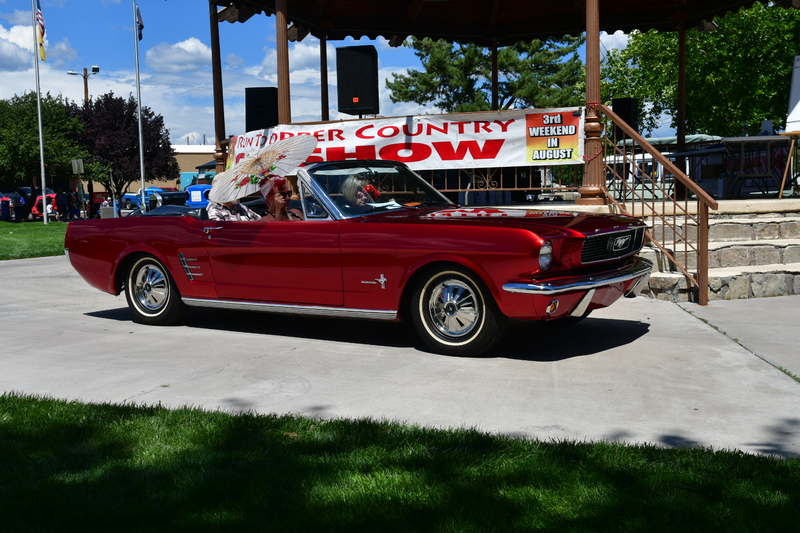 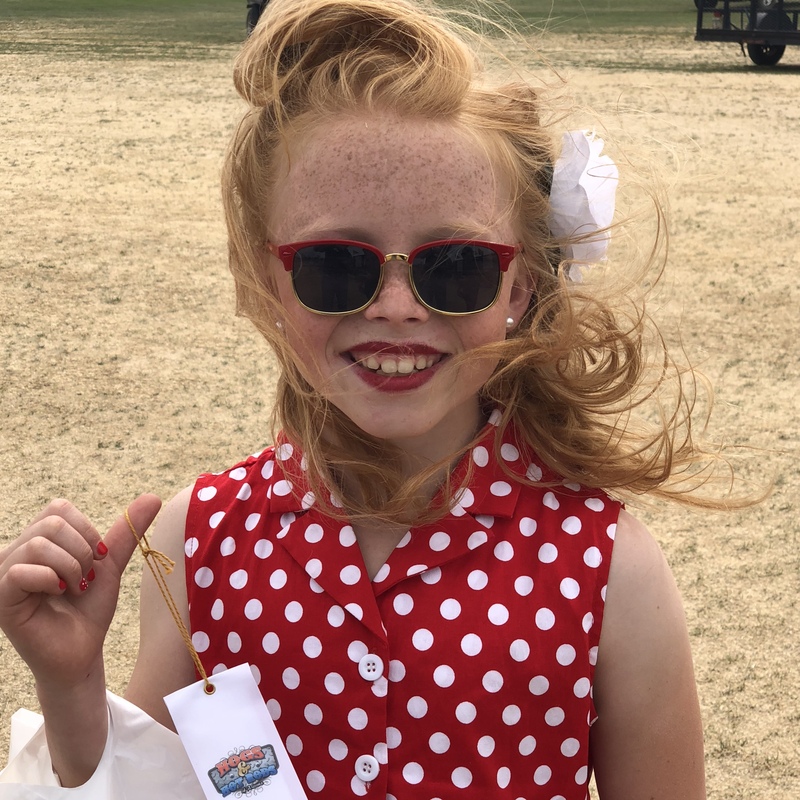 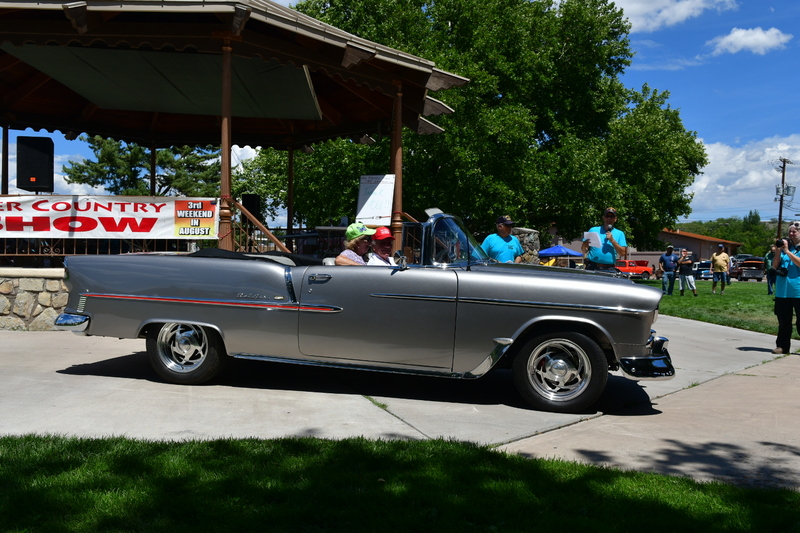 This year the show was moved from the golf course to Fredrickson Park in Taylor. 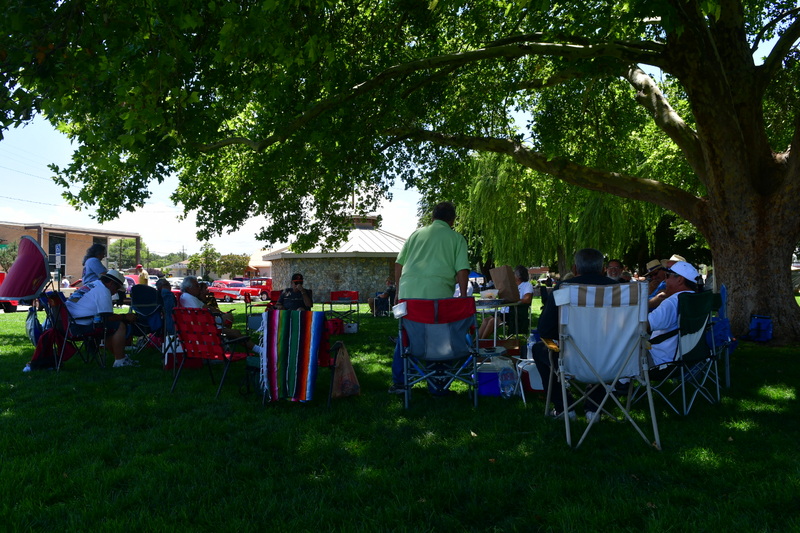 The park was a bit smaller for car parking, but offered a fair amount of shade. 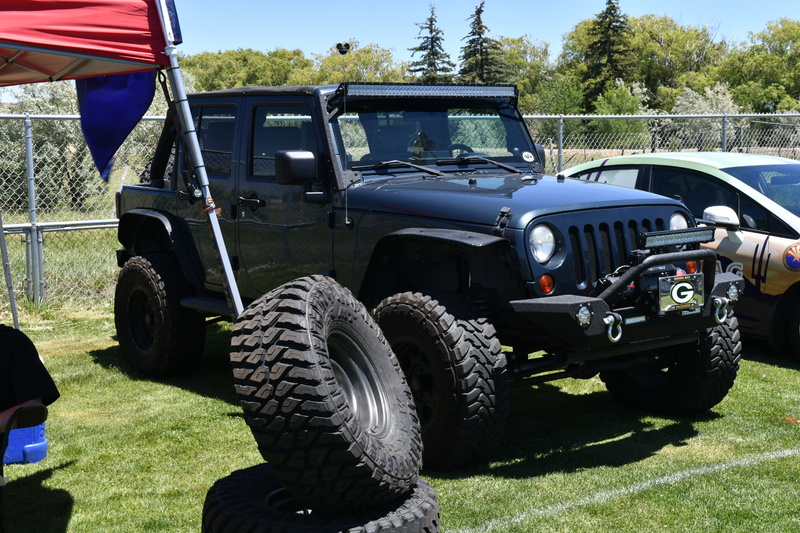 Also a plus was the playground and some activities for the kids, and this area has a lot of Kids! 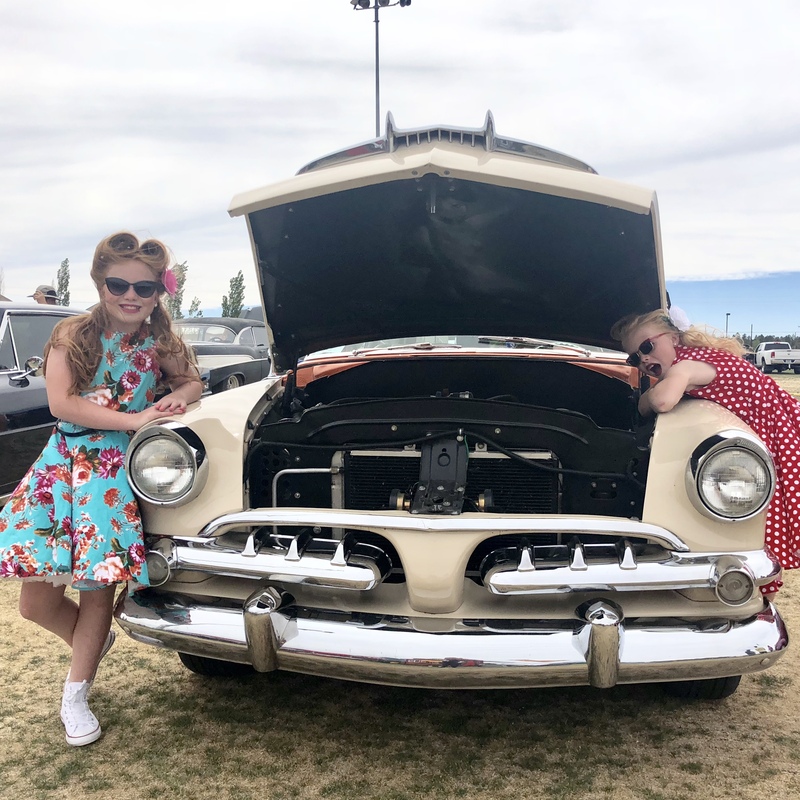 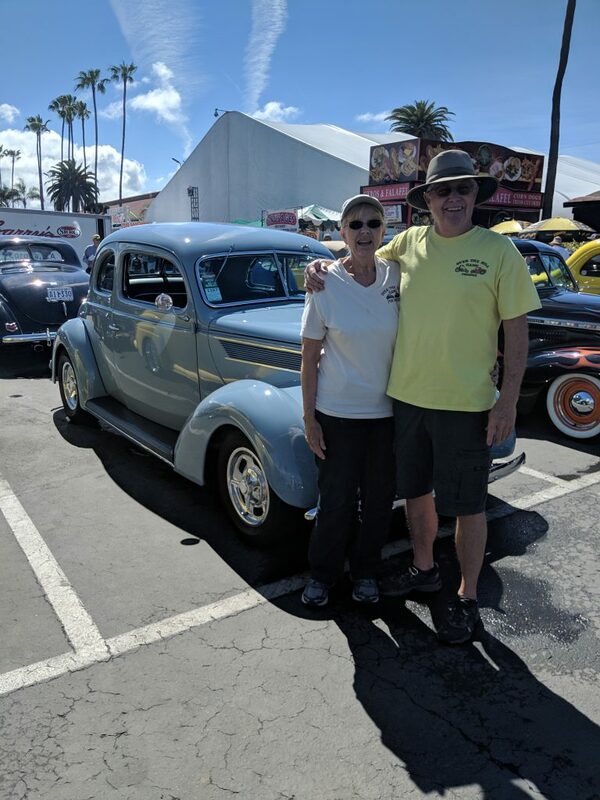 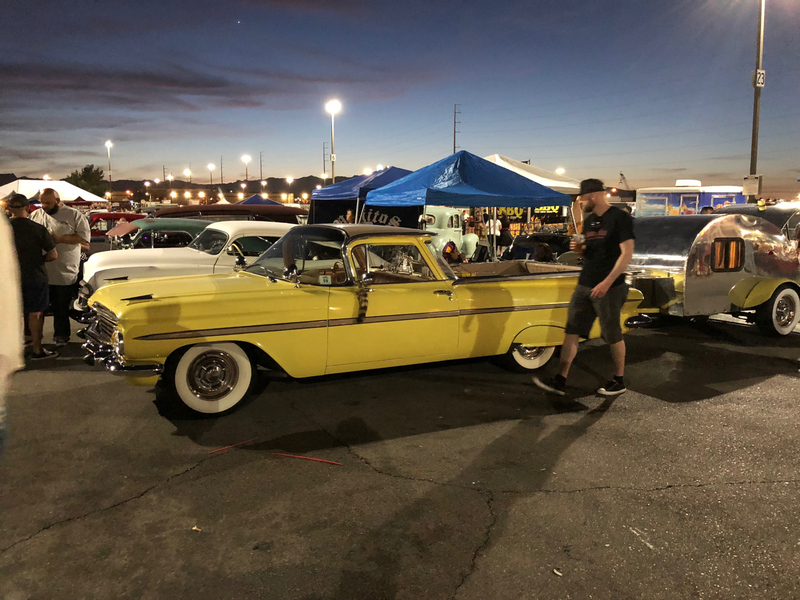 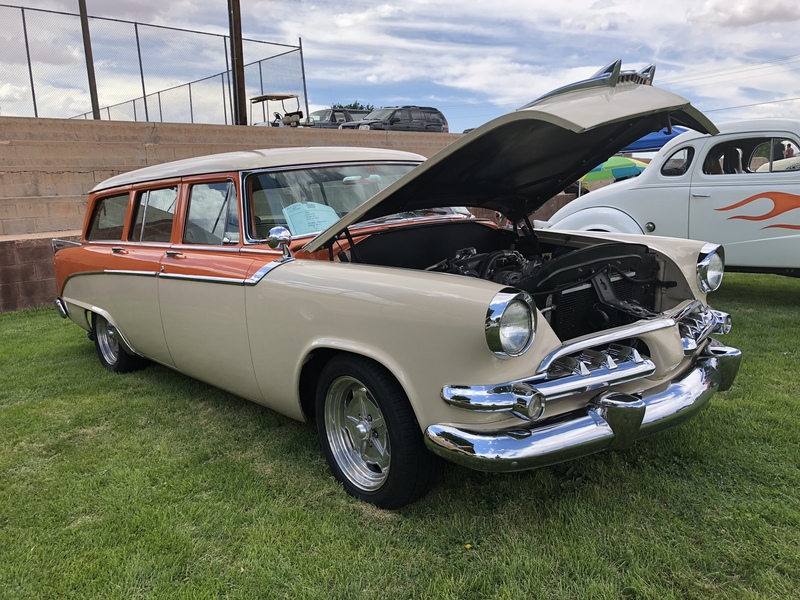 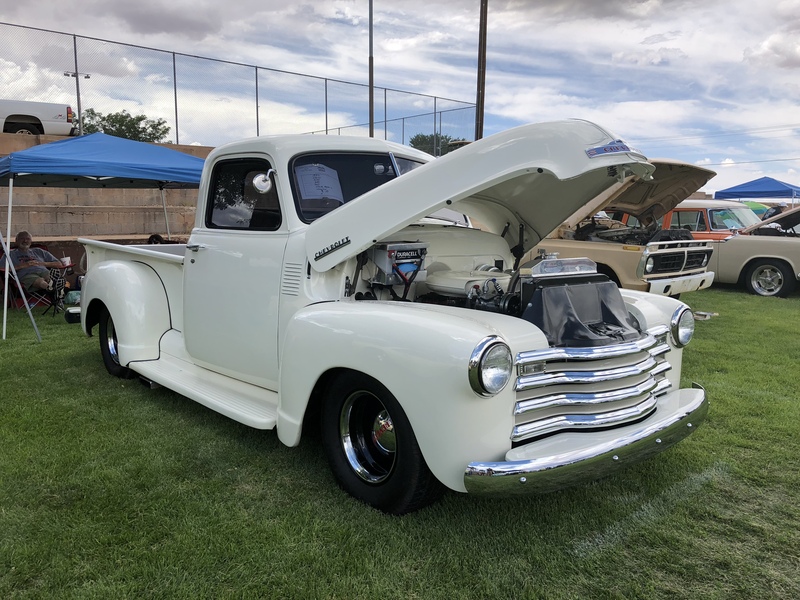 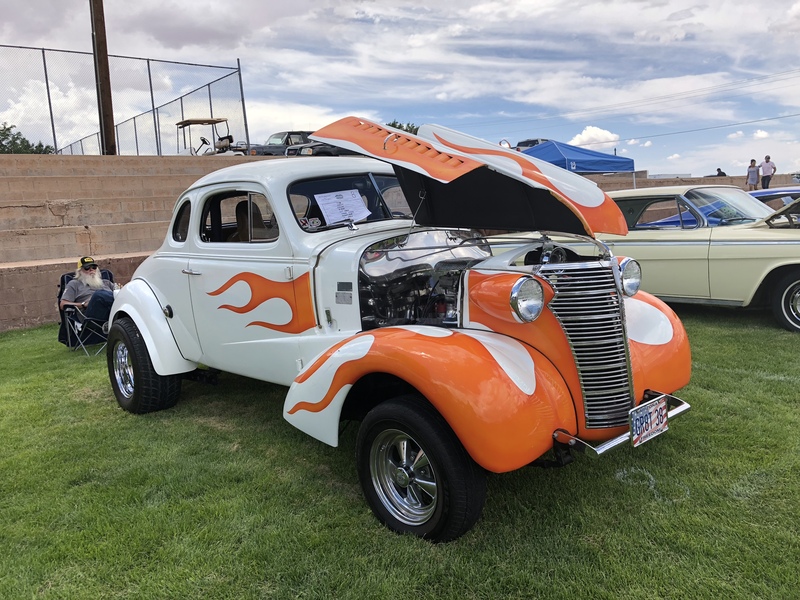 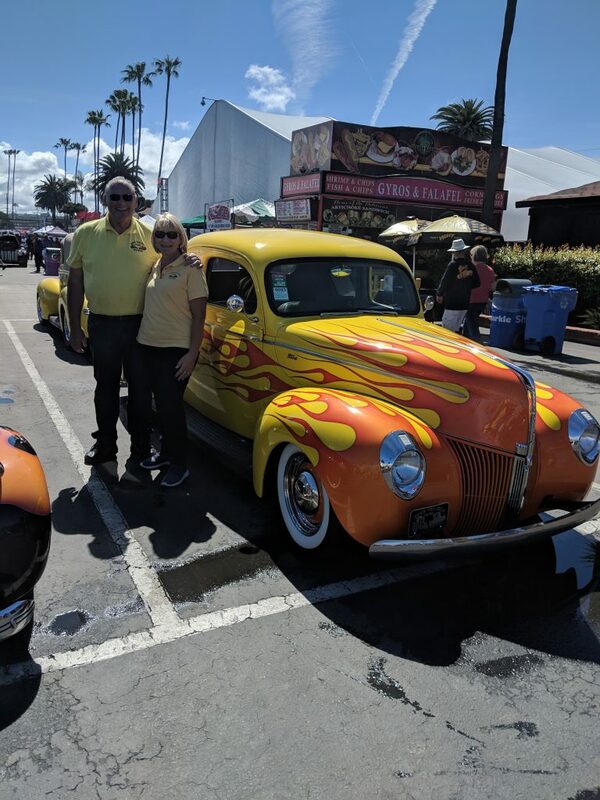 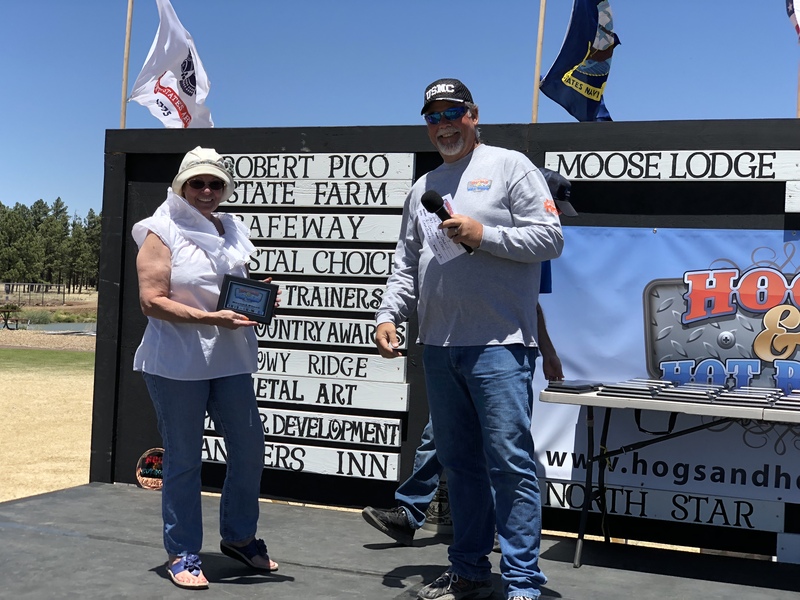 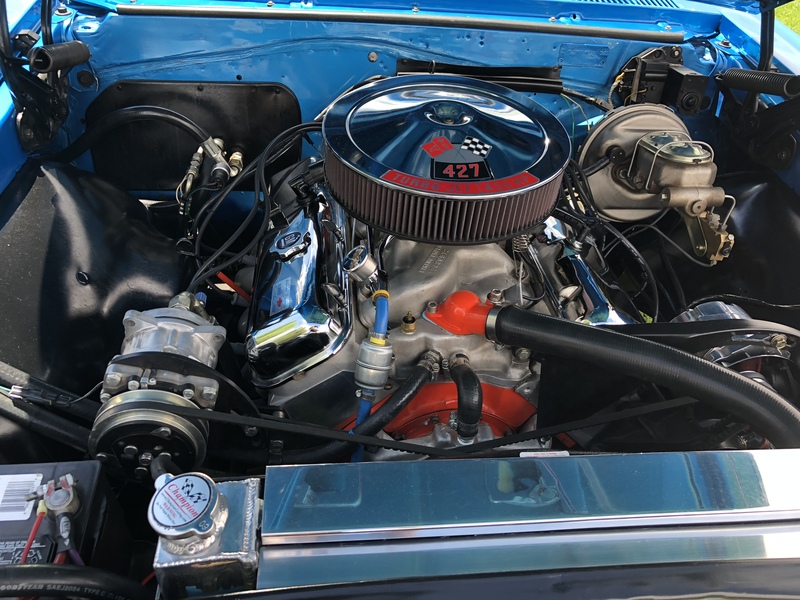 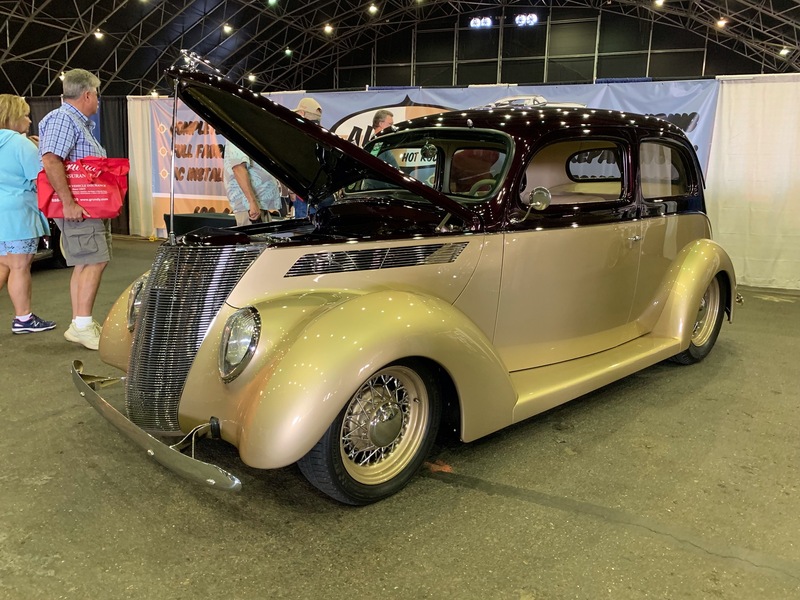 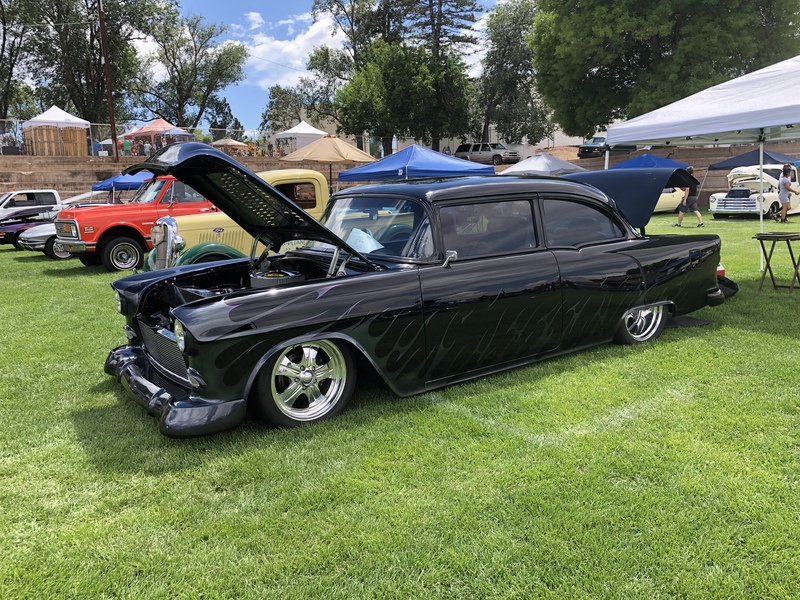 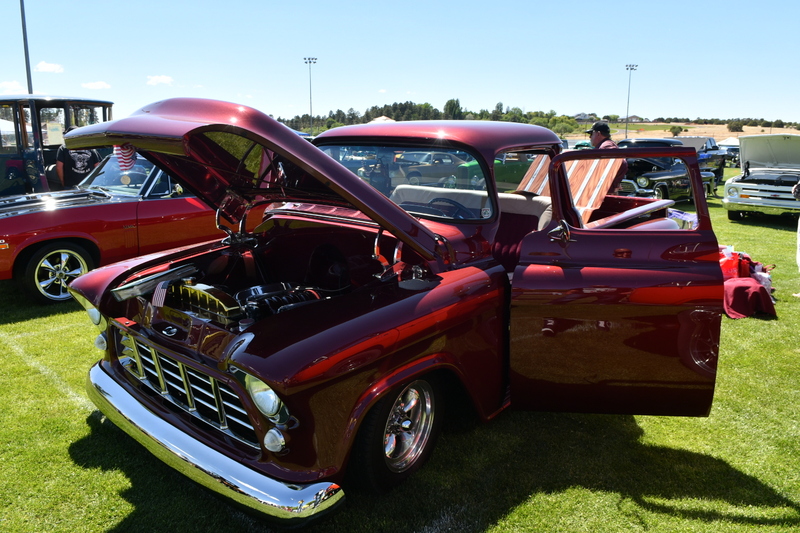 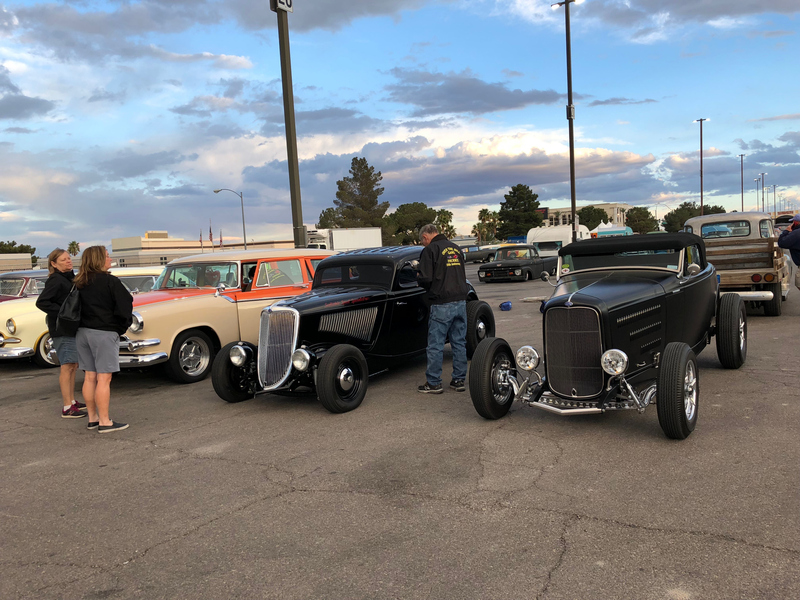 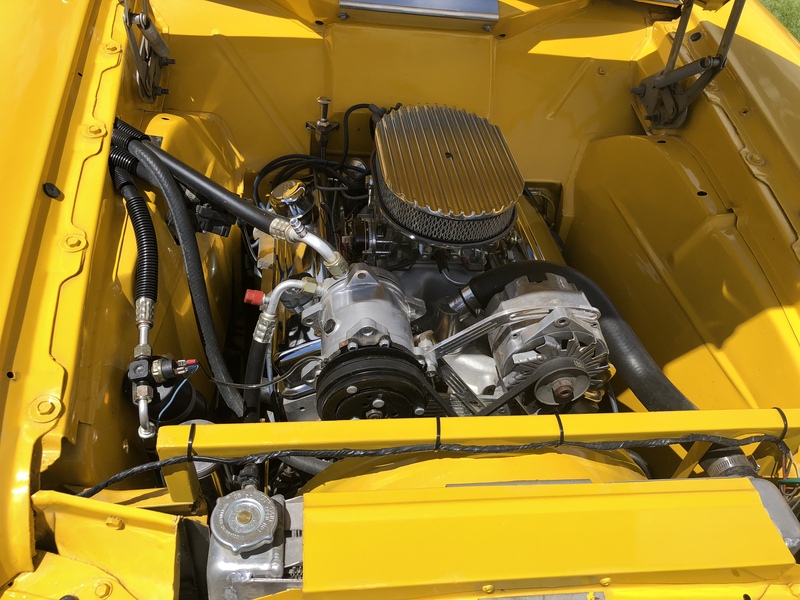 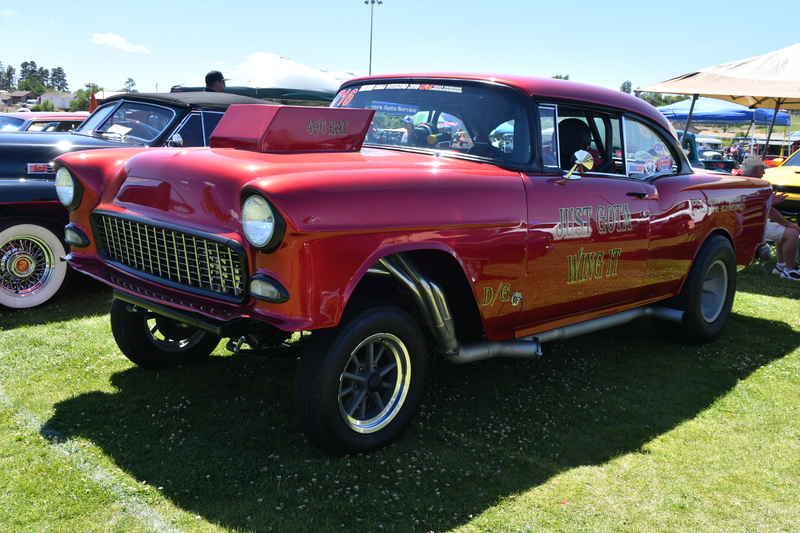 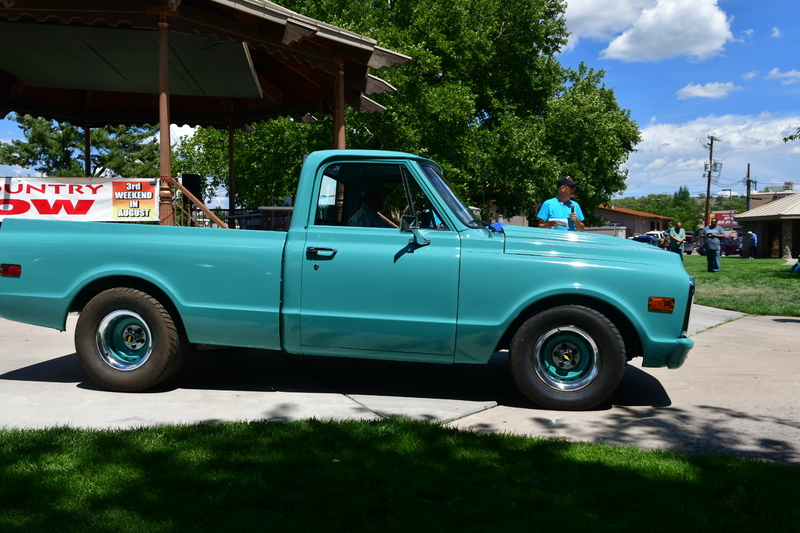 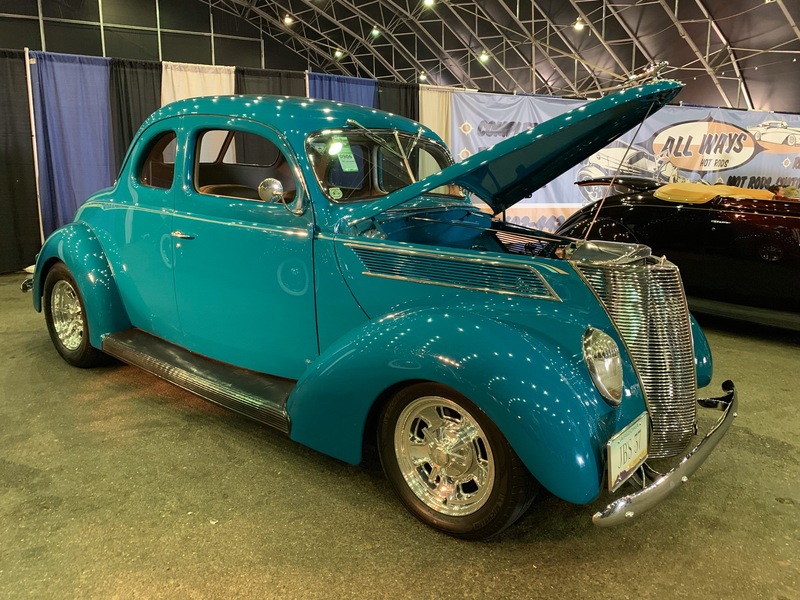 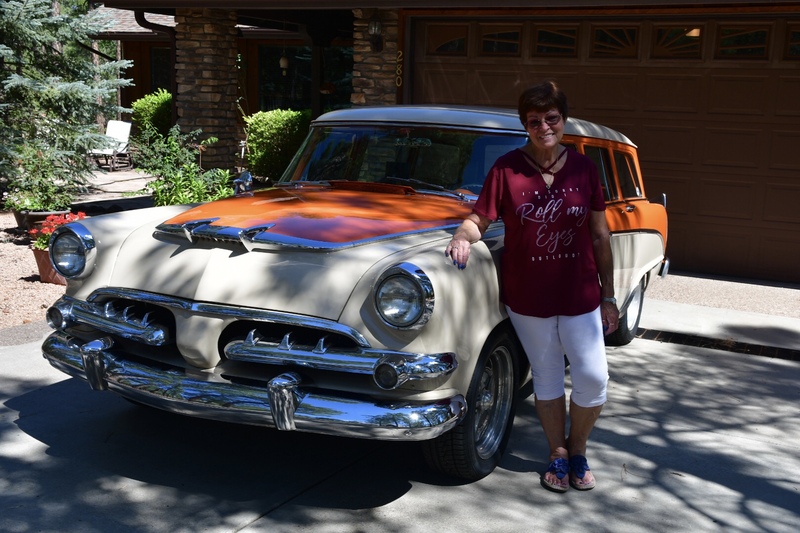 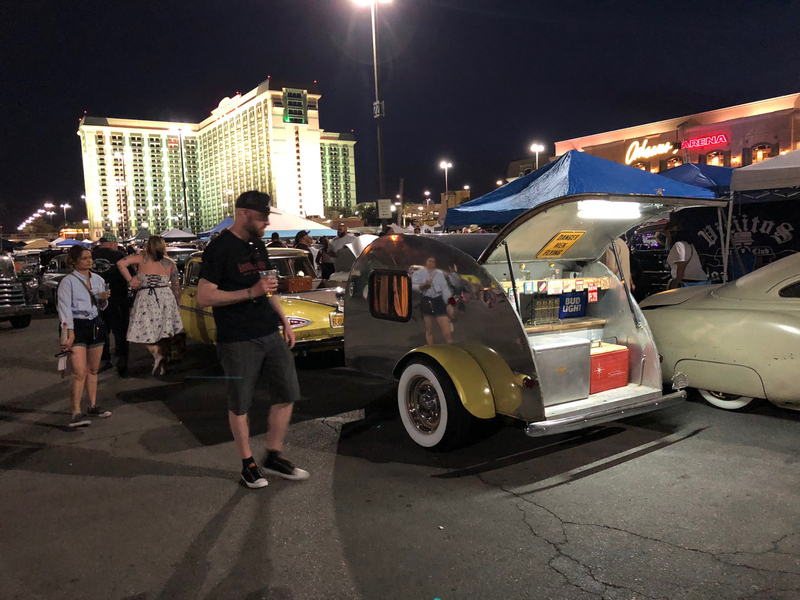 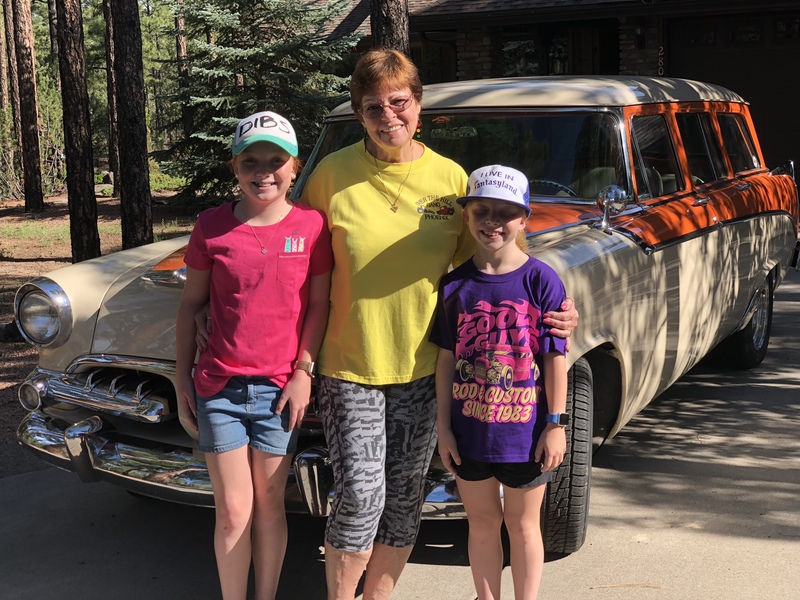 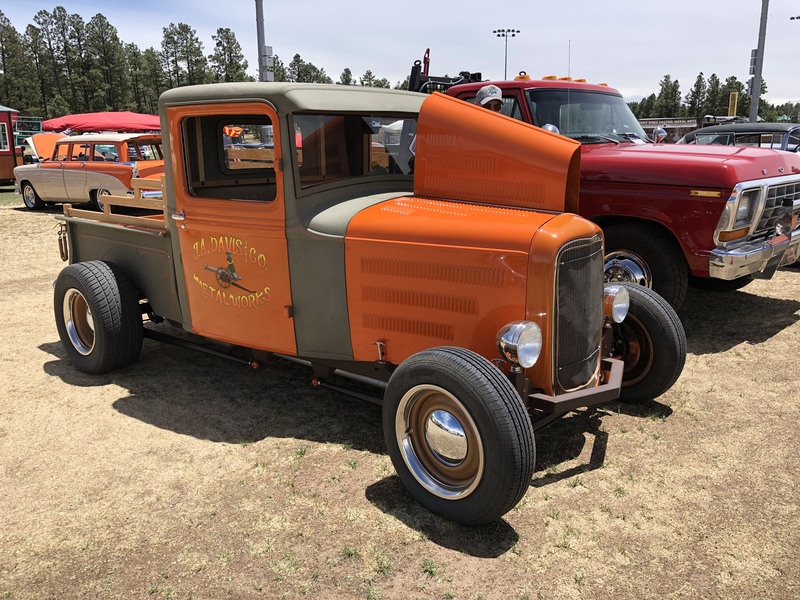 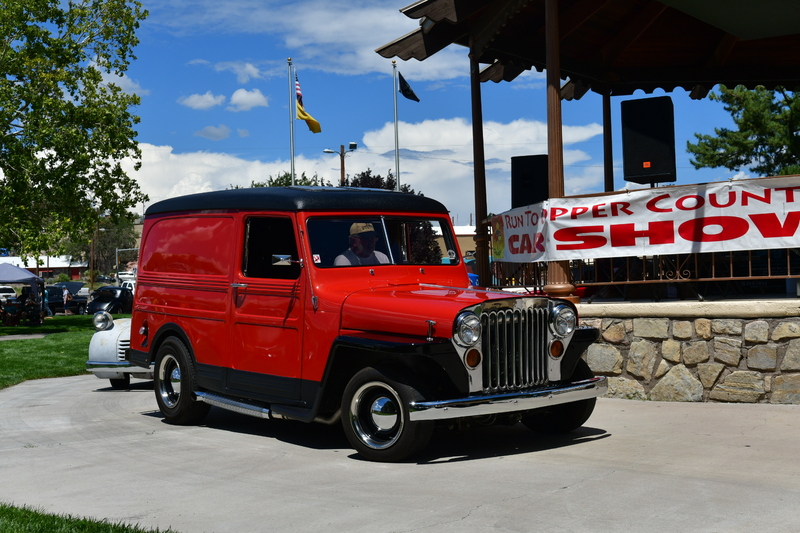 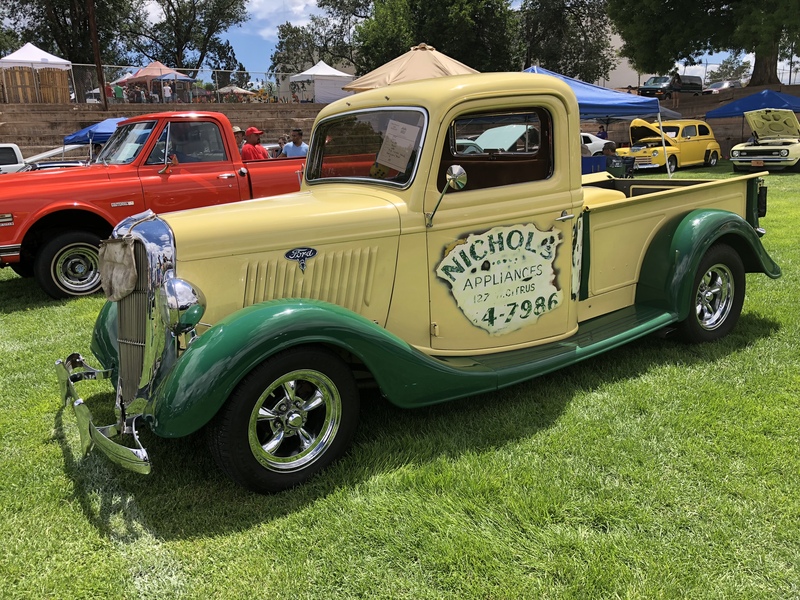 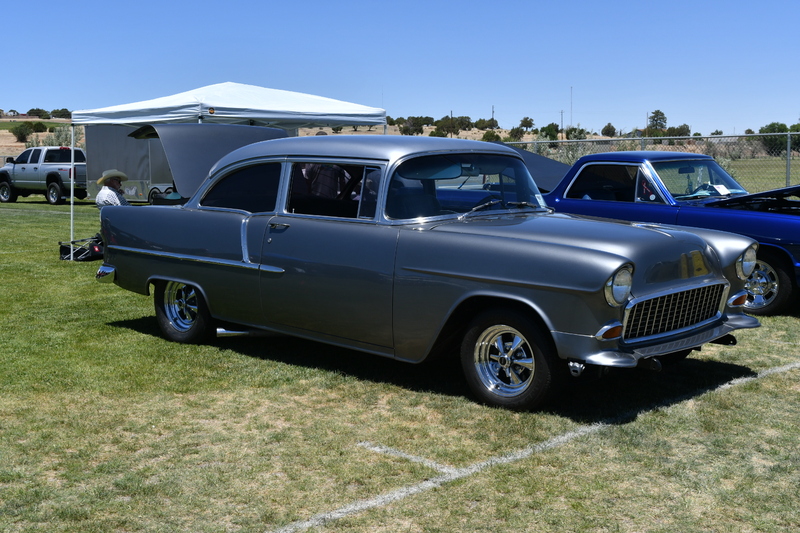 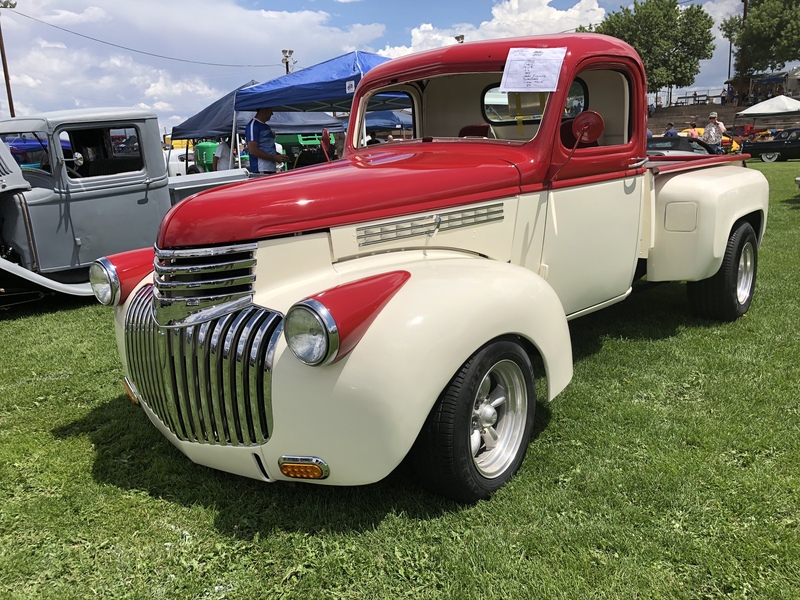 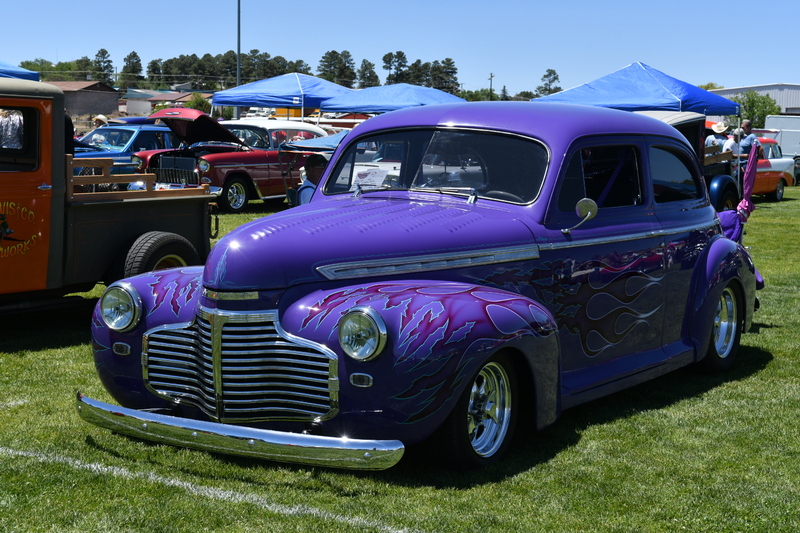 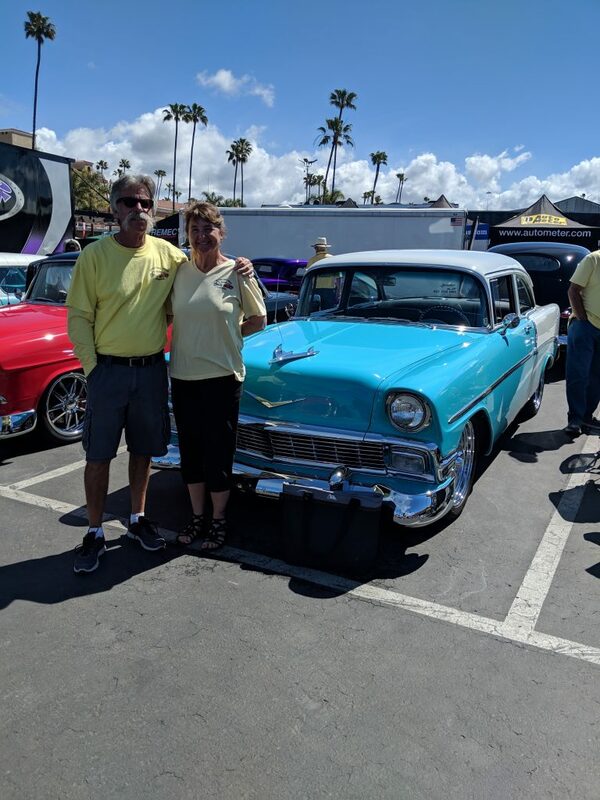 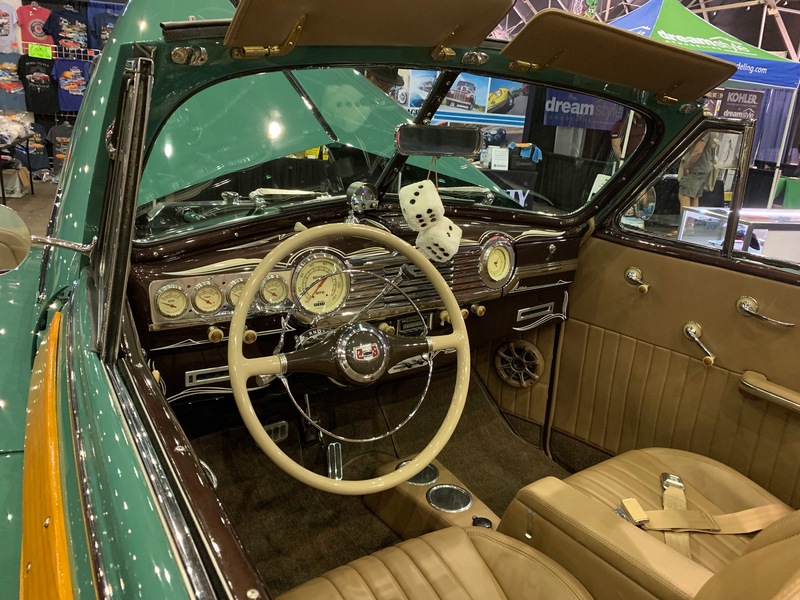 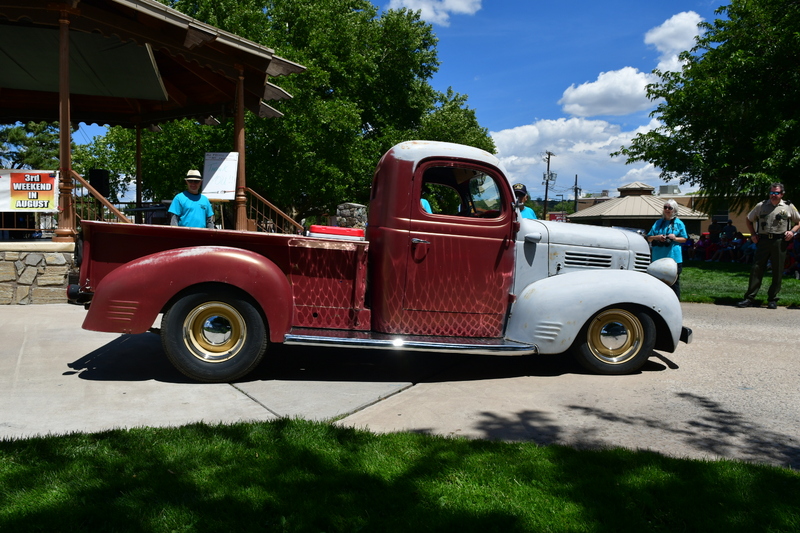 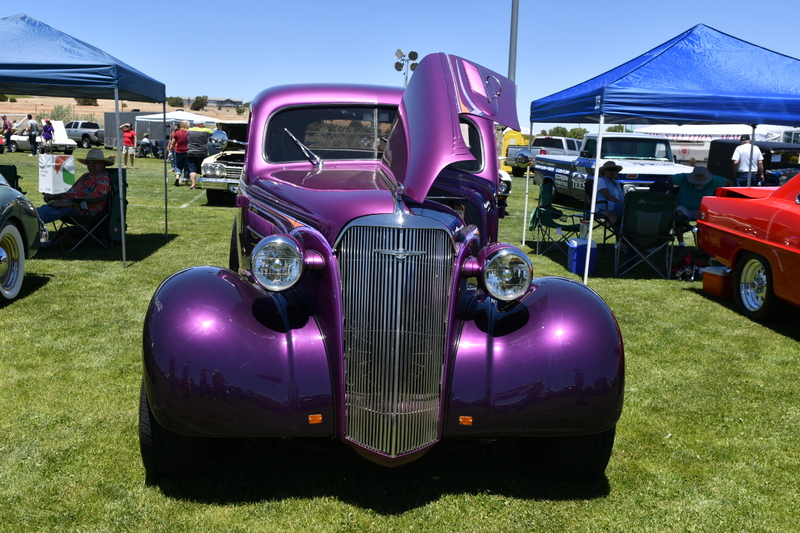 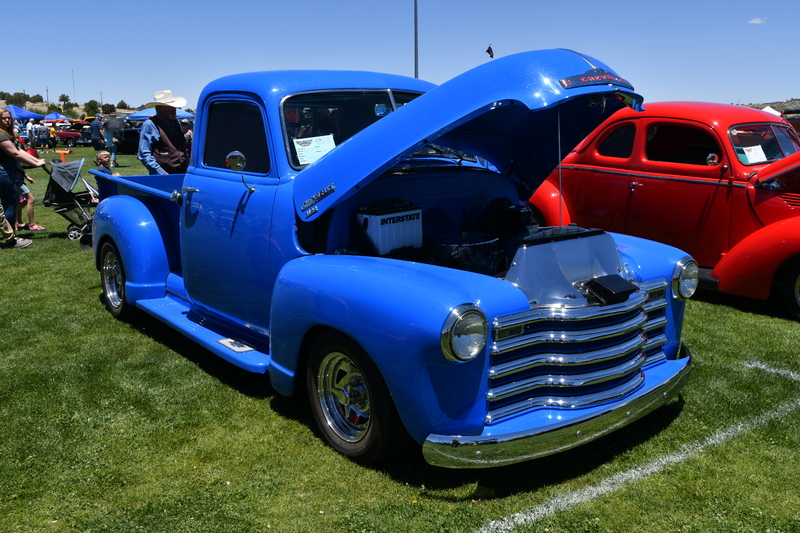 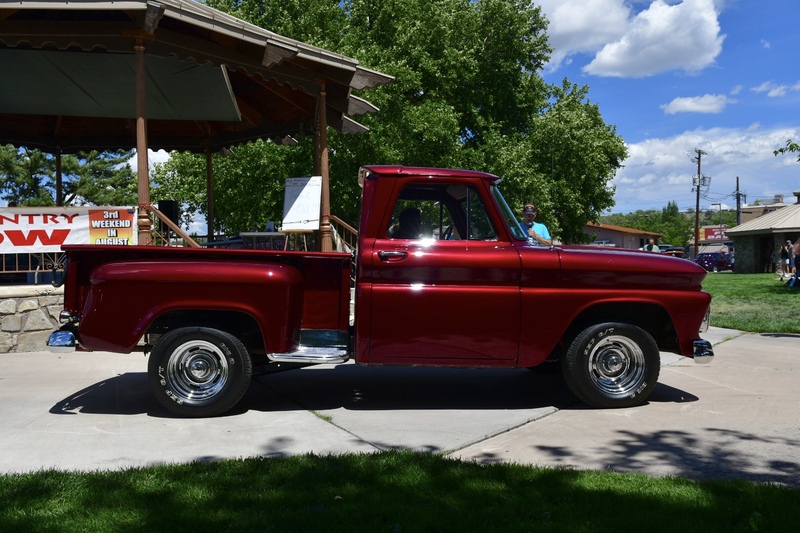 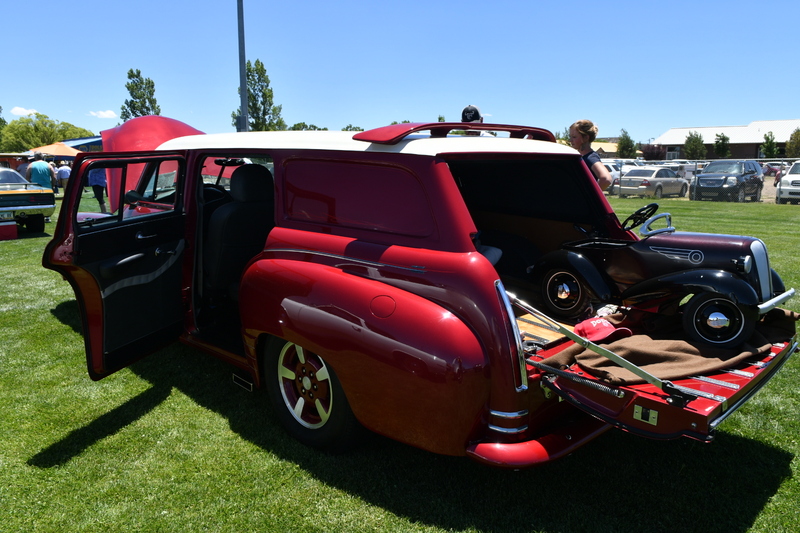 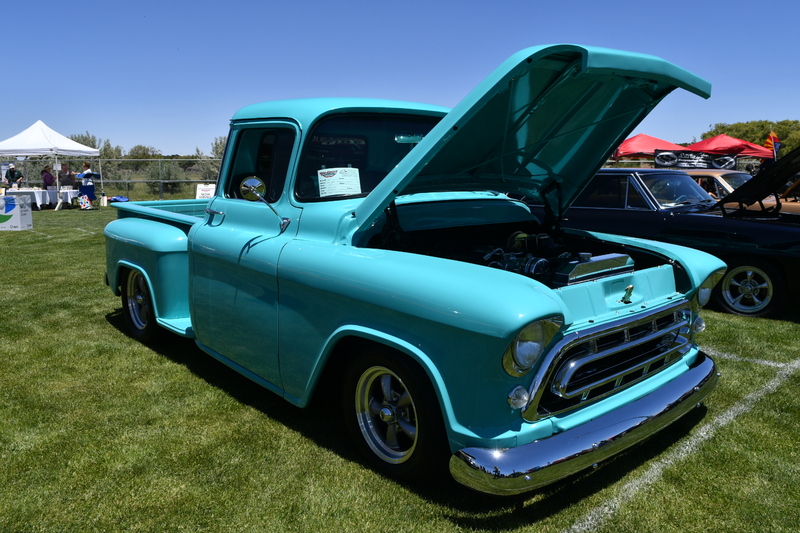 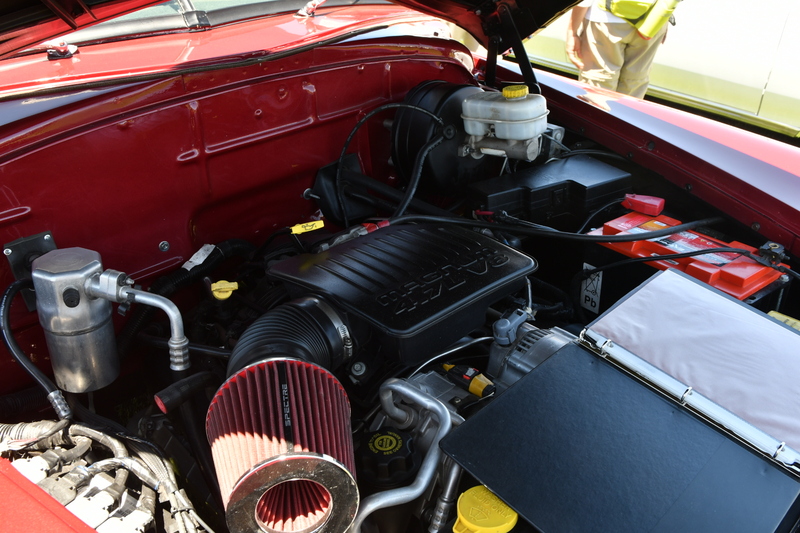 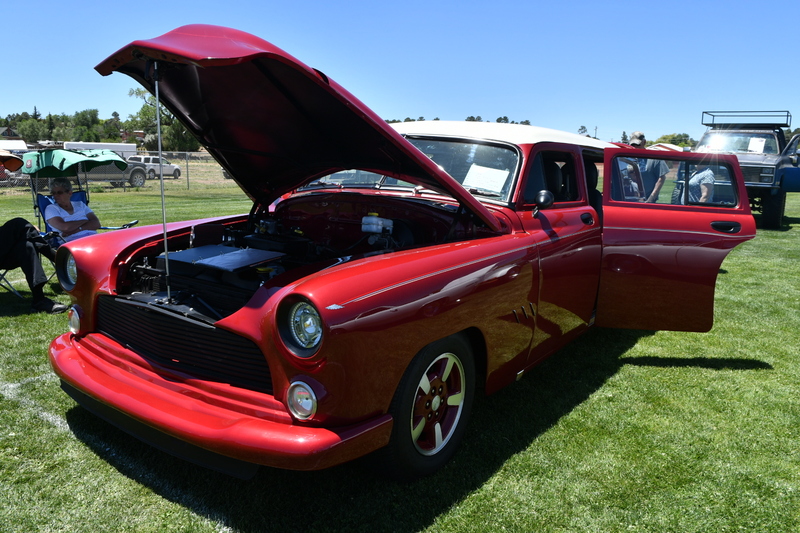 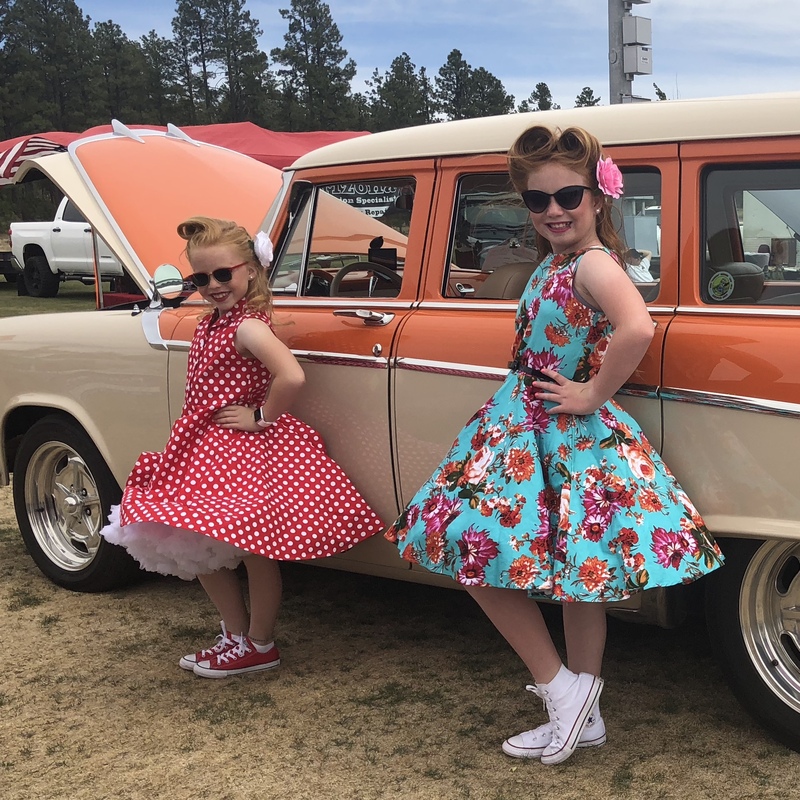 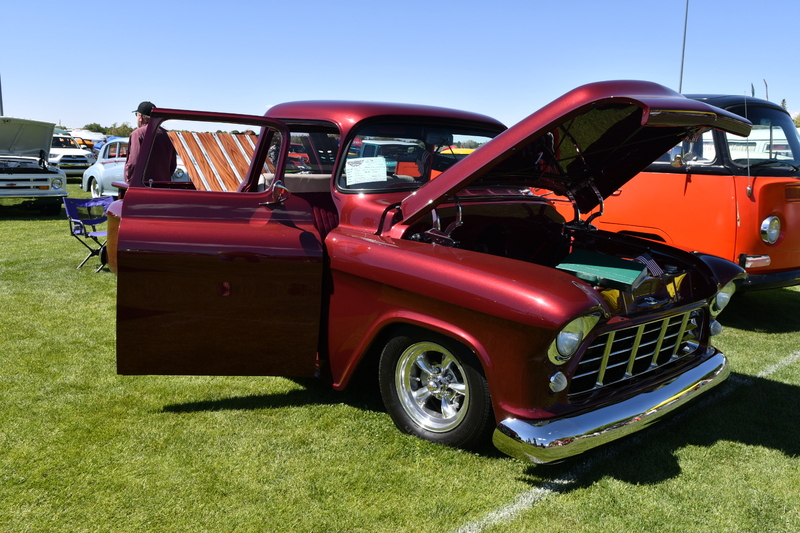 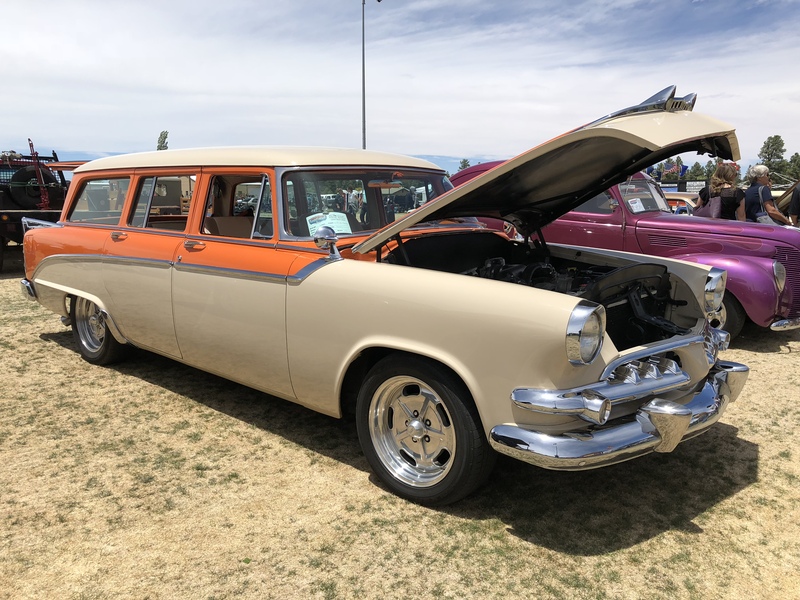 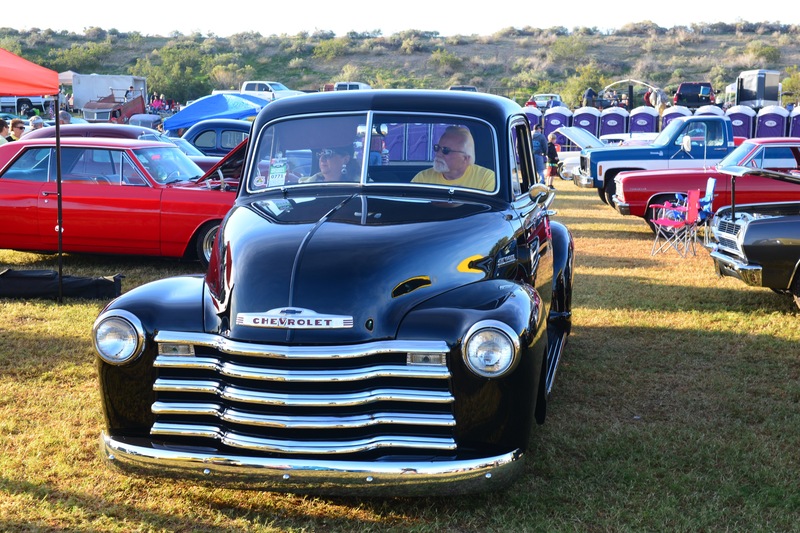 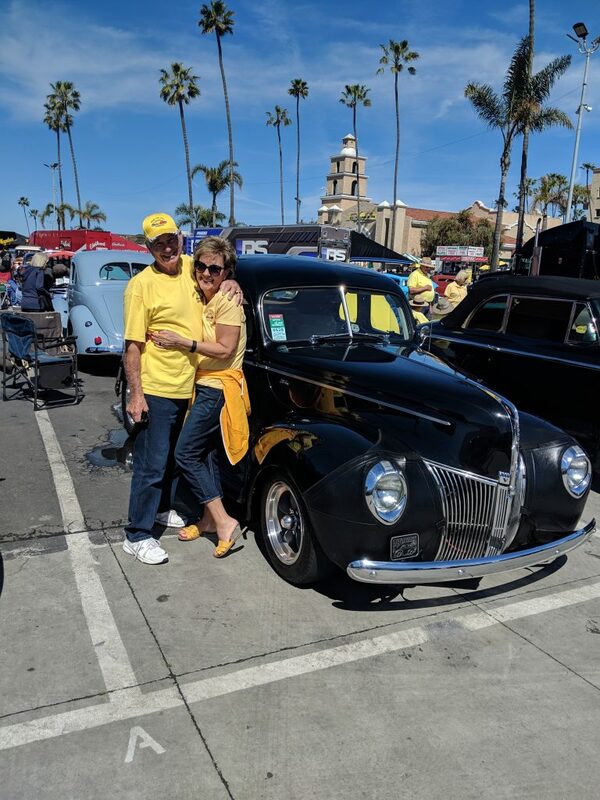 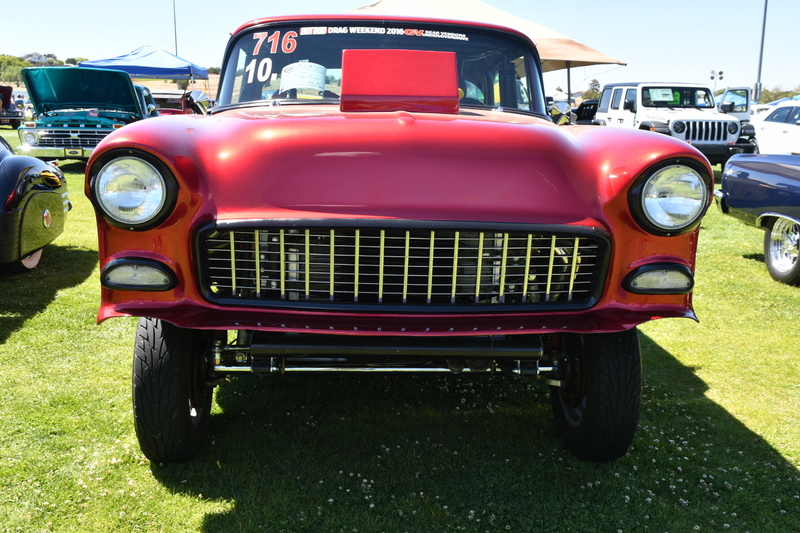 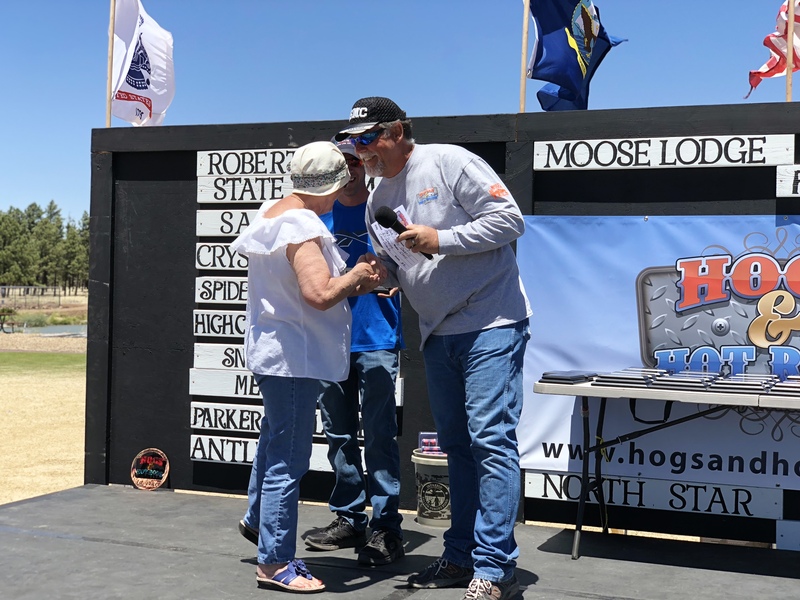 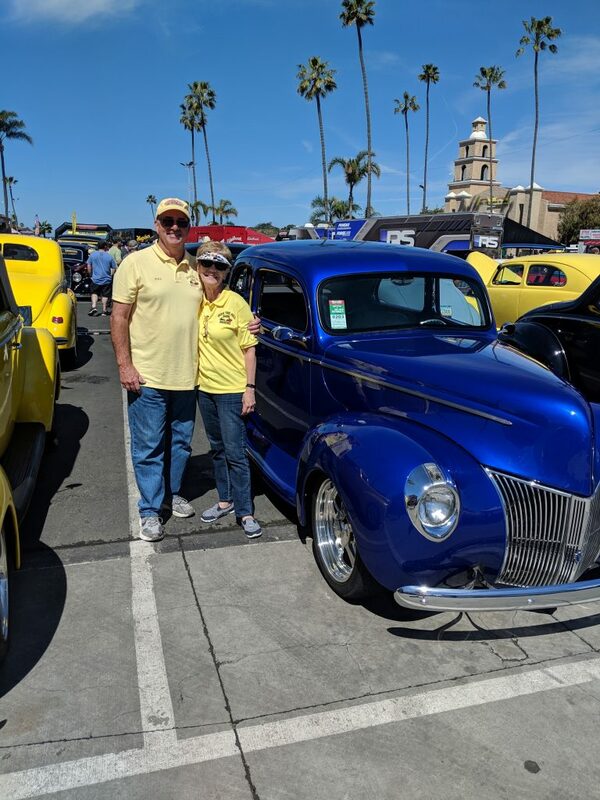 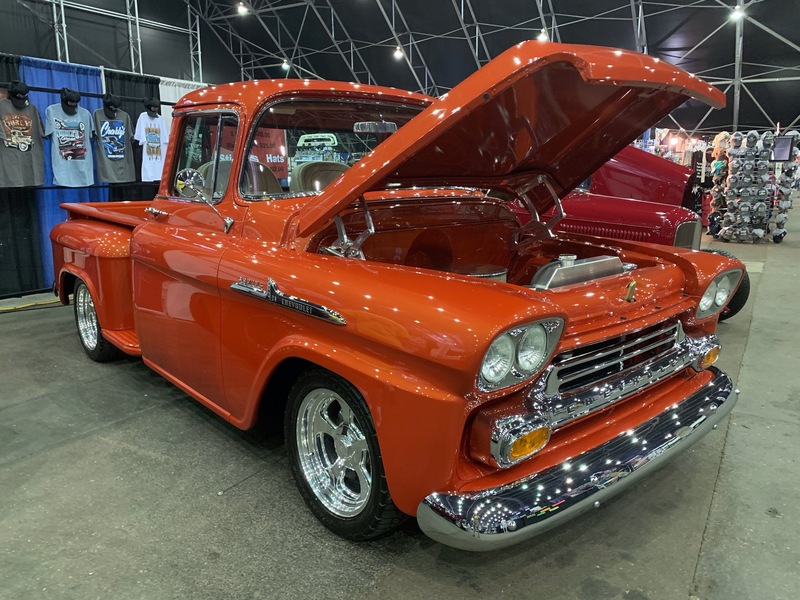 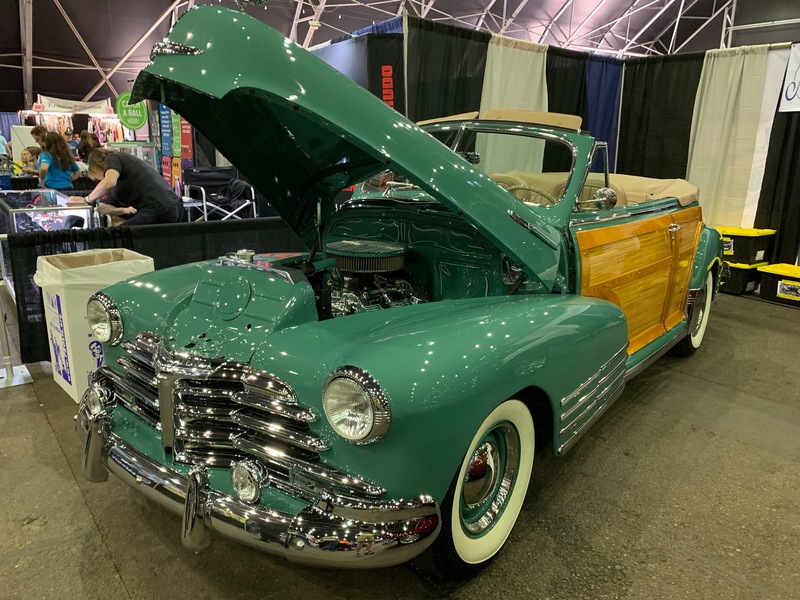 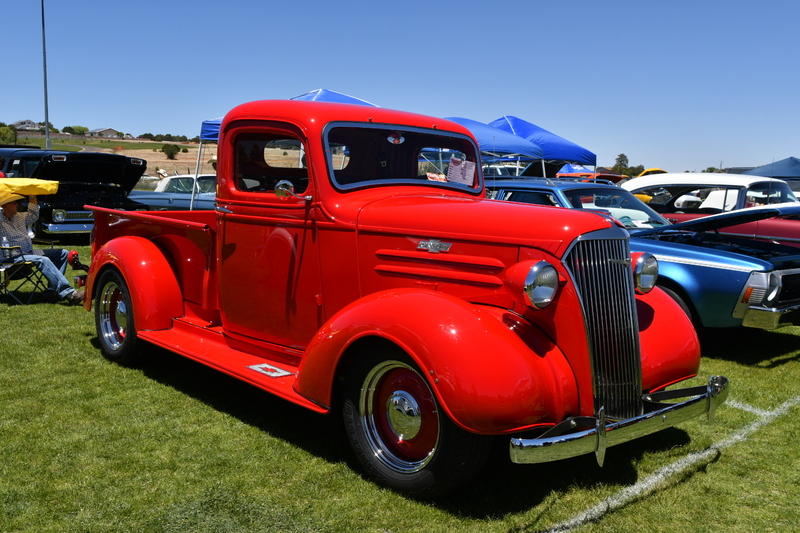 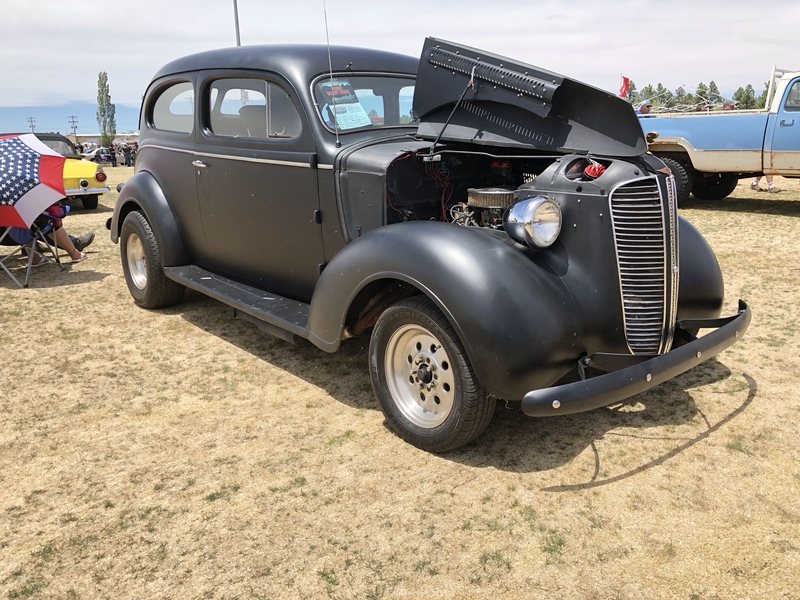 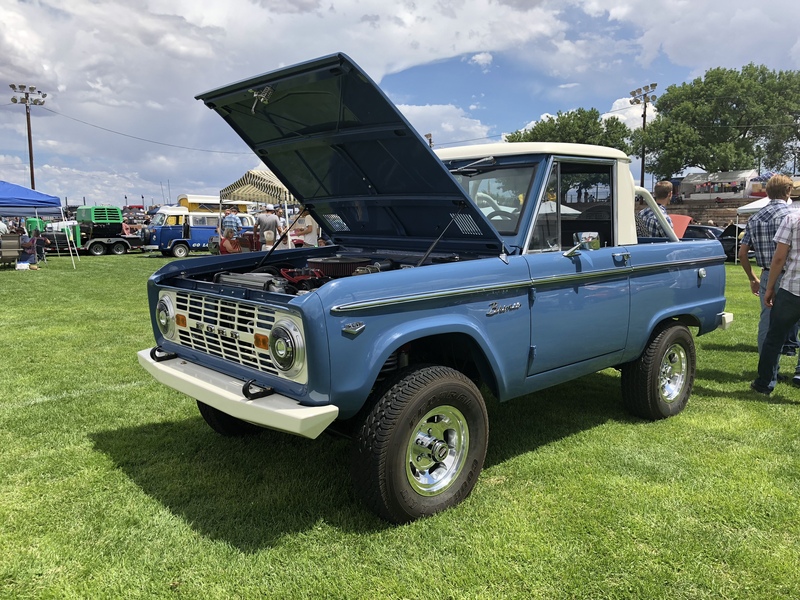 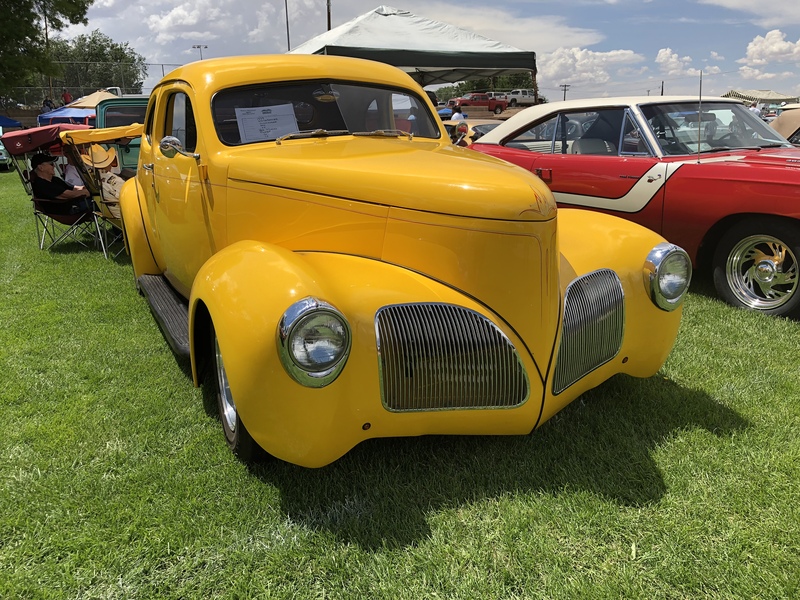 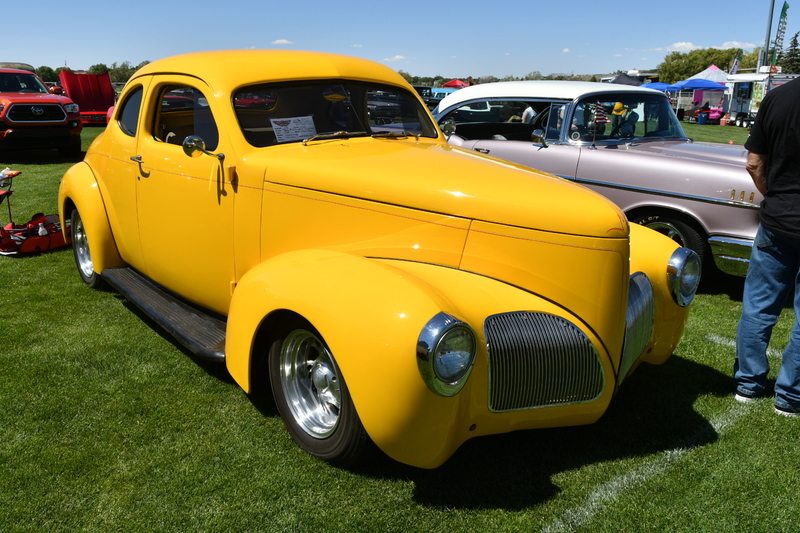 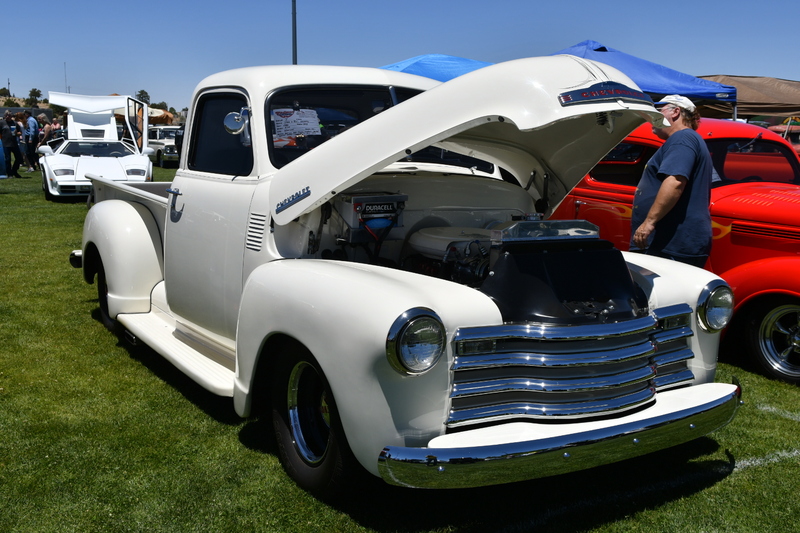 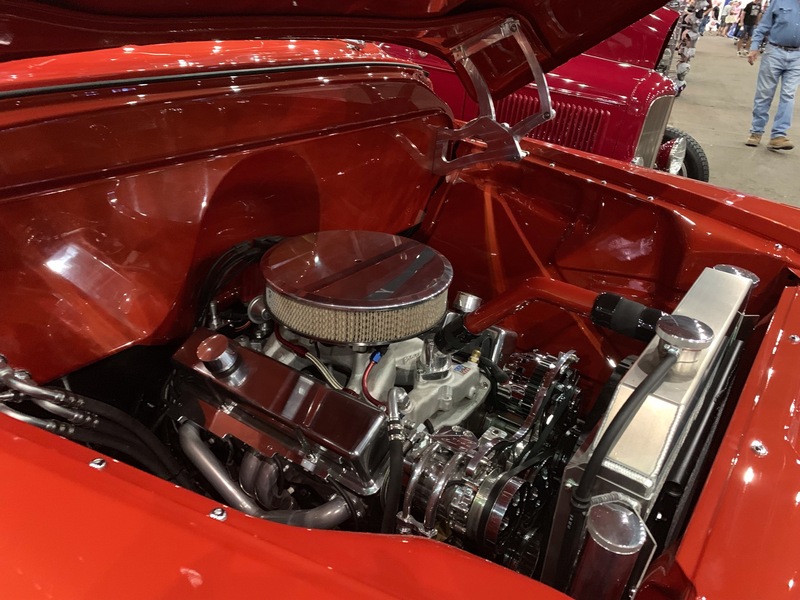 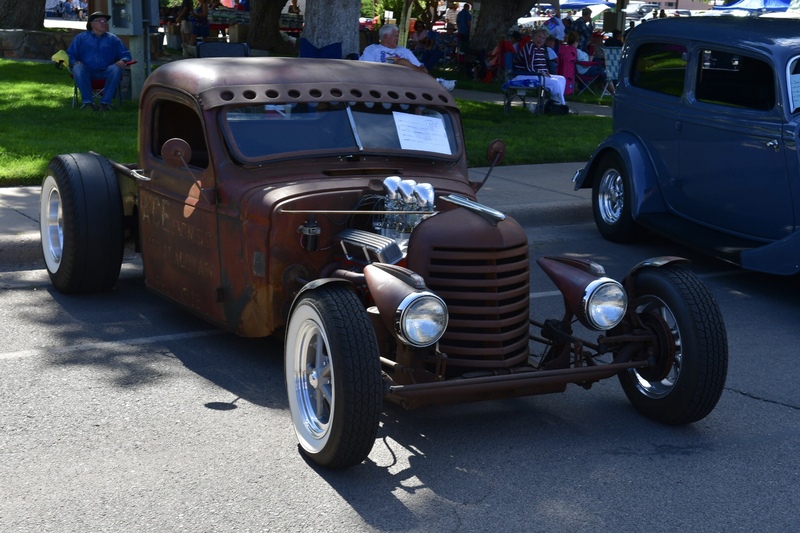 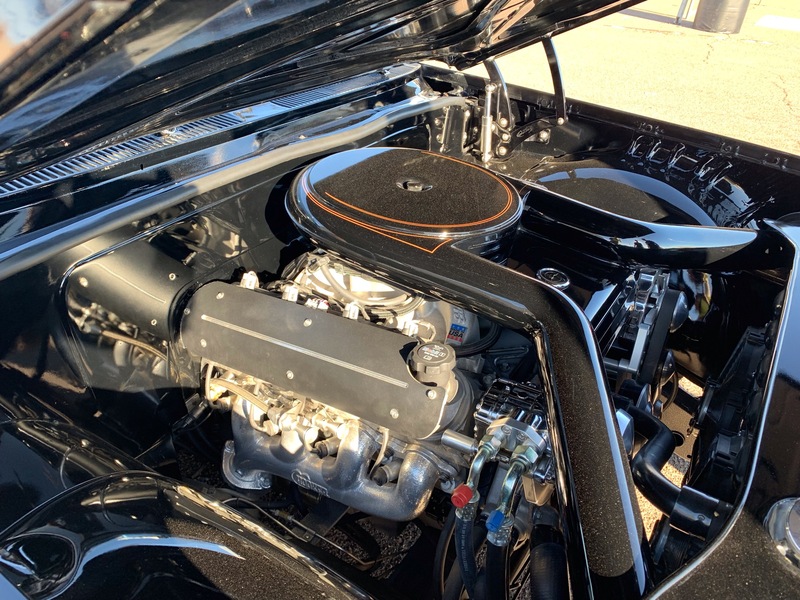 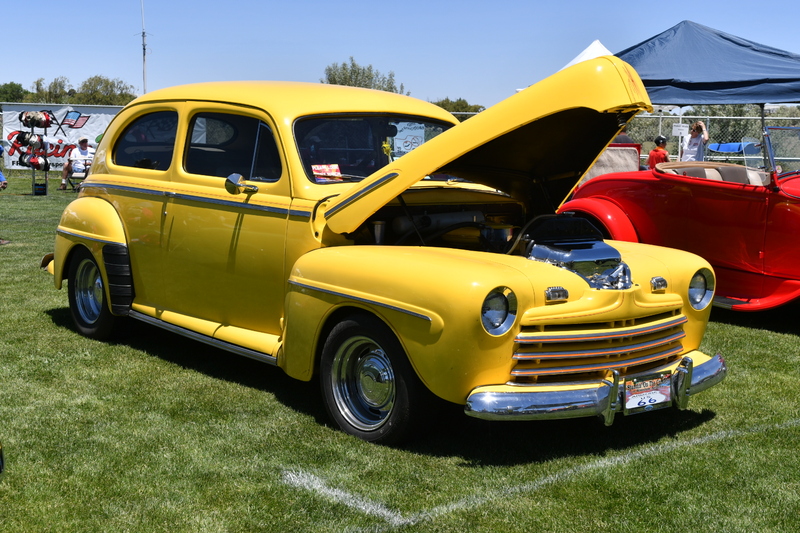 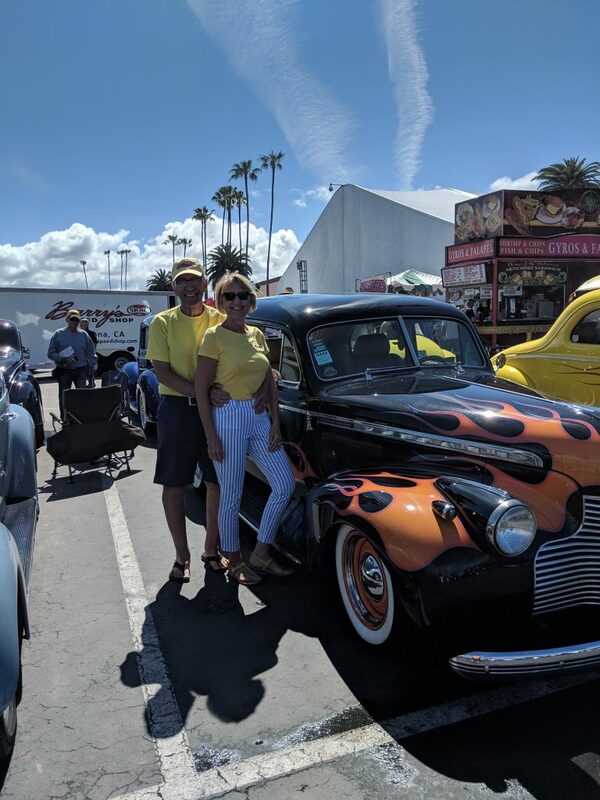 The only club members at the show were Steve & Terri Bessie with Steve’s 1950 Chevy pickup that received a 1st place award in the modified pickup class. 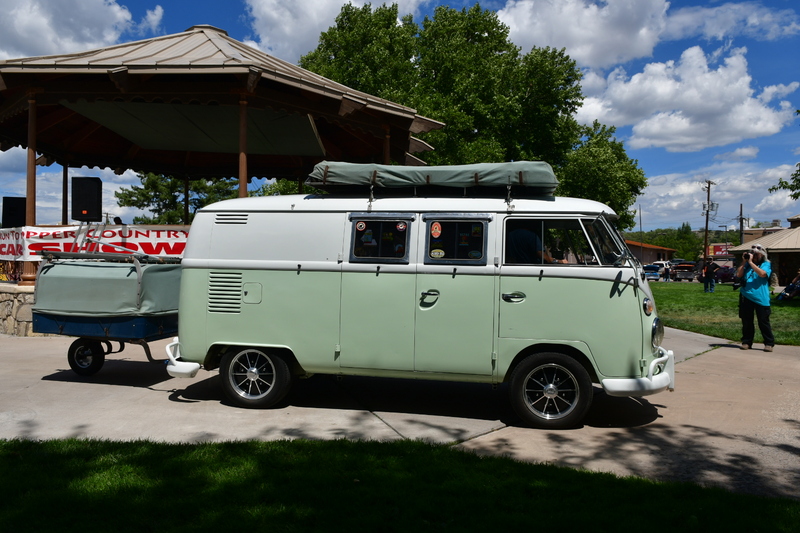 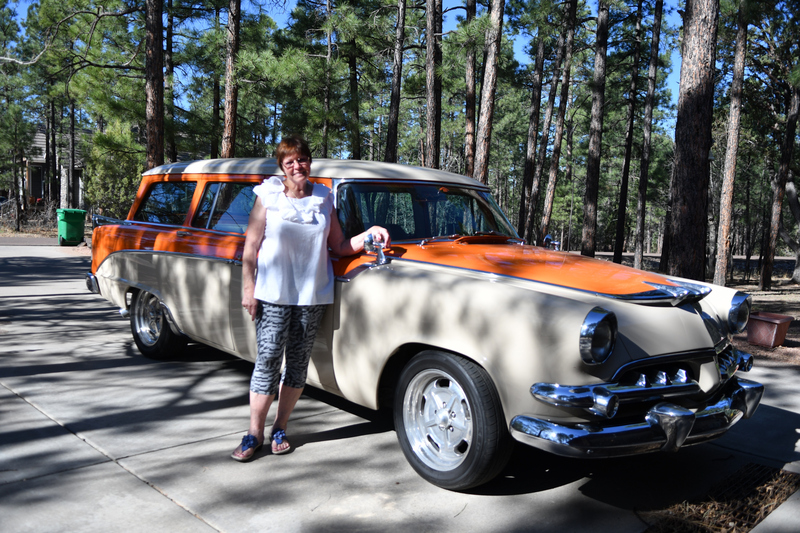 Michelle and I brought the wagon and our two favorite redheads, Zoe and Satori. 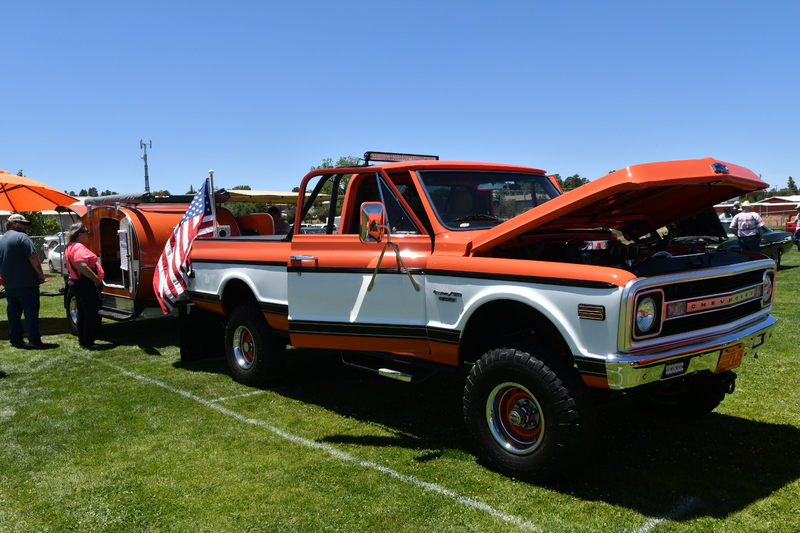 A nice feature of this show is that they open it to diesel truck tractors. 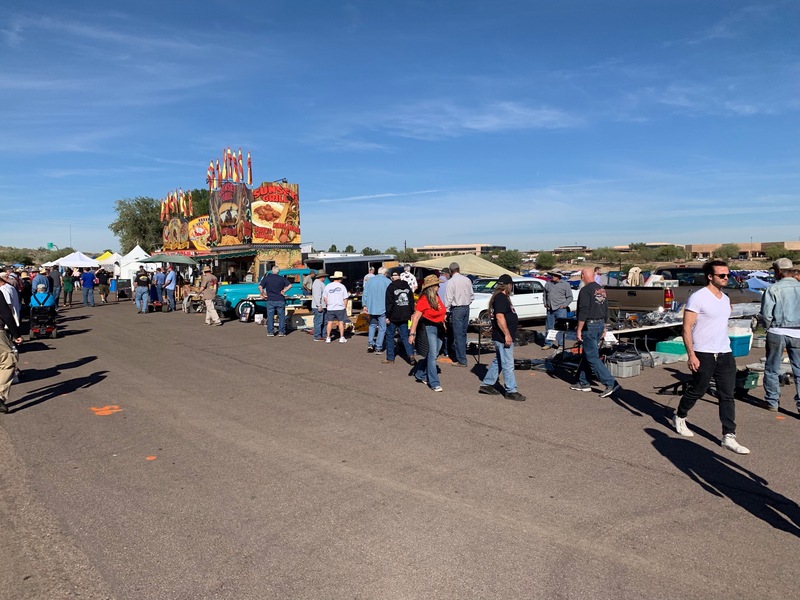 Each year the participation has grown. 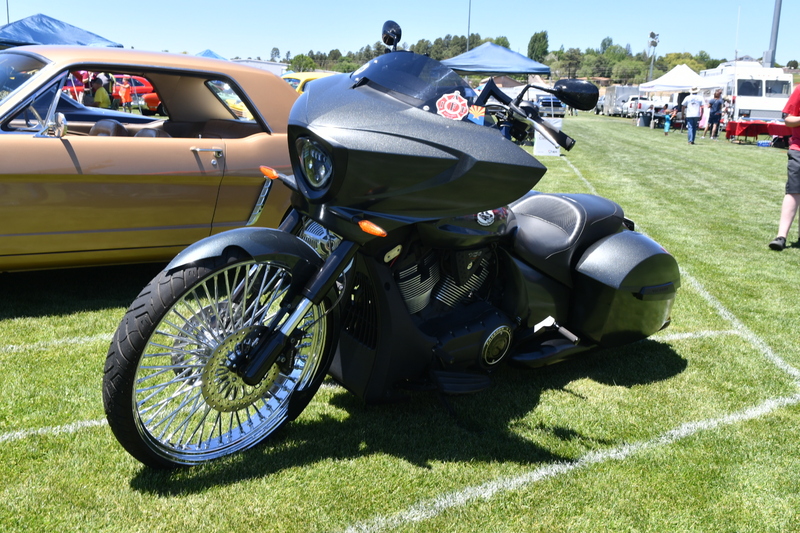 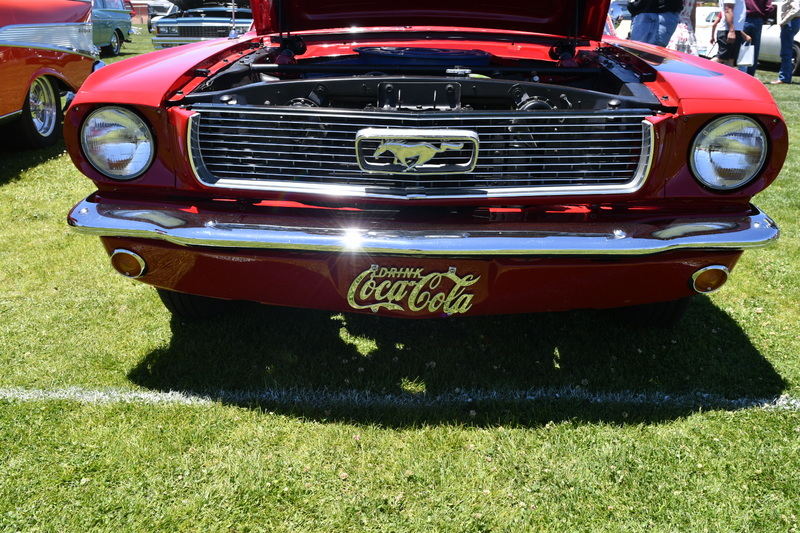 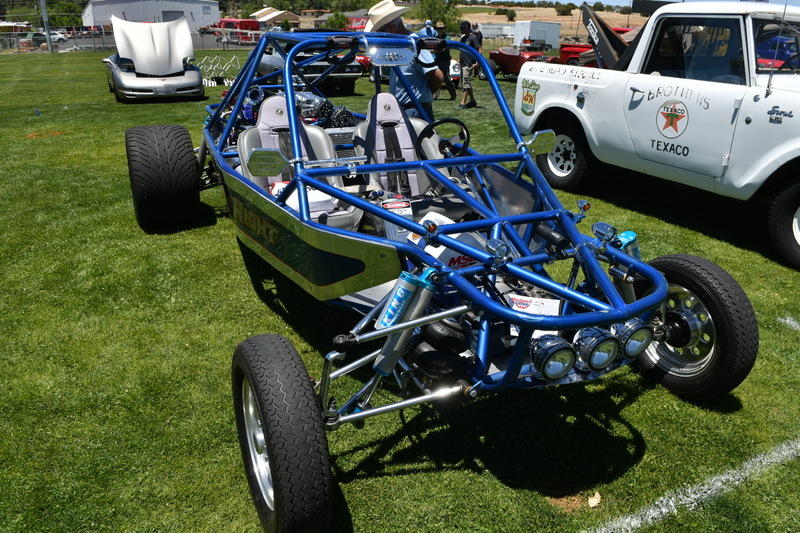 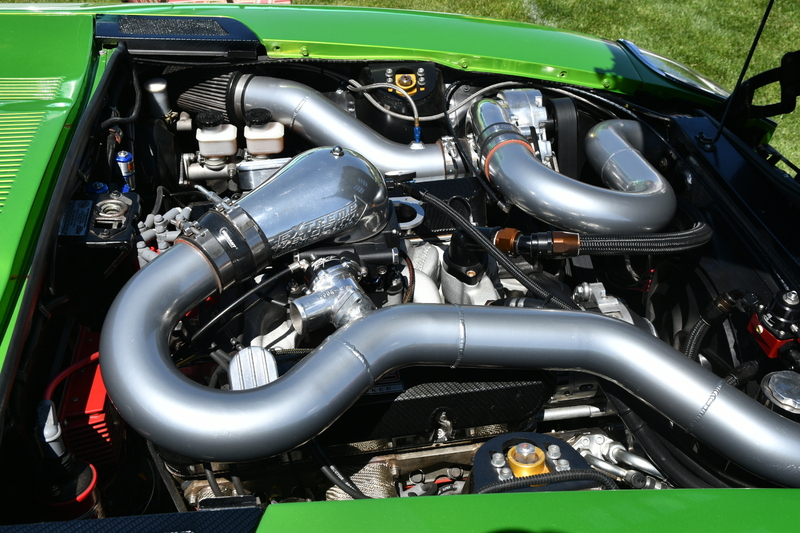 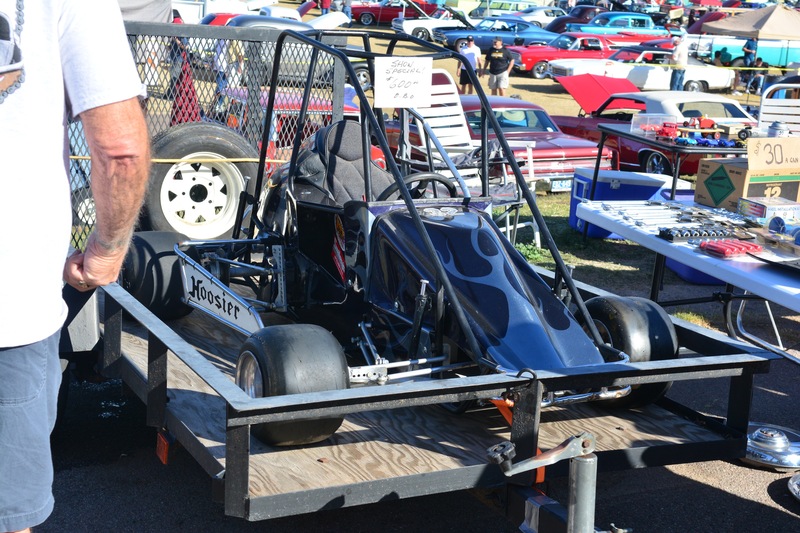 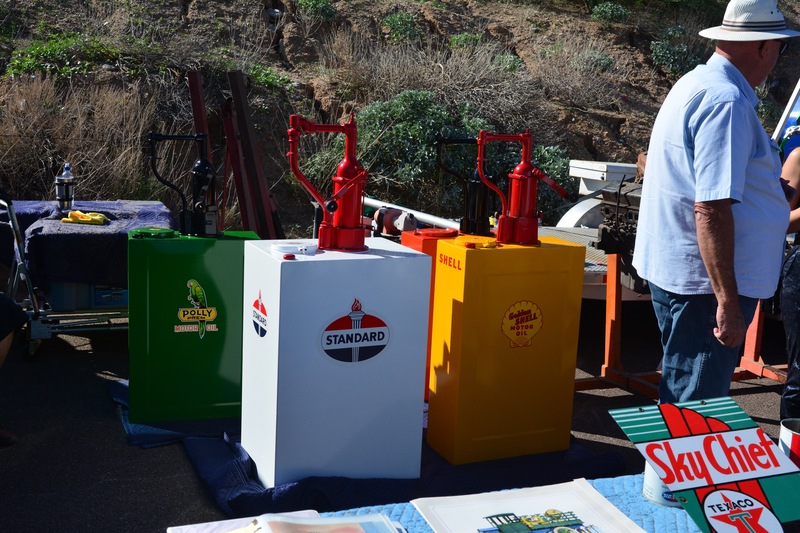 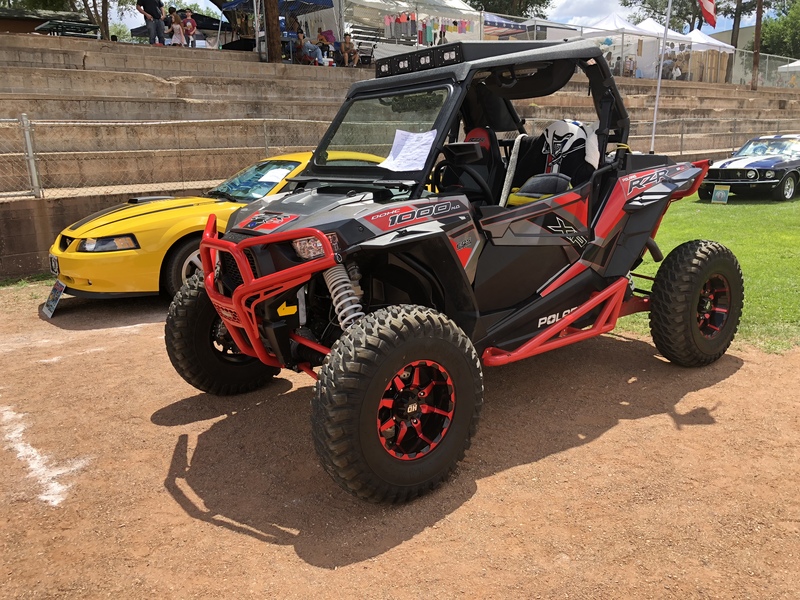 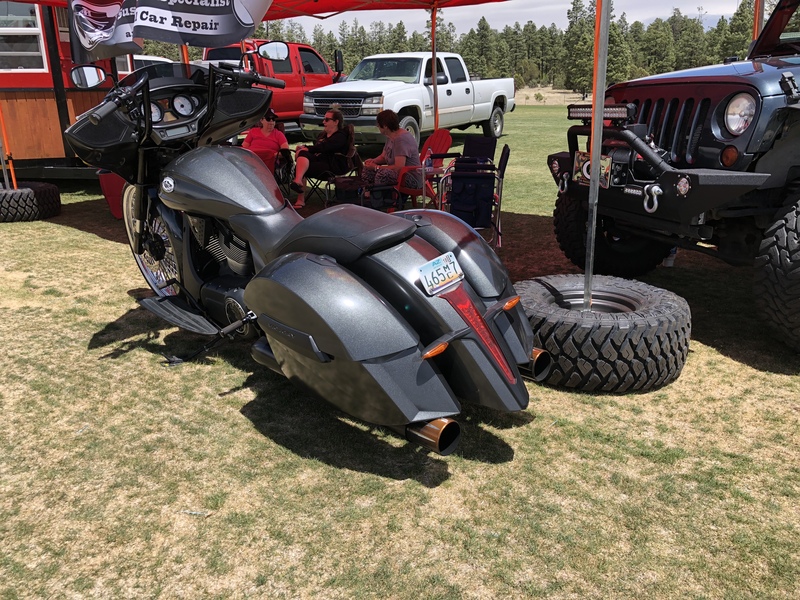 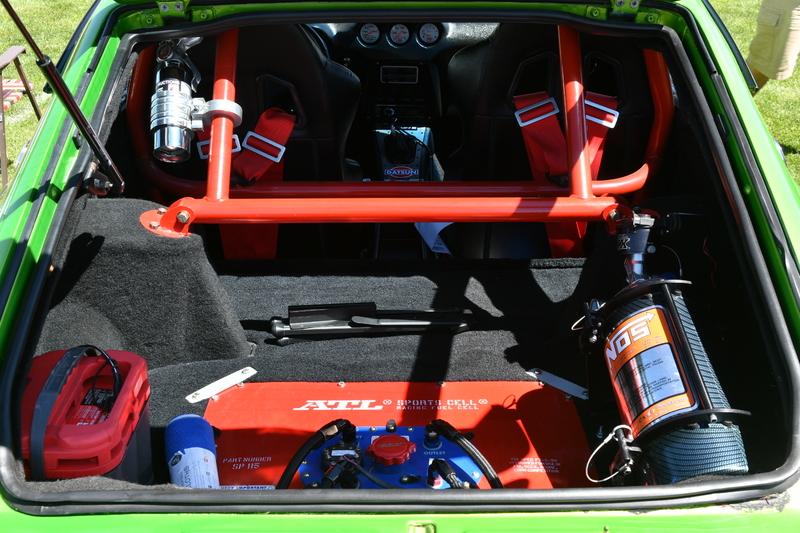 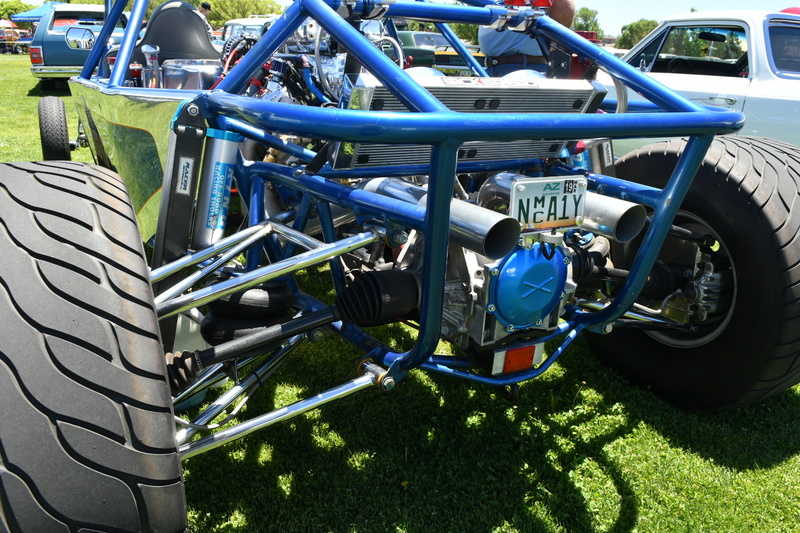 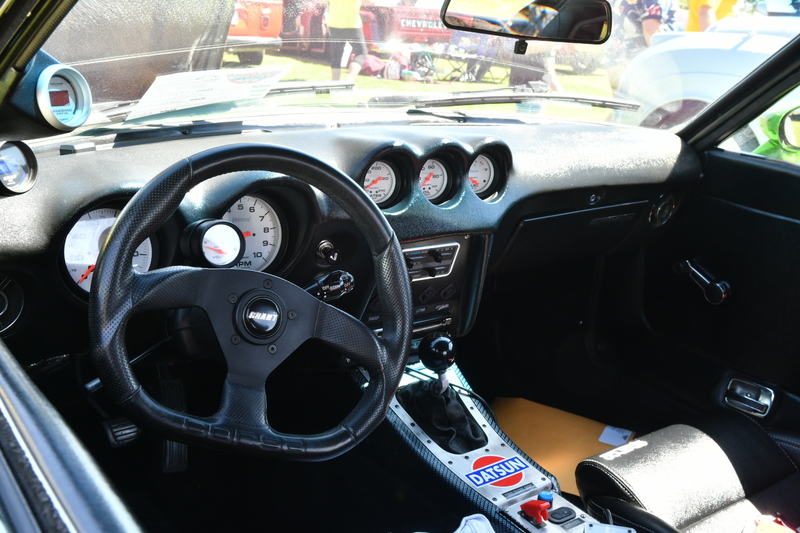 Most had been modified /customized and all looked great. 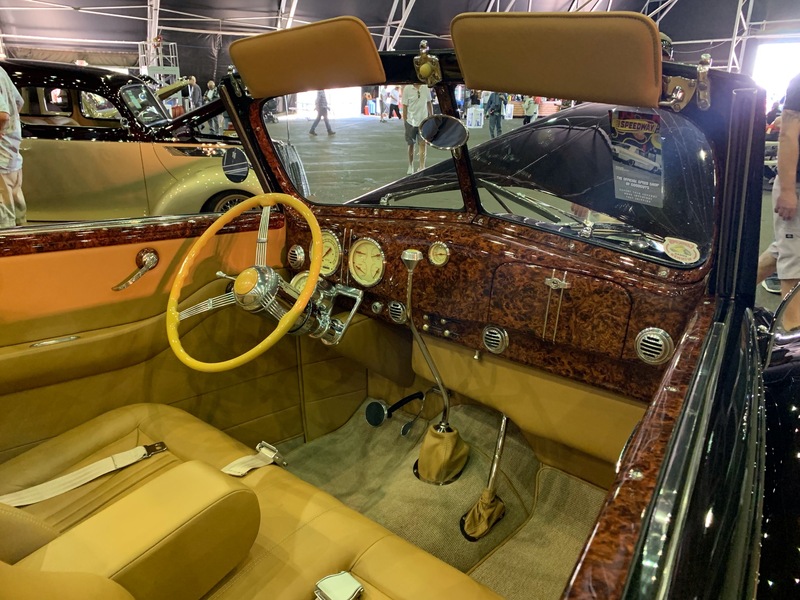 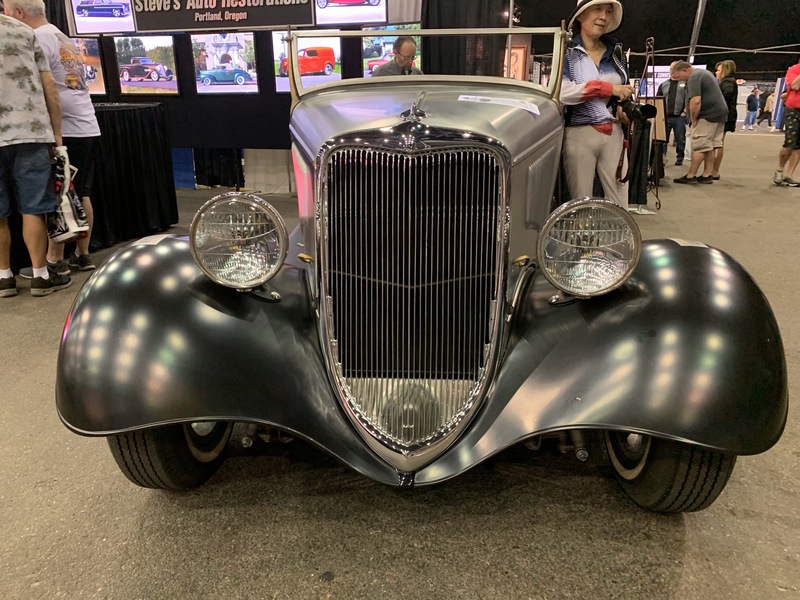 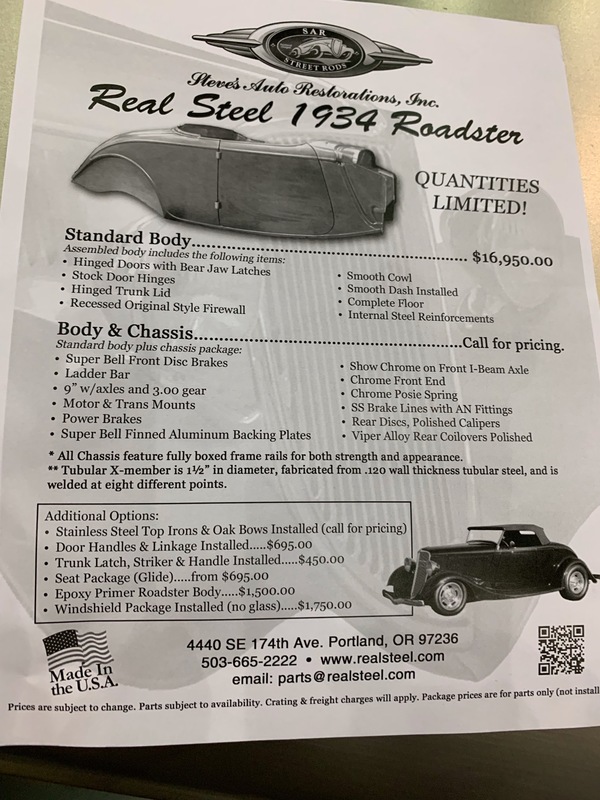 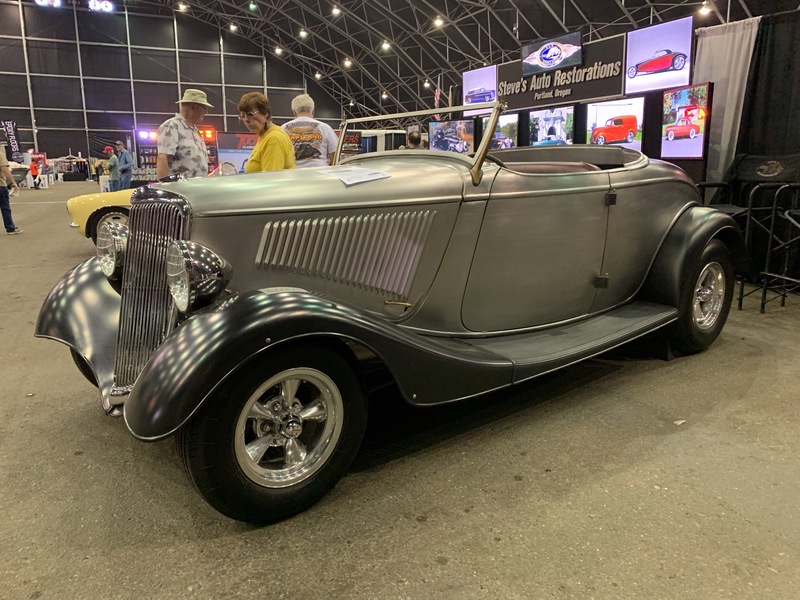 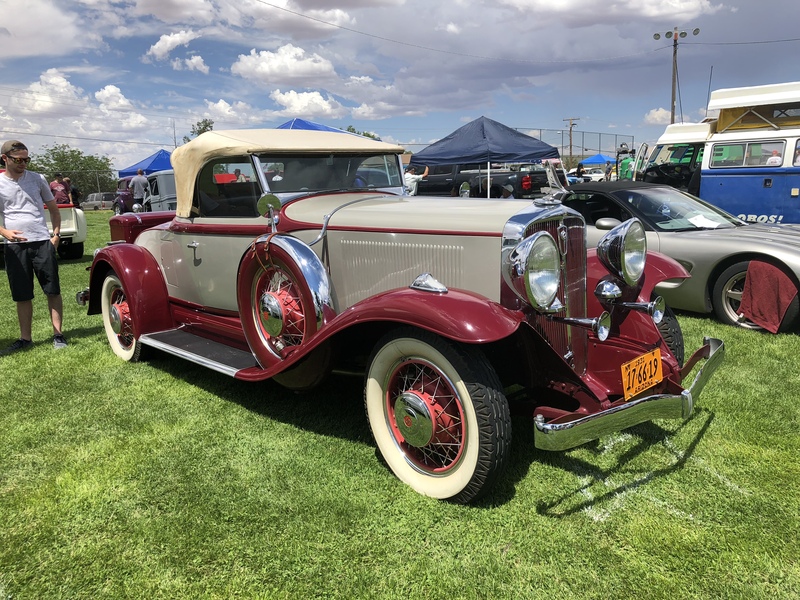 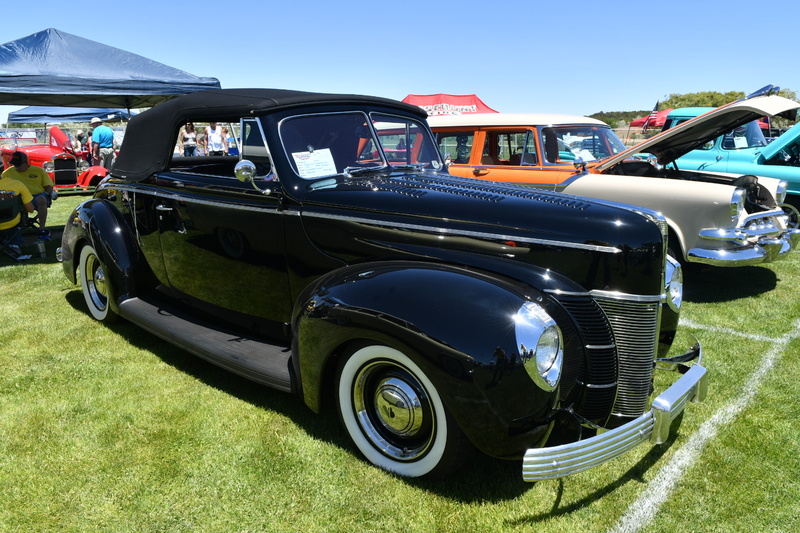 Of special interest was a restored 1932 Studebaker Cabriolet. 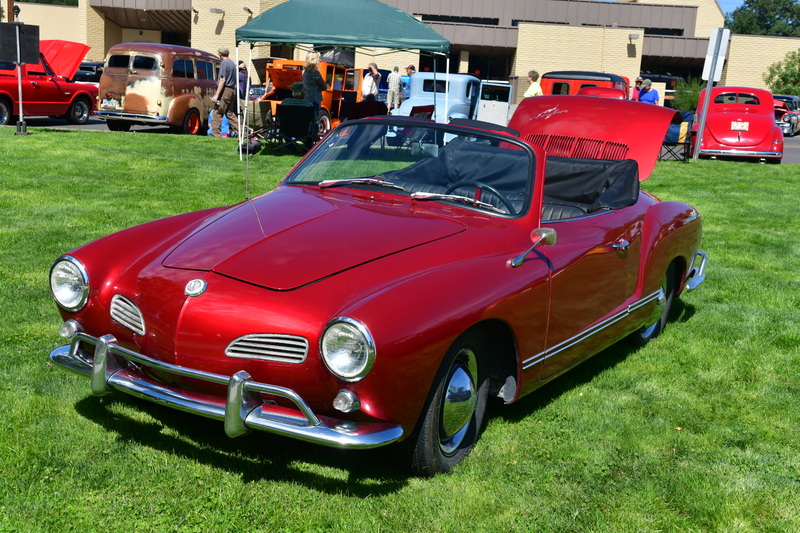 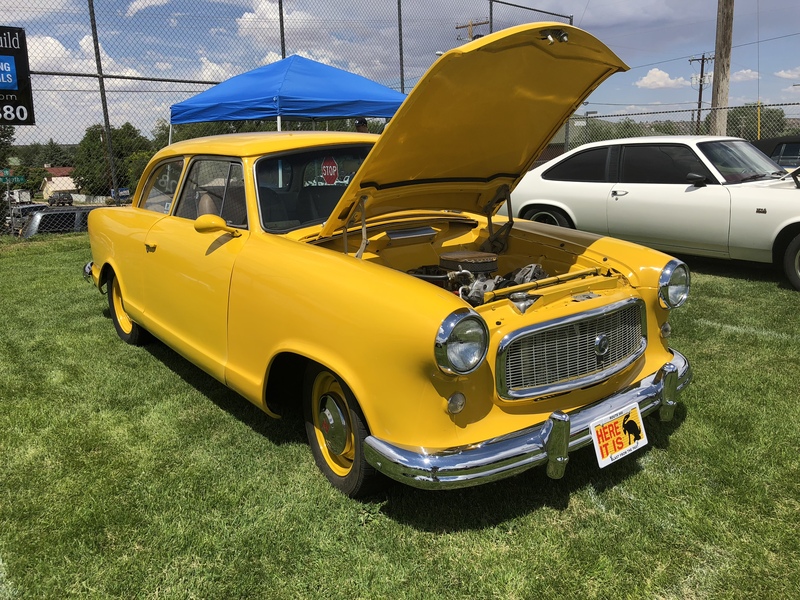 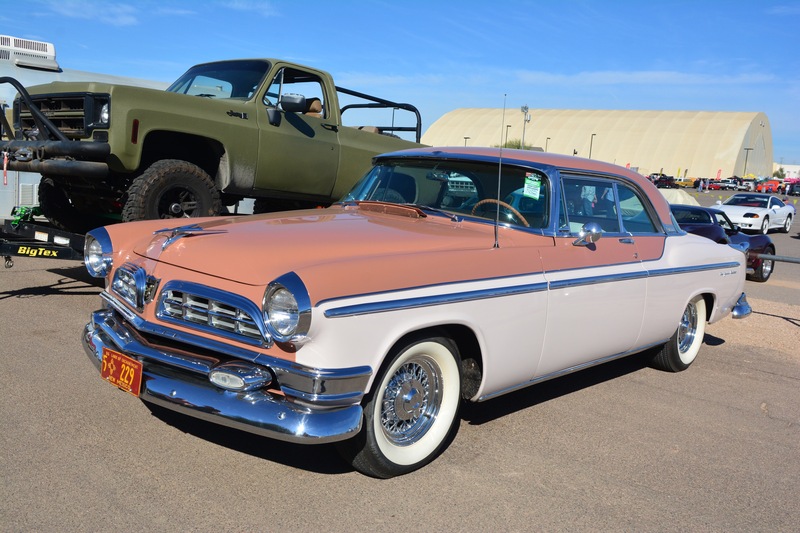 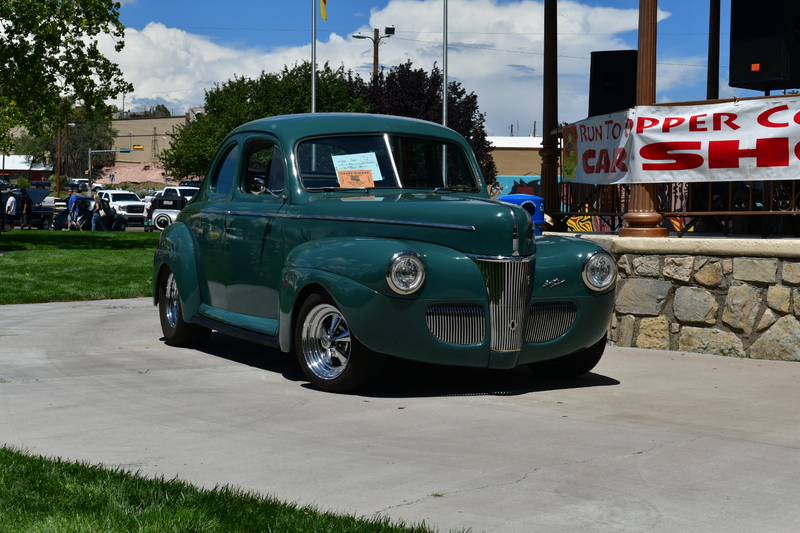 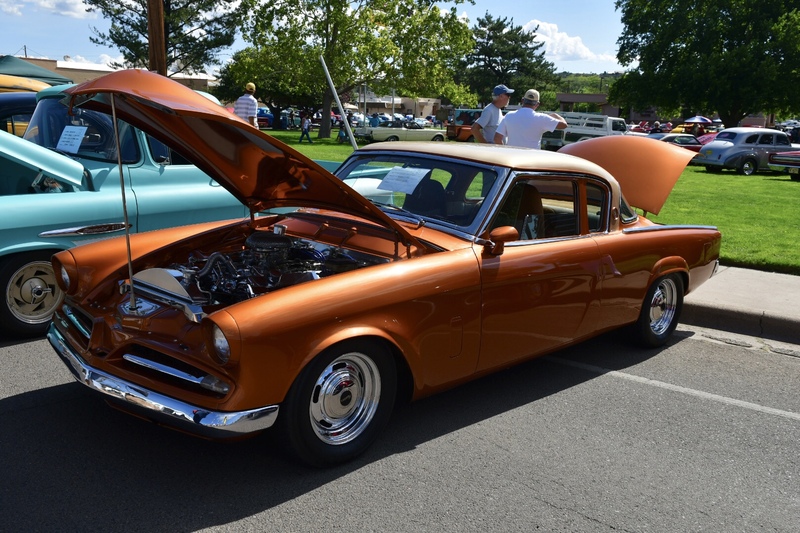 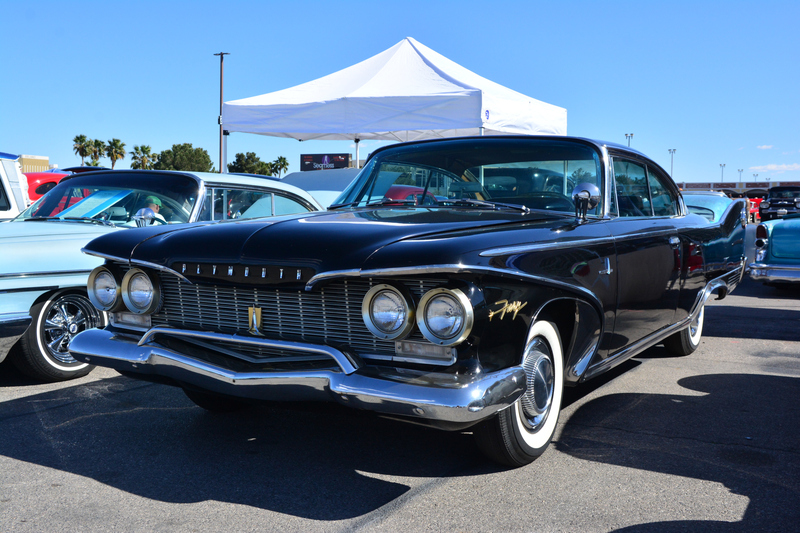 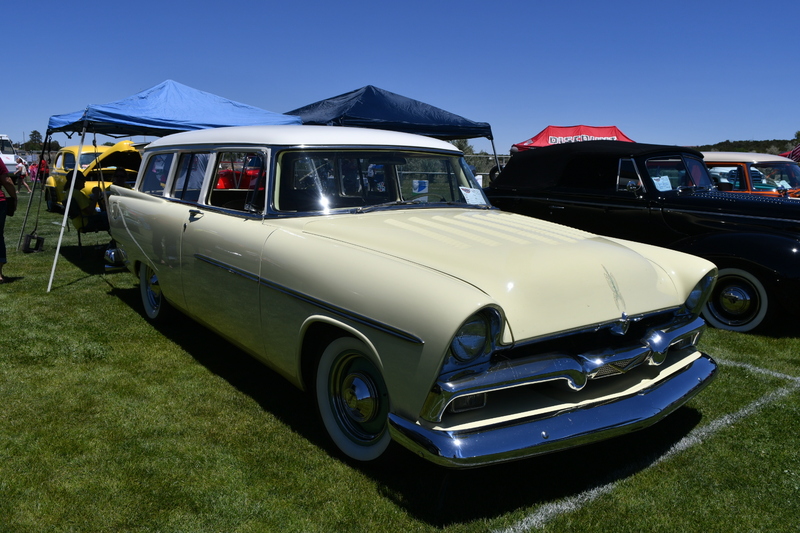 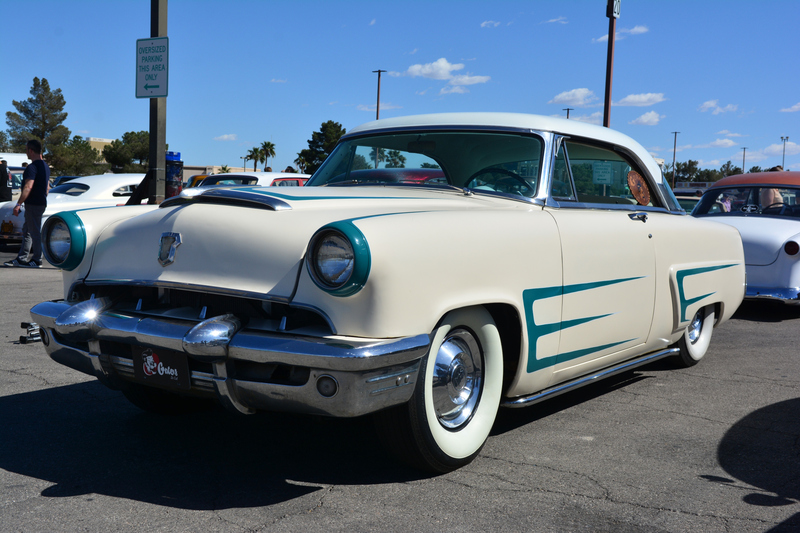 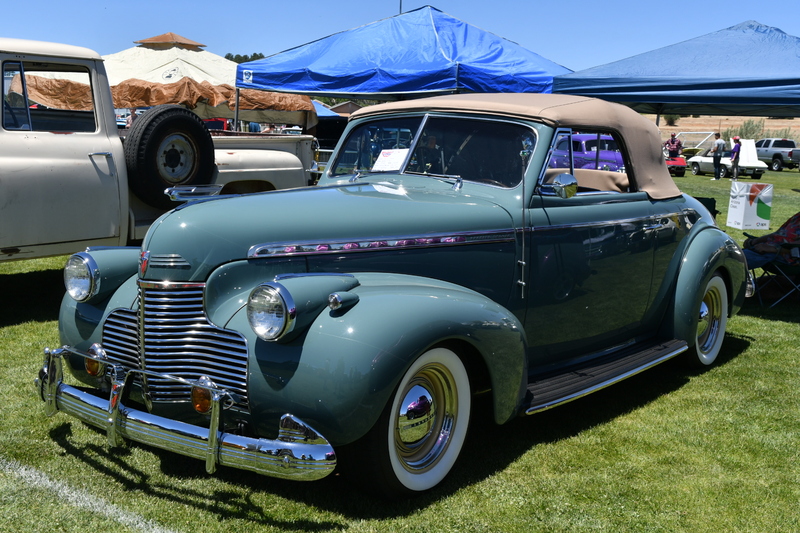 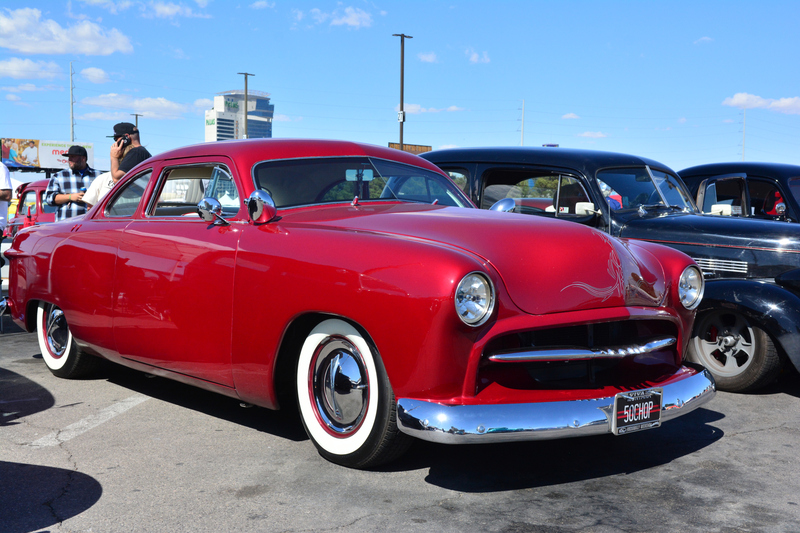 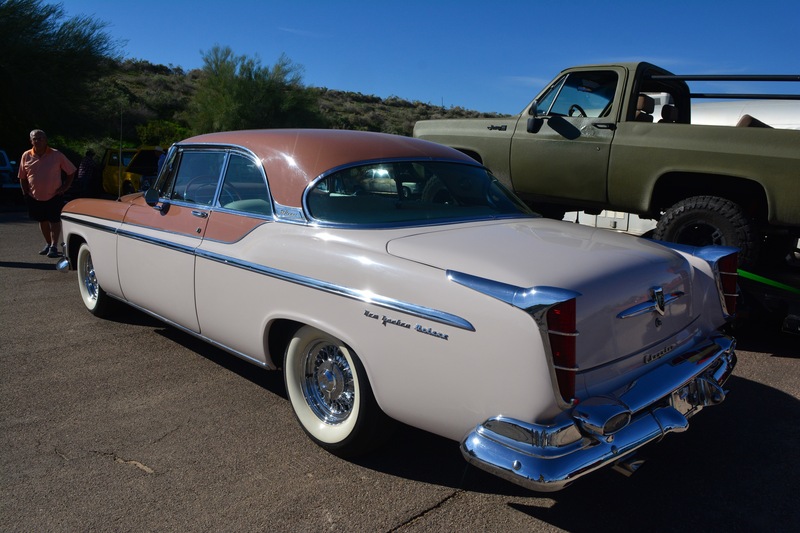 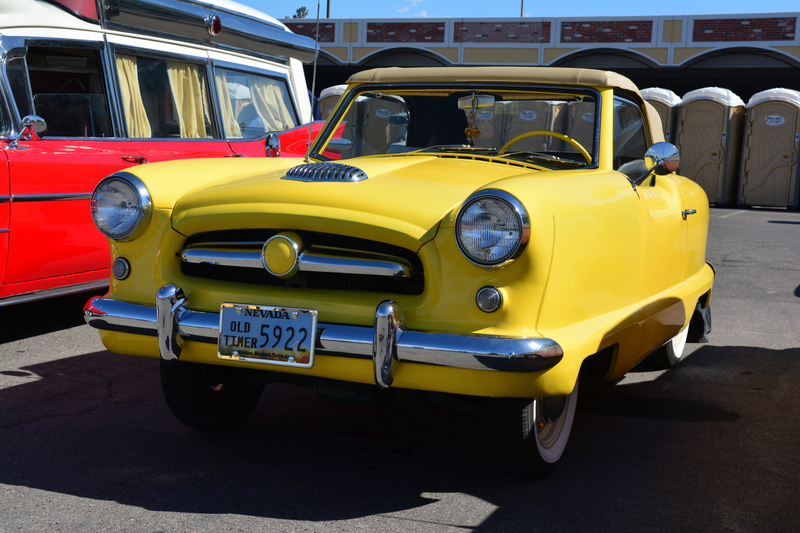 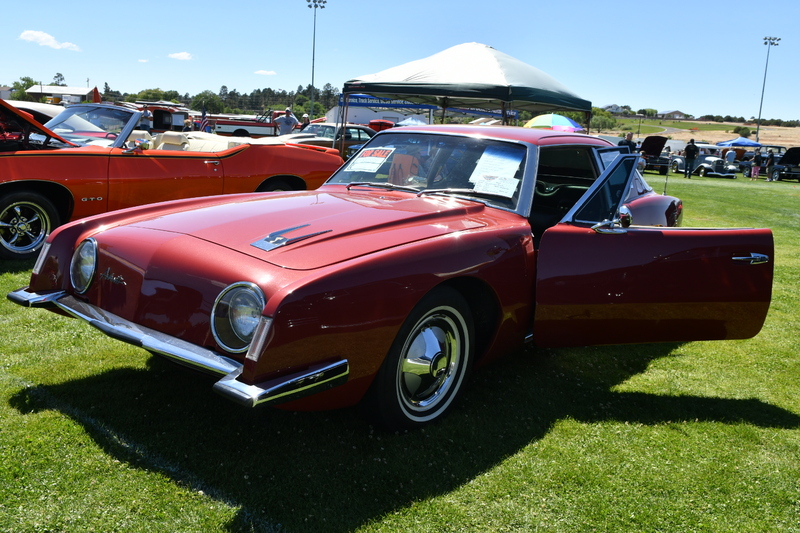 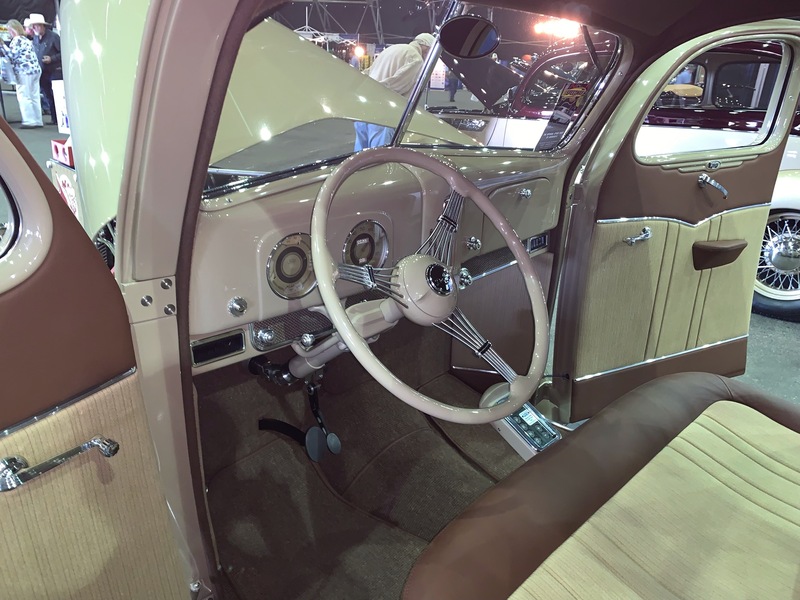 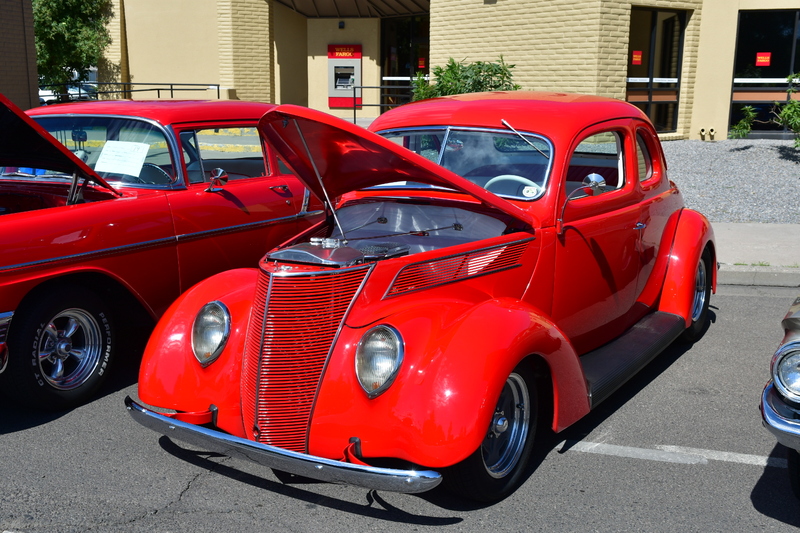 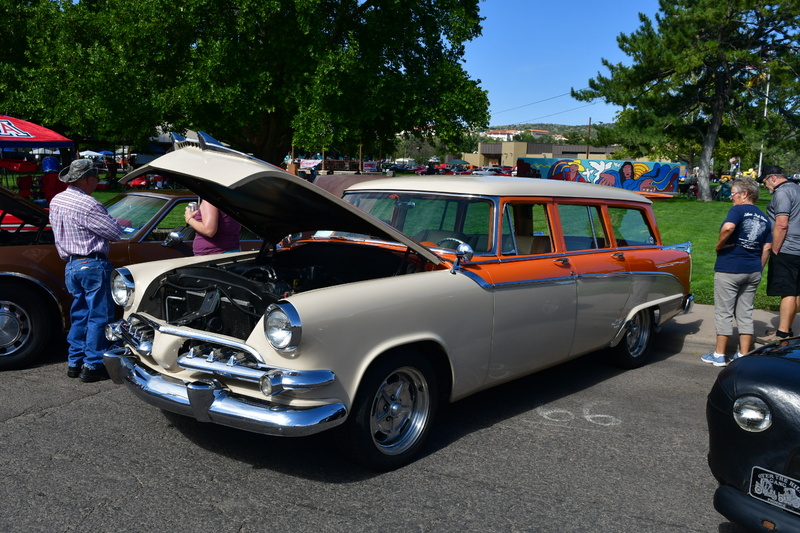 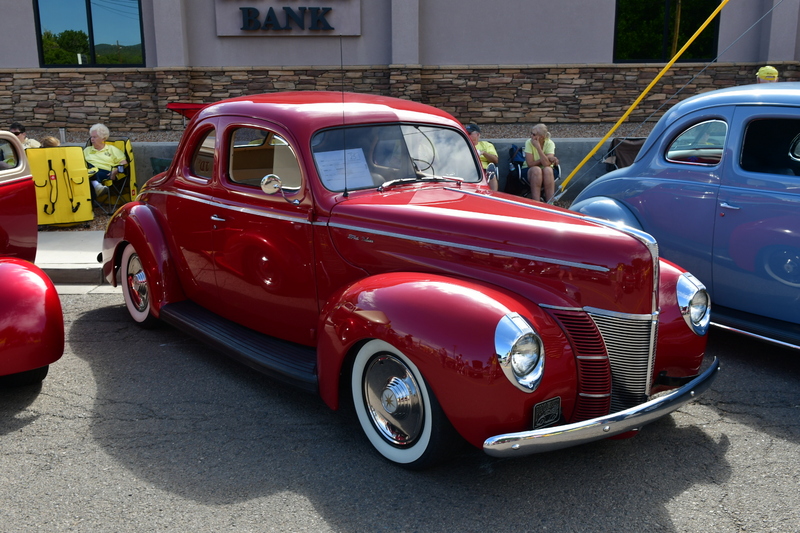 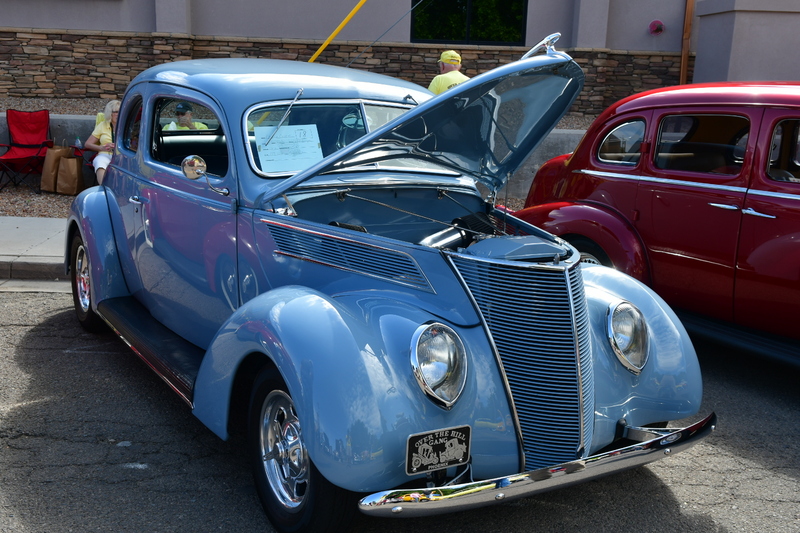 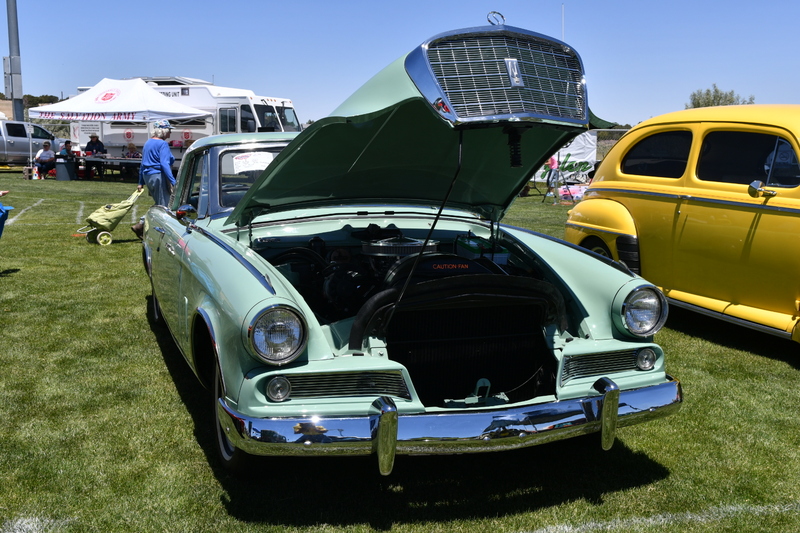 I had honesty forgotten how beautiful the pre Depression Studebakers were. 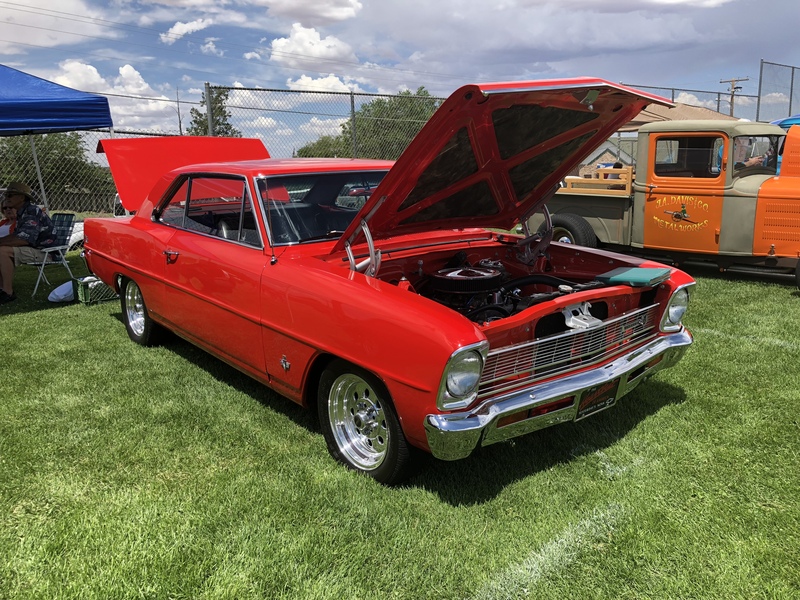 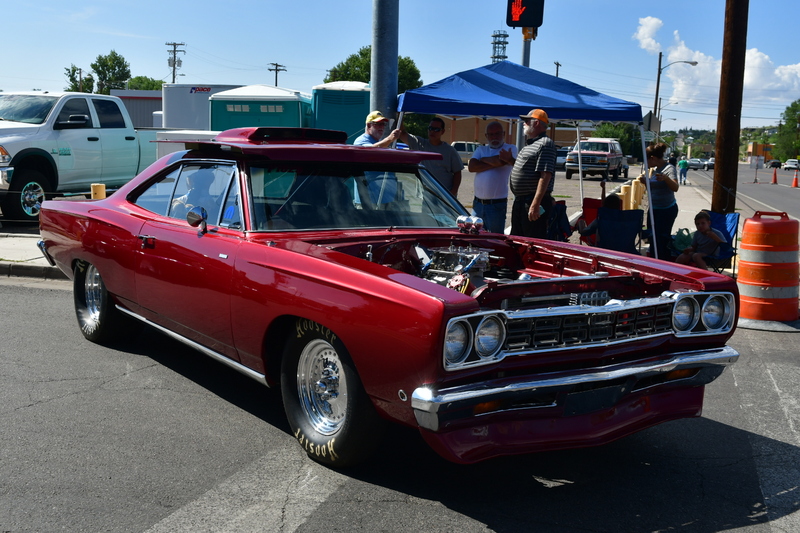 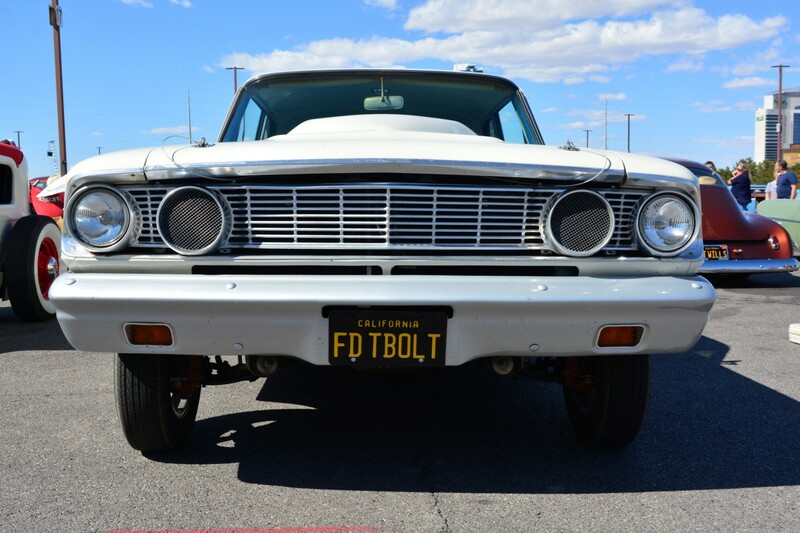 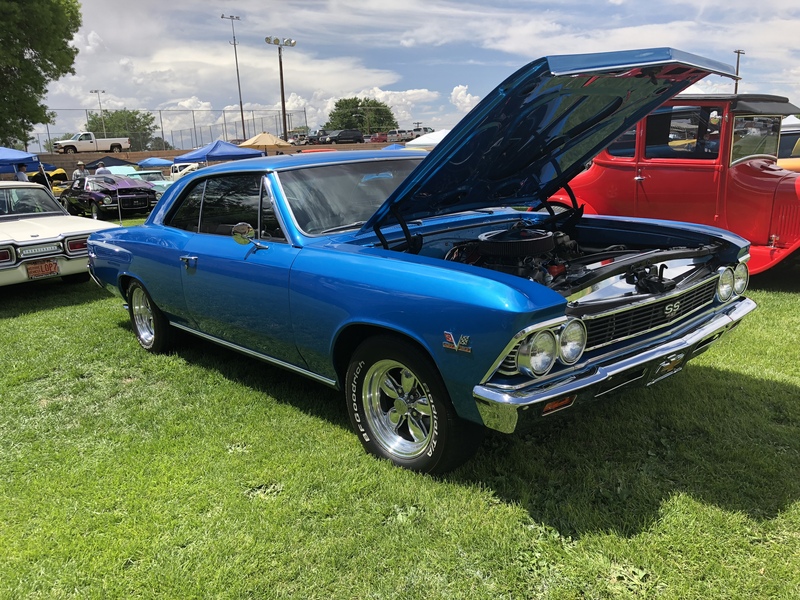 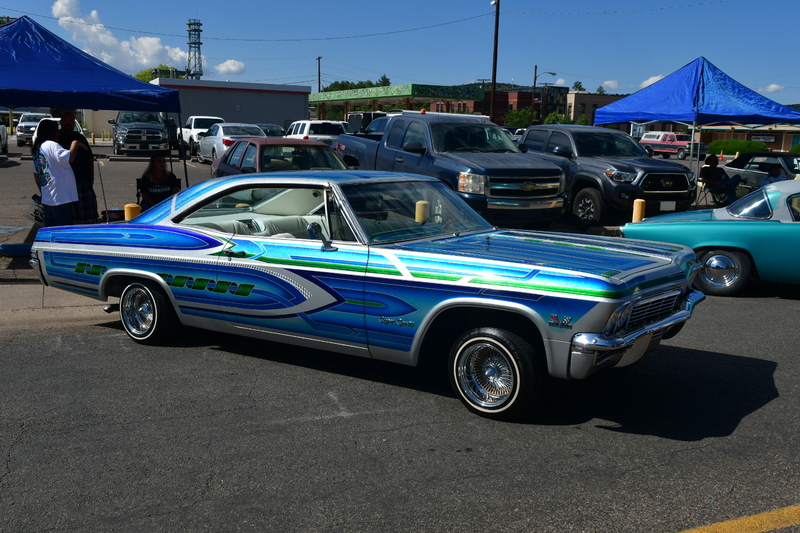 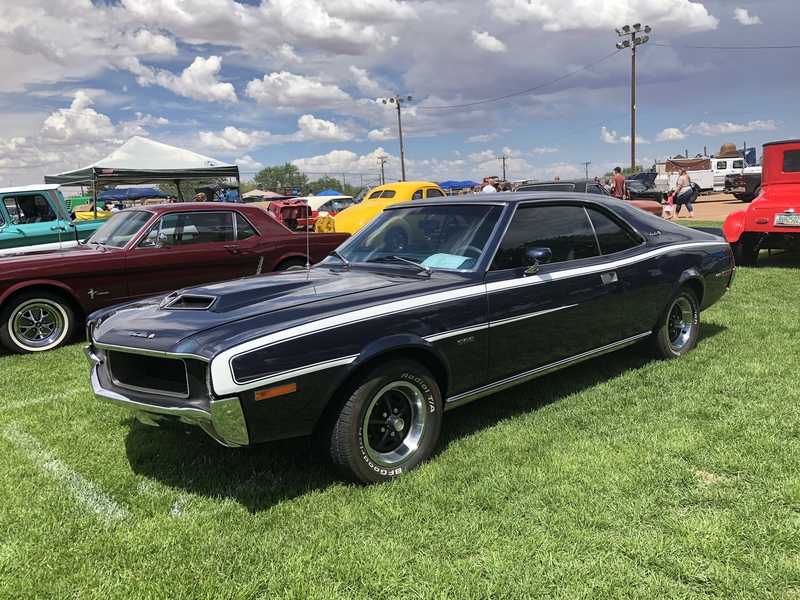 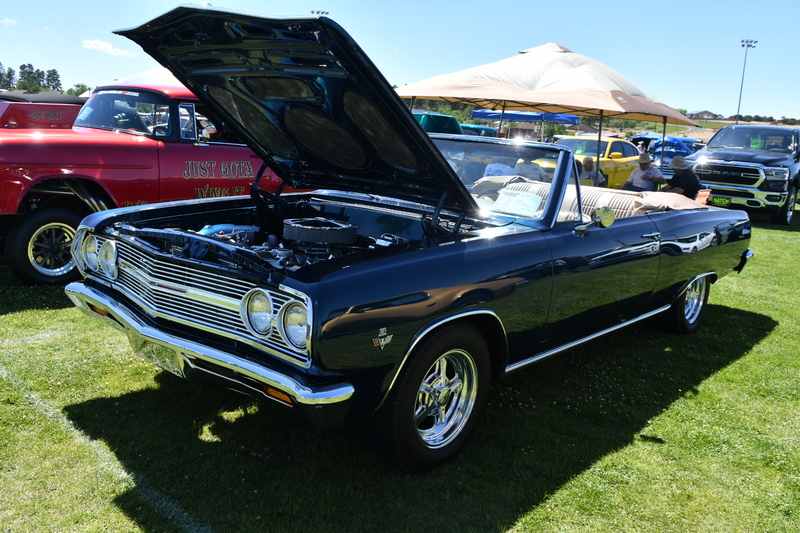 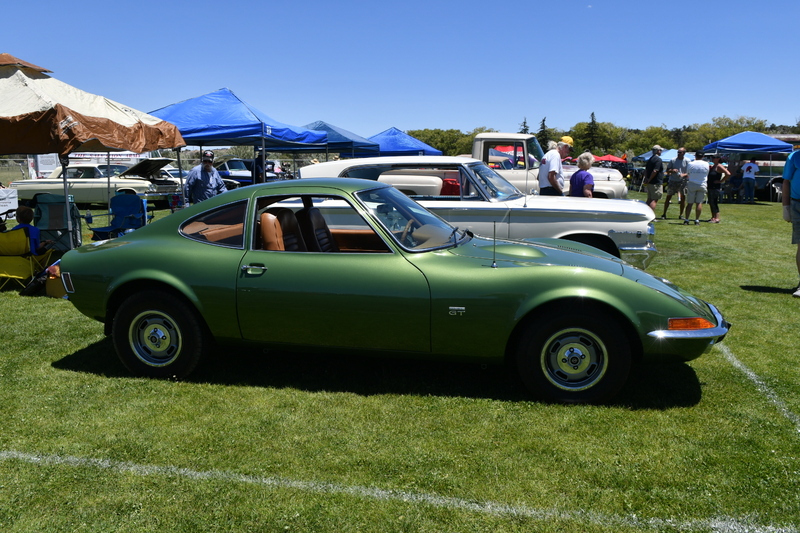 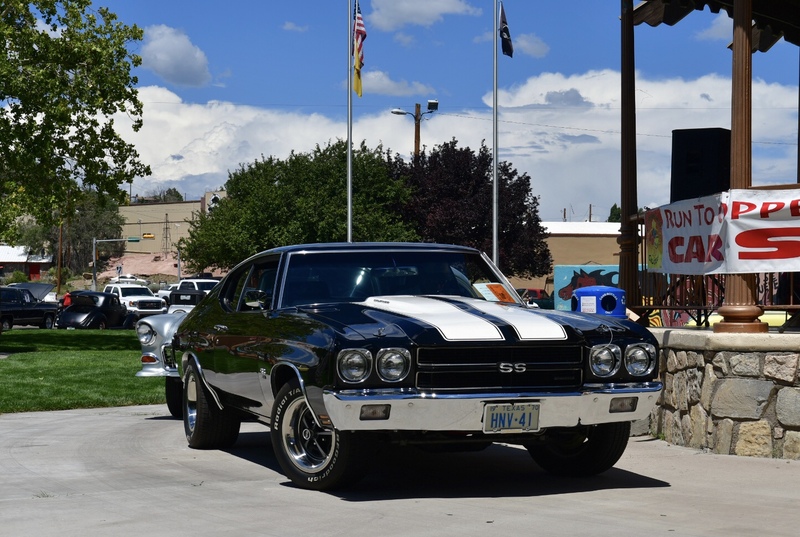 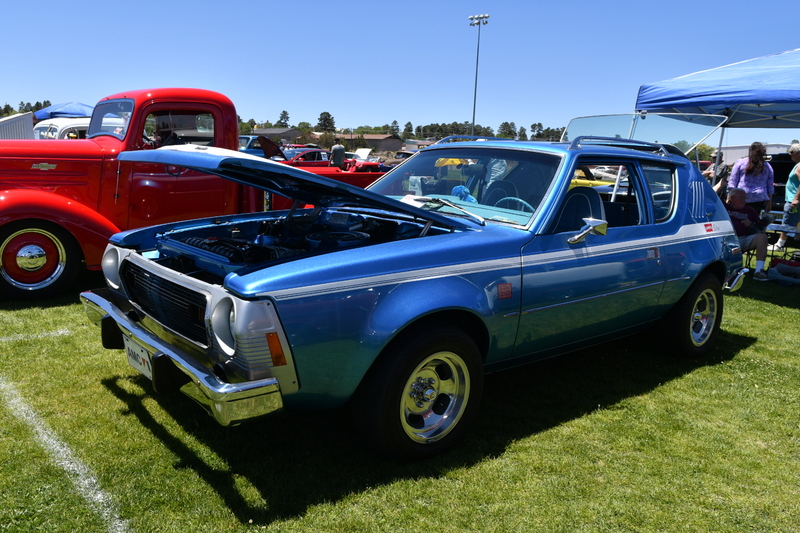 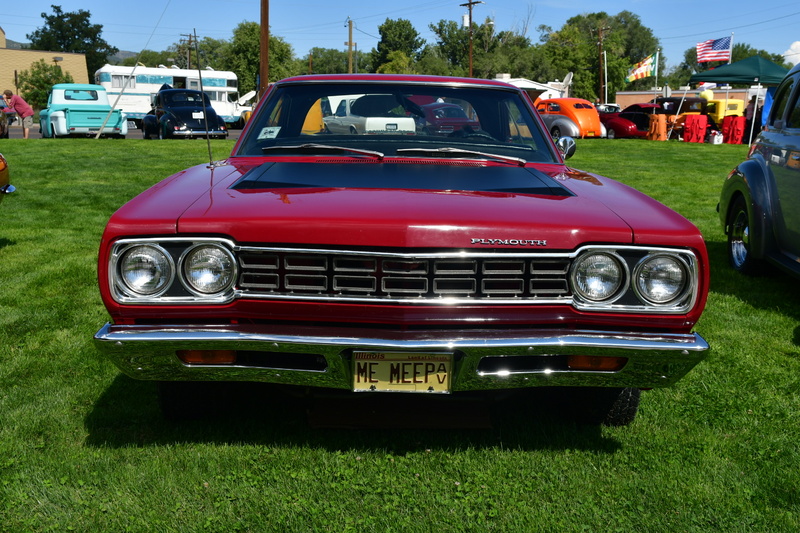 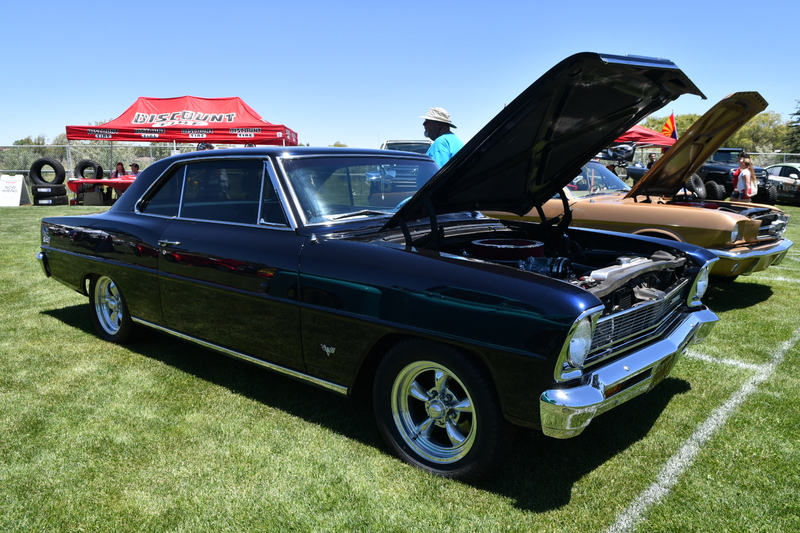 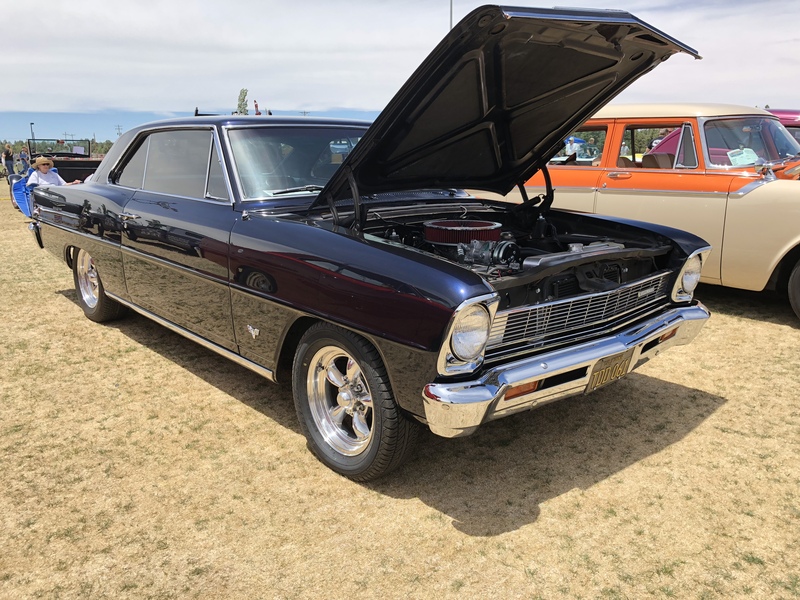 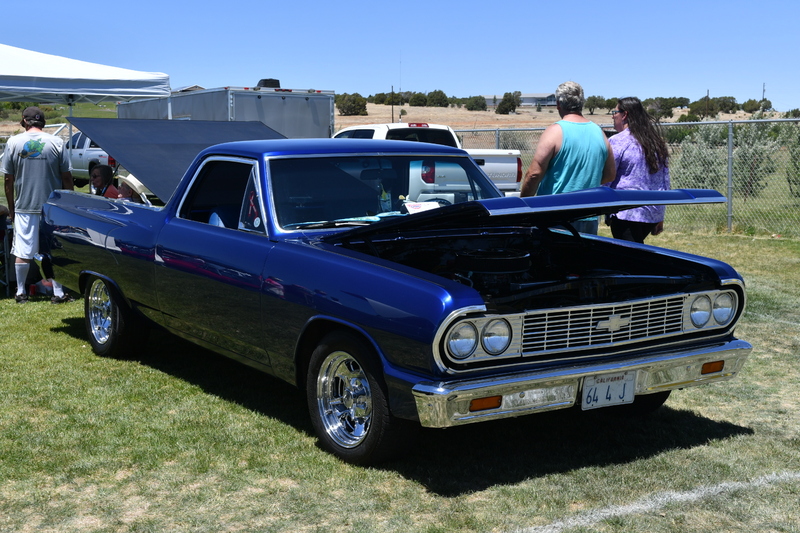 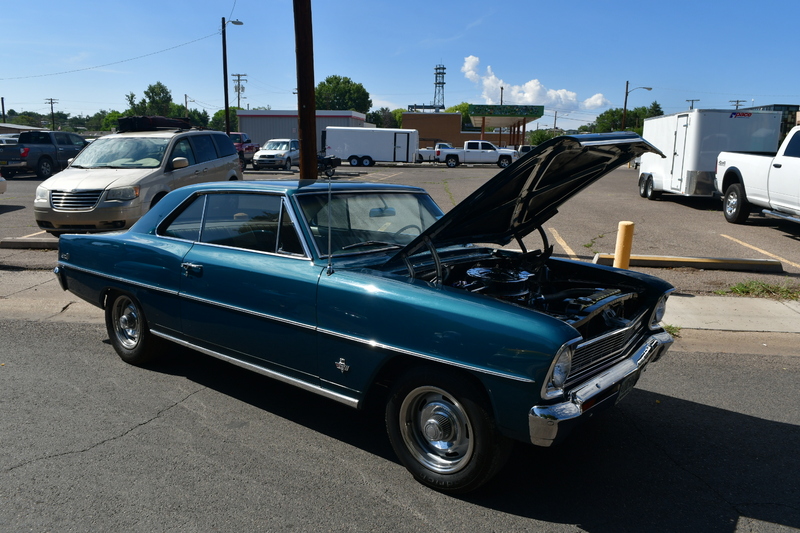 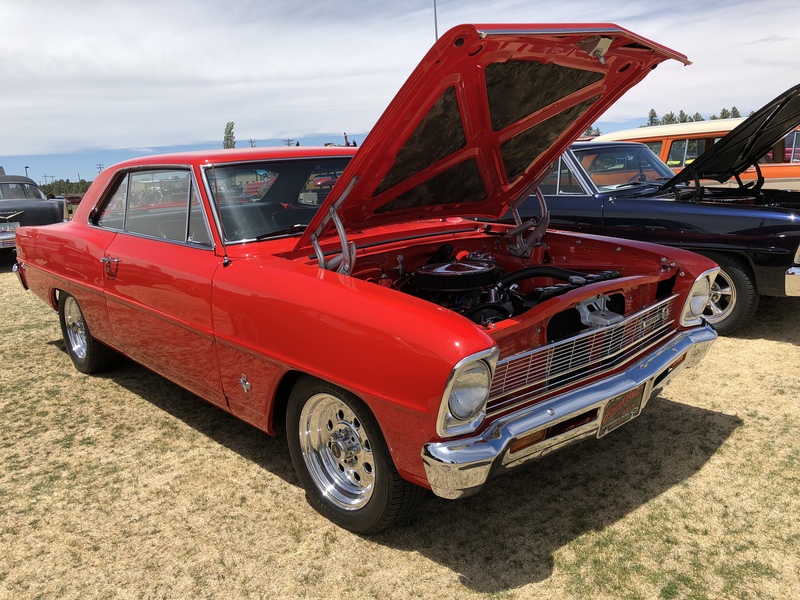 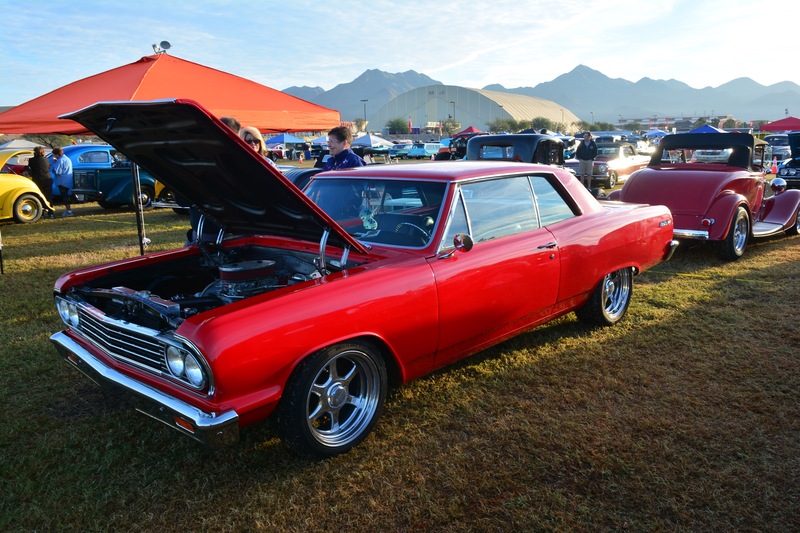 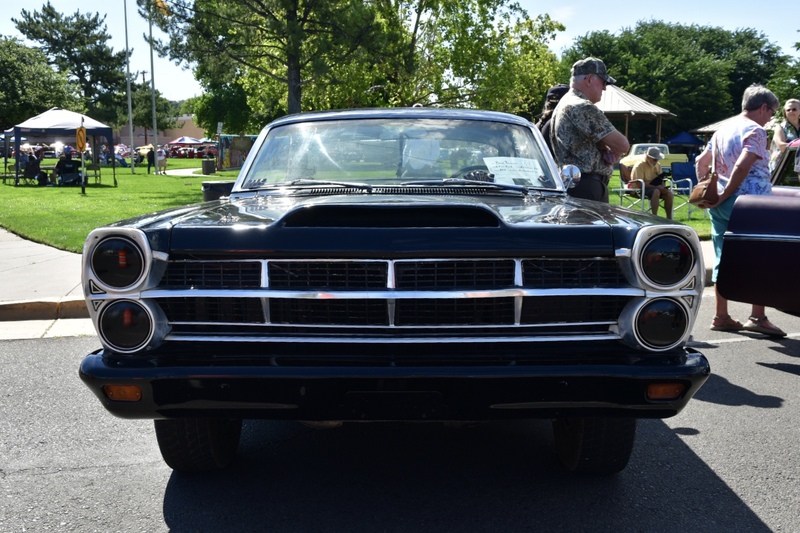 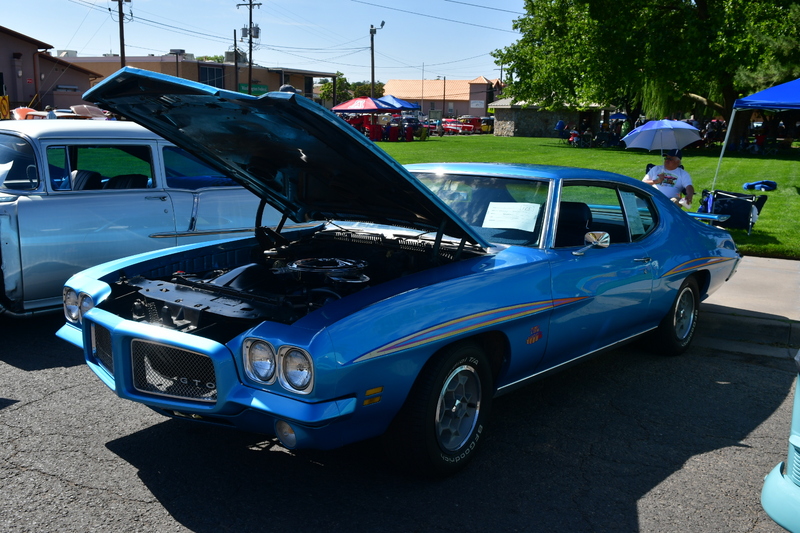 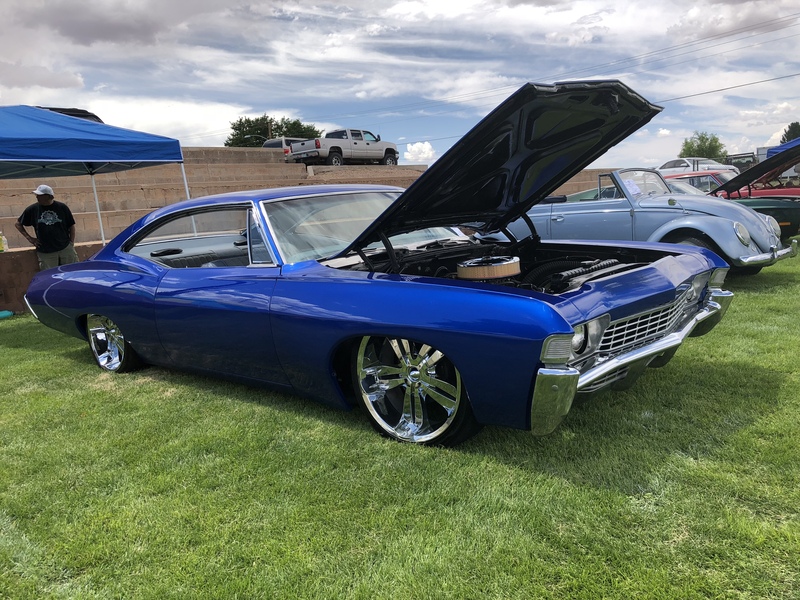 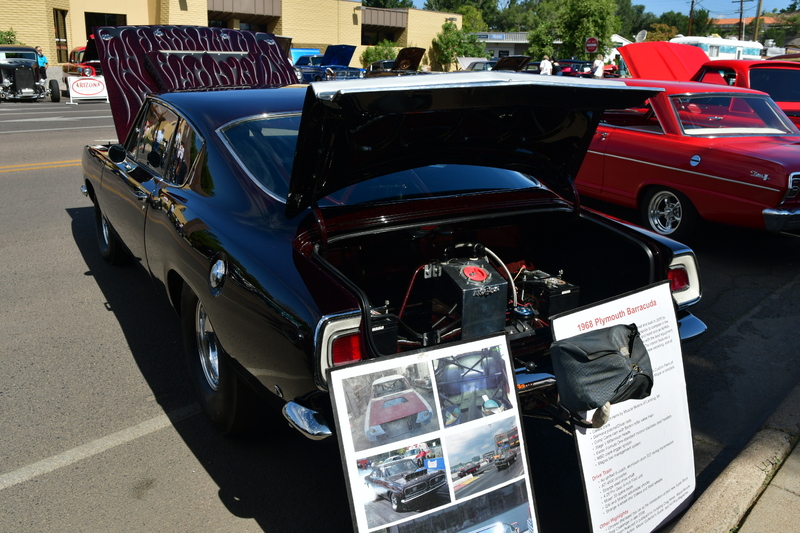 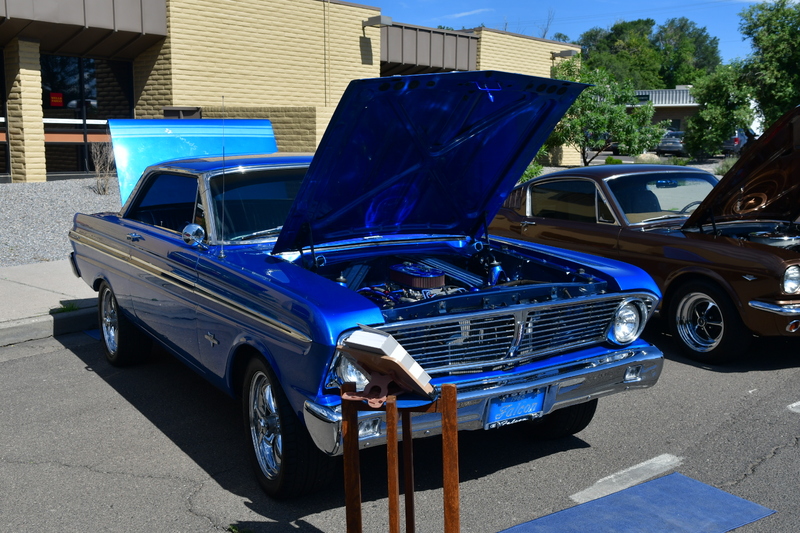 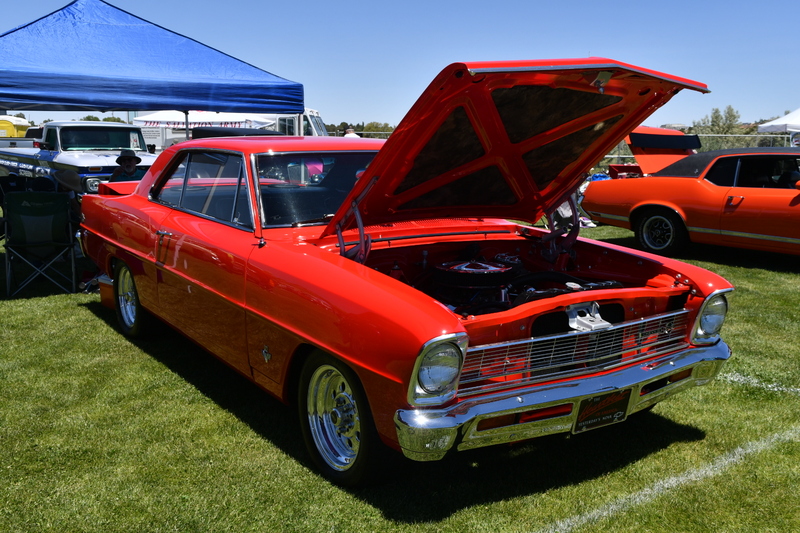 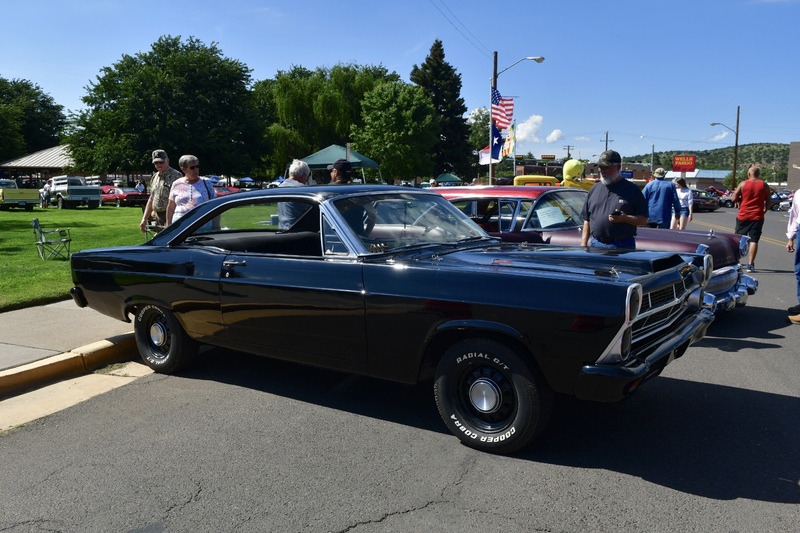 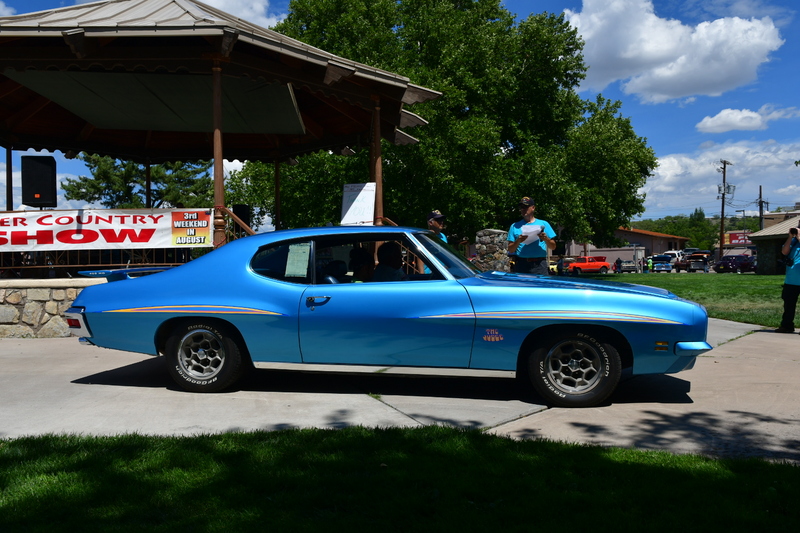 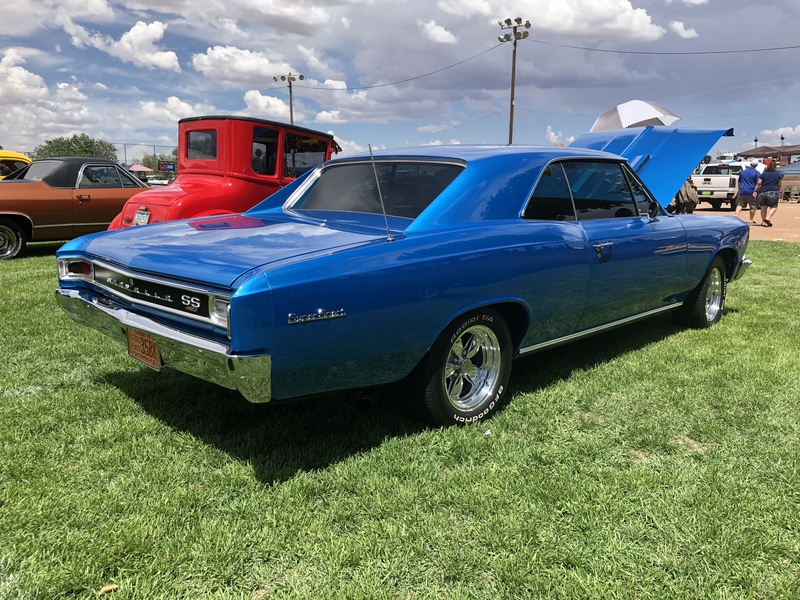 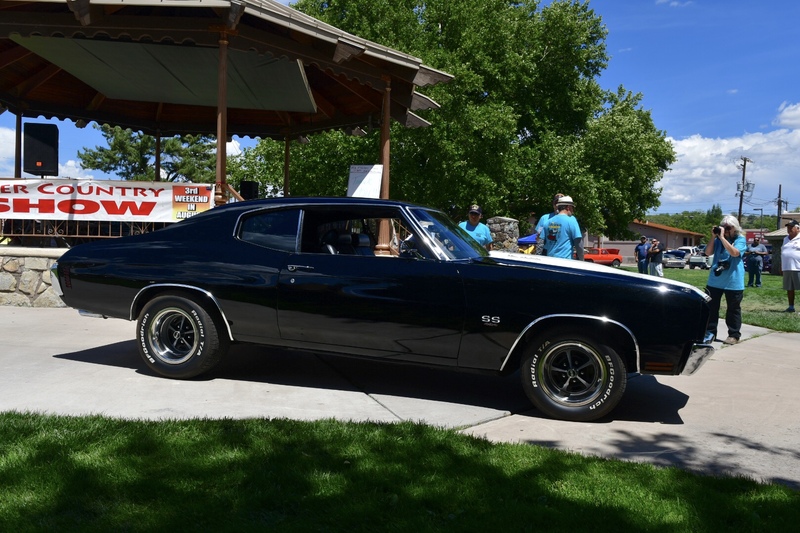 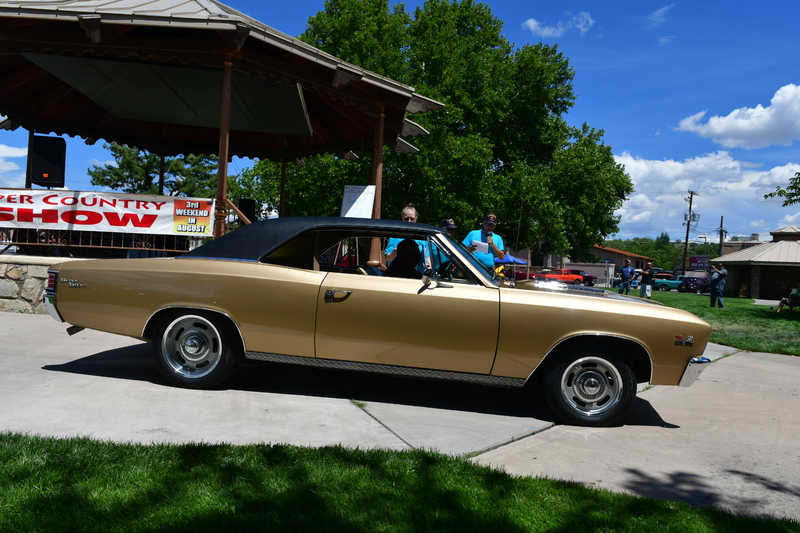 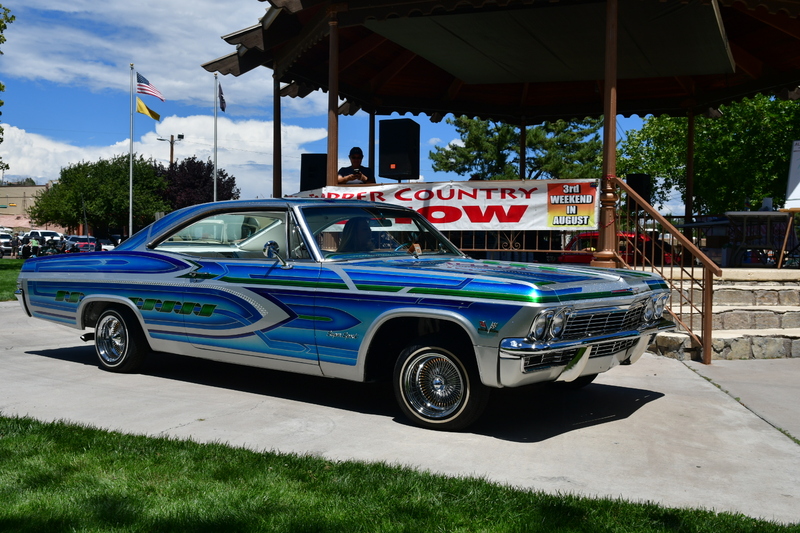 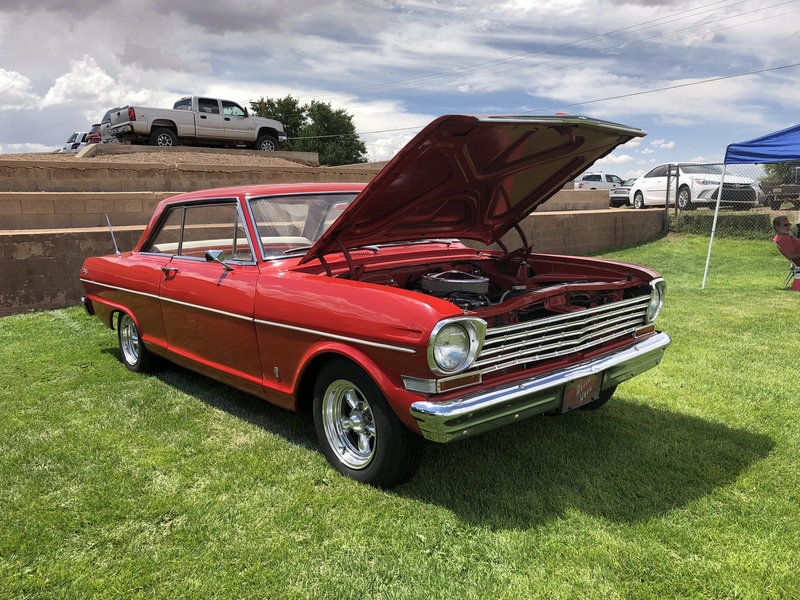 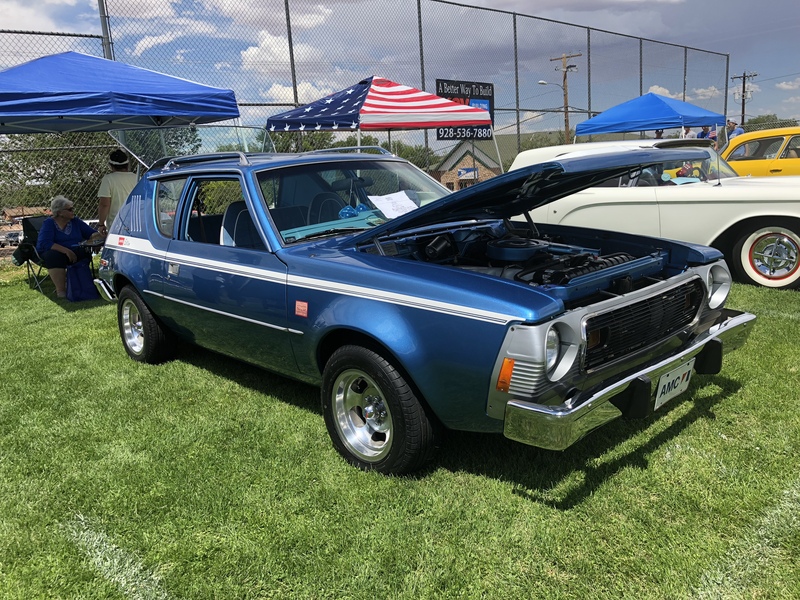 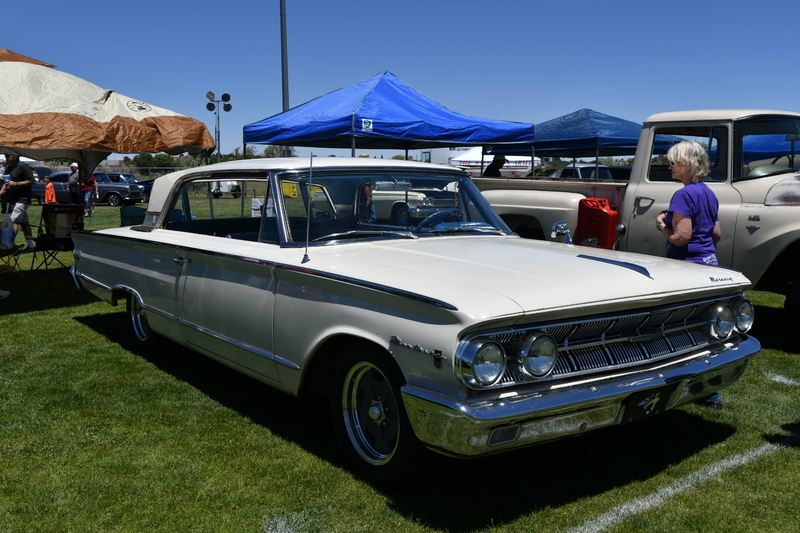 Also worthy of motion was a beautiful 1967 427 Malibu in a wonderful dark metallic blue. 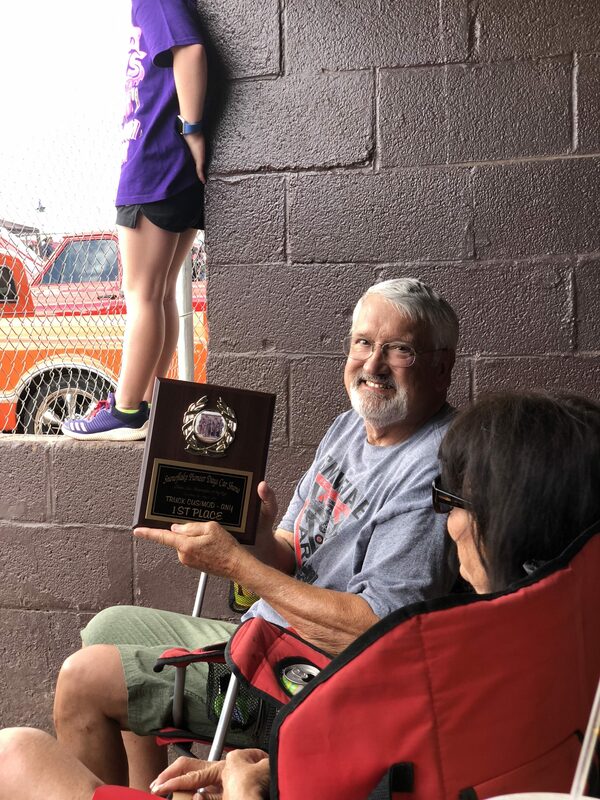 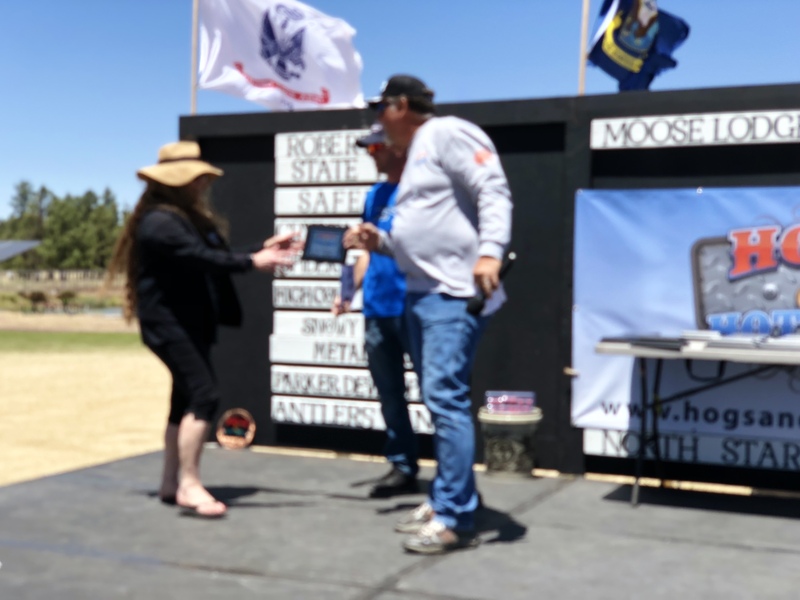 This year we are back in a normal monsoon weather pattern and by 2:30 the clouds started building in and the award ceremony came to an end. 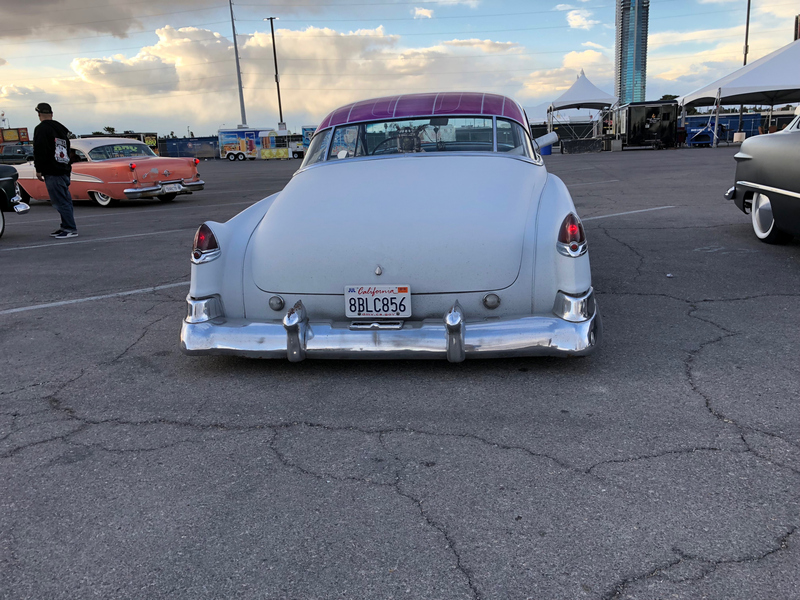 We made it home in time to miss most of the rain. 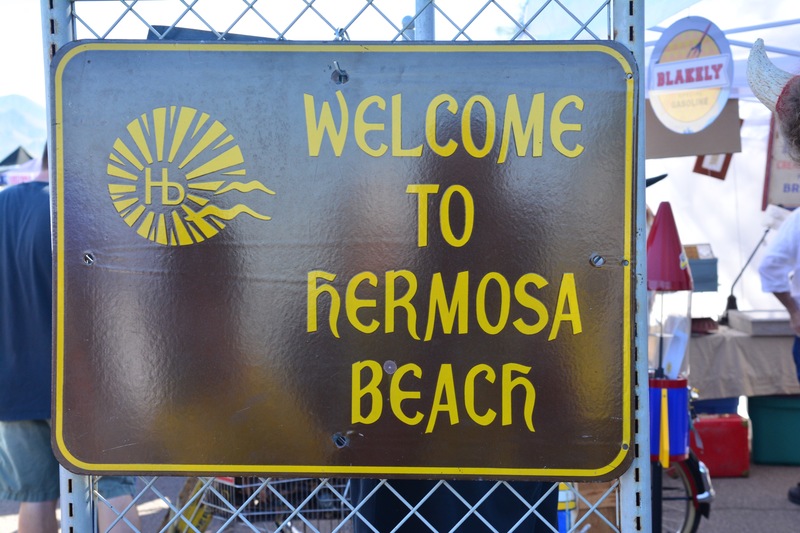 Keep safe and enjoy what is left of summer! 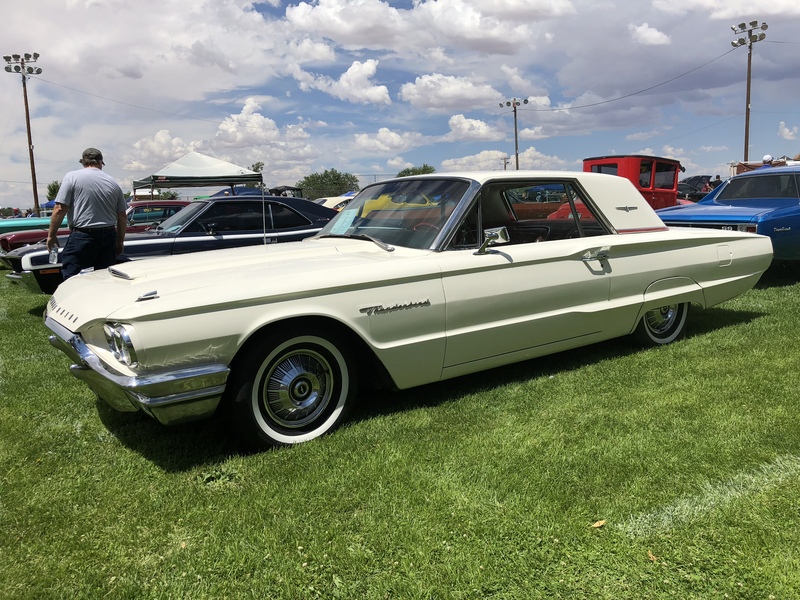 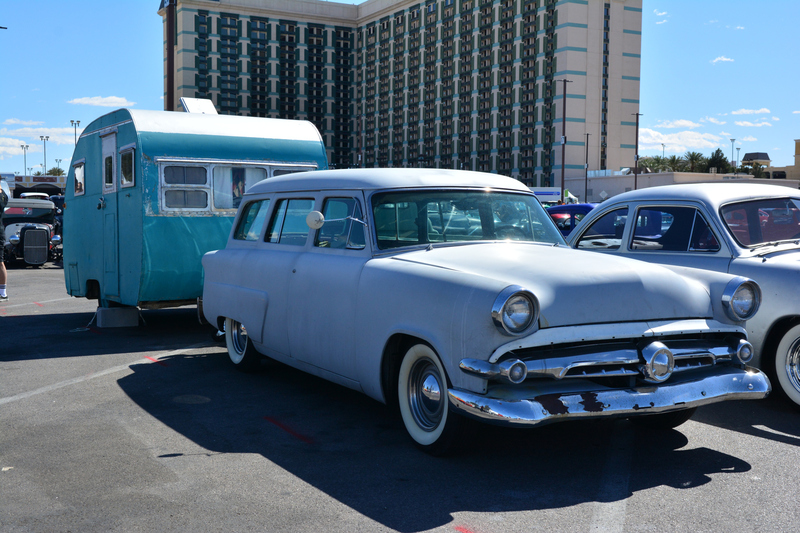 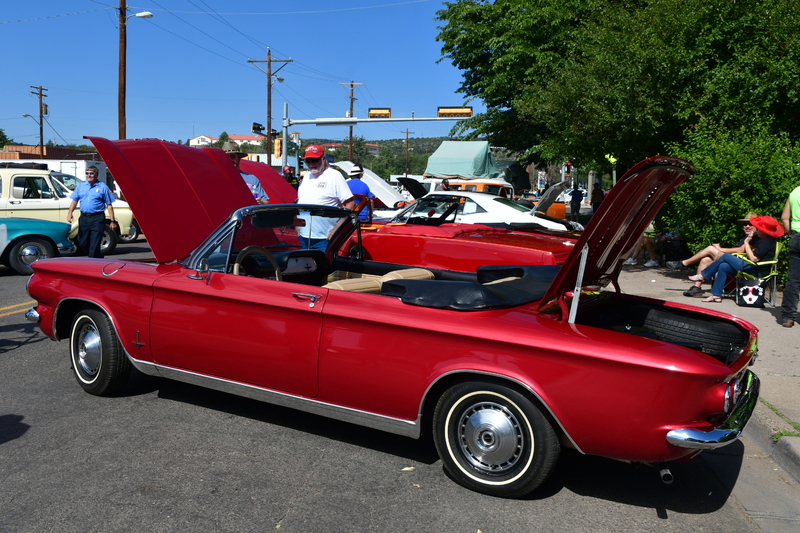 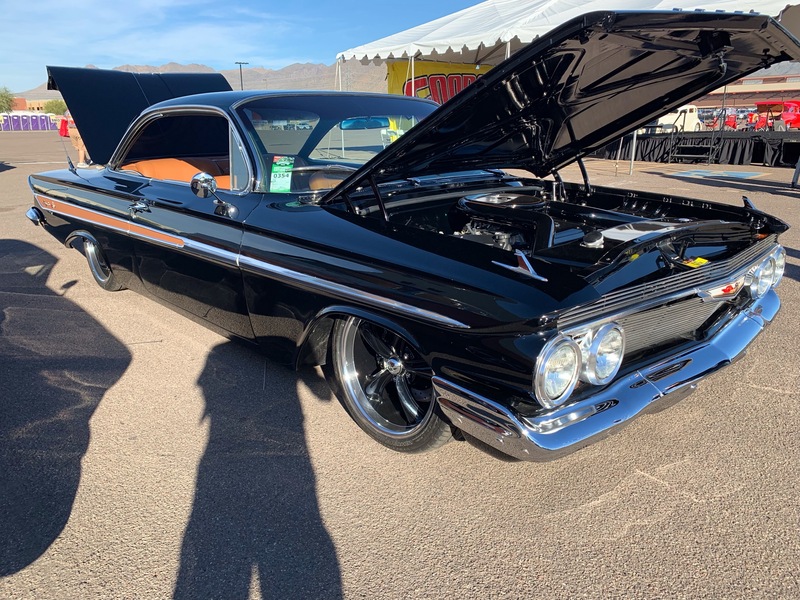 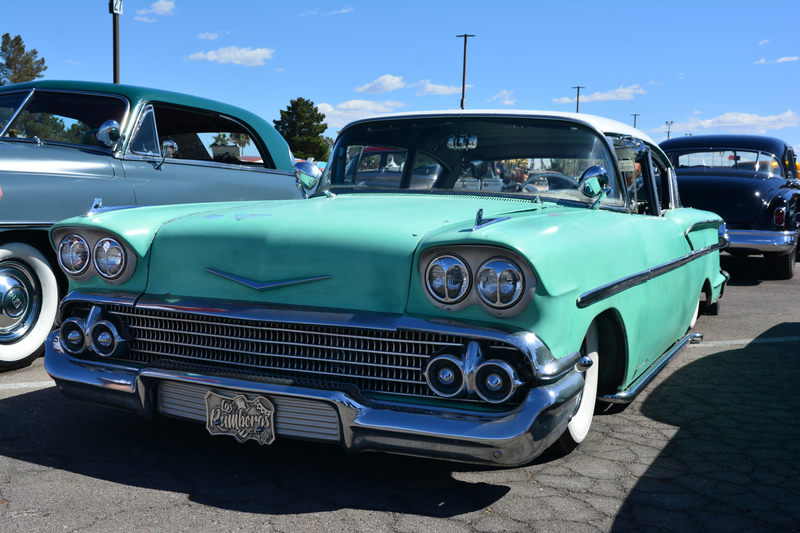 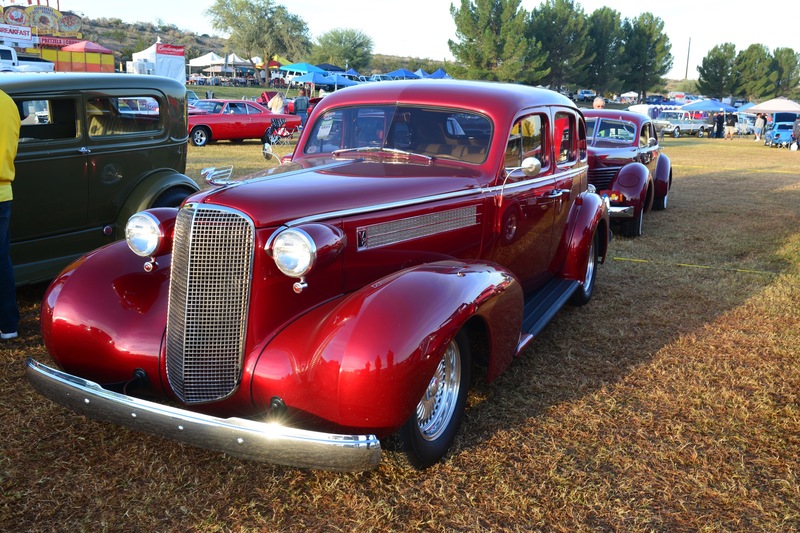 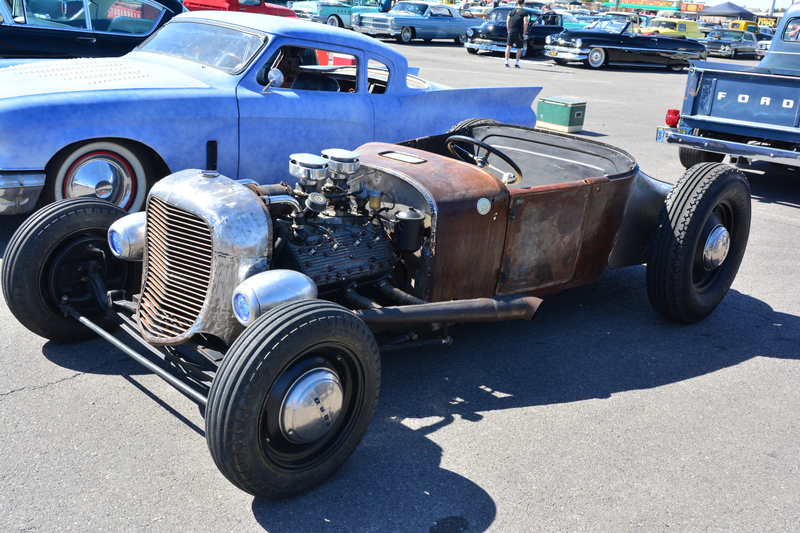 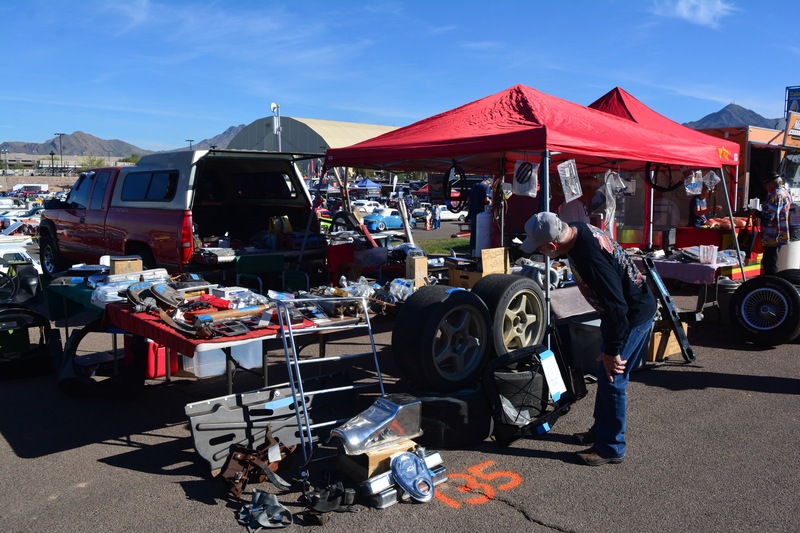 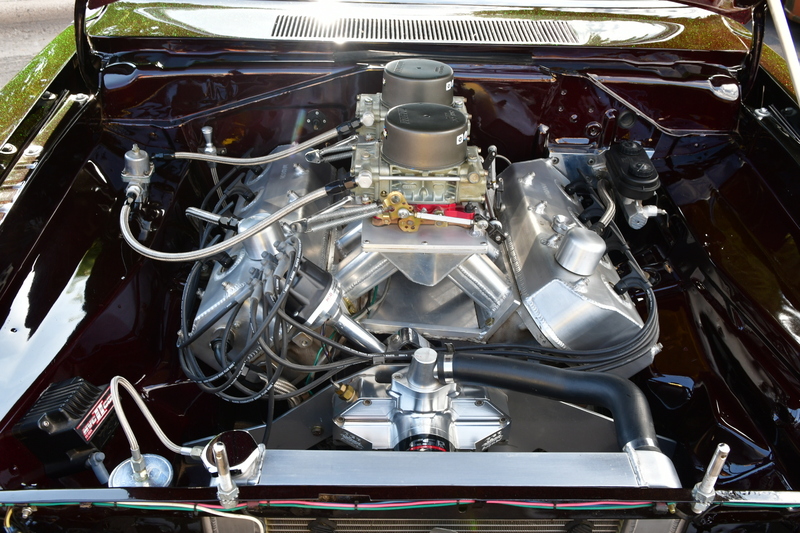 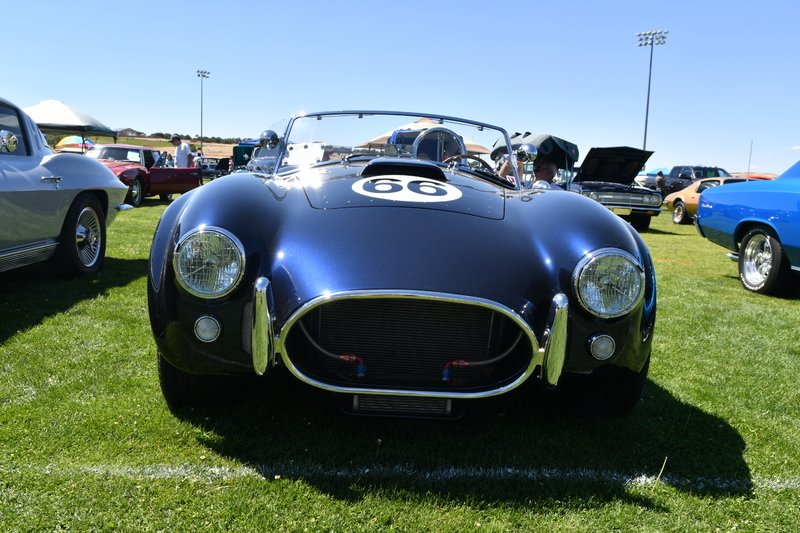 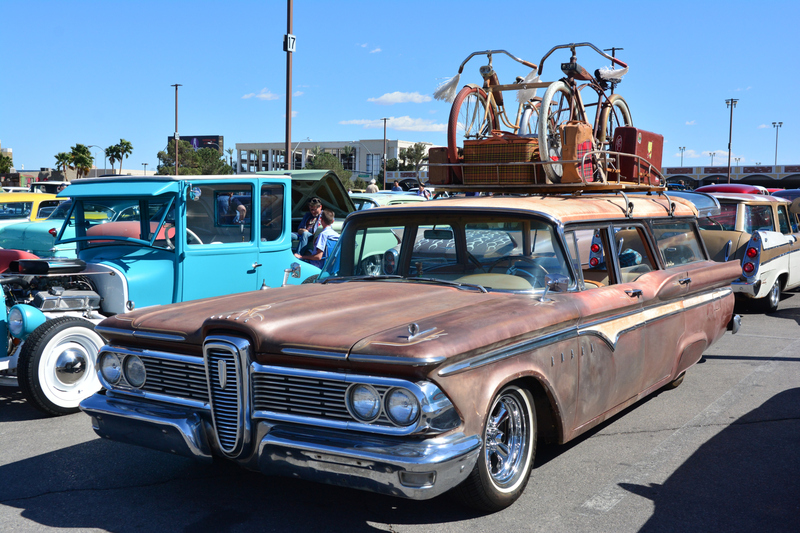 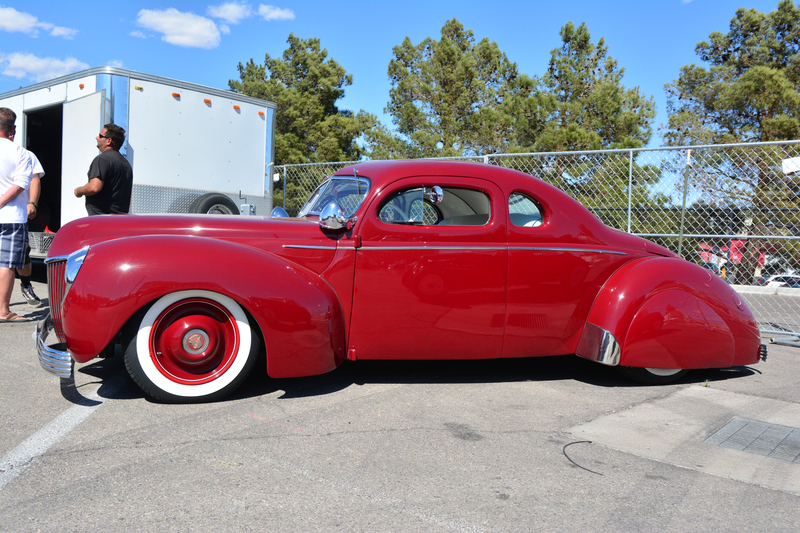 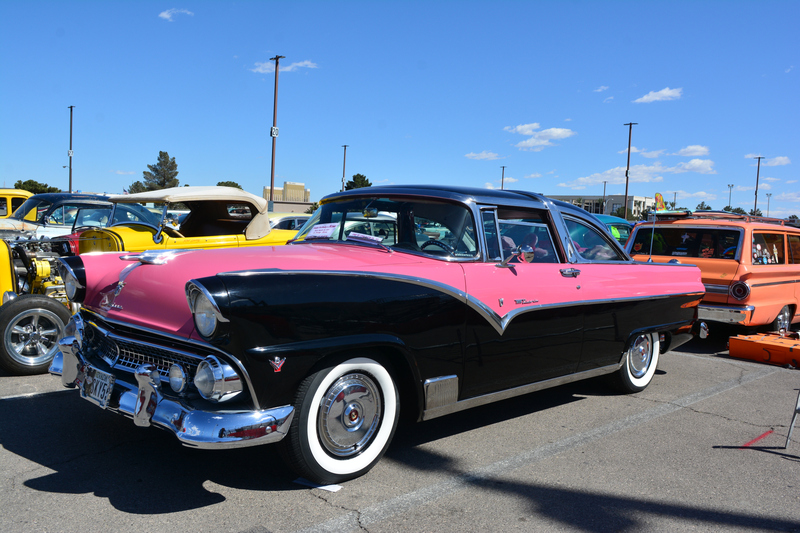 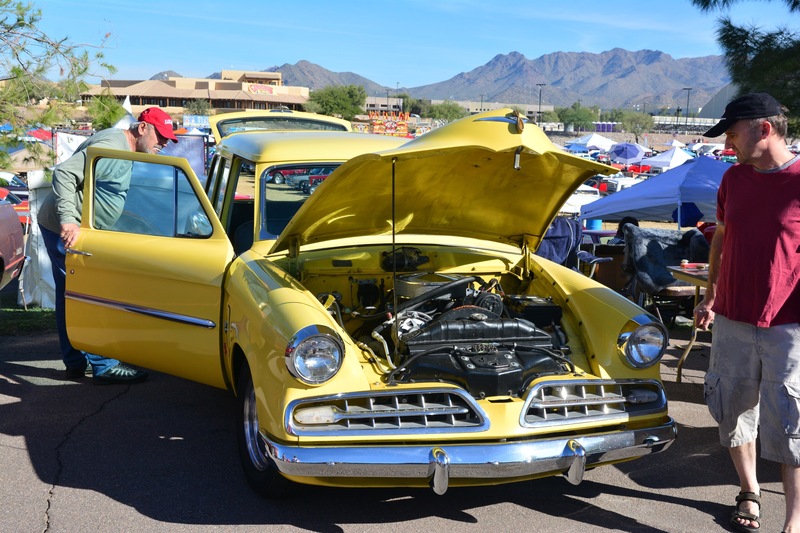 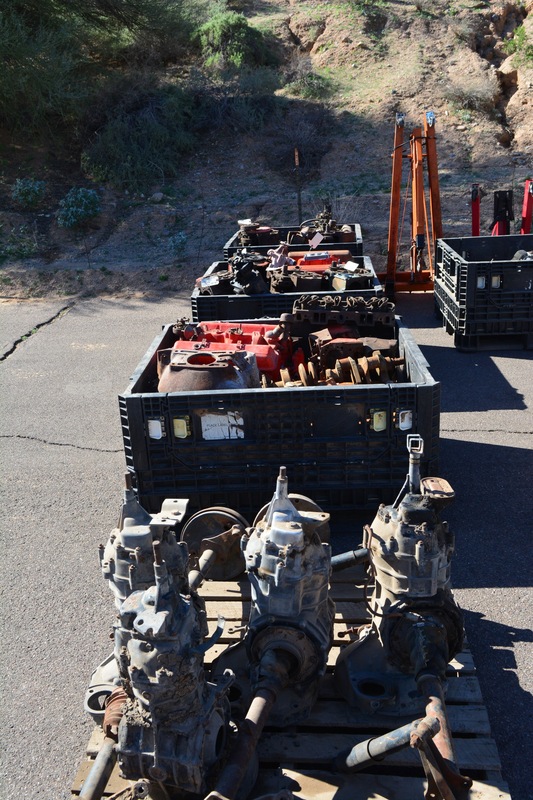 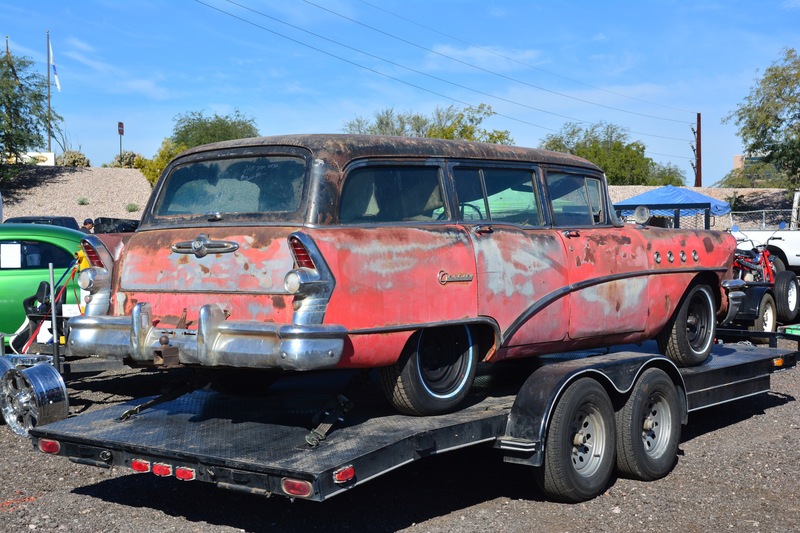 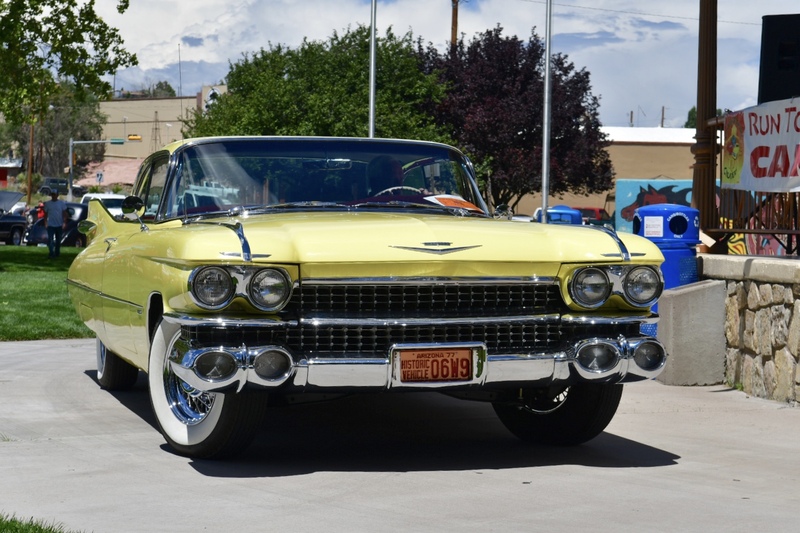 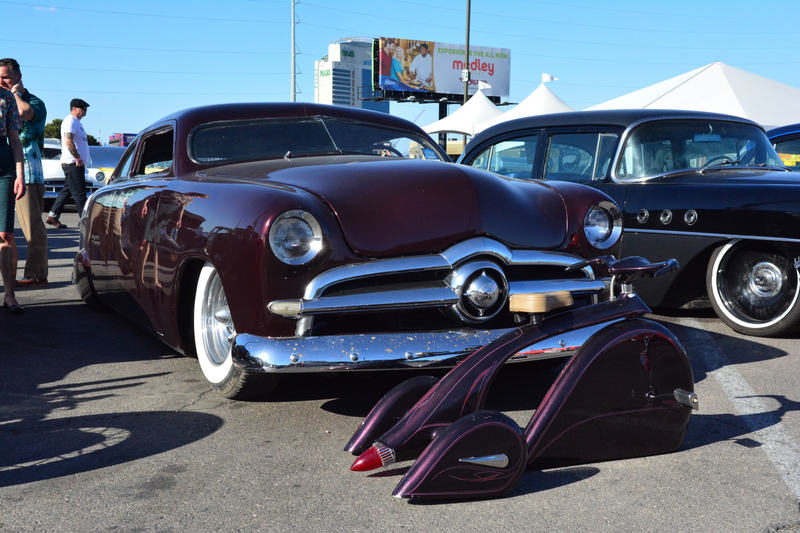 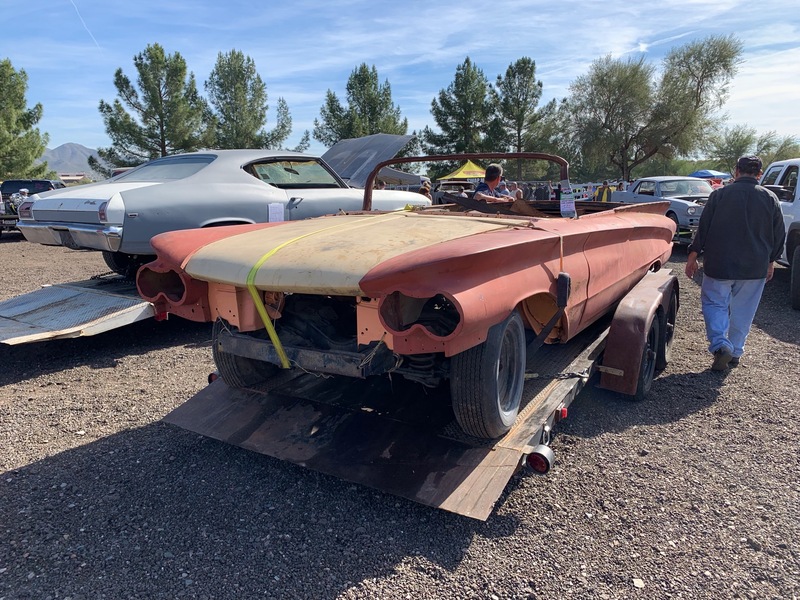 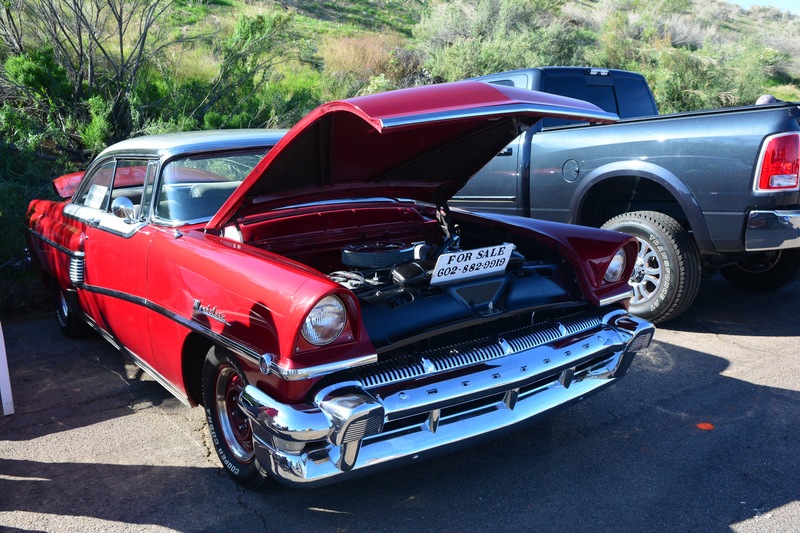 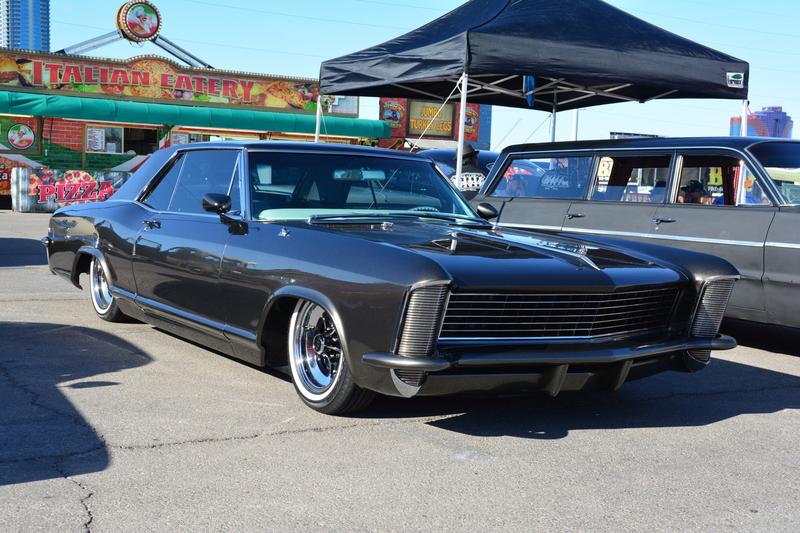 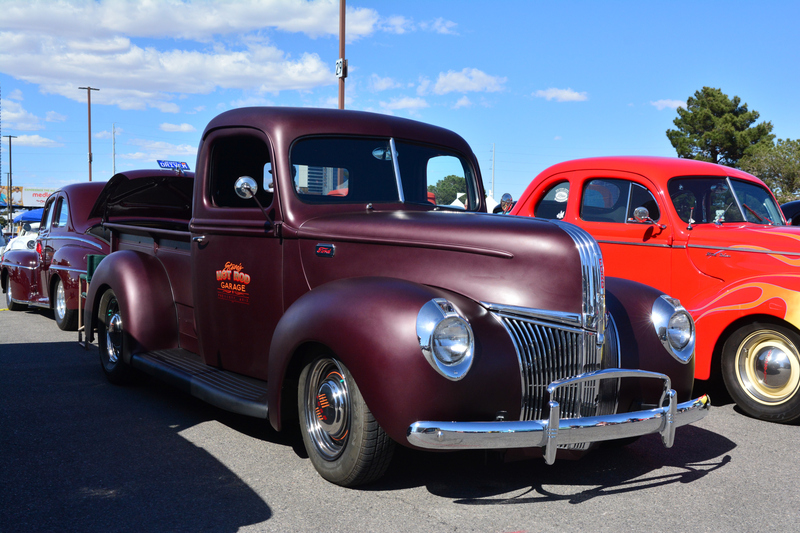 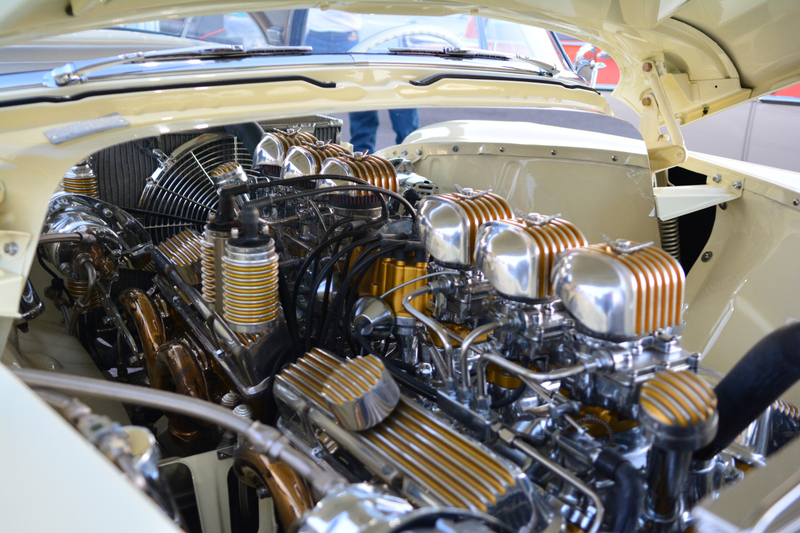 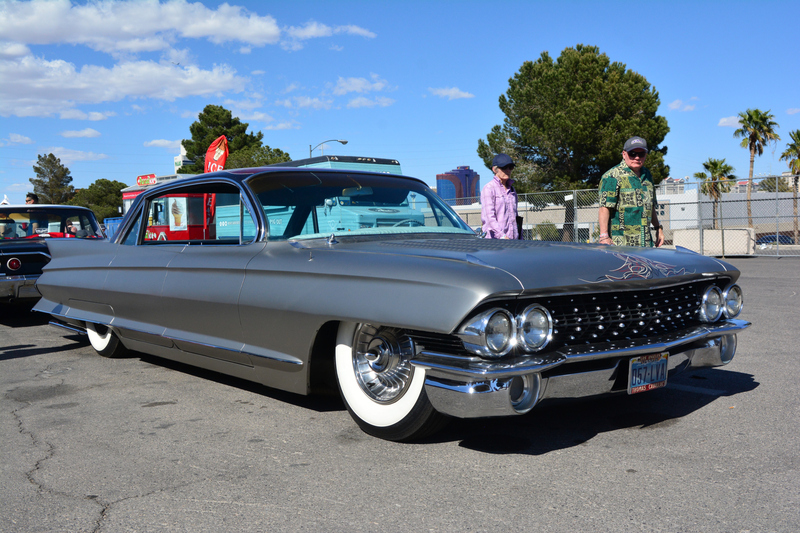 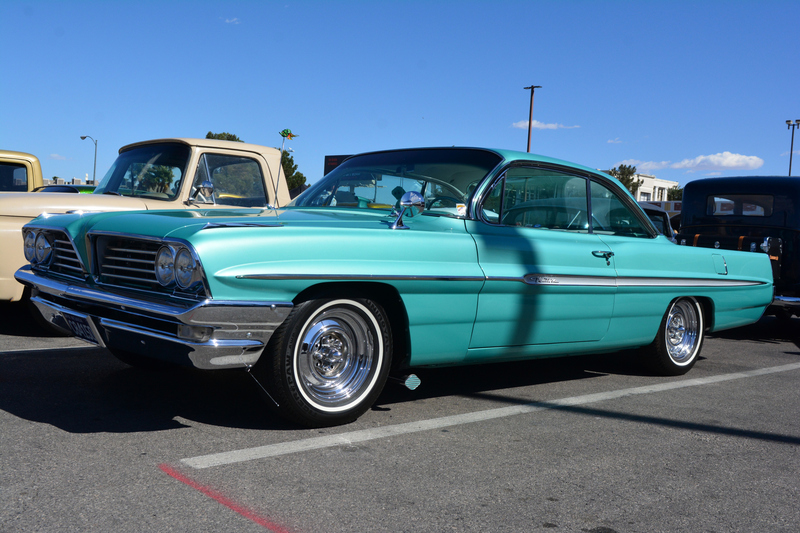 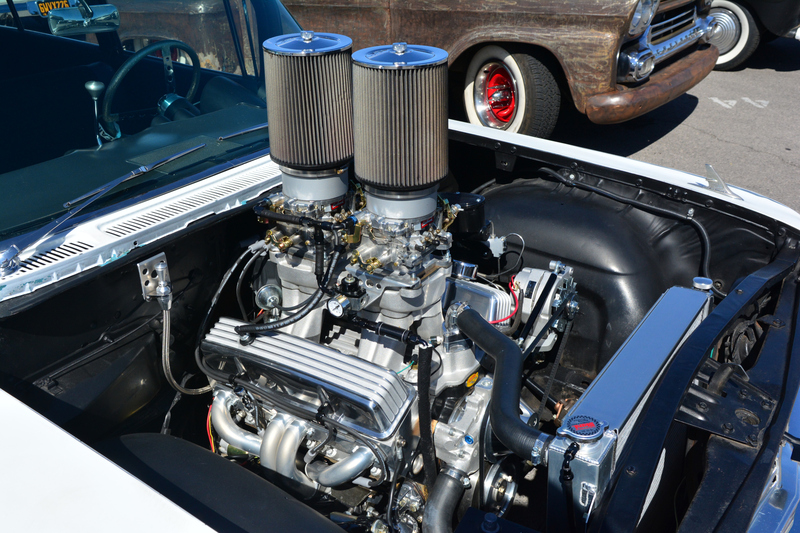 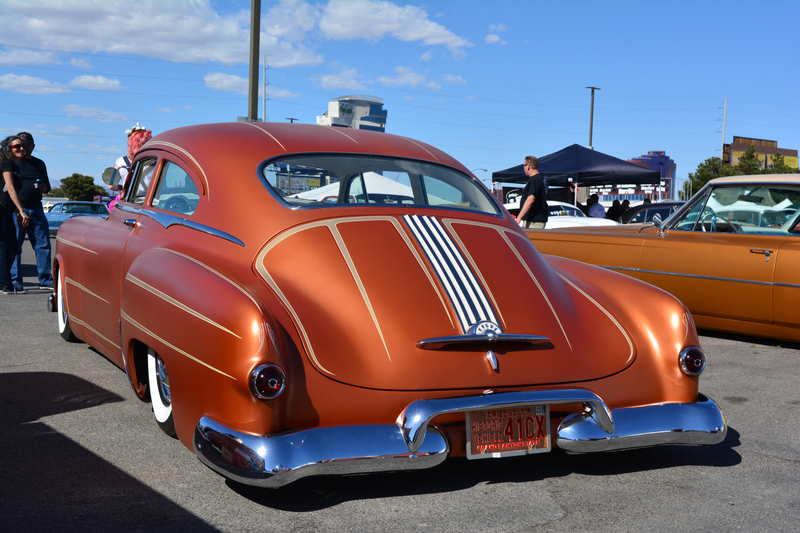 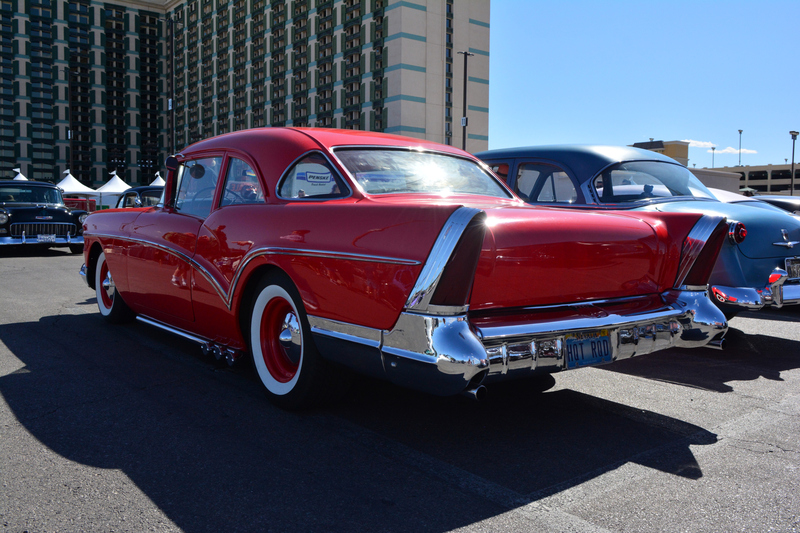 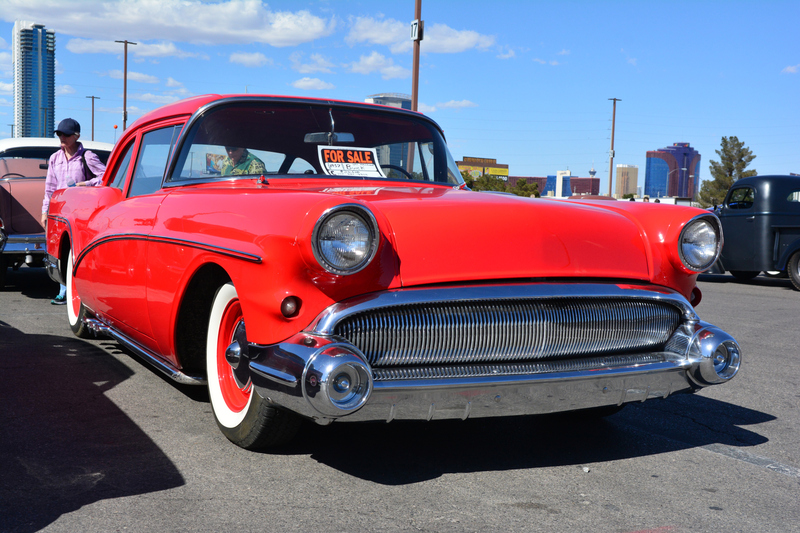 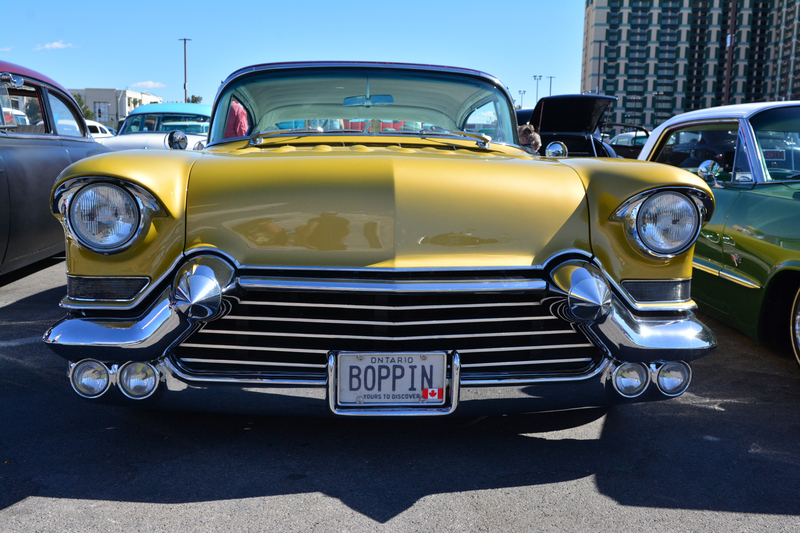 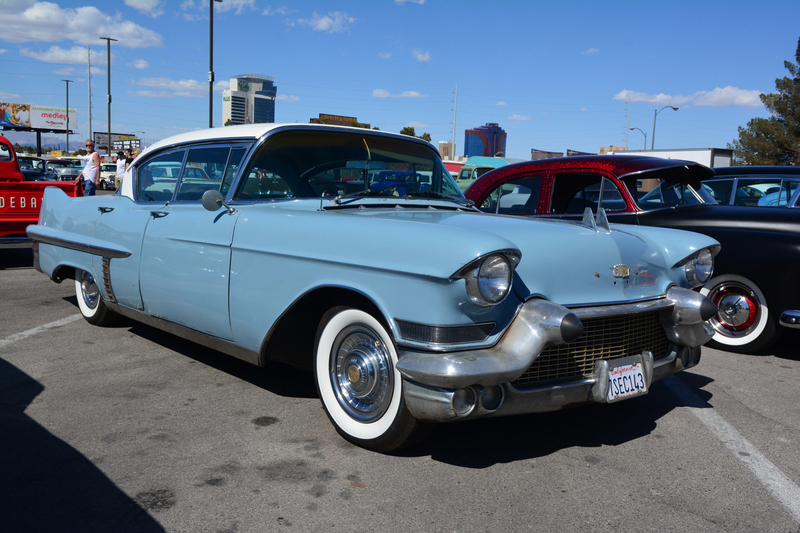 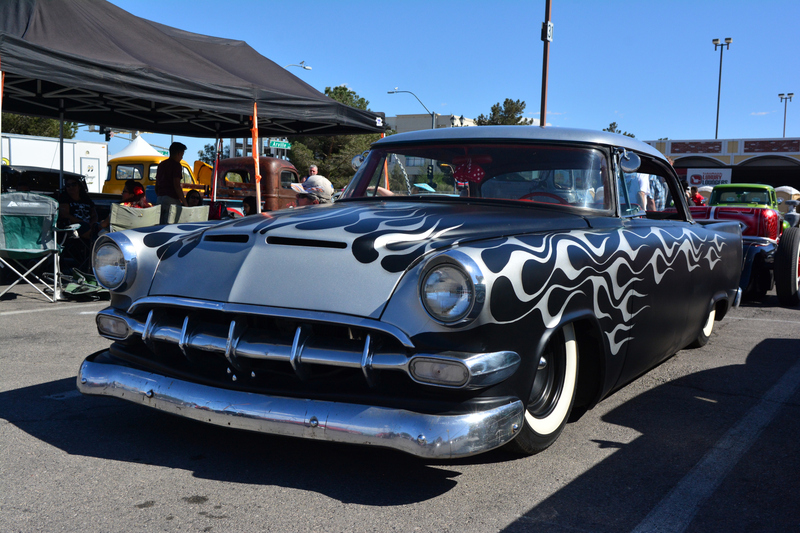 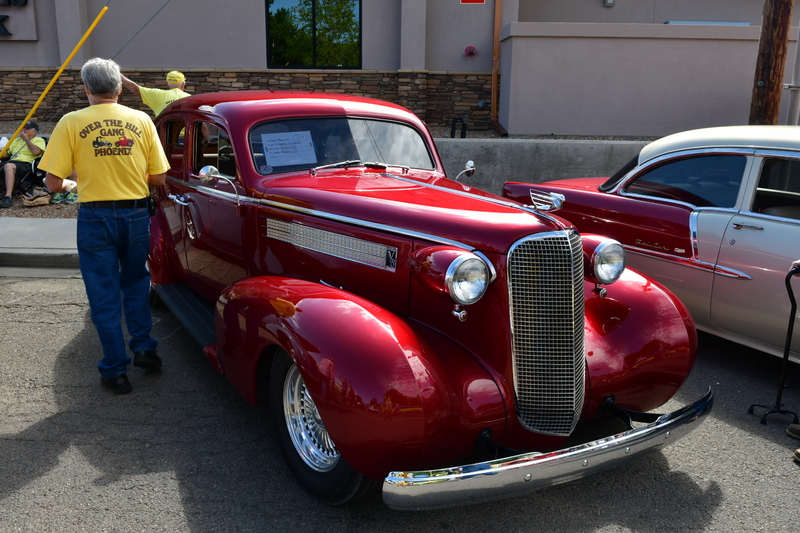 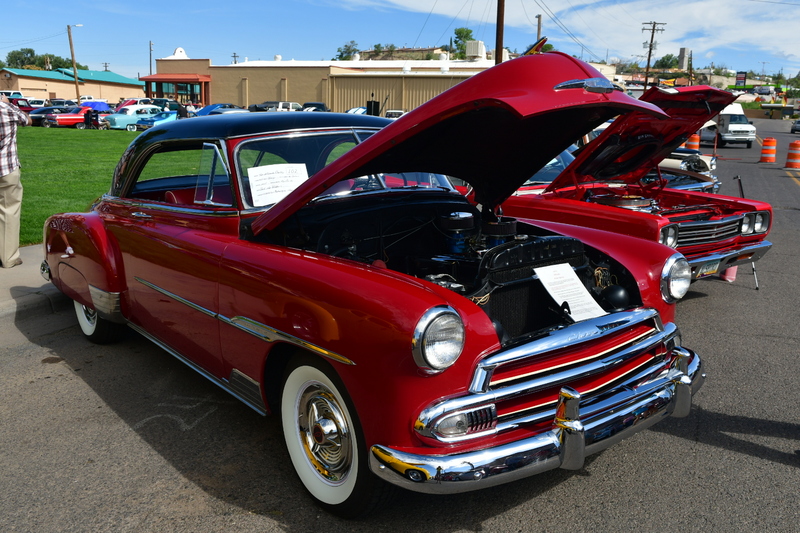 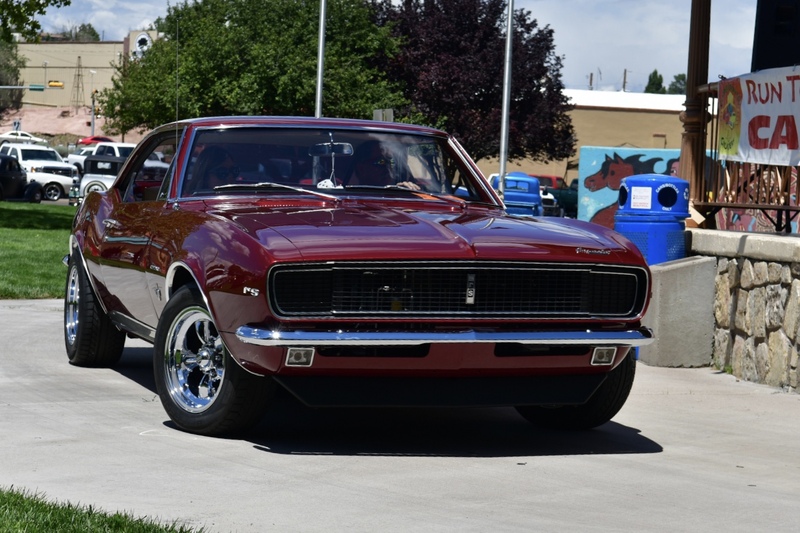 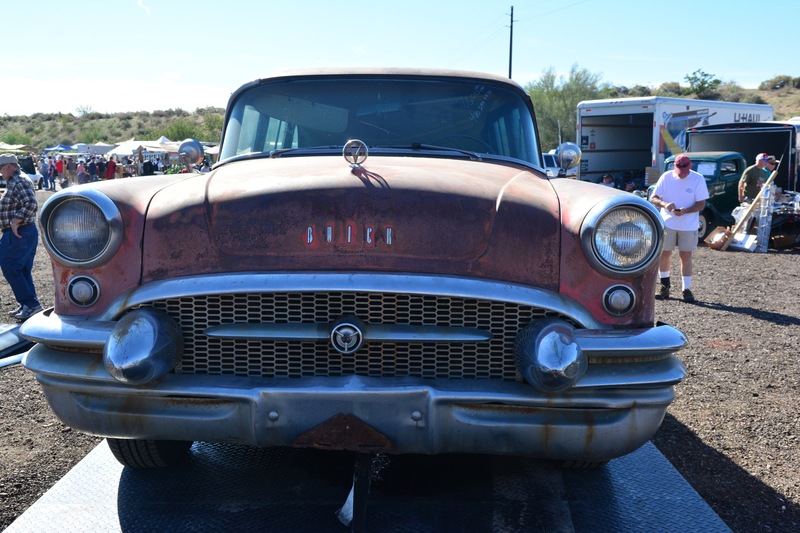 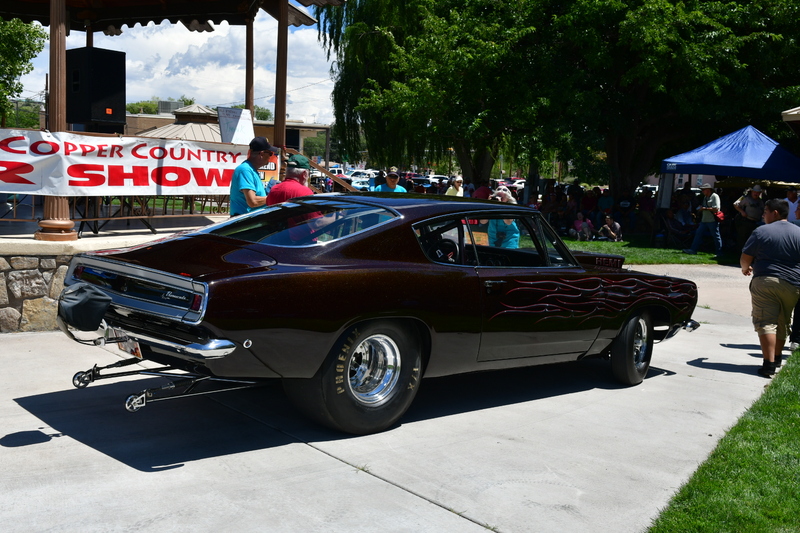 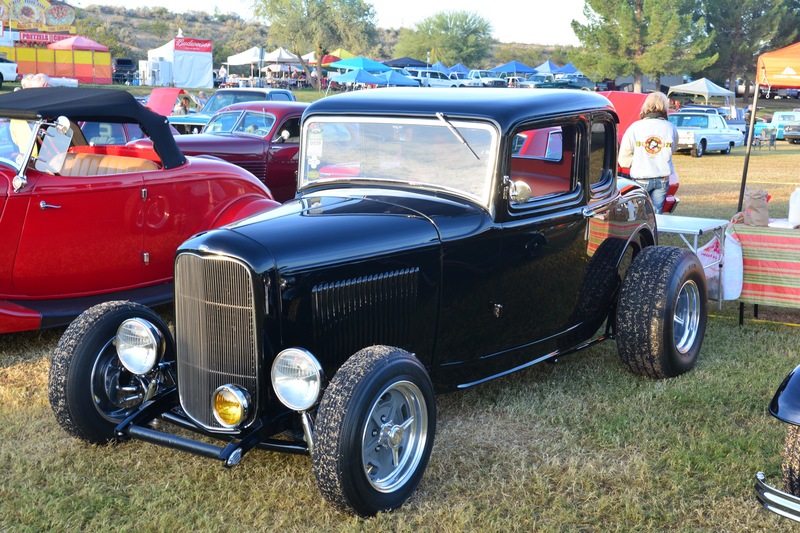 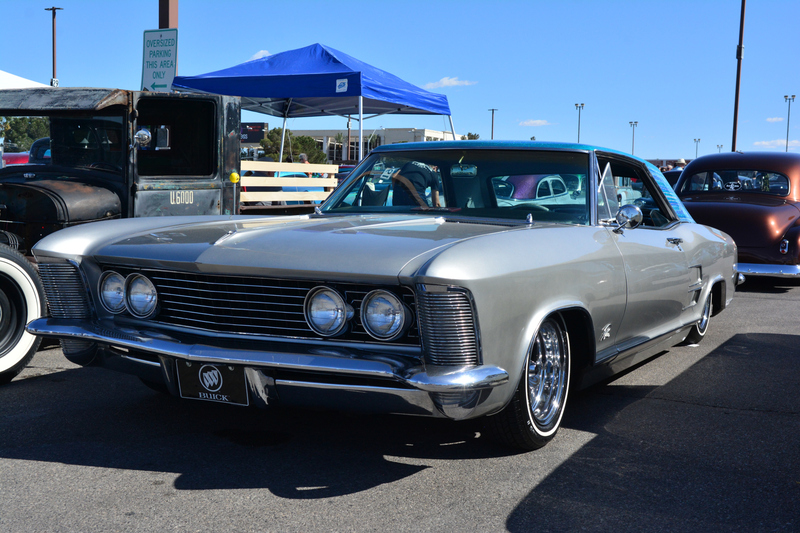 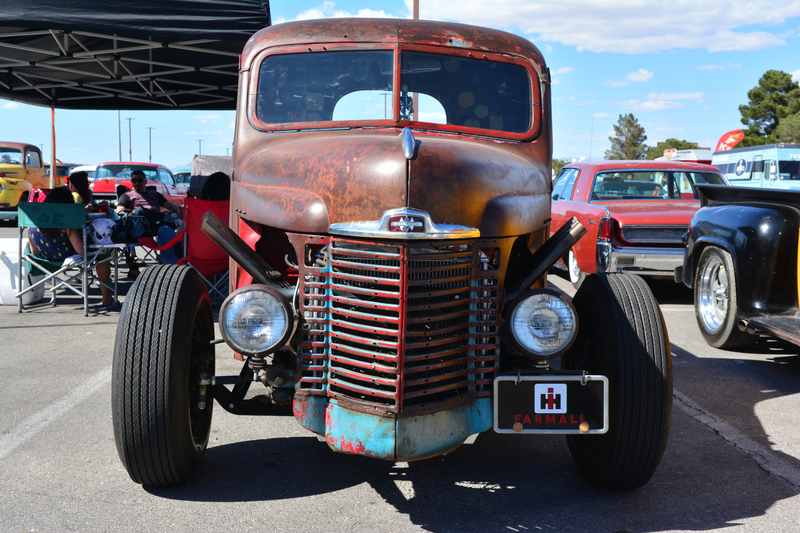 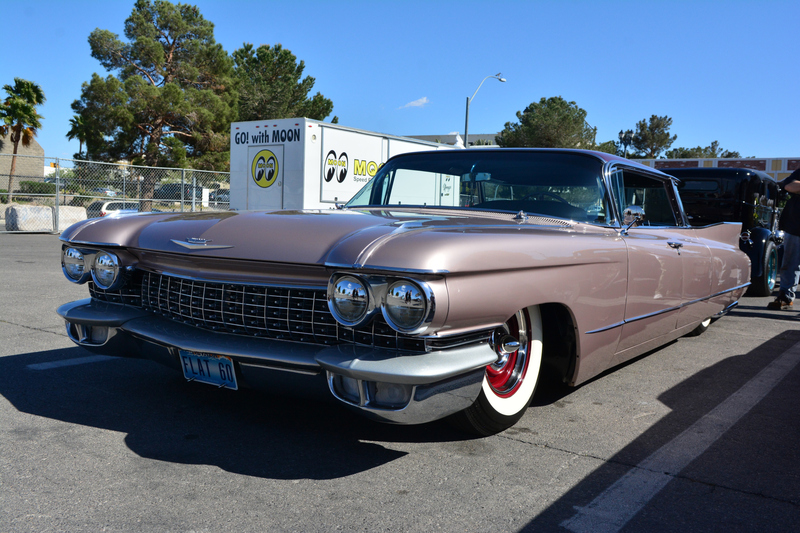 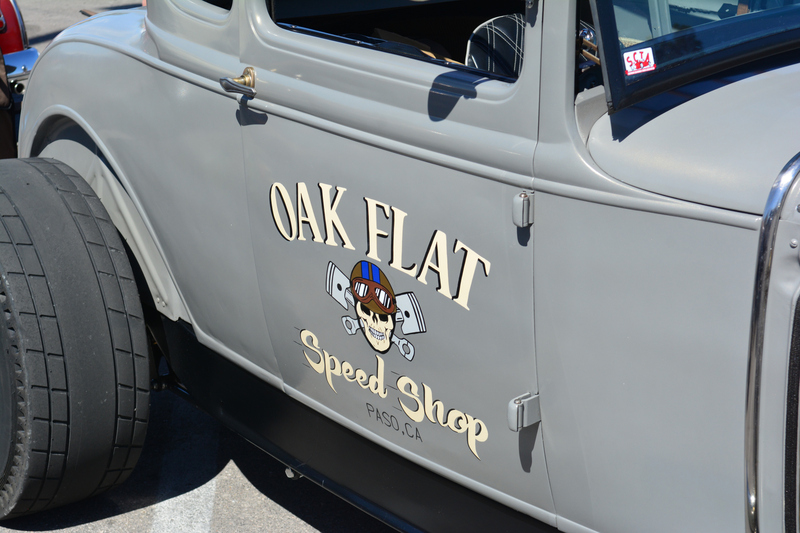 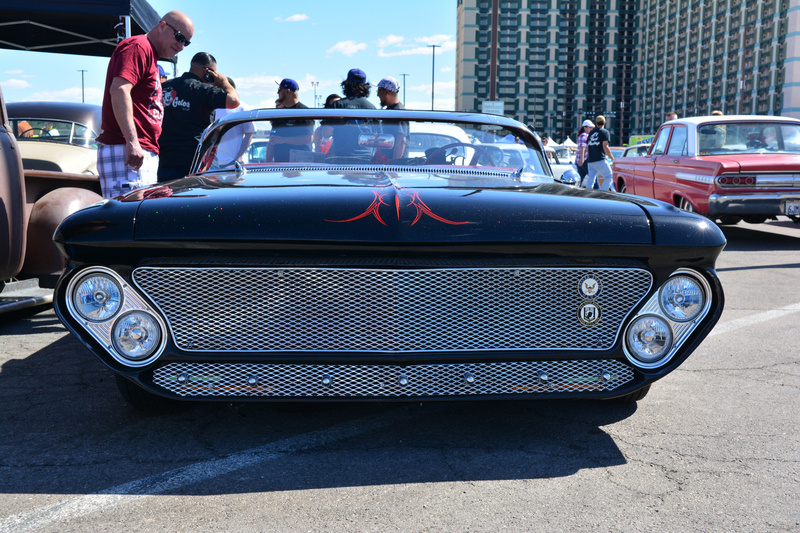 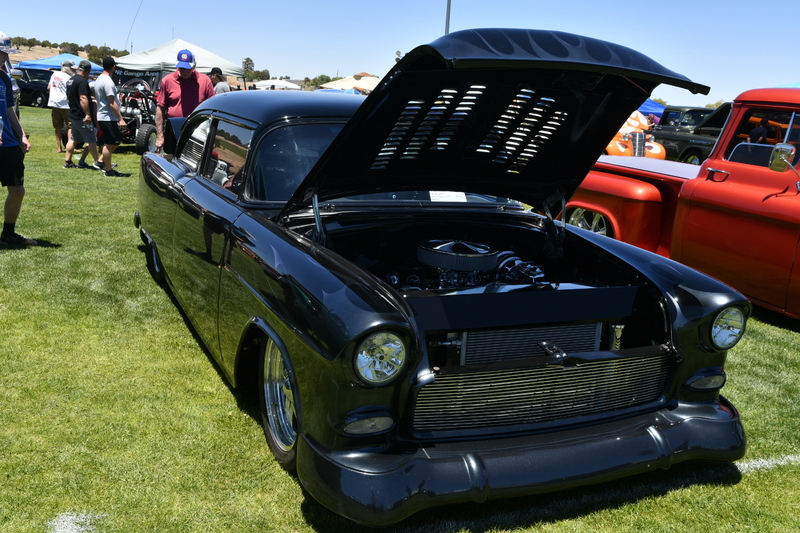 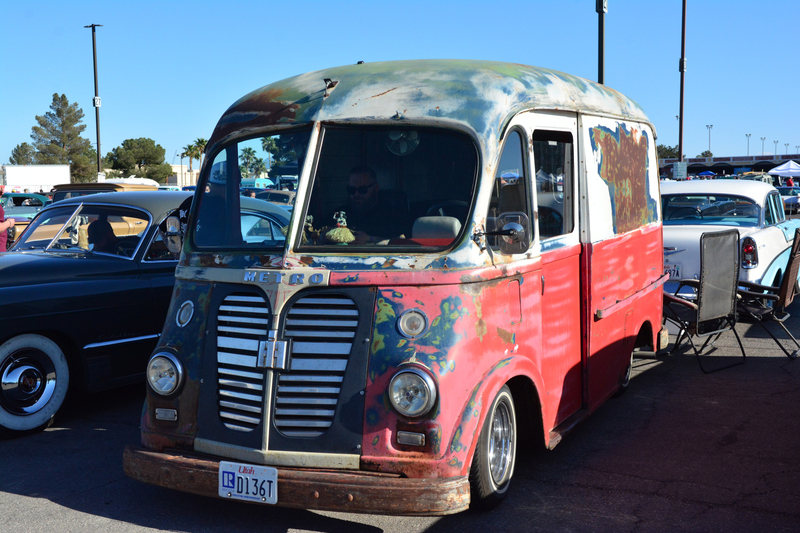 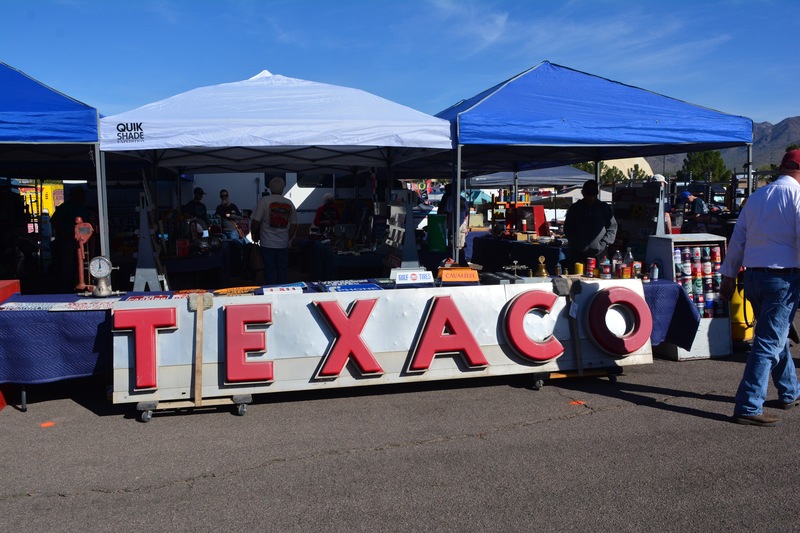 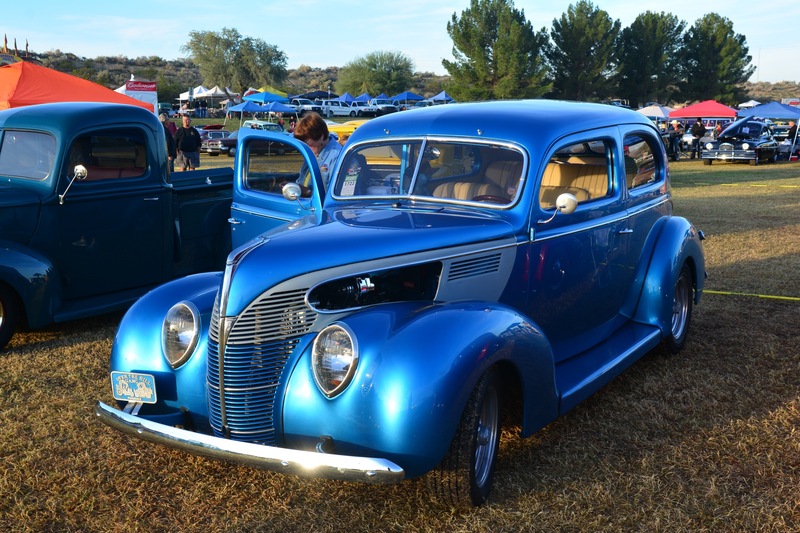 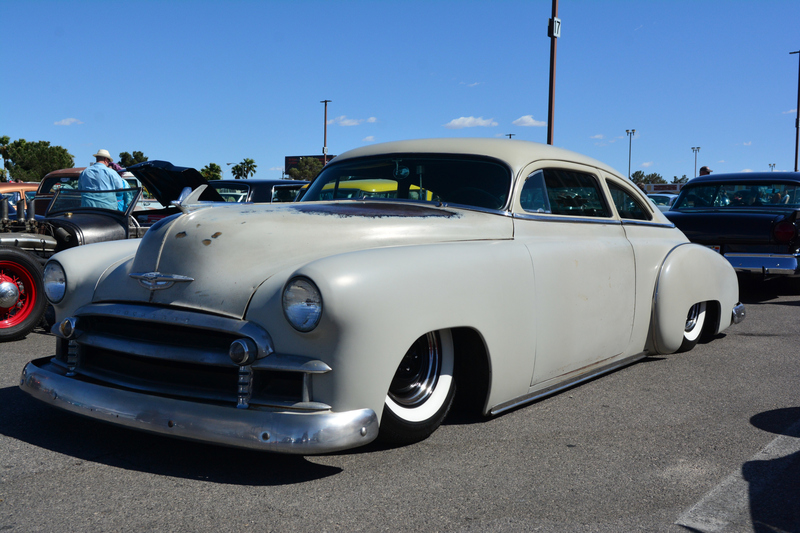 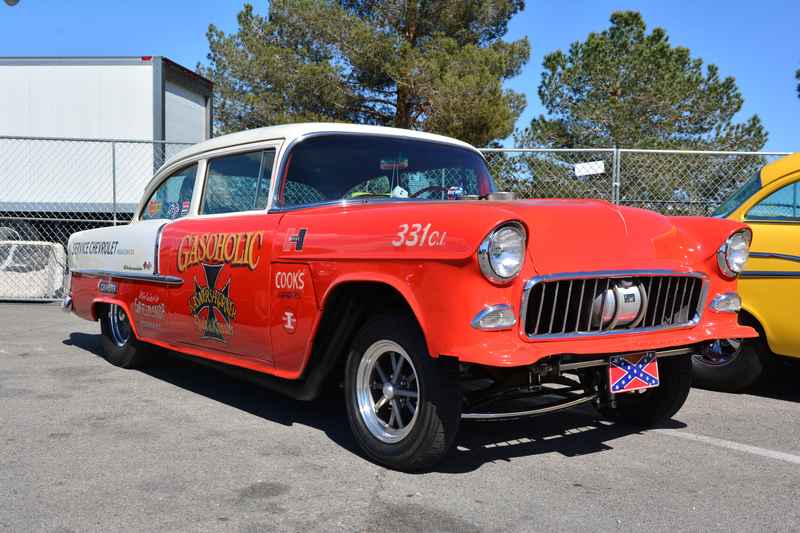 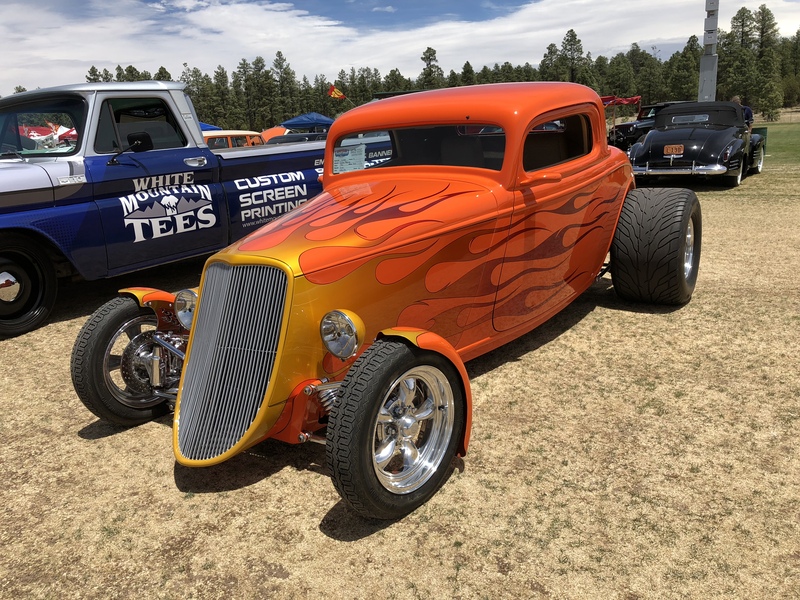 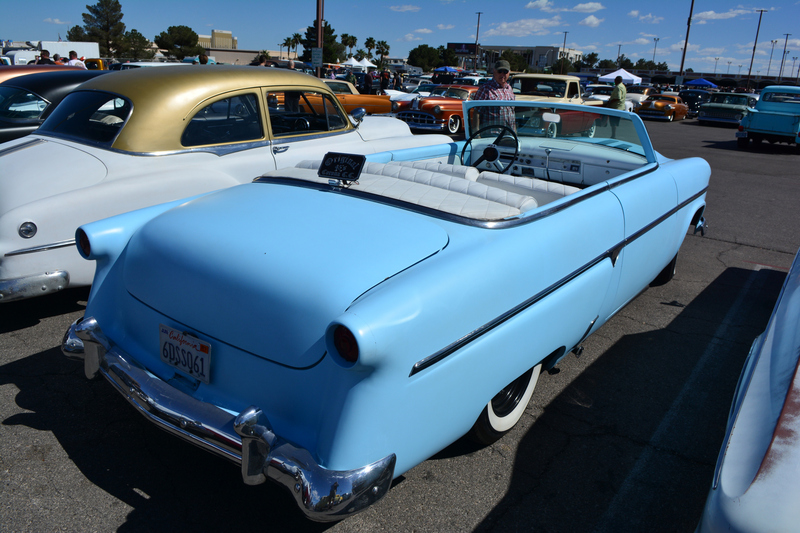 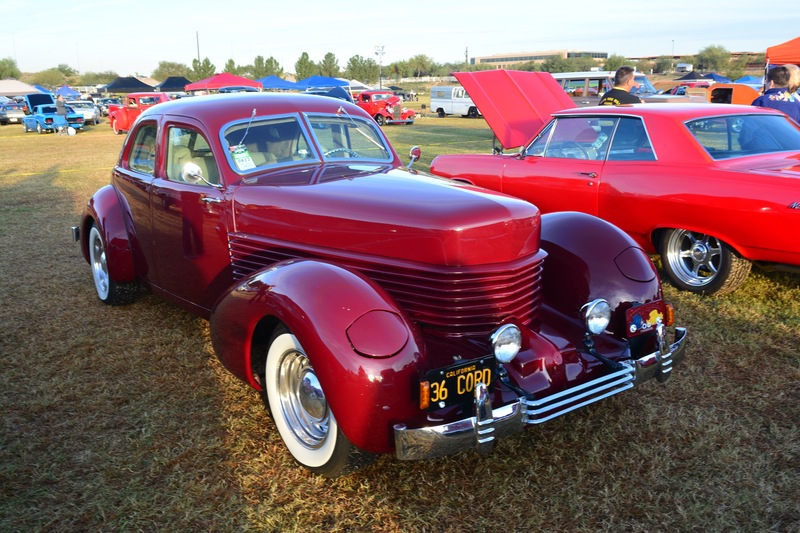 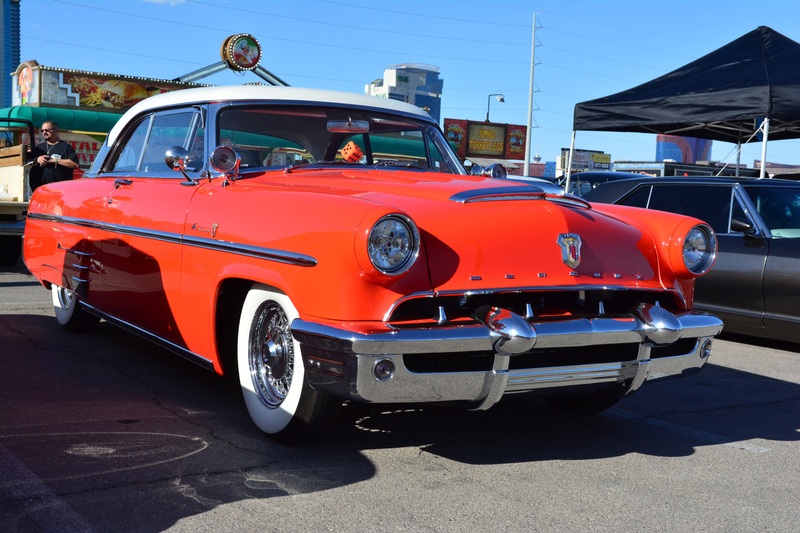 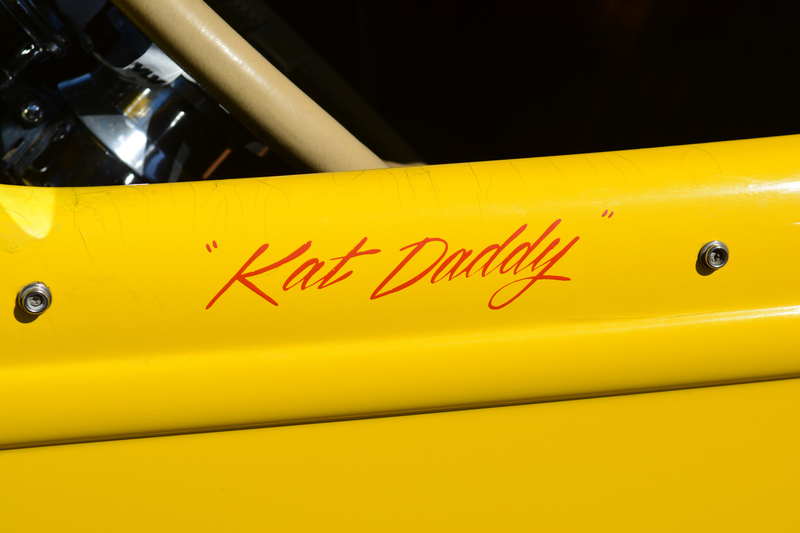 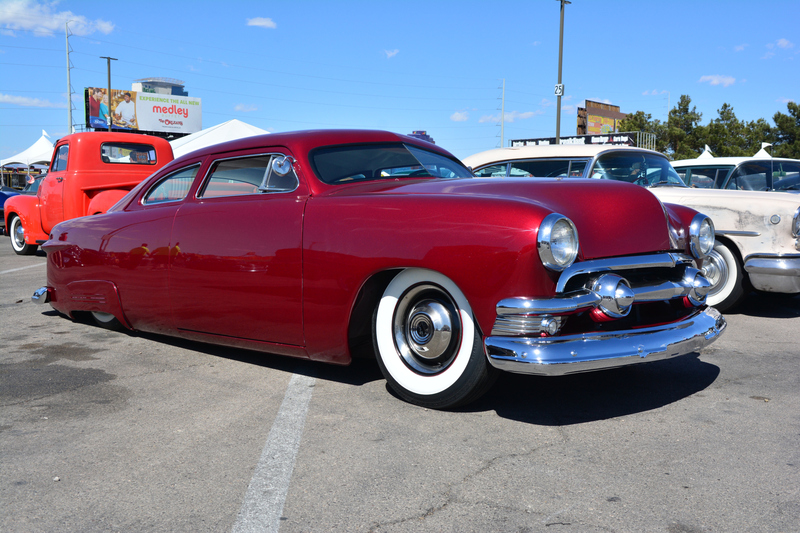 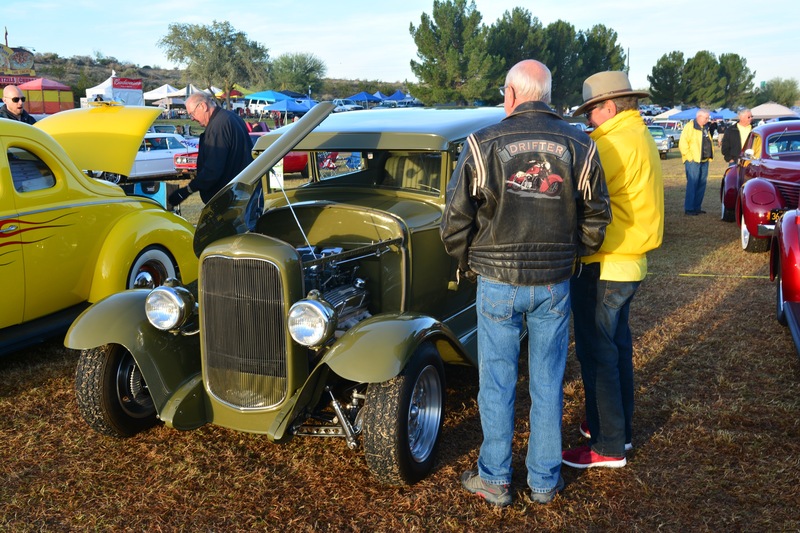 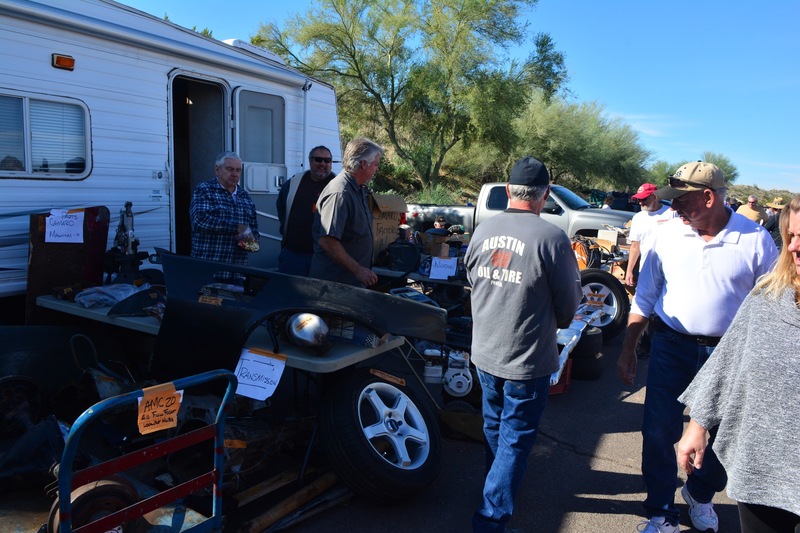 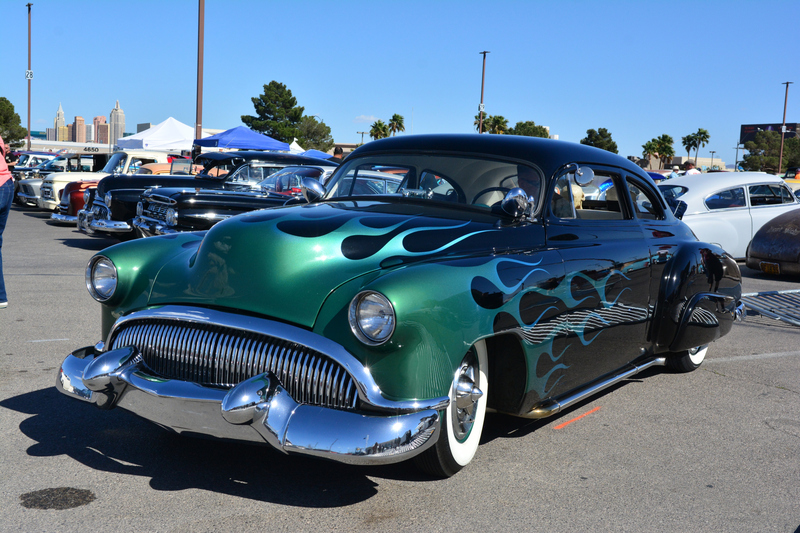 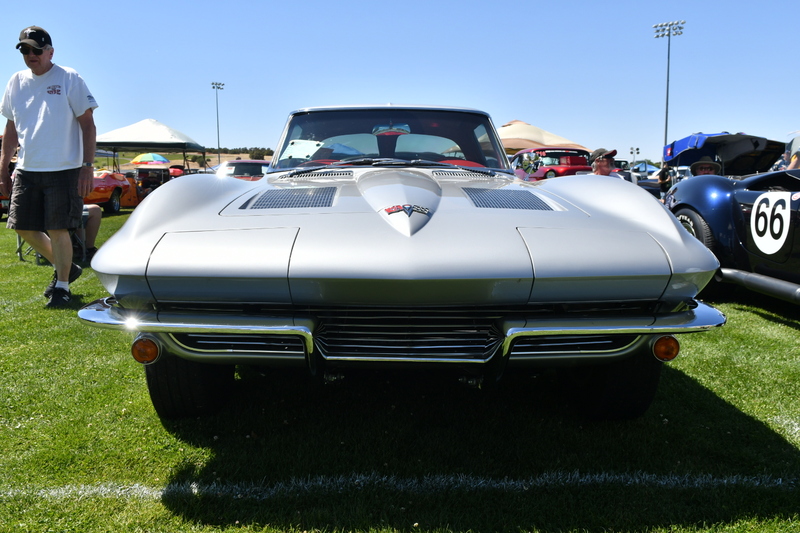 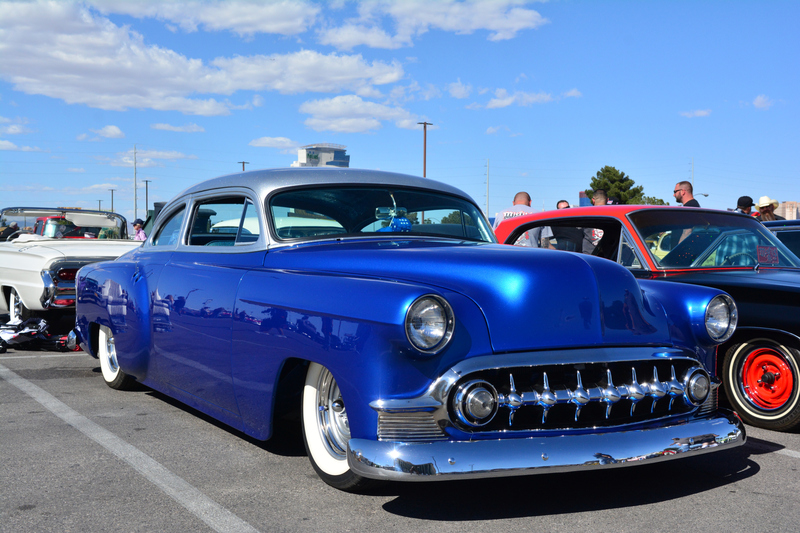 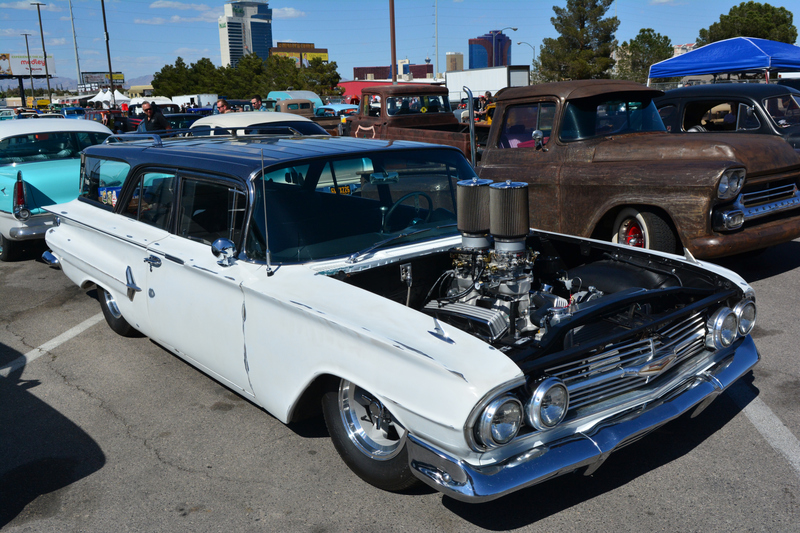 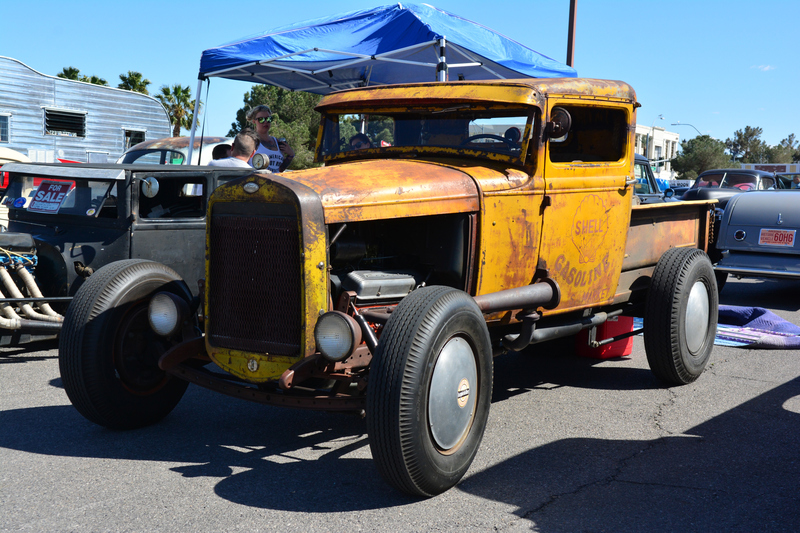 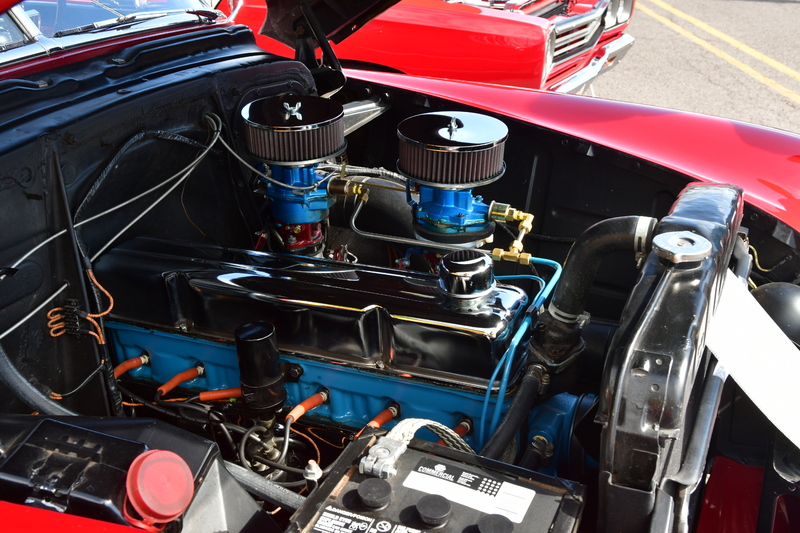 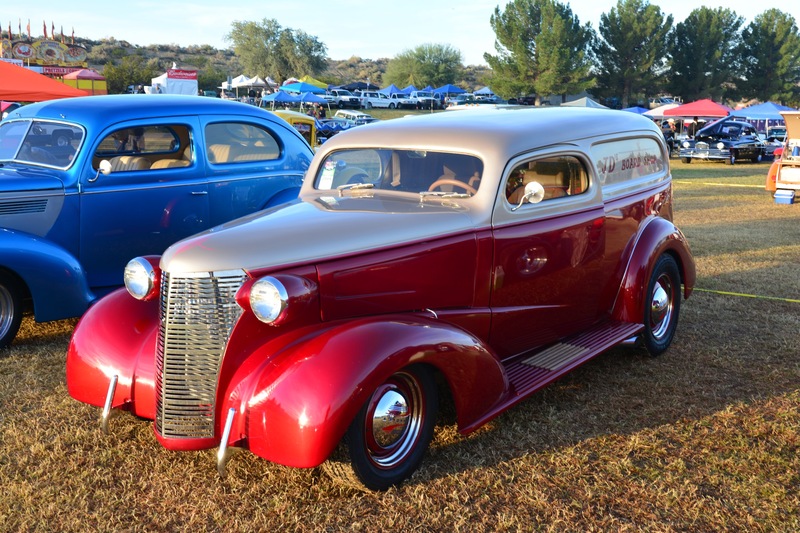 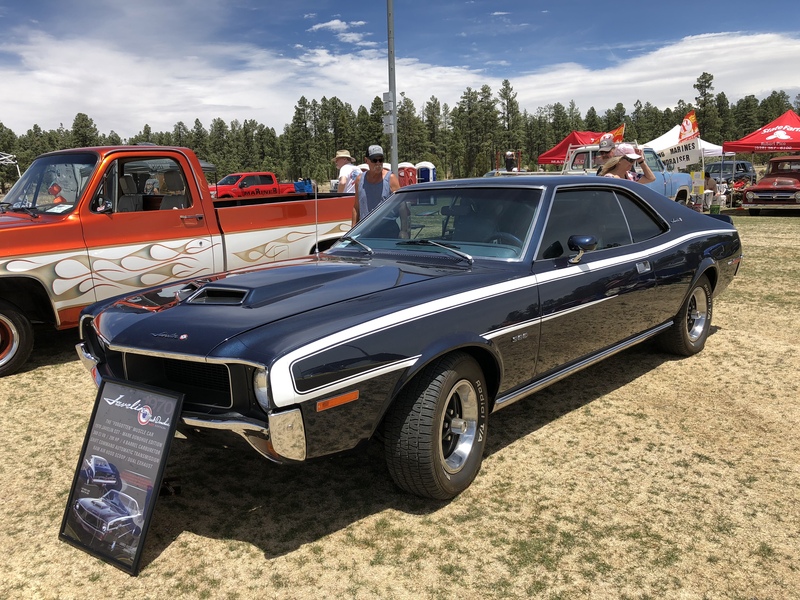 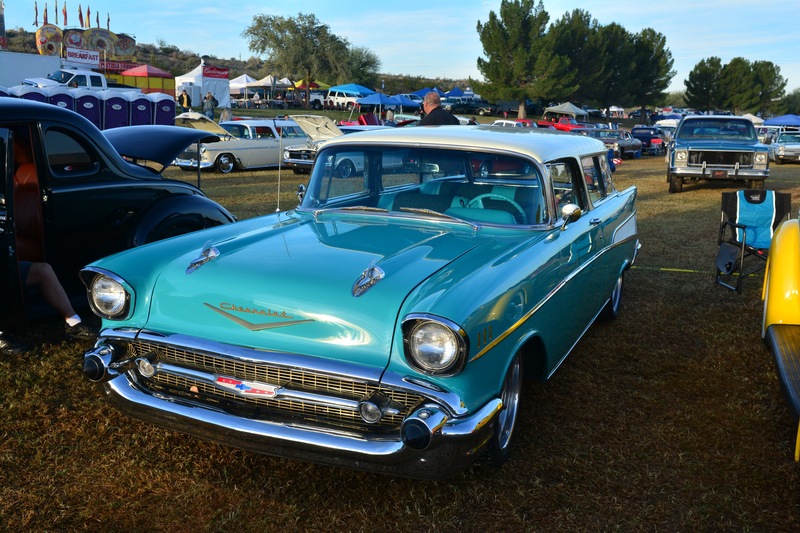 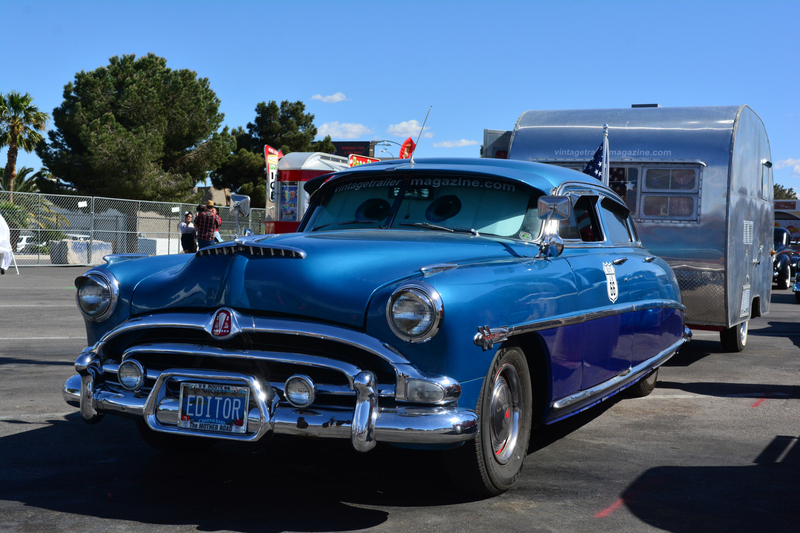 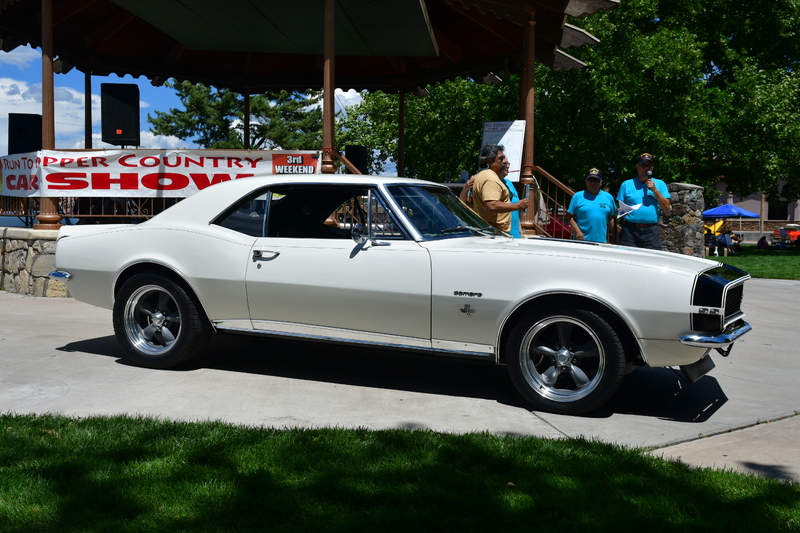 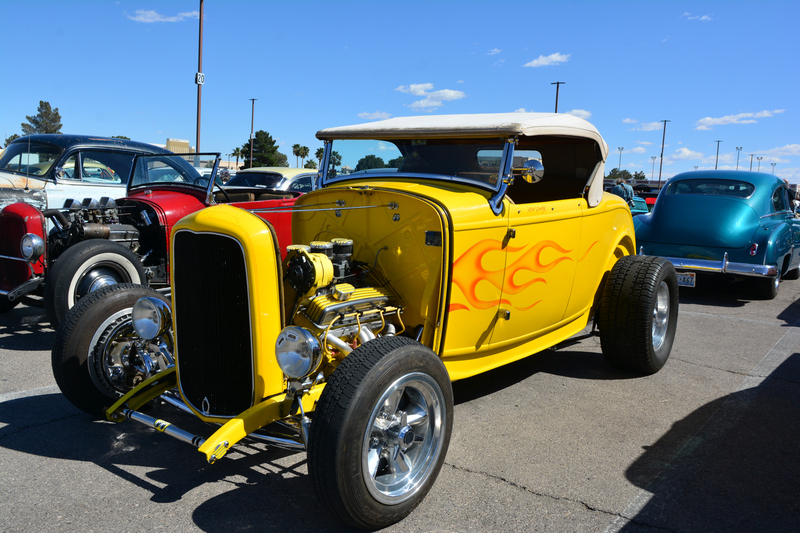 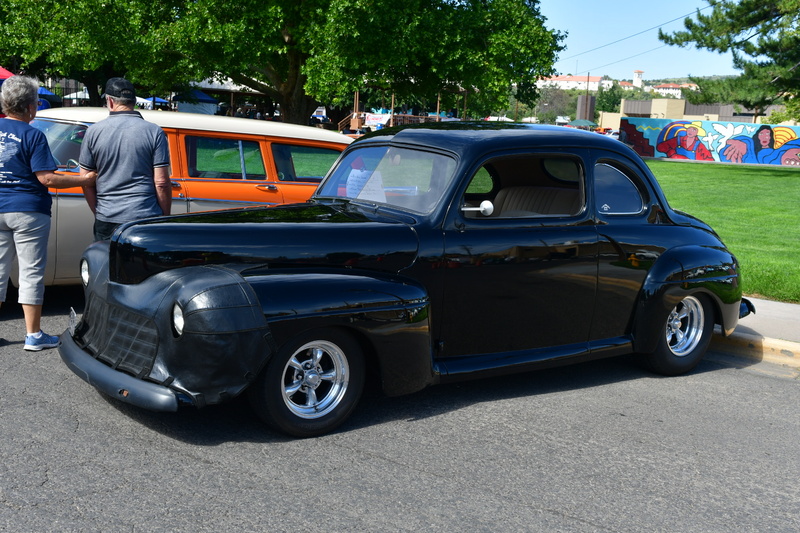 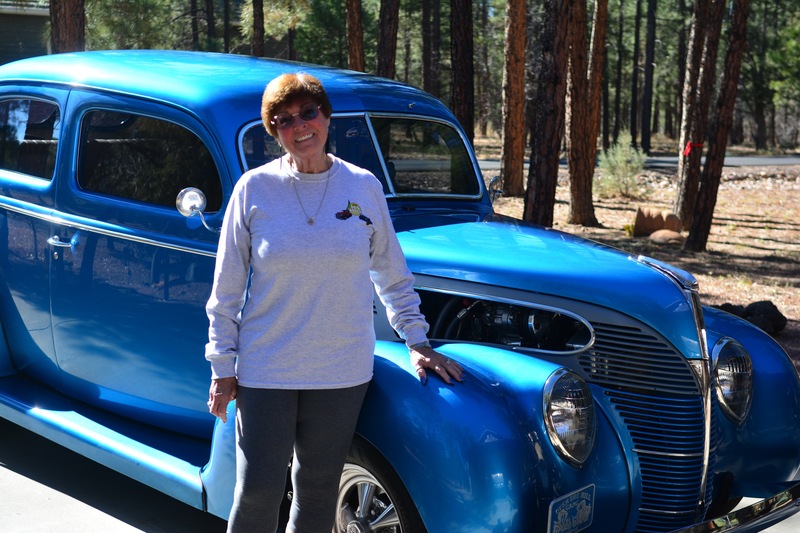 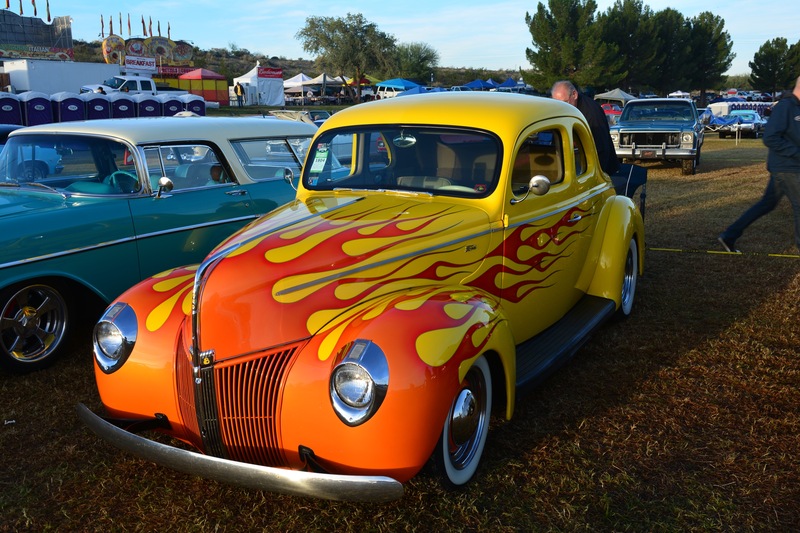 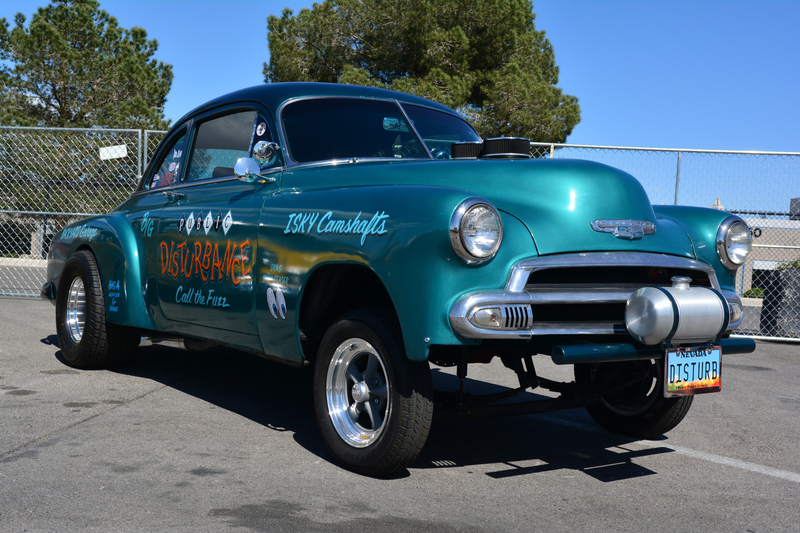 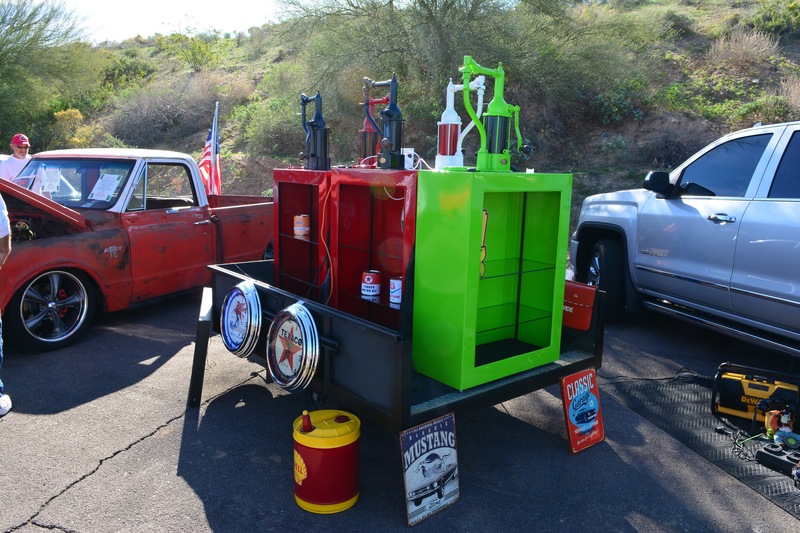 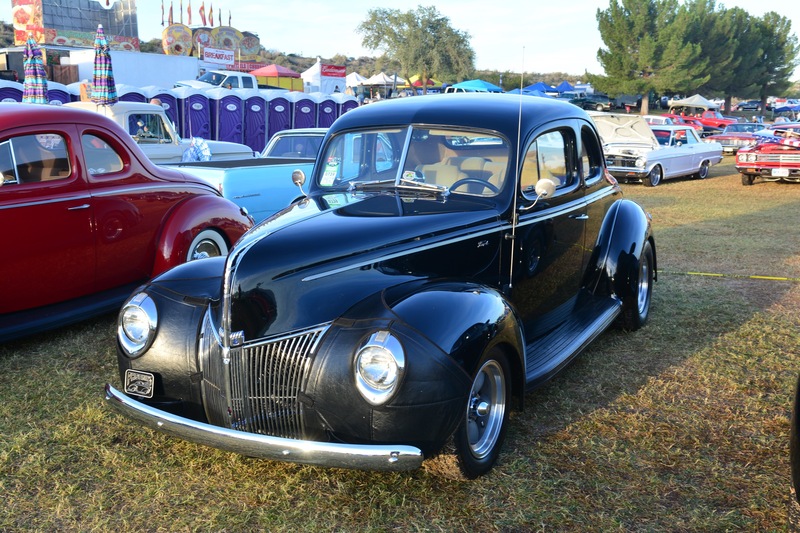 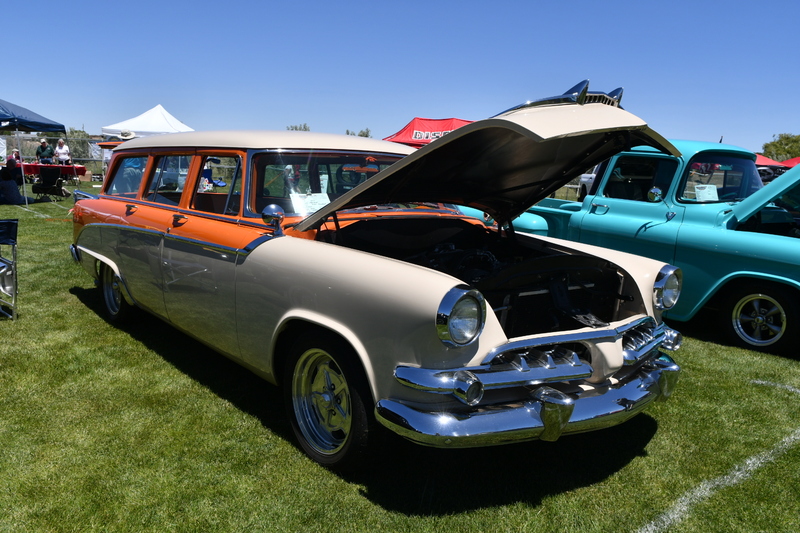 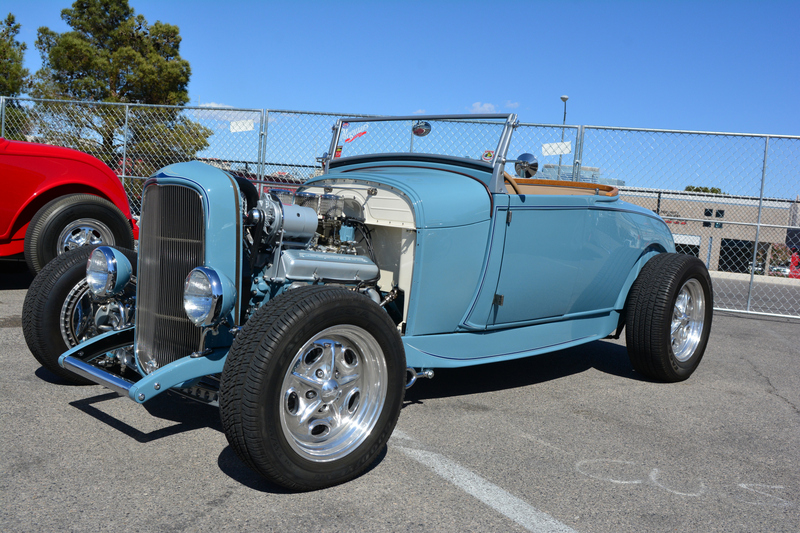 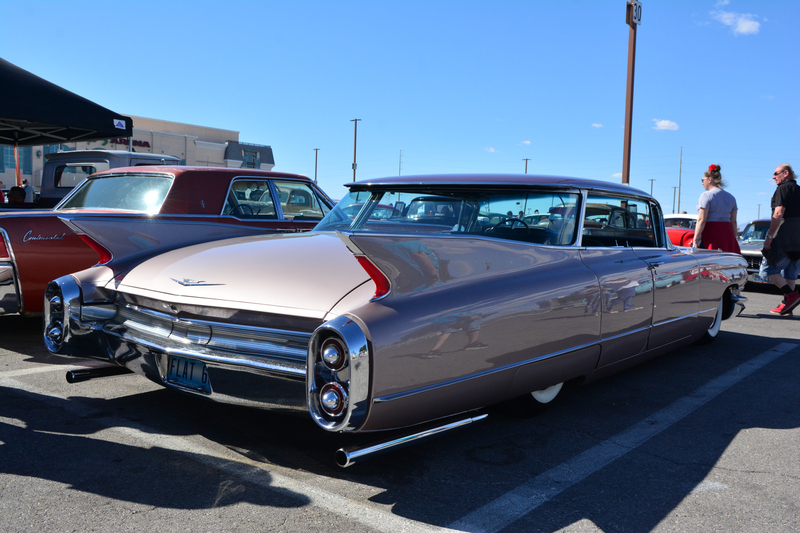 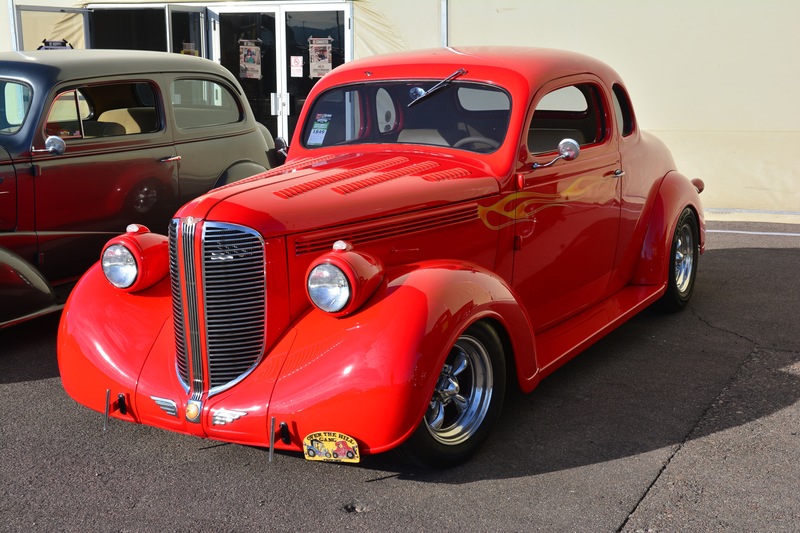 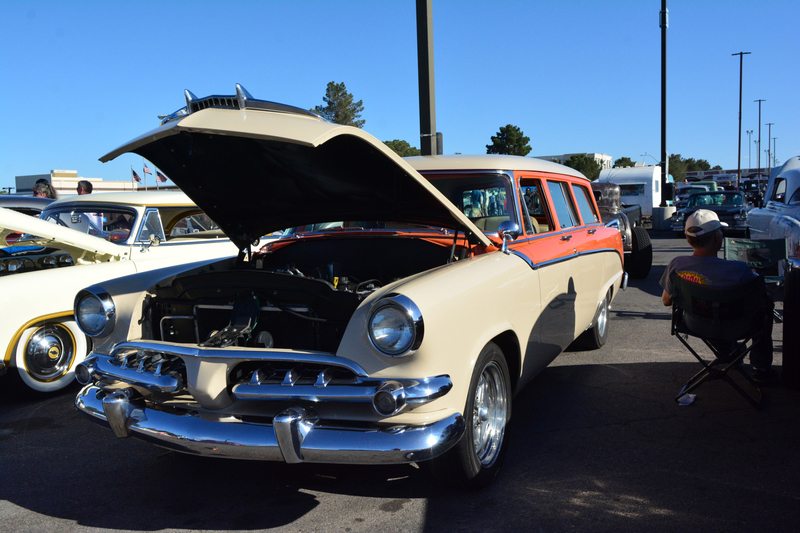 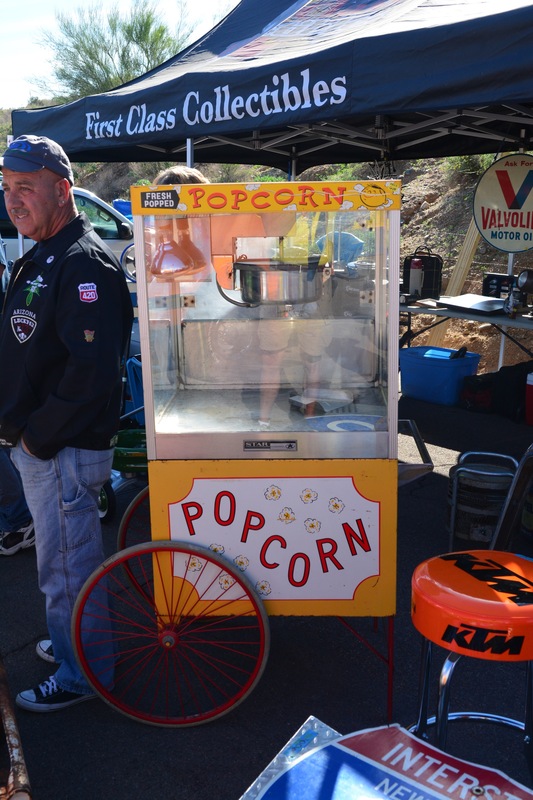 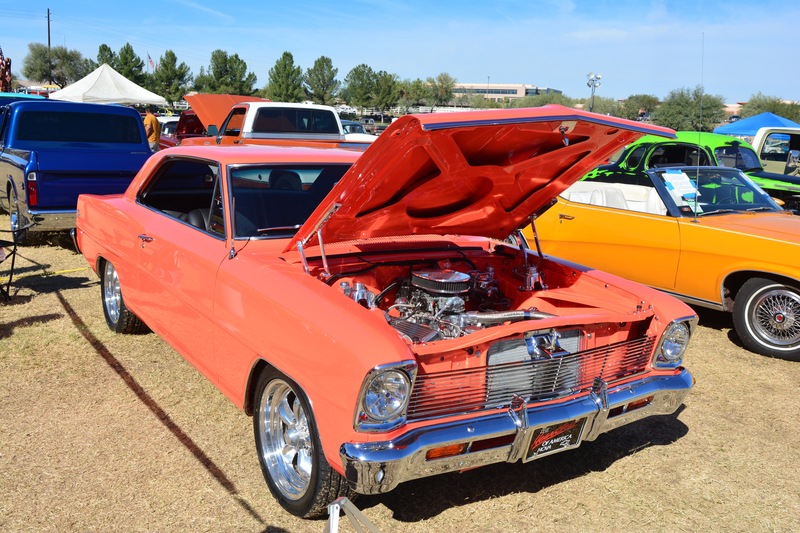 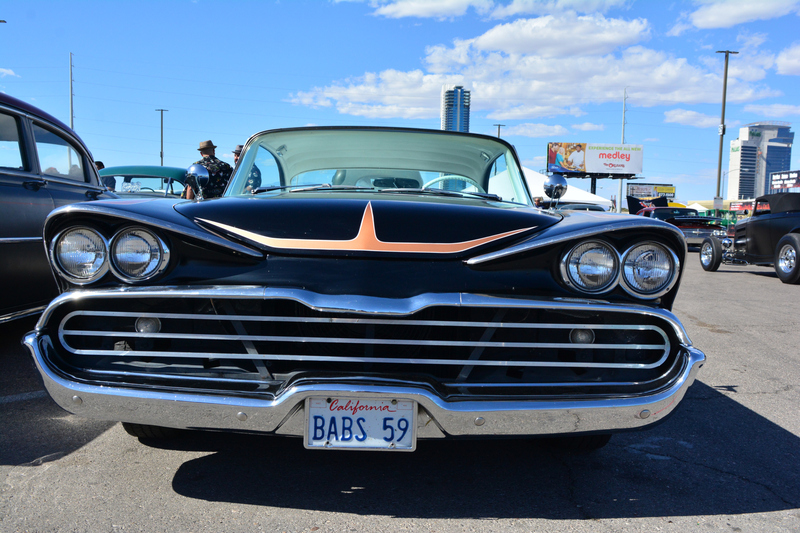 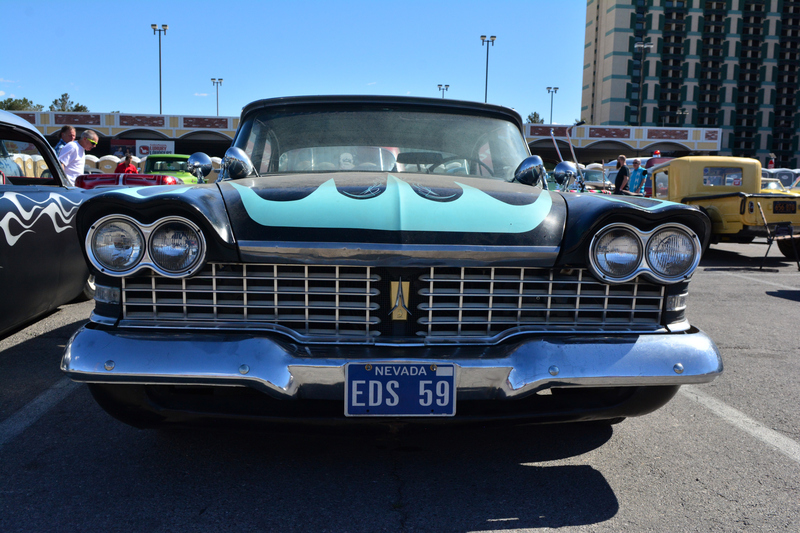 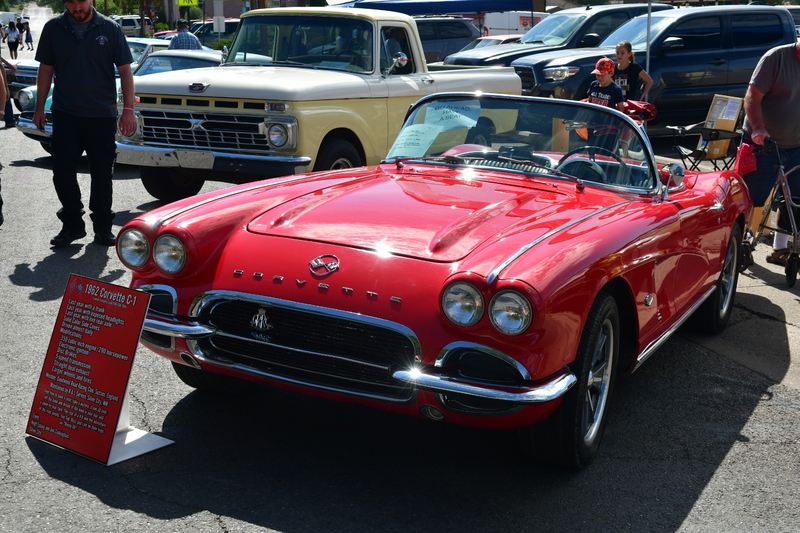 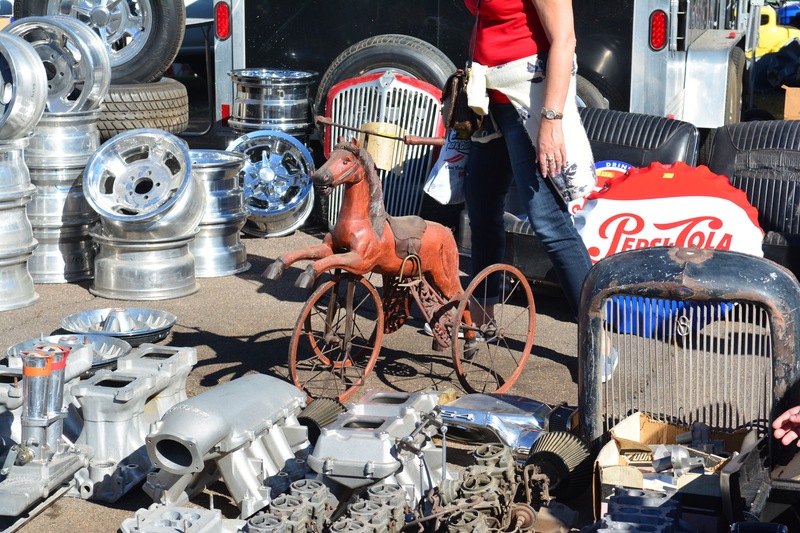 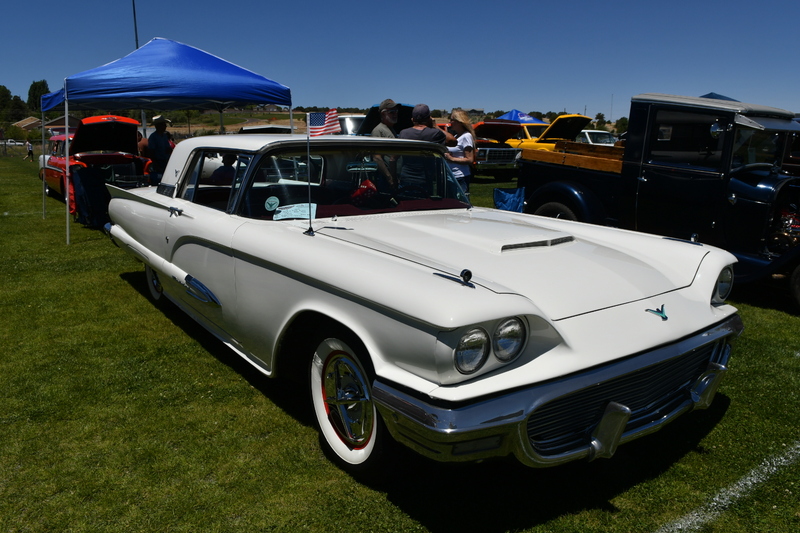 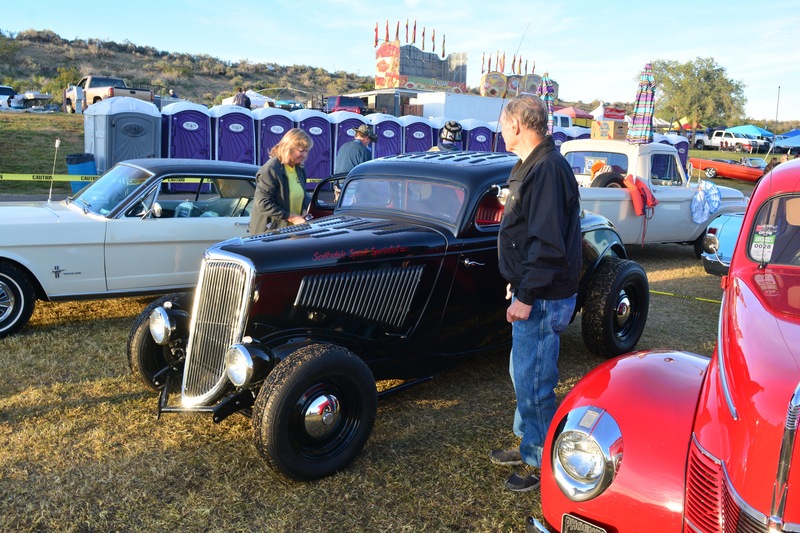 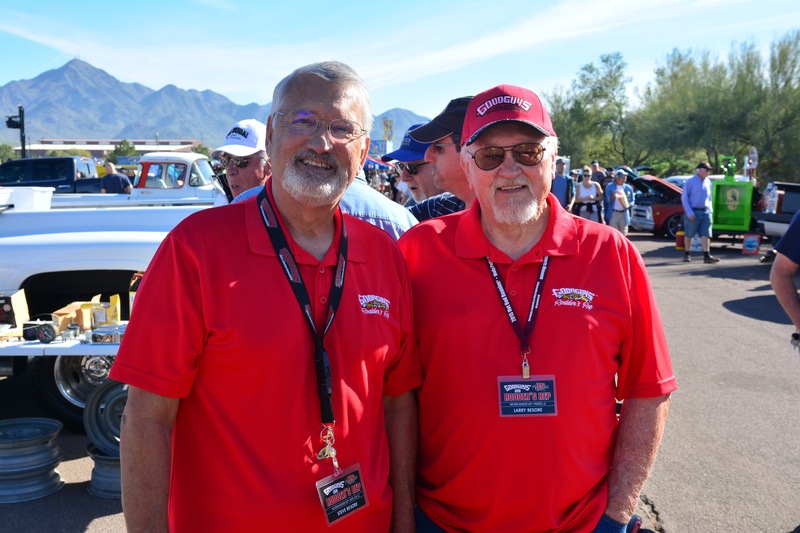 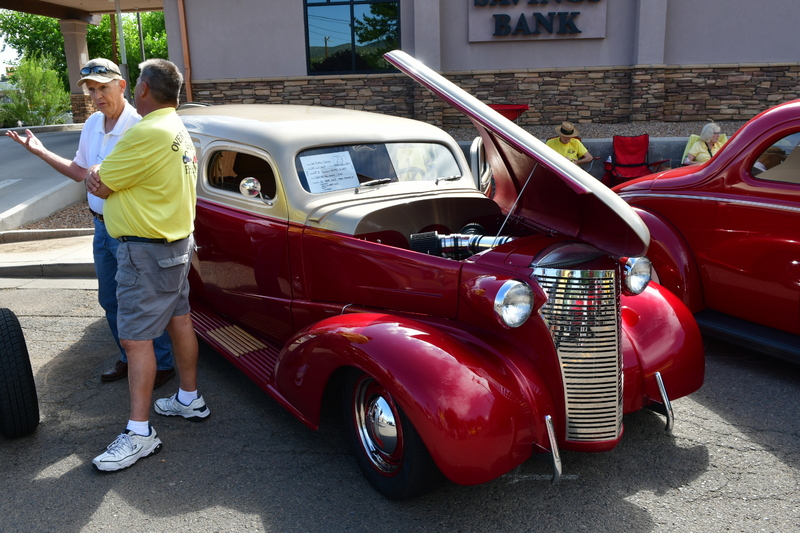 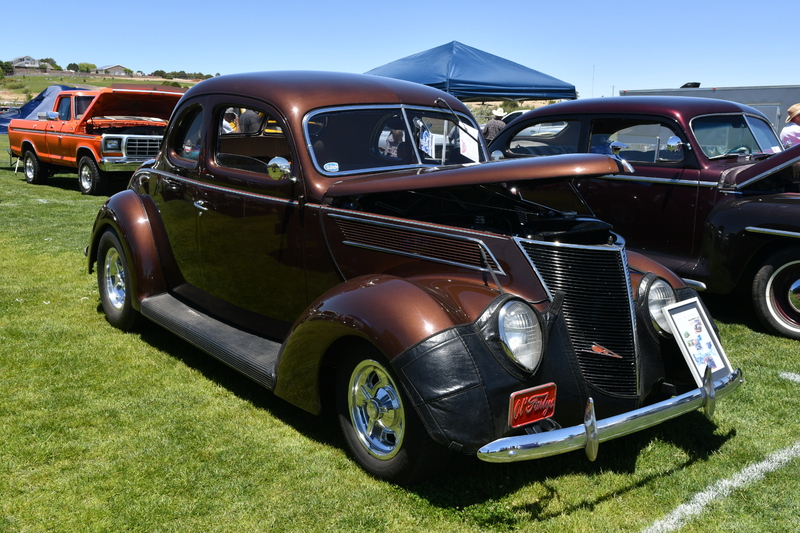 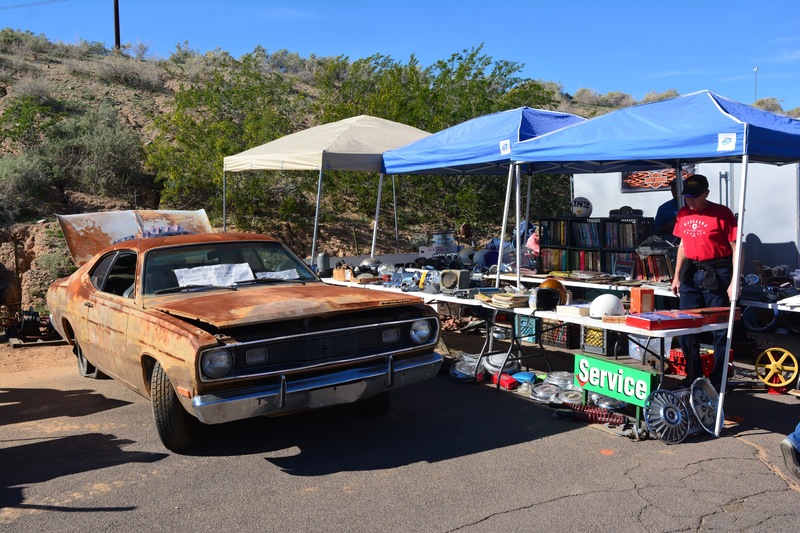 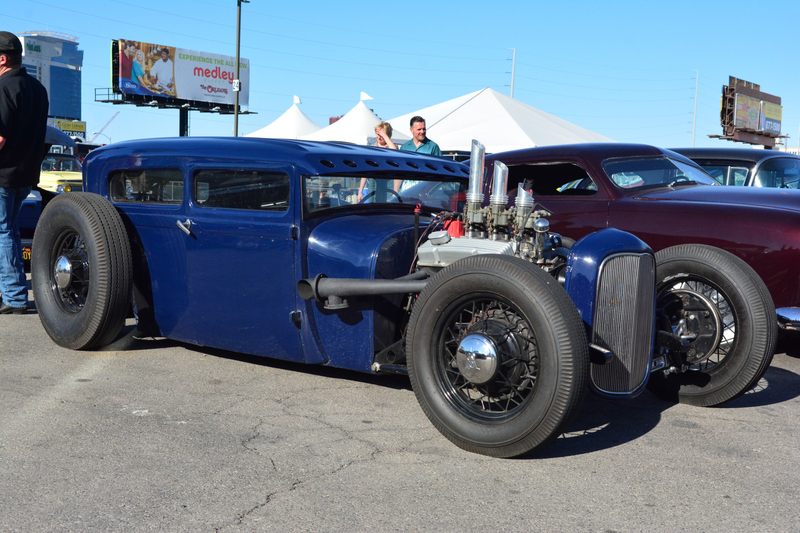 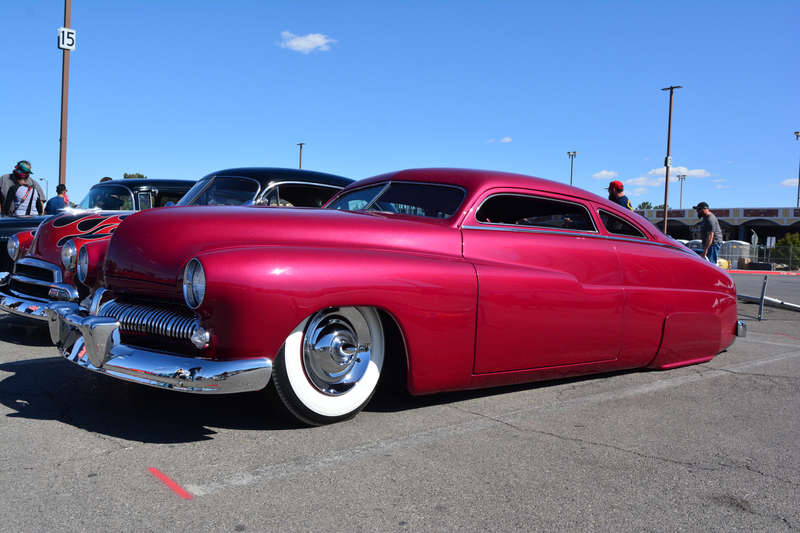 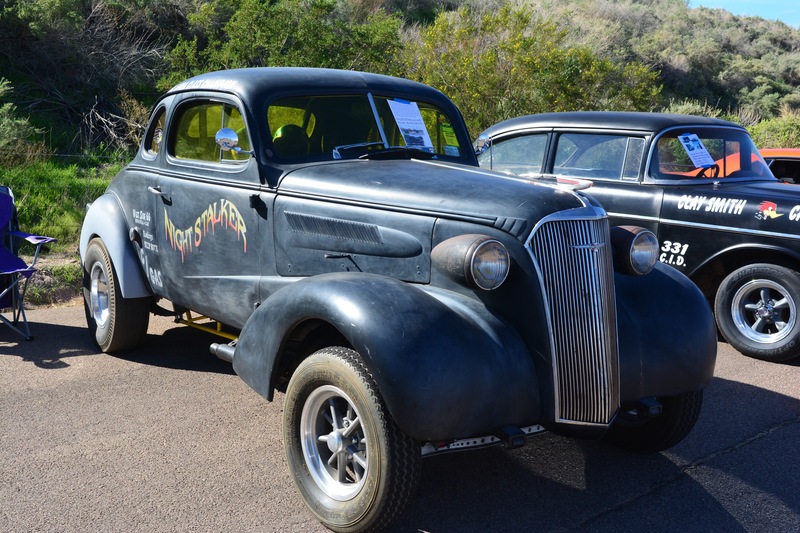 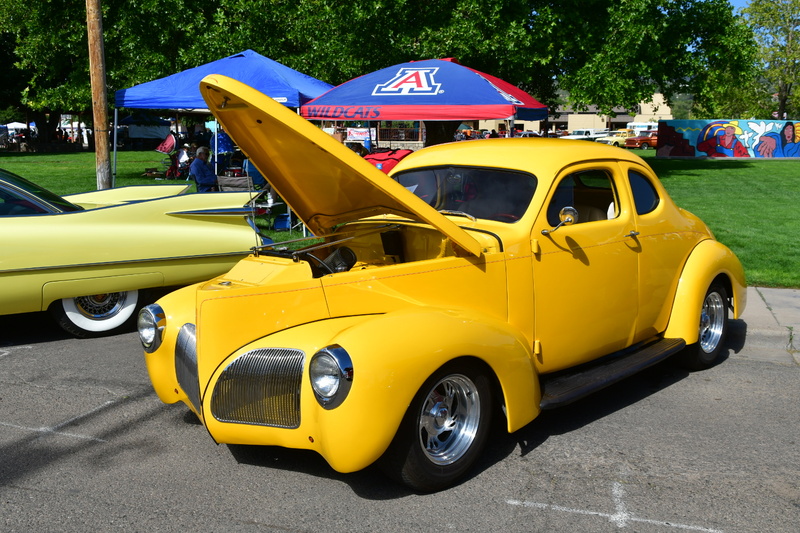 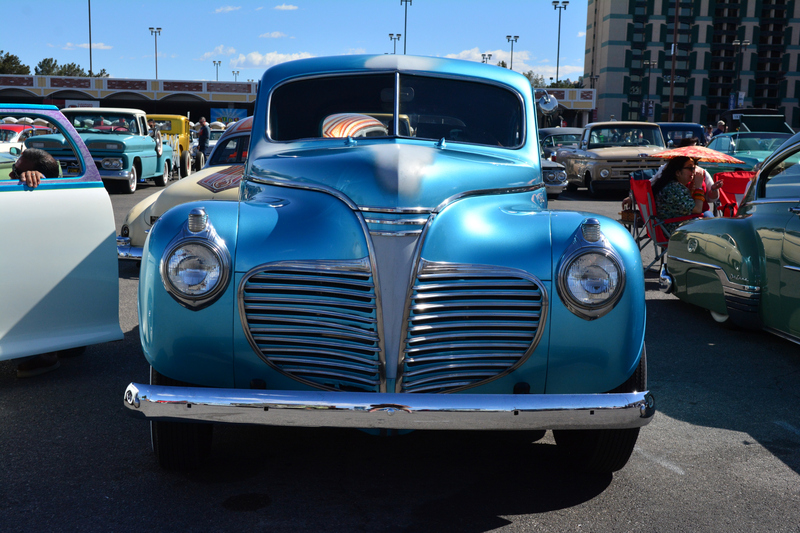 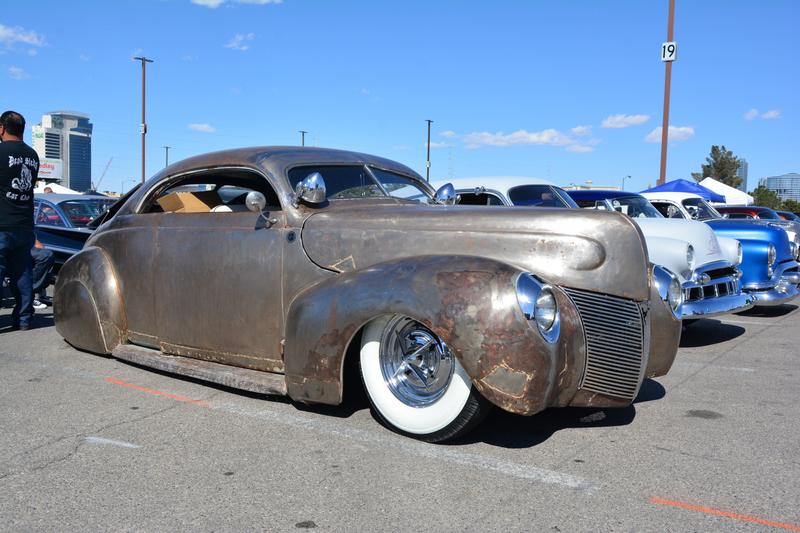 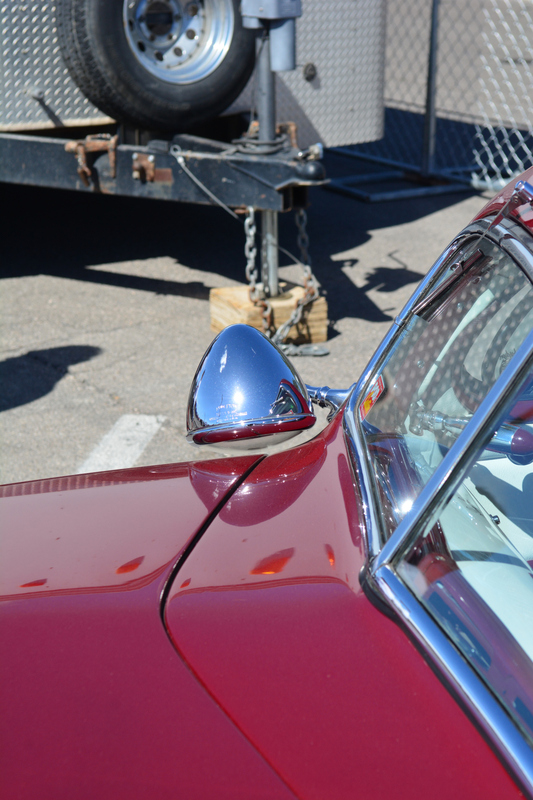 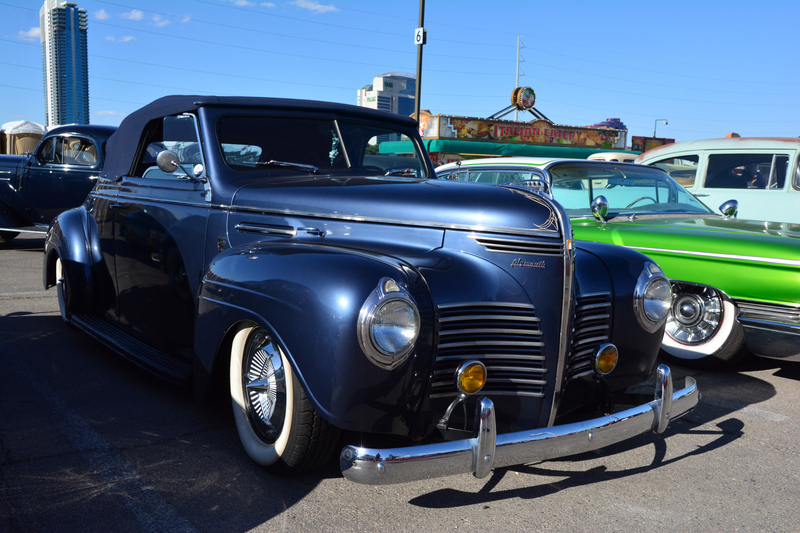 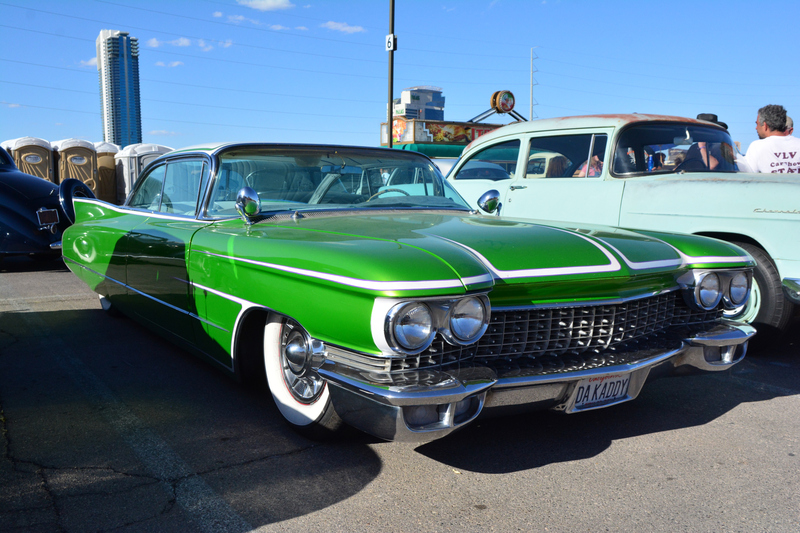 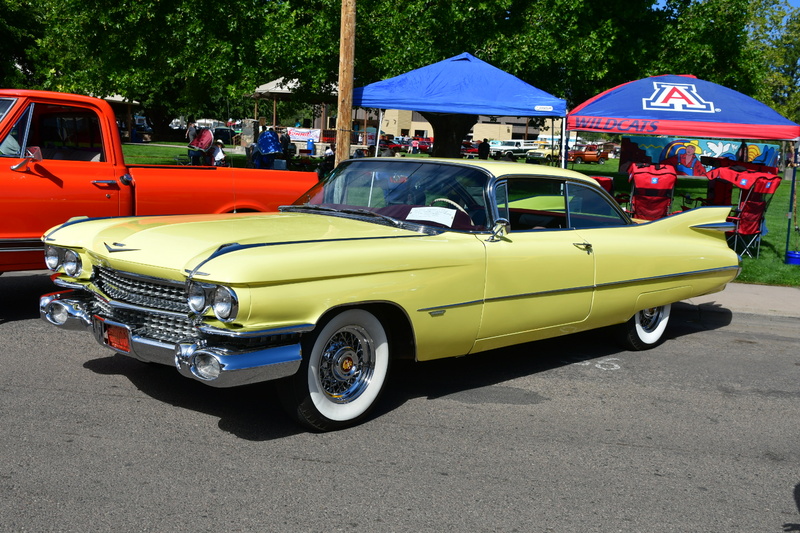 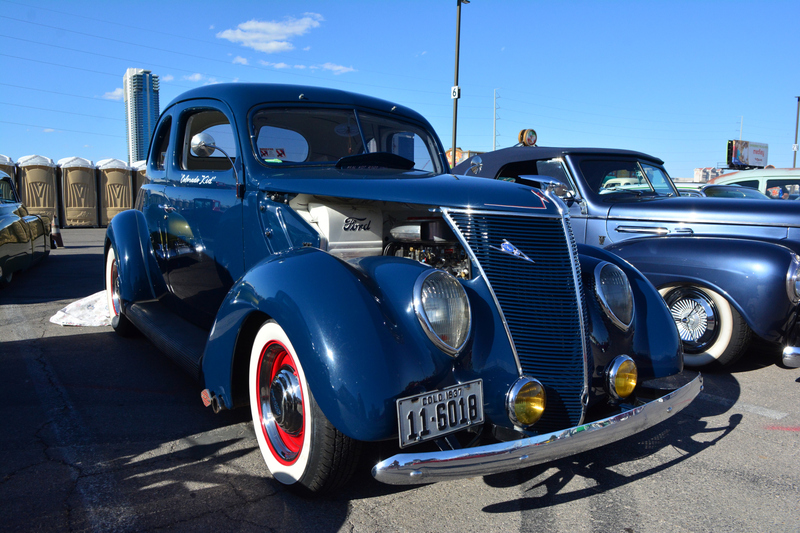 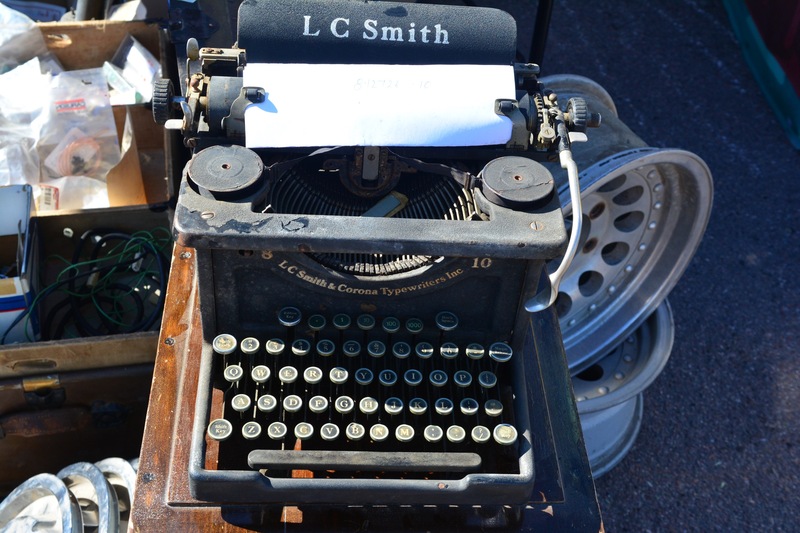 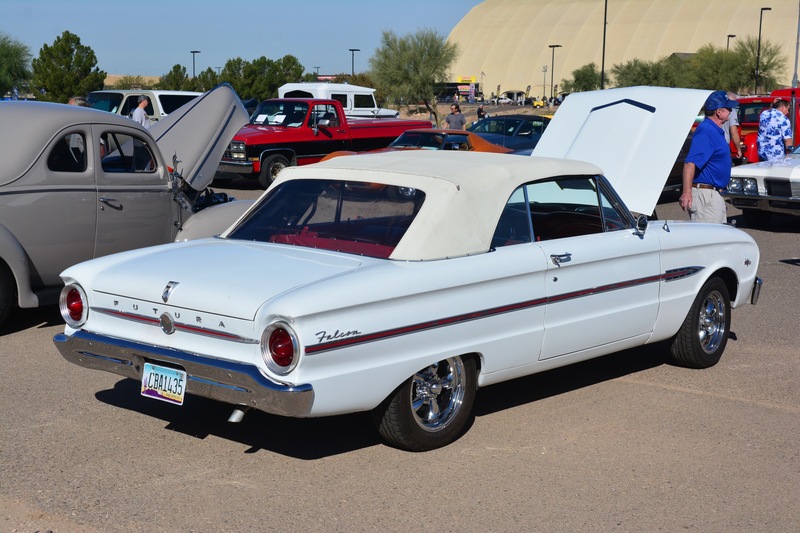 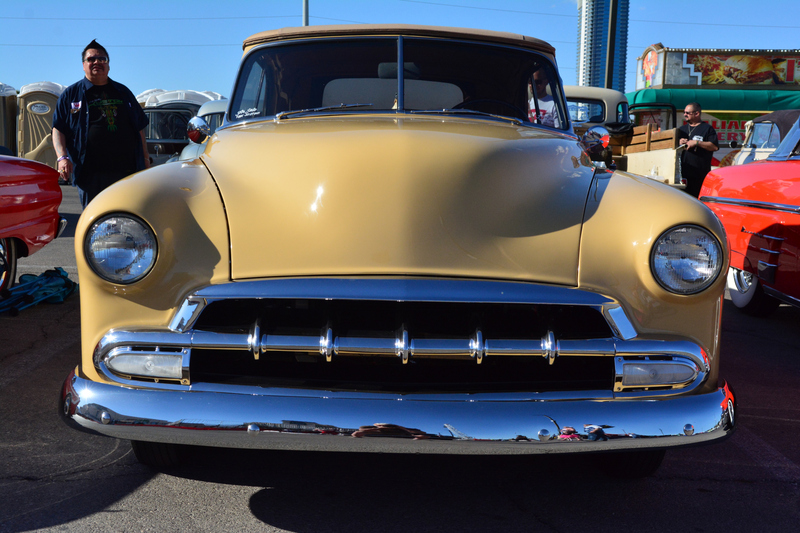 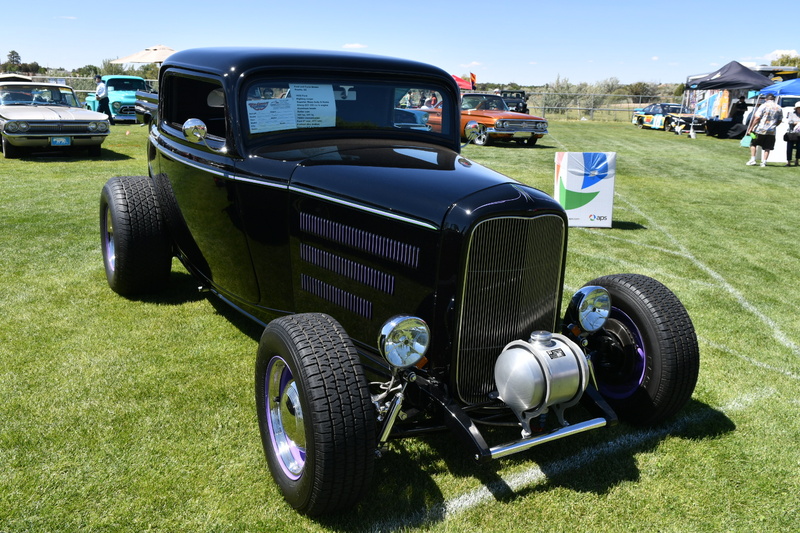 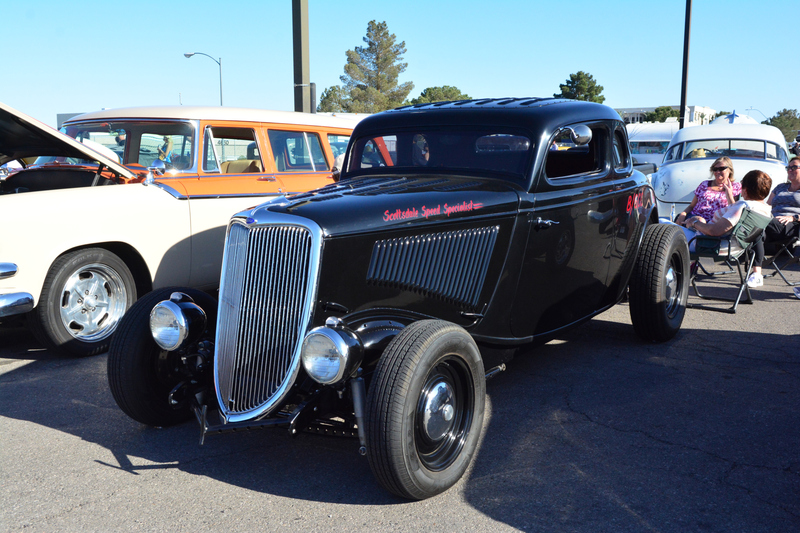 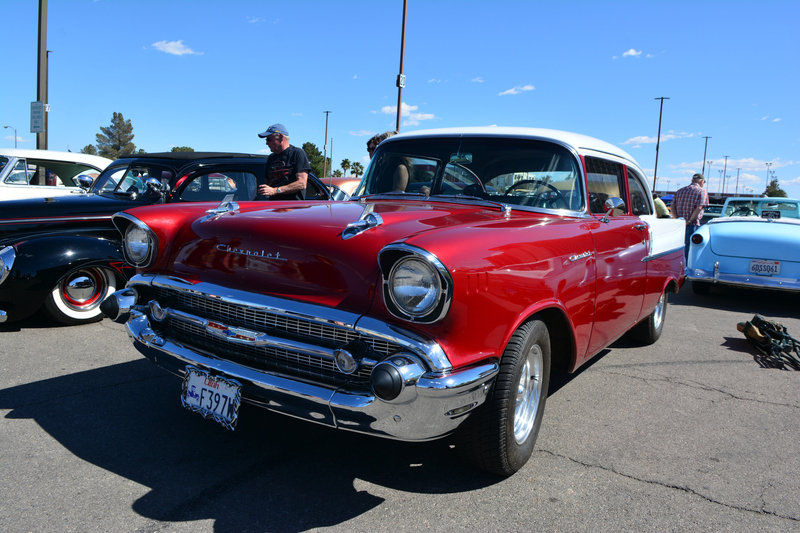 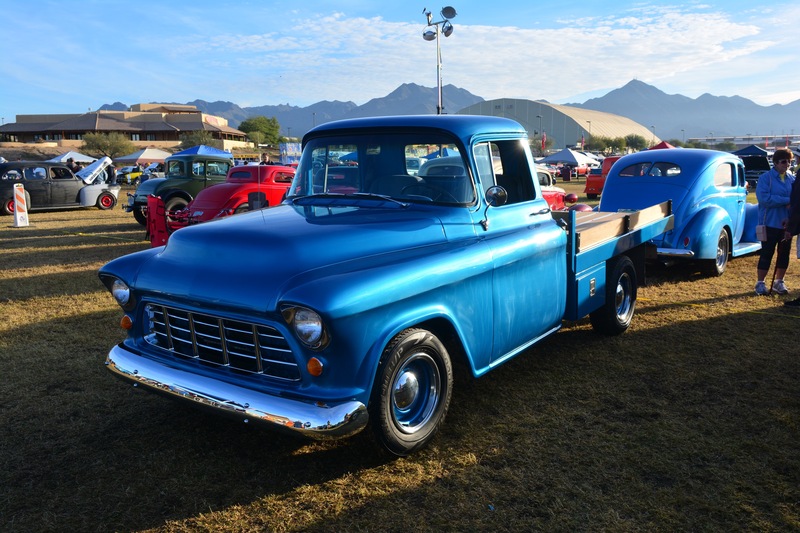 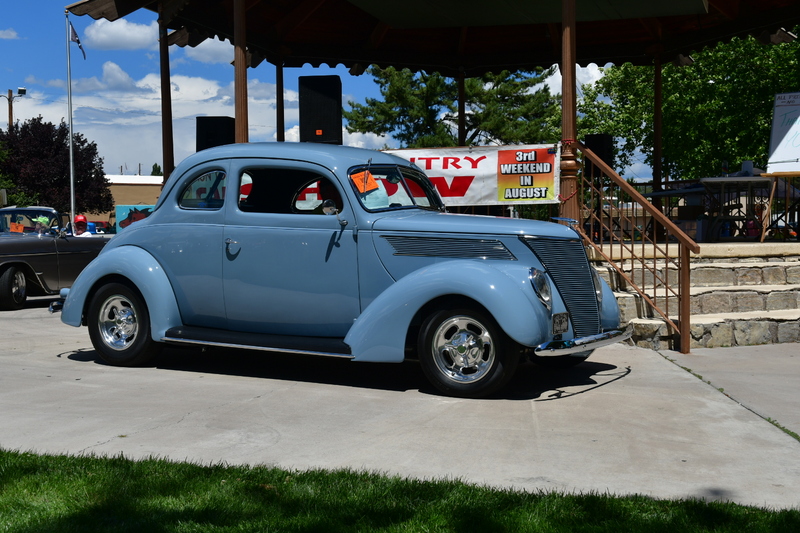 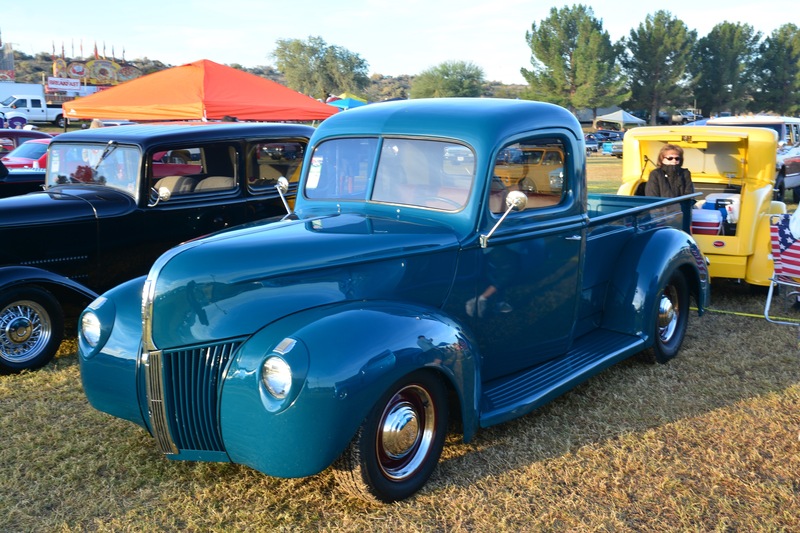 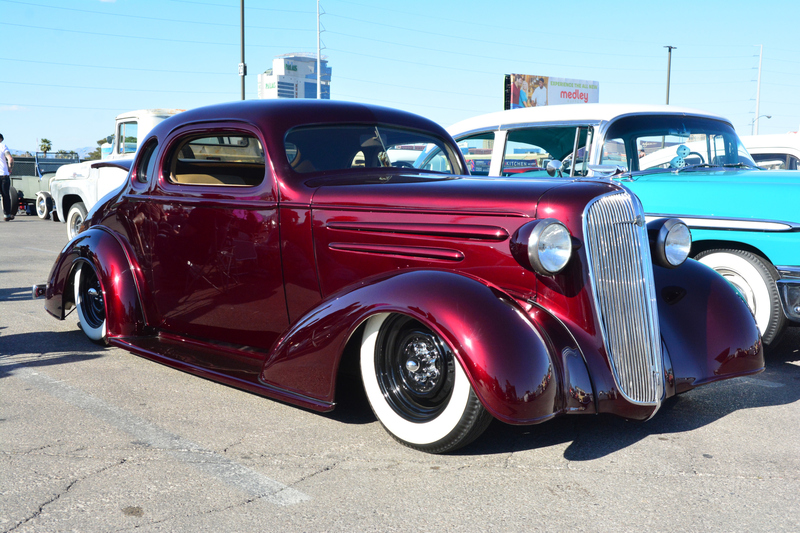 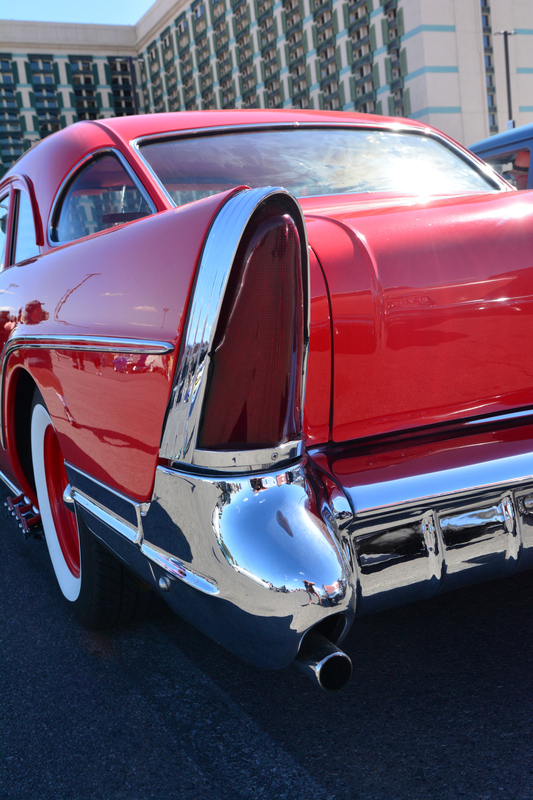 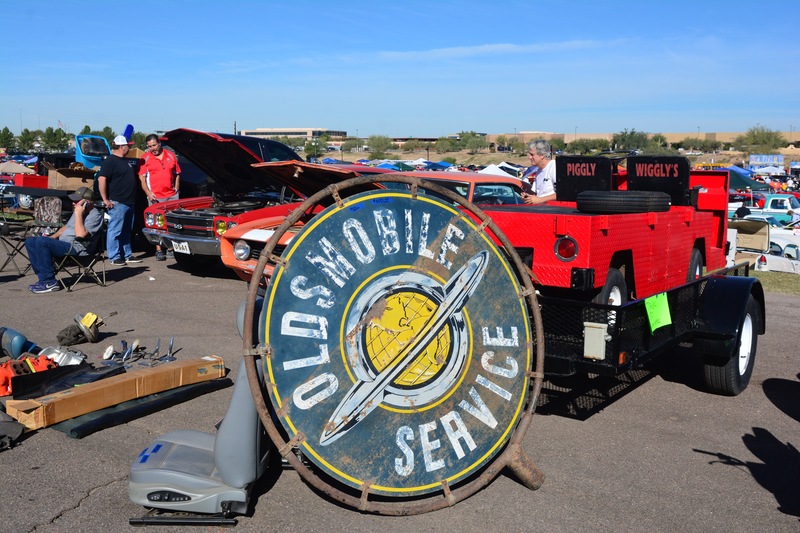 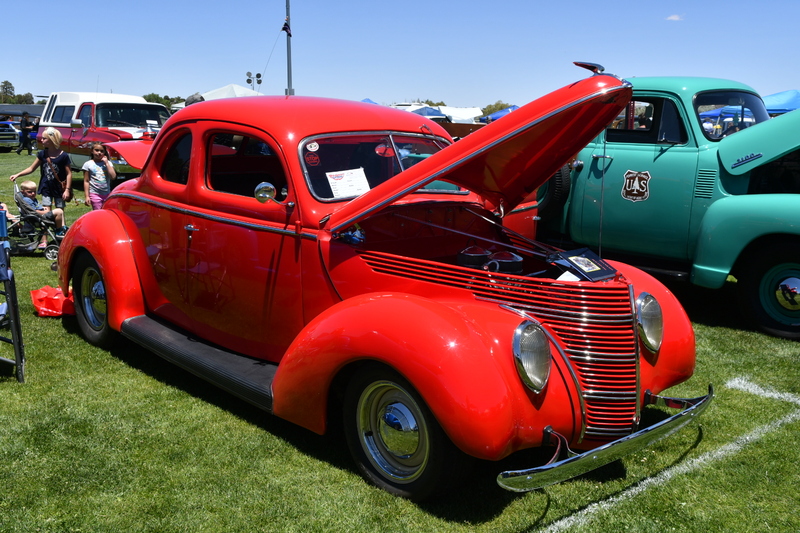 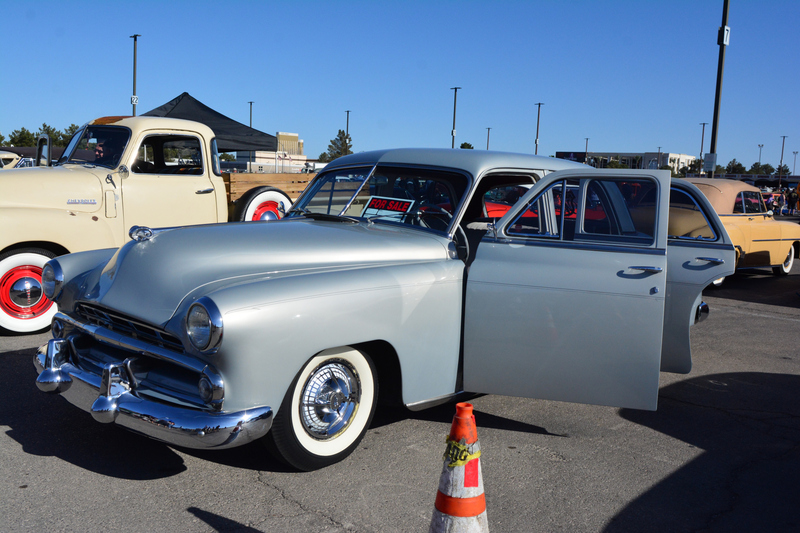 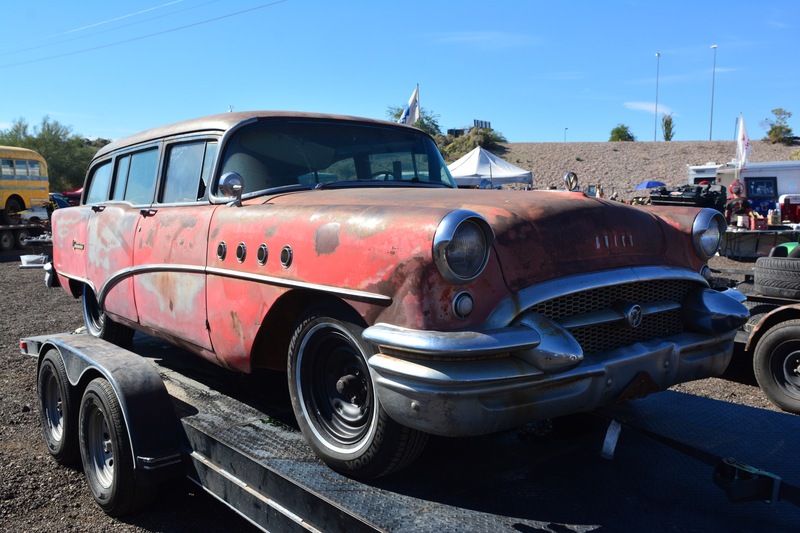 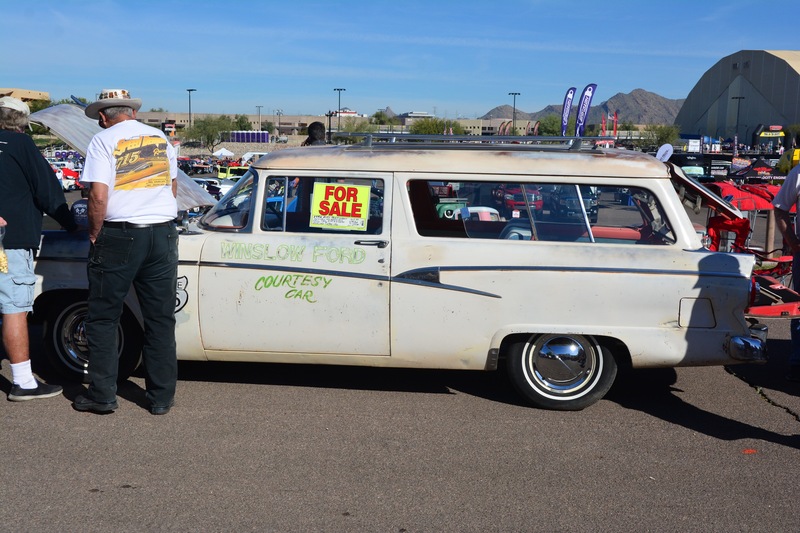 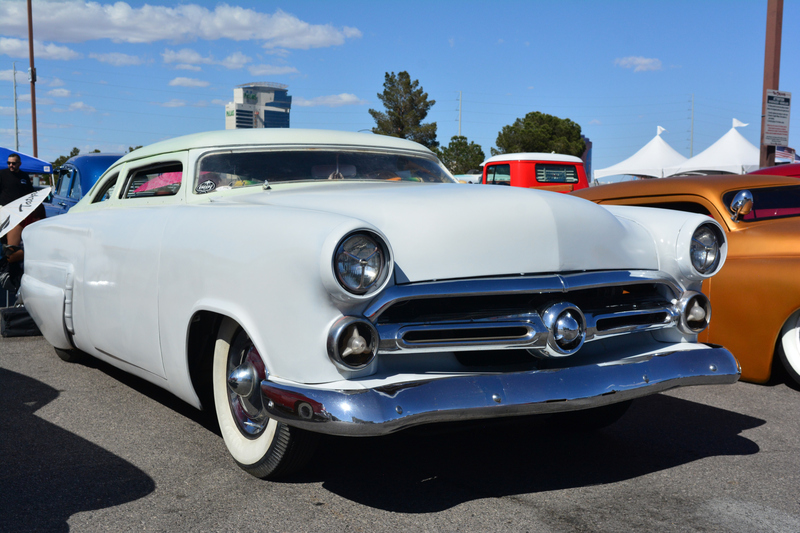 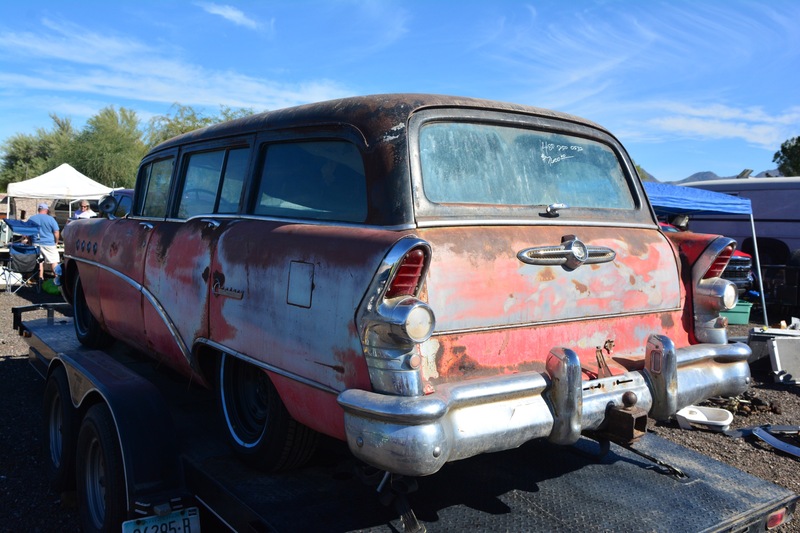 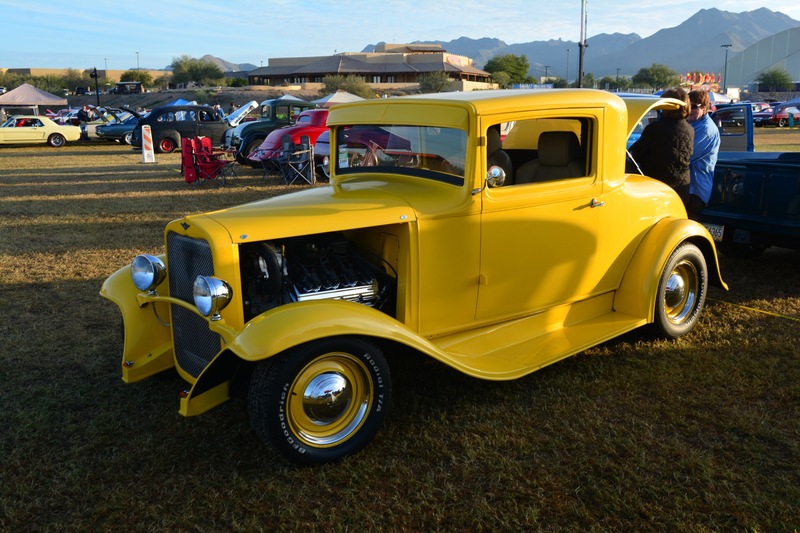 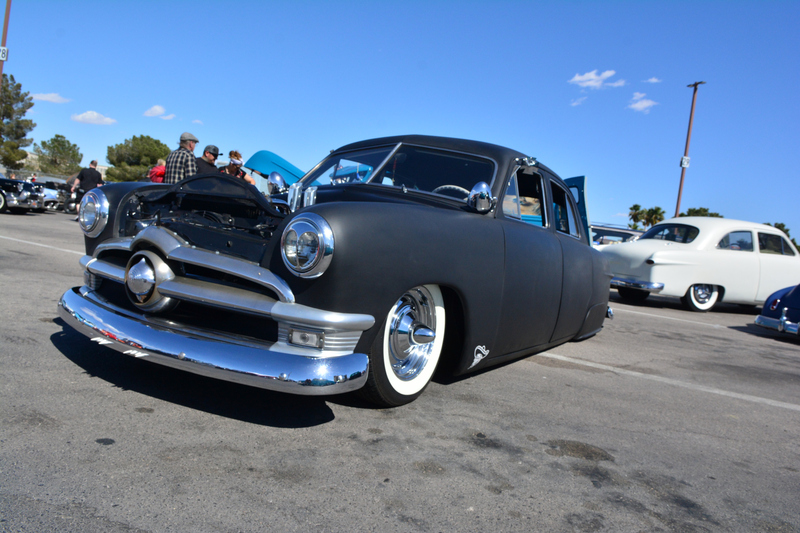 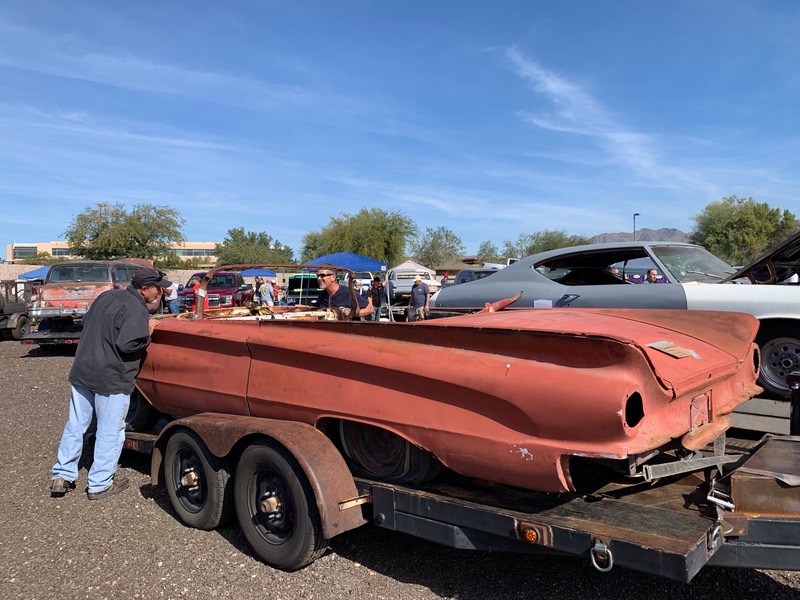 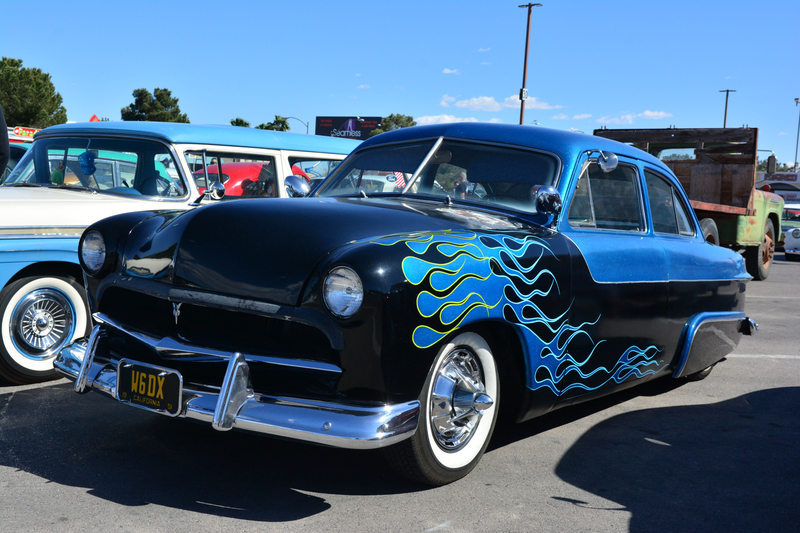 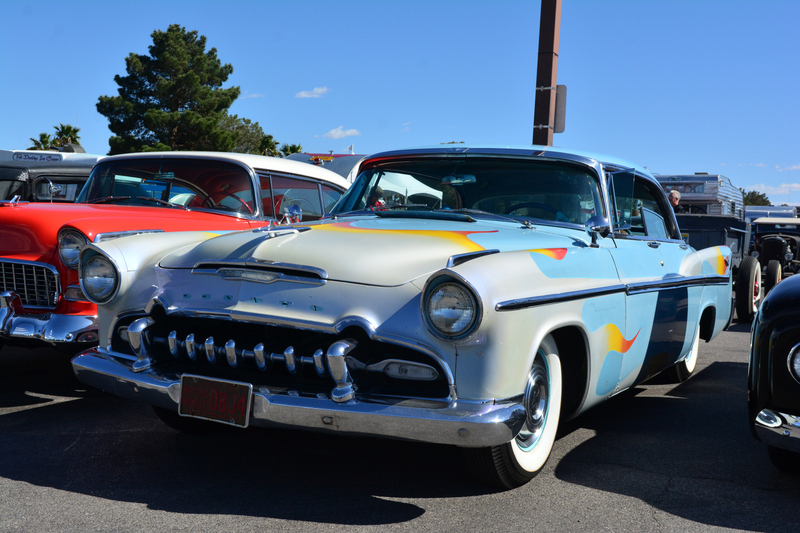 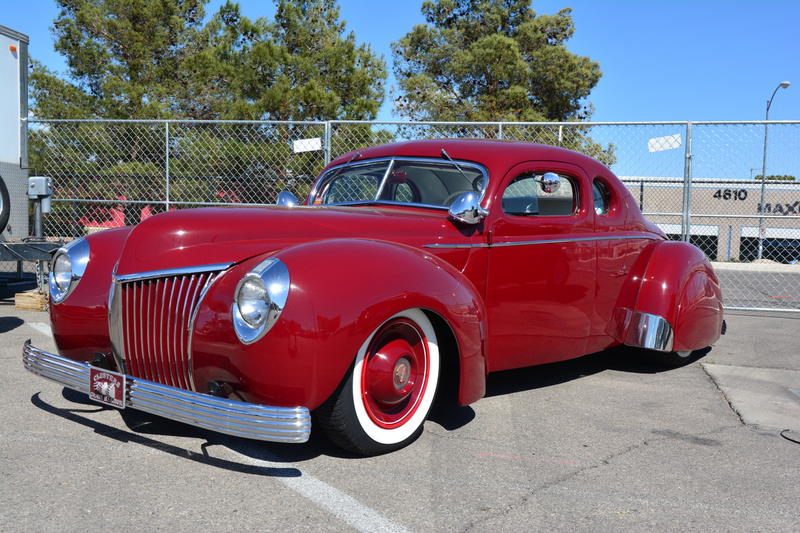 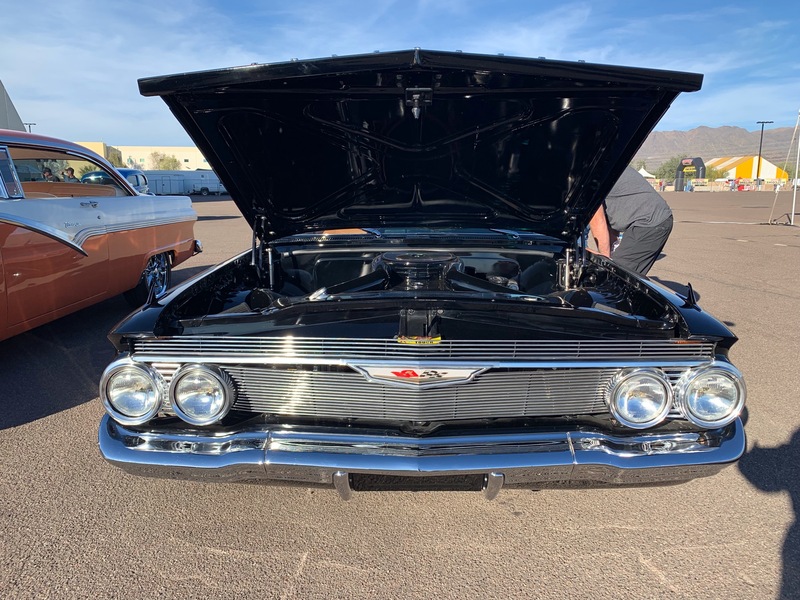 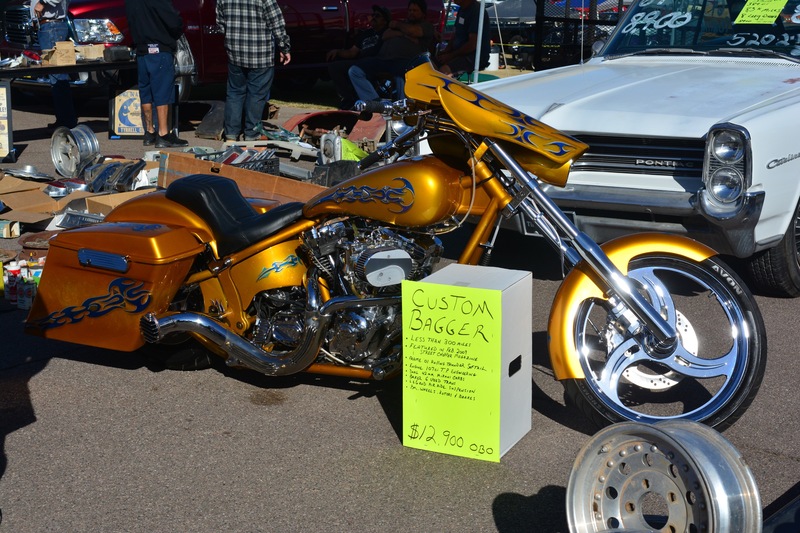 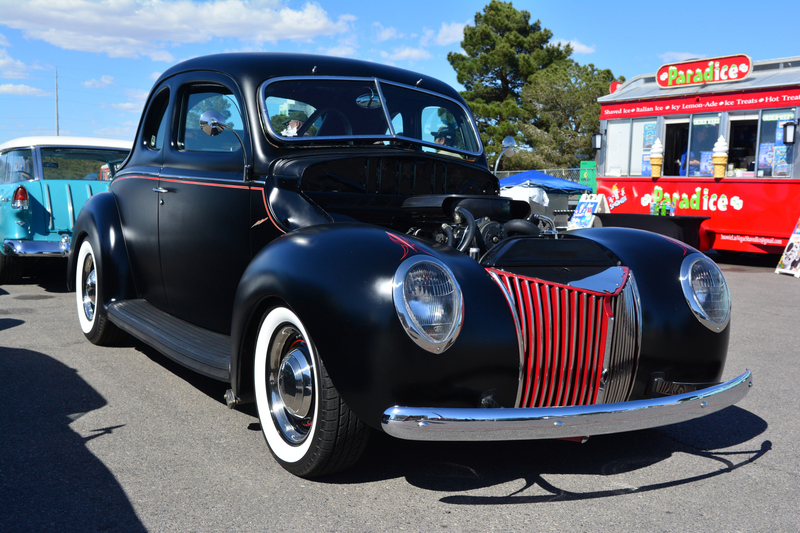 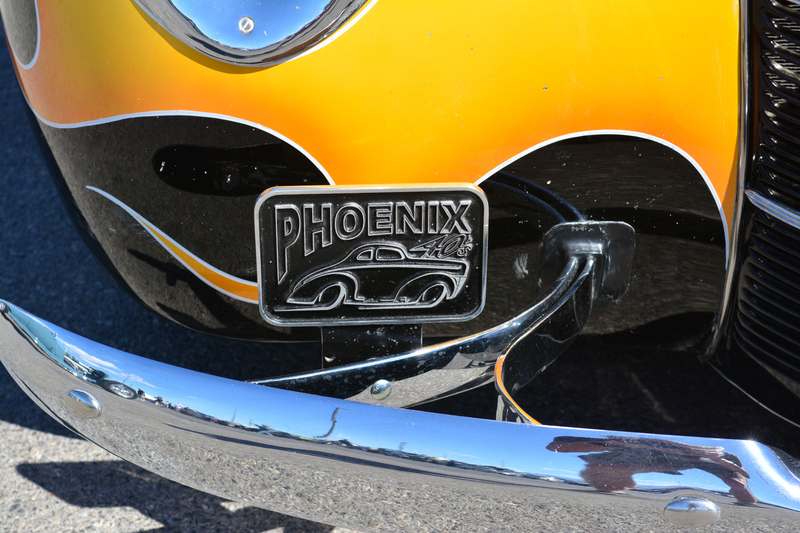 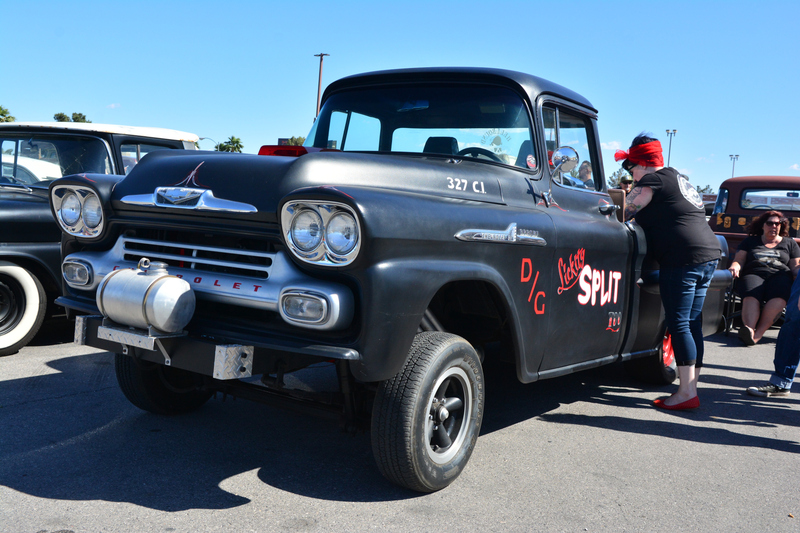 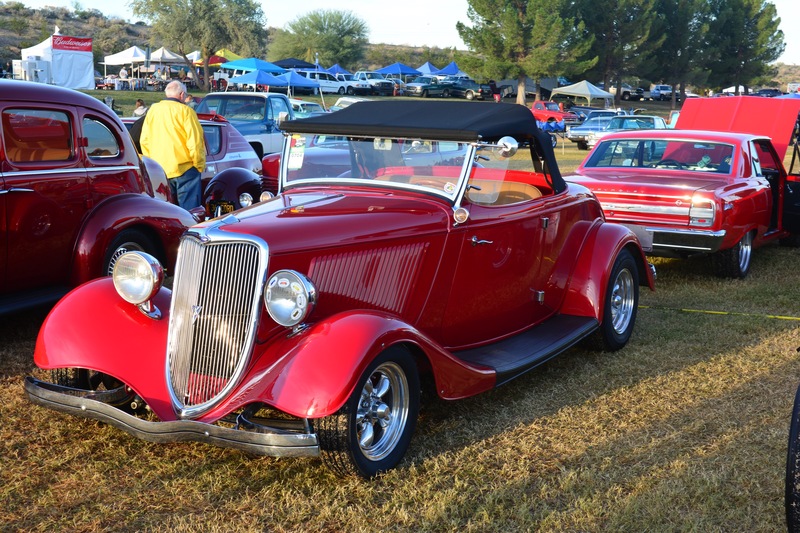 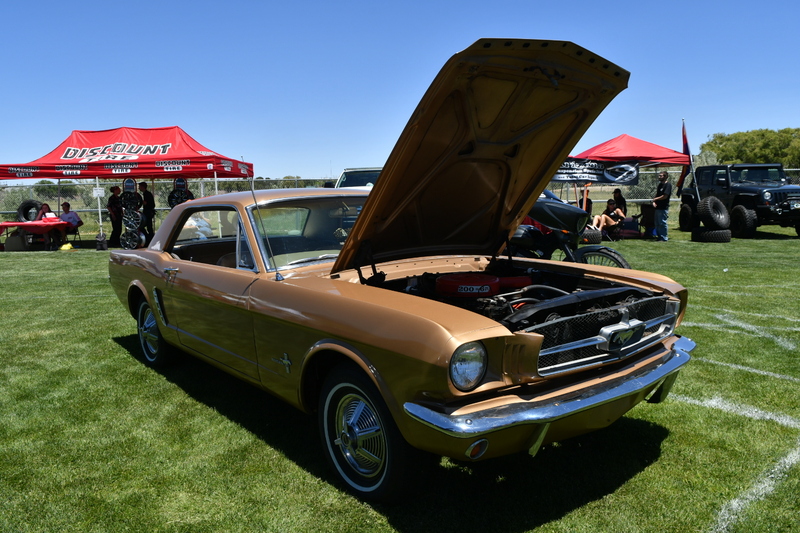 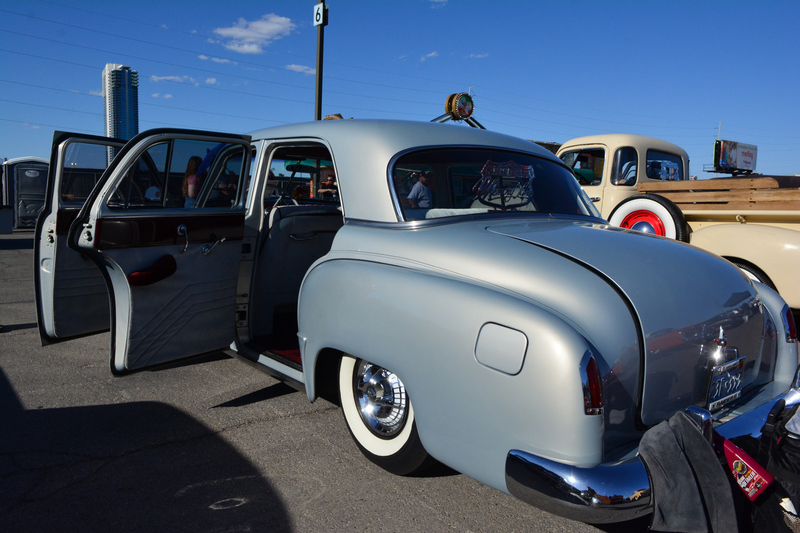 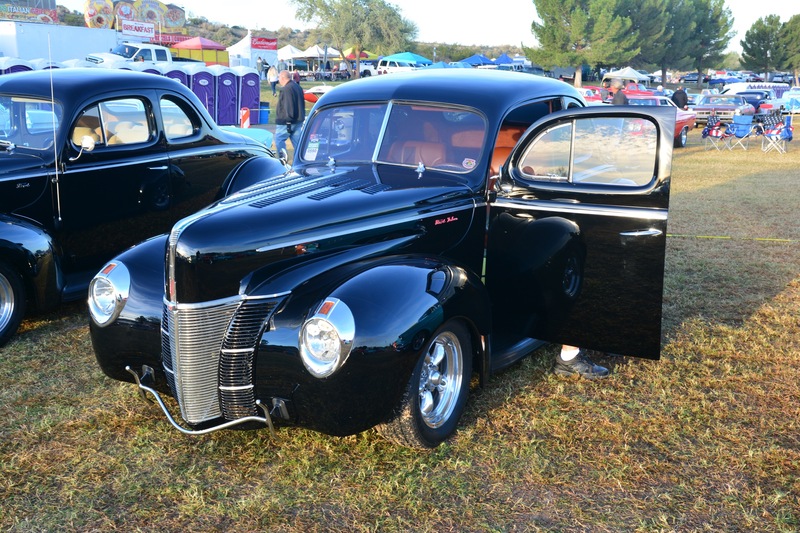 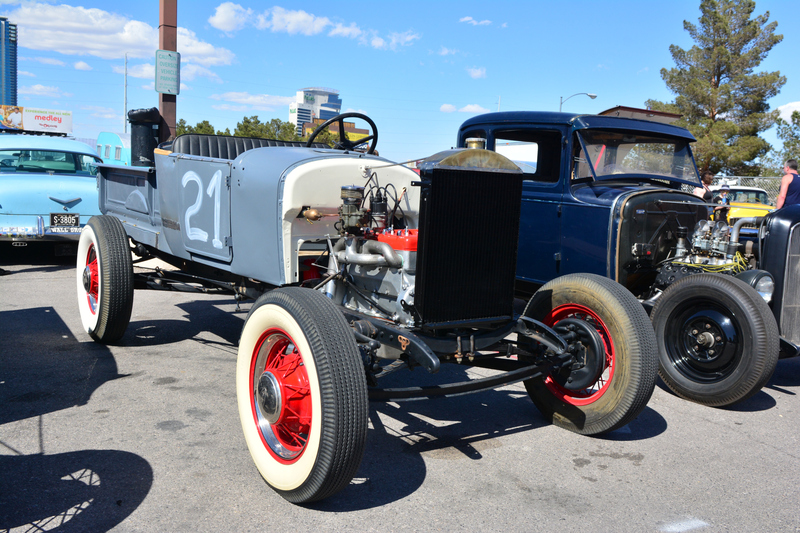 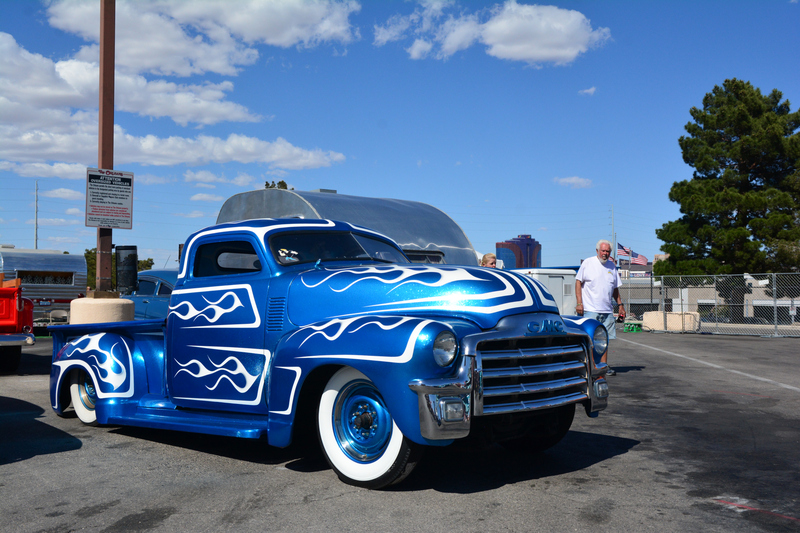 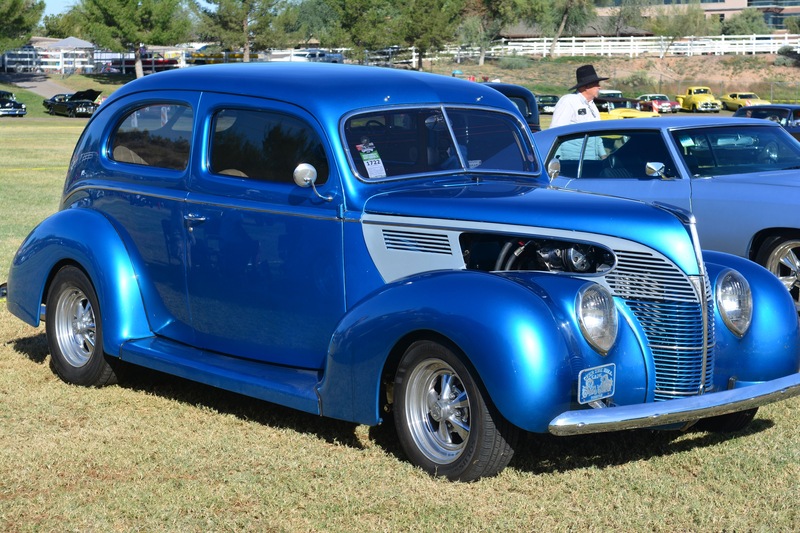 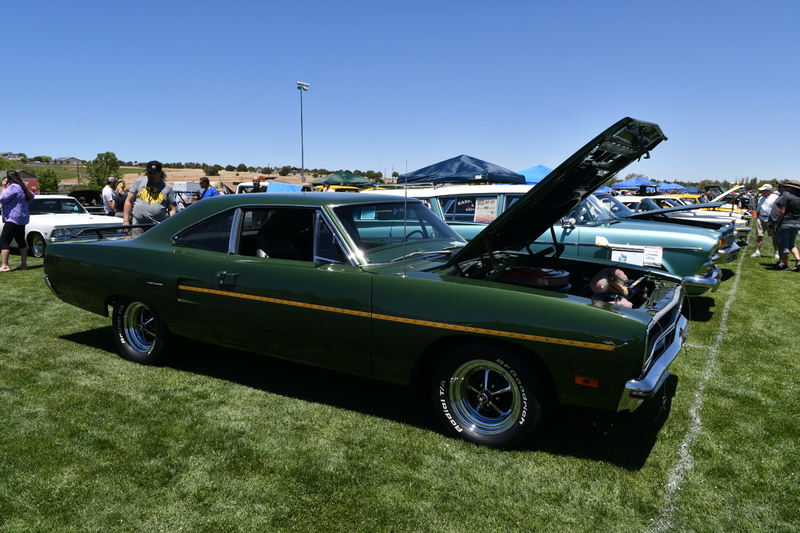 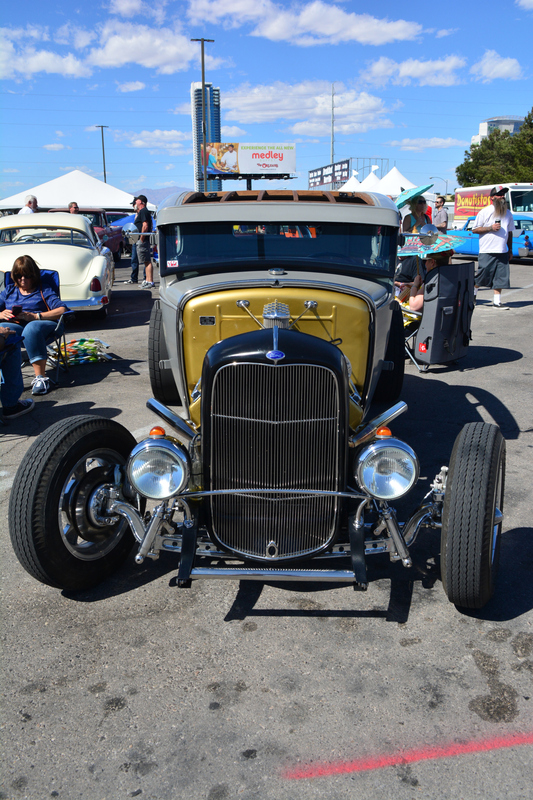 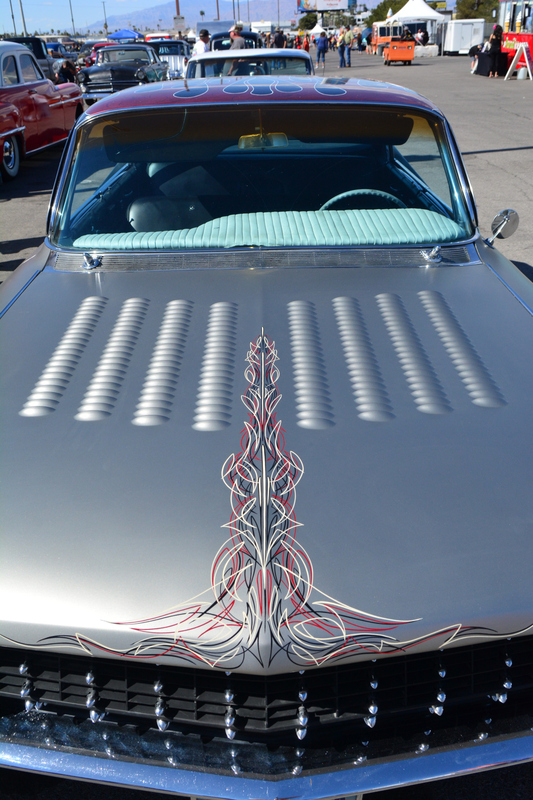 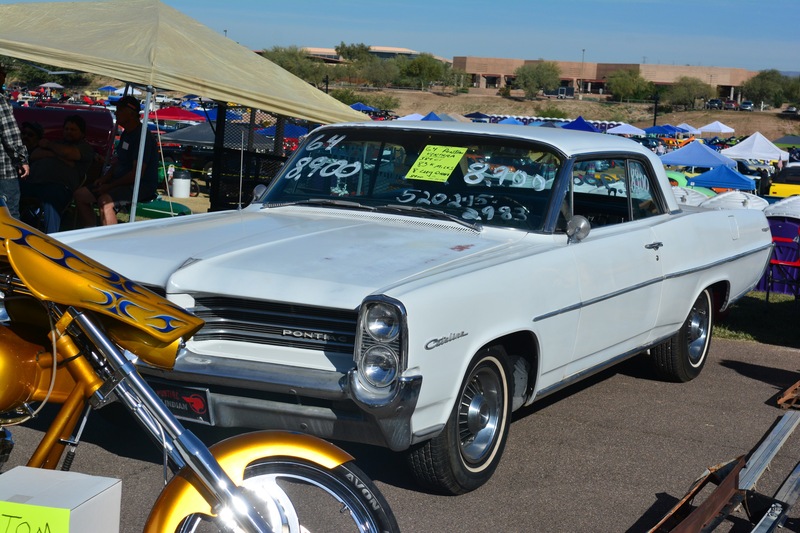 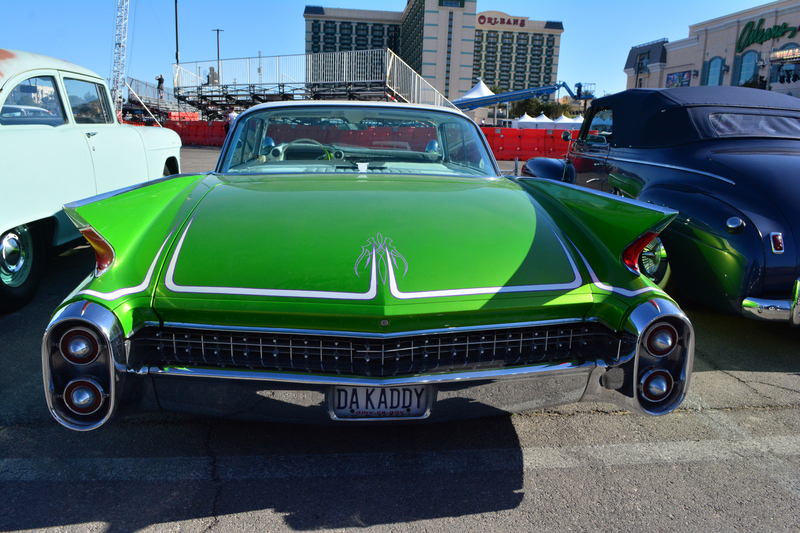 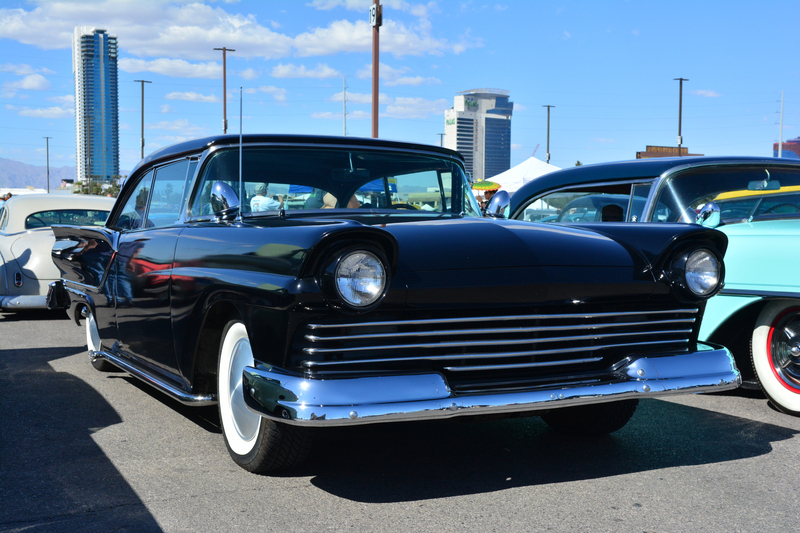 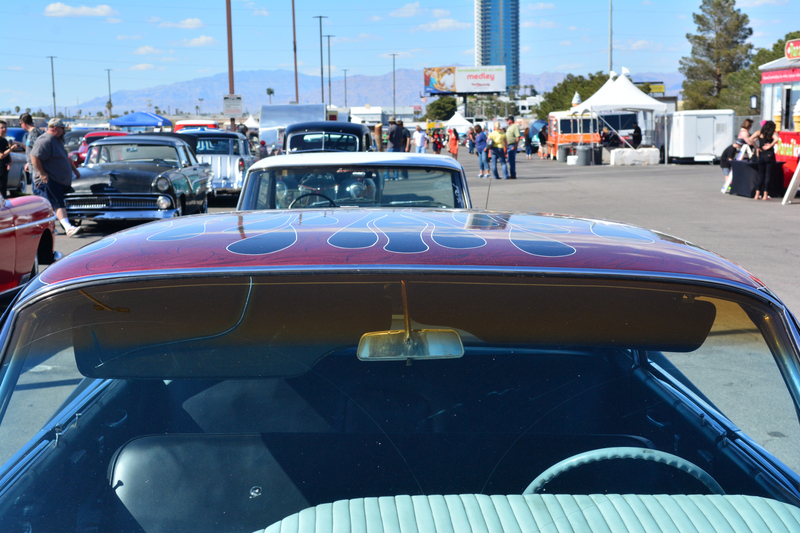 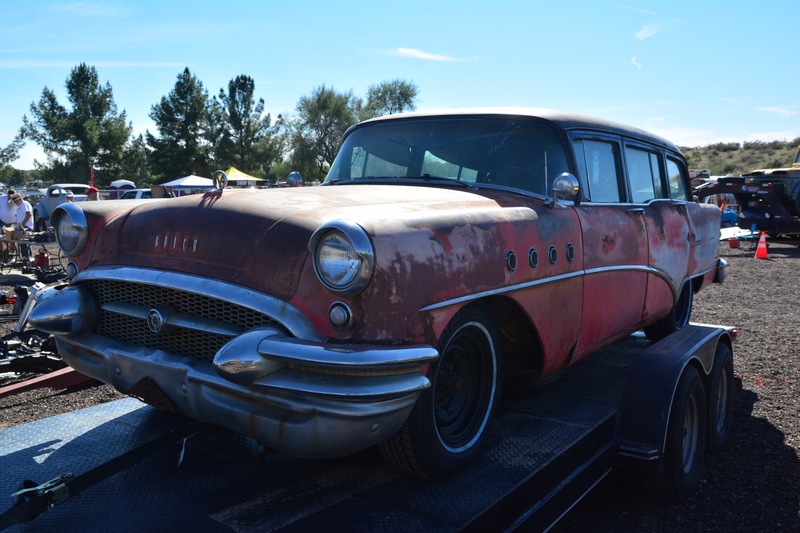 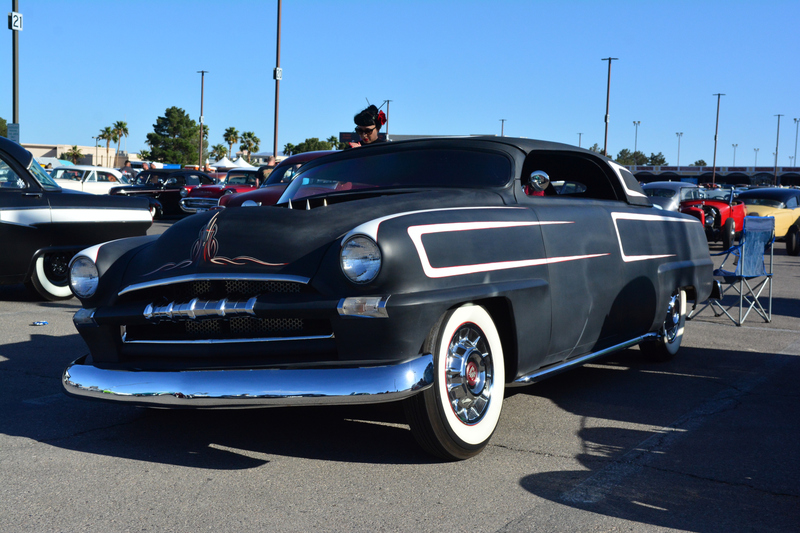 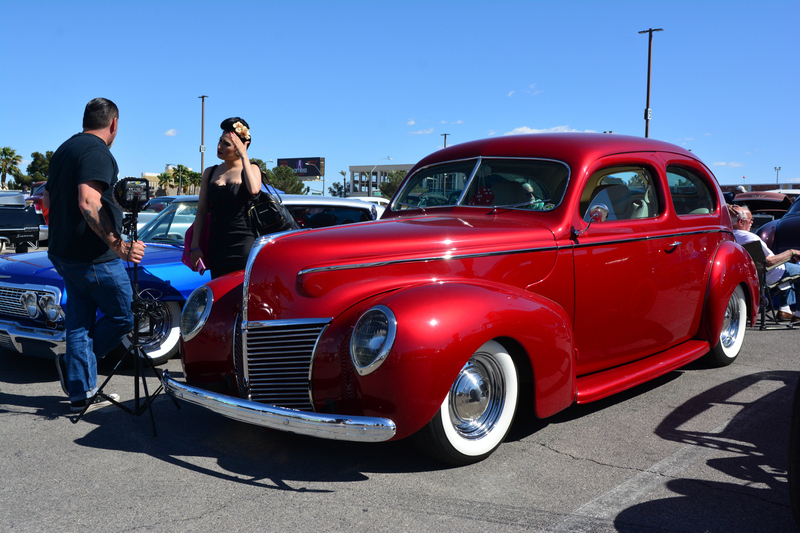 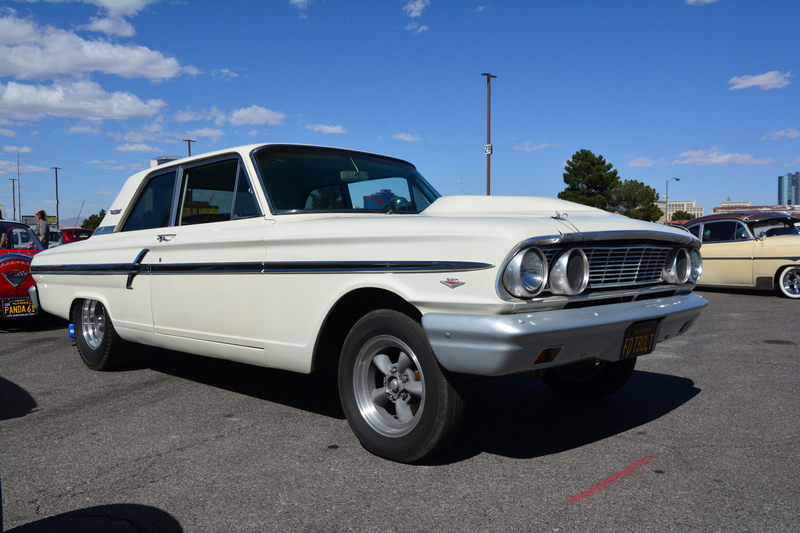 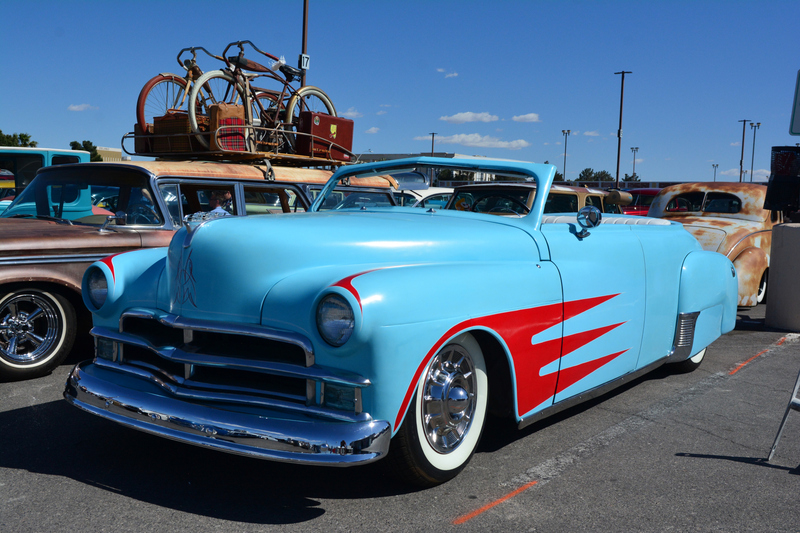 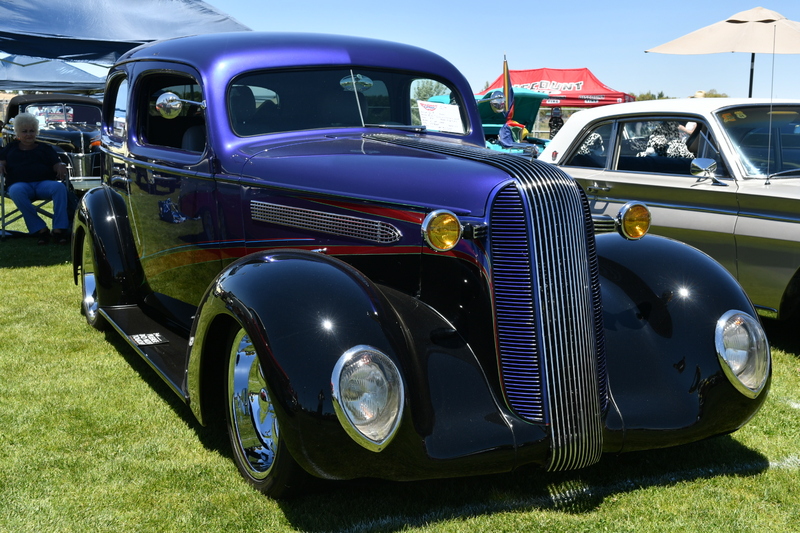 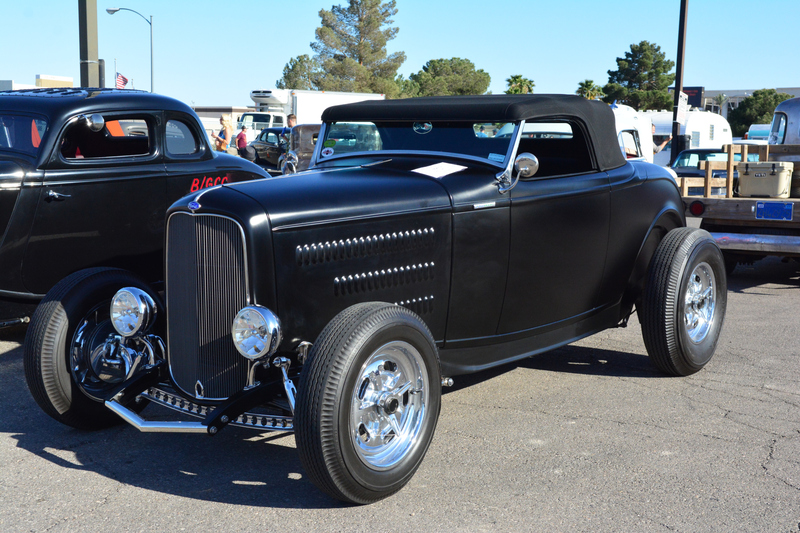 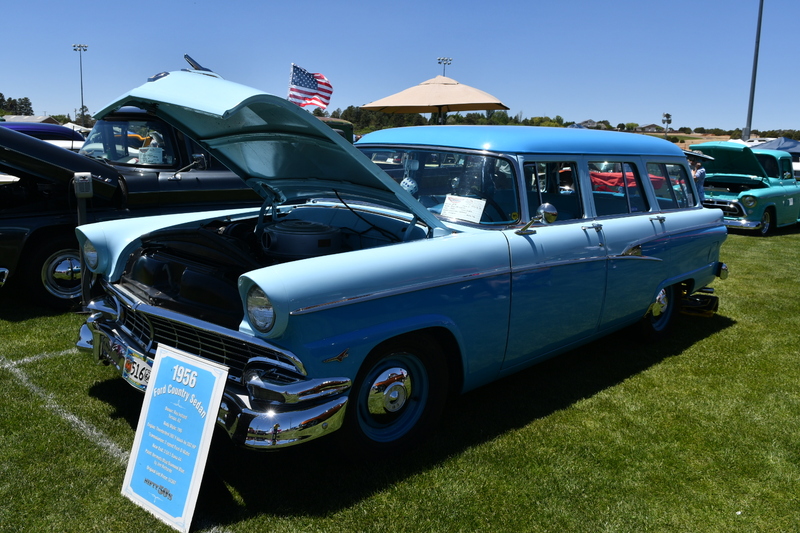 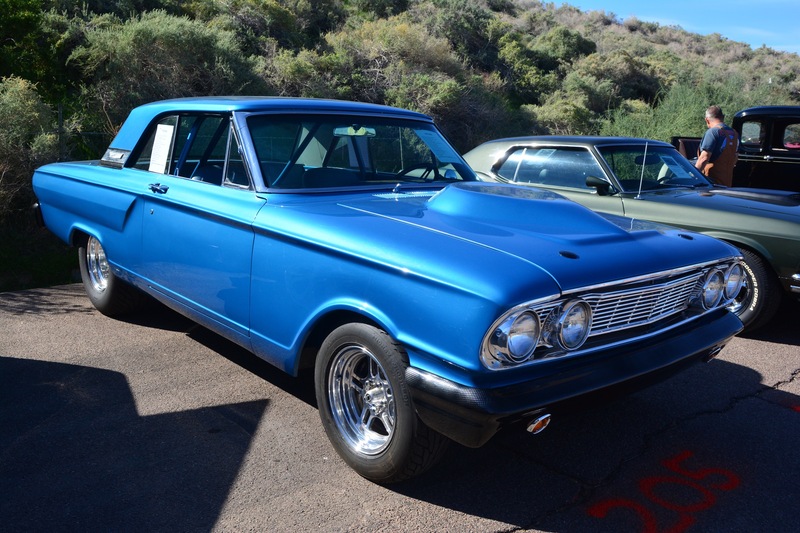 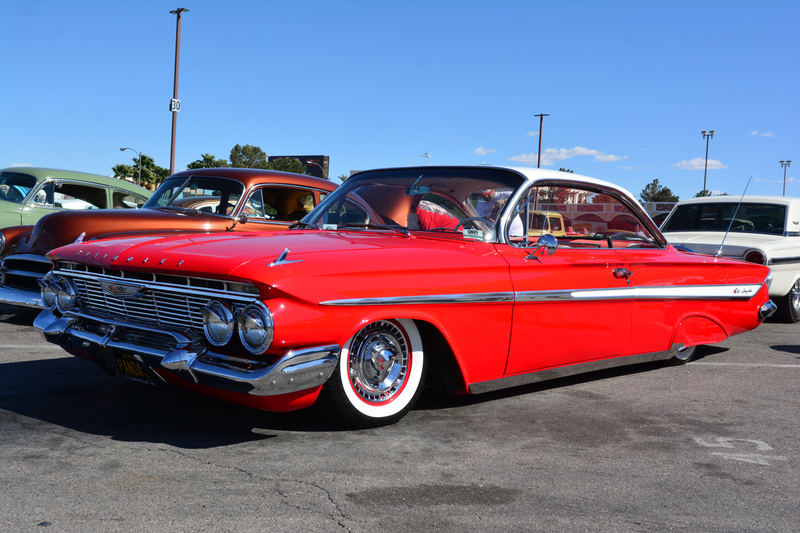 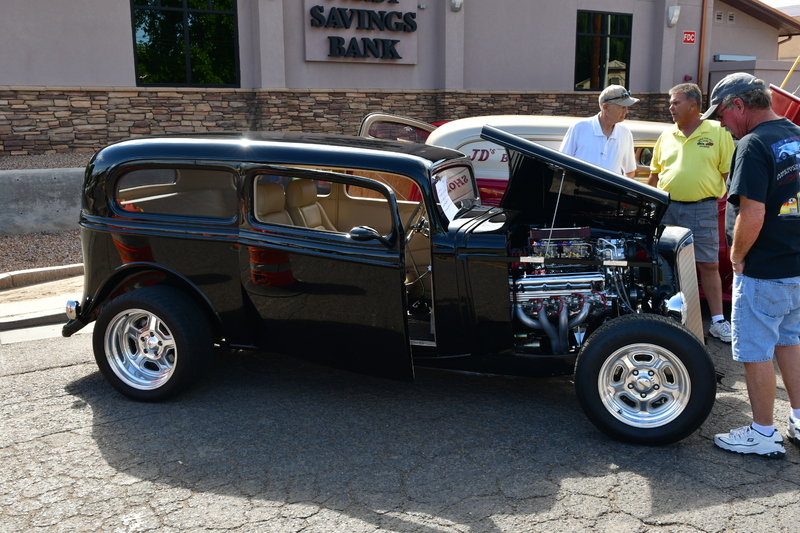 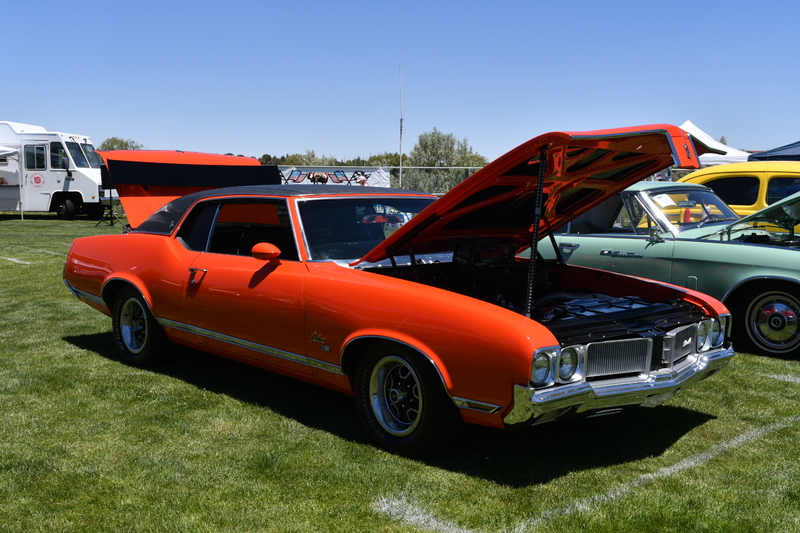 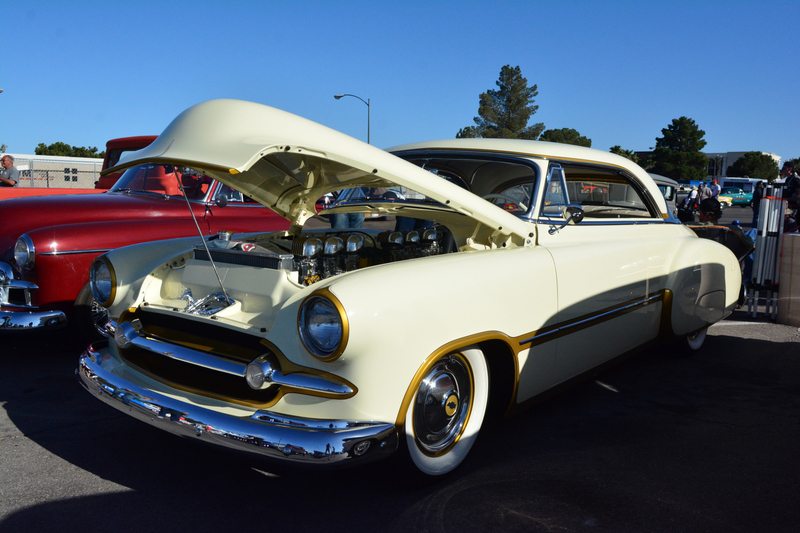 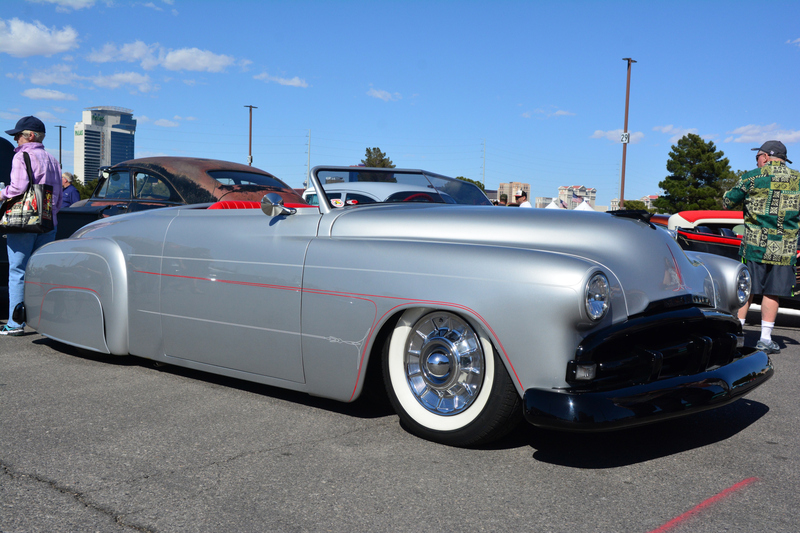 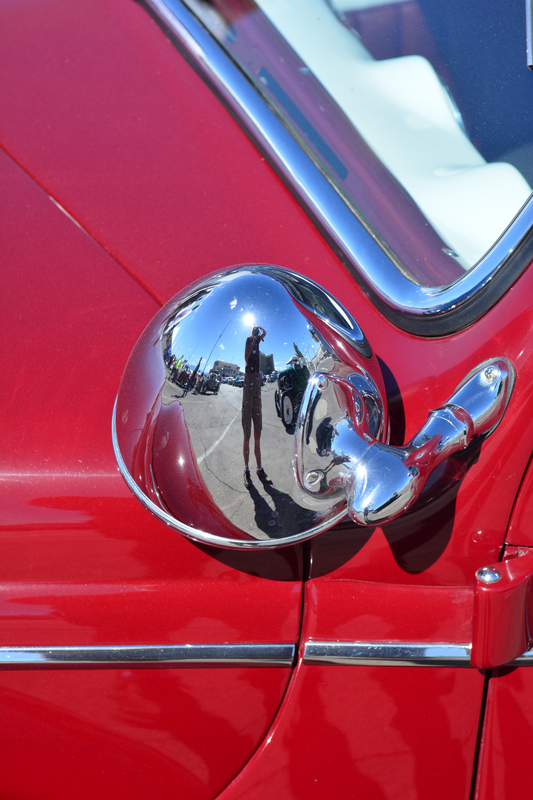 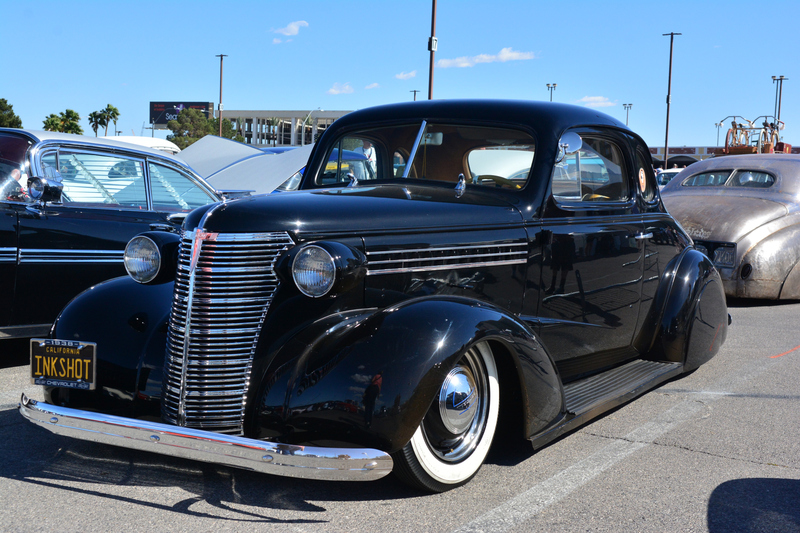 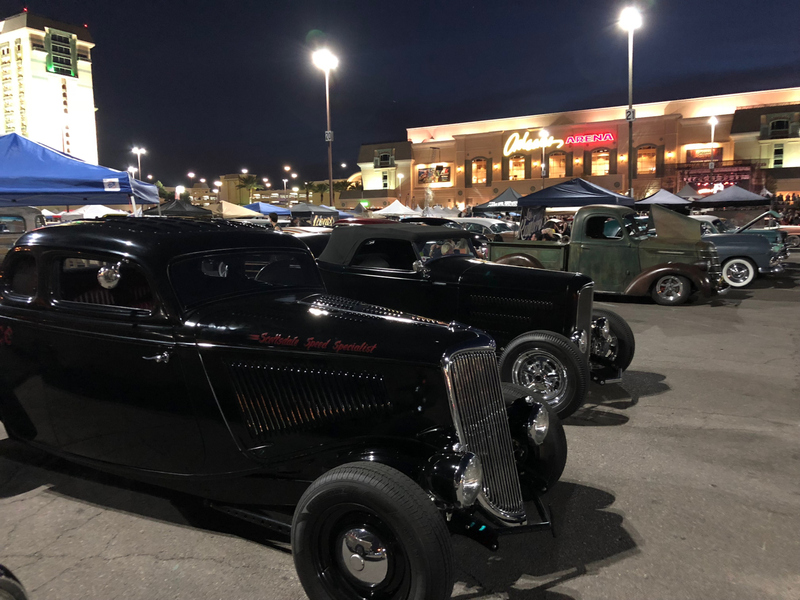 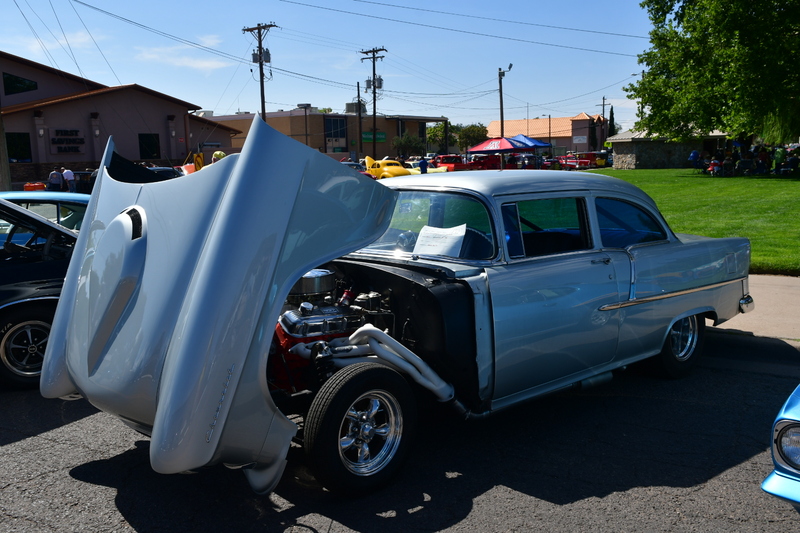 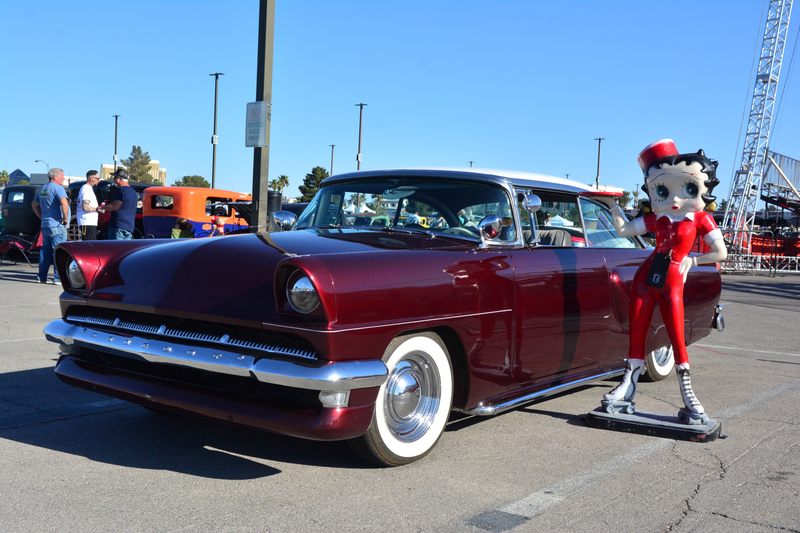 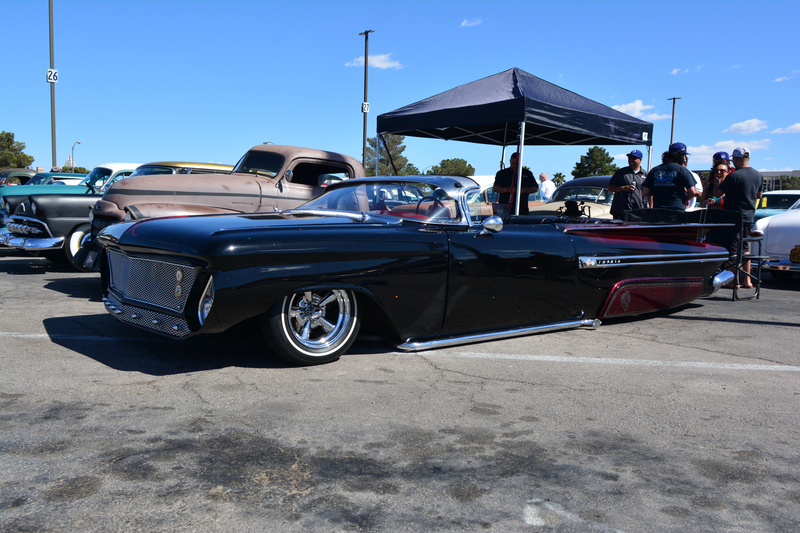 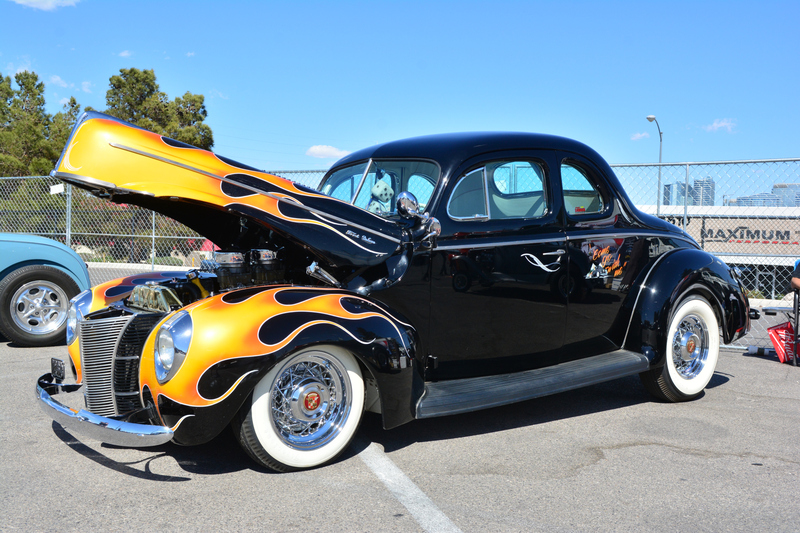 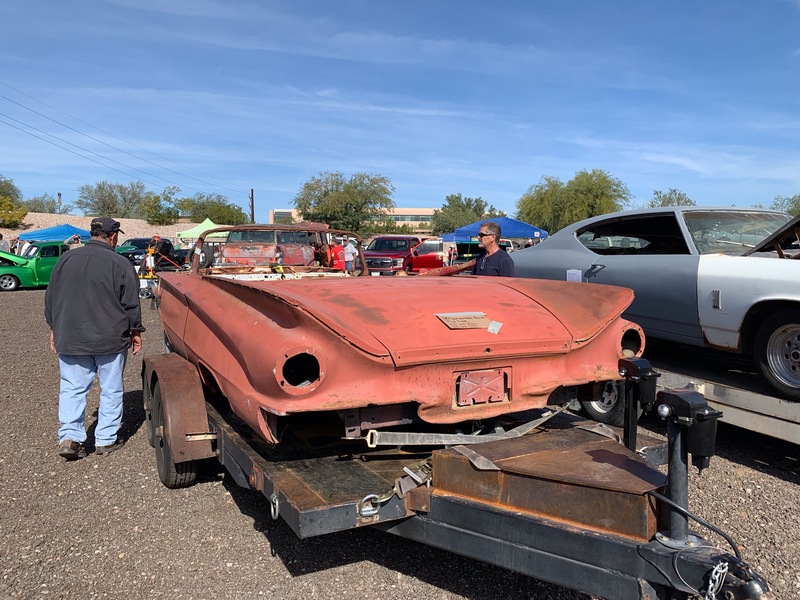 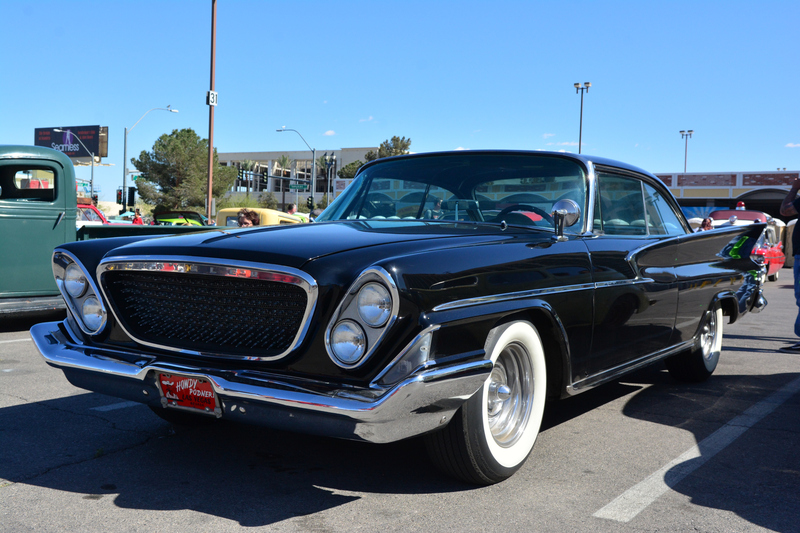 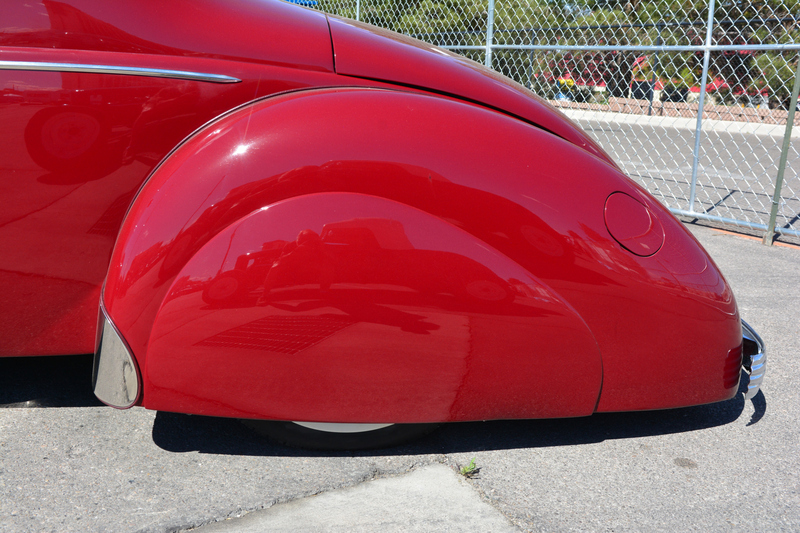 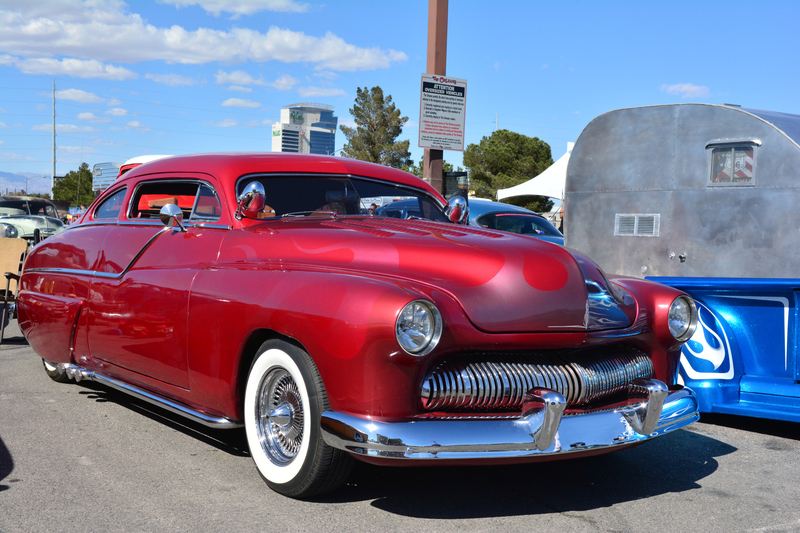 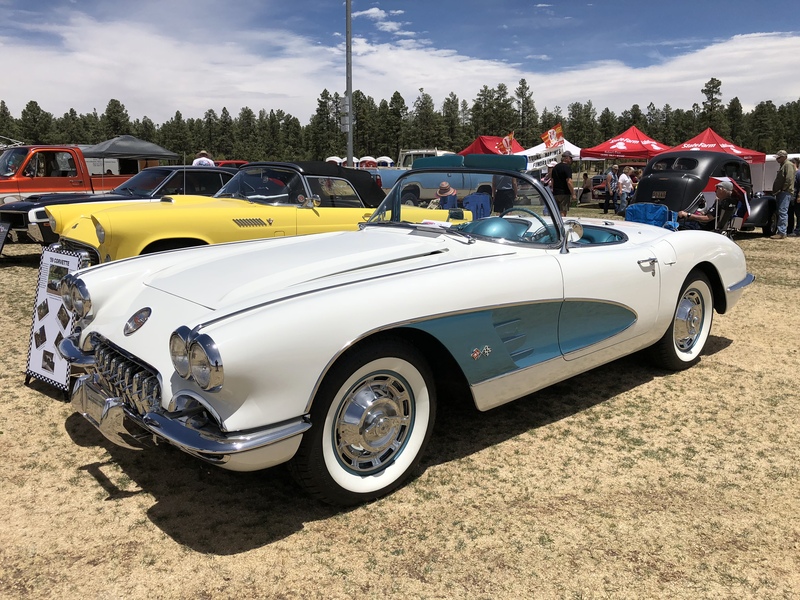 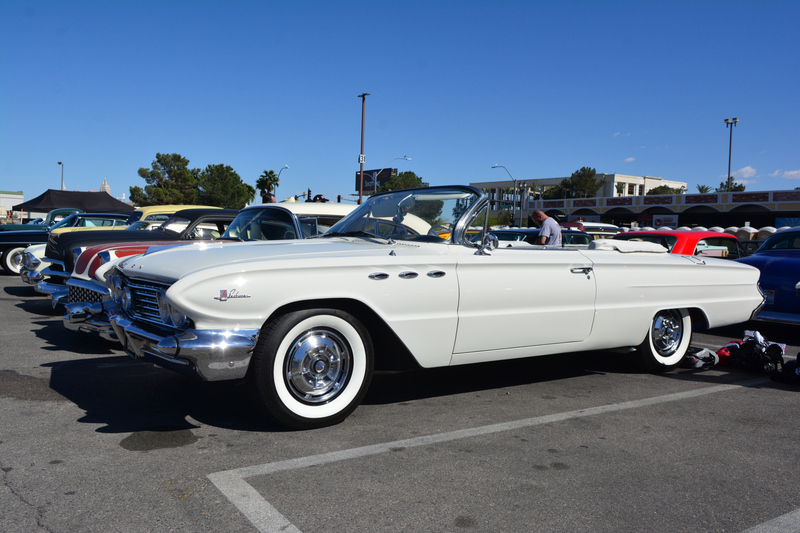 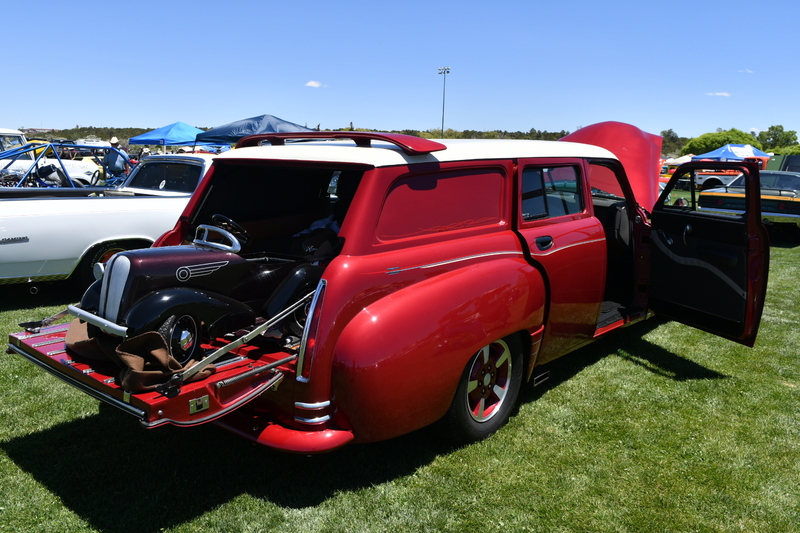 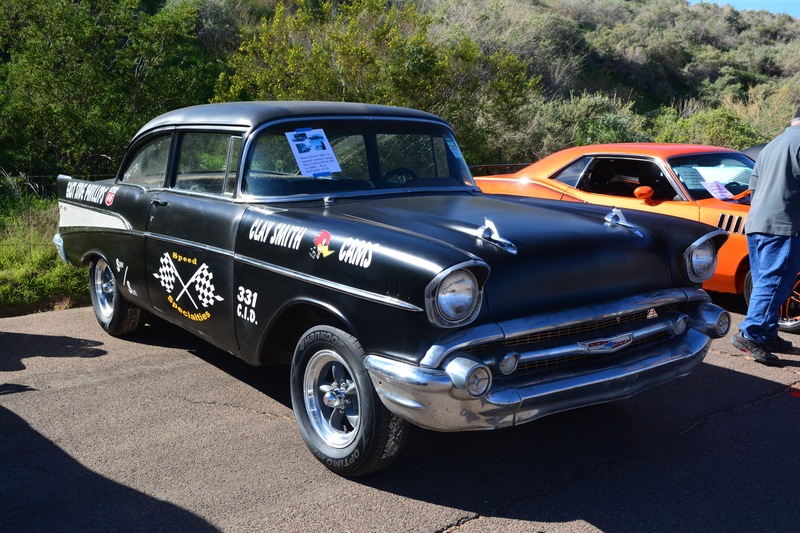 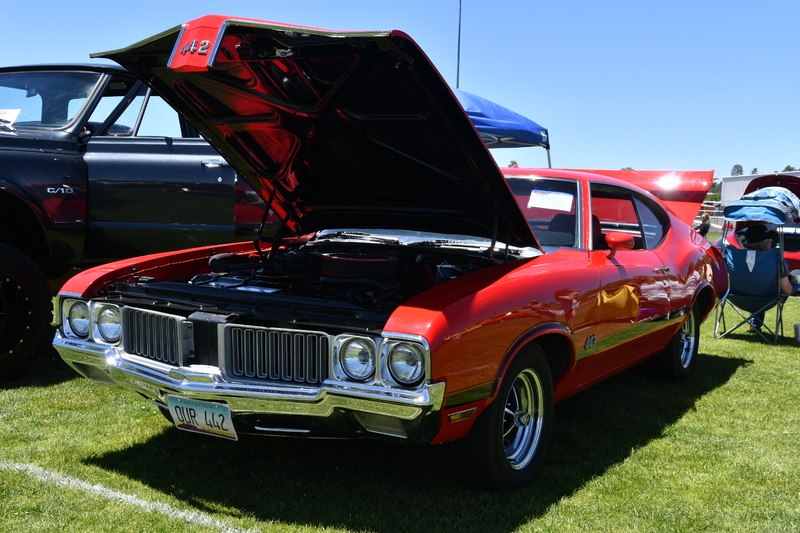 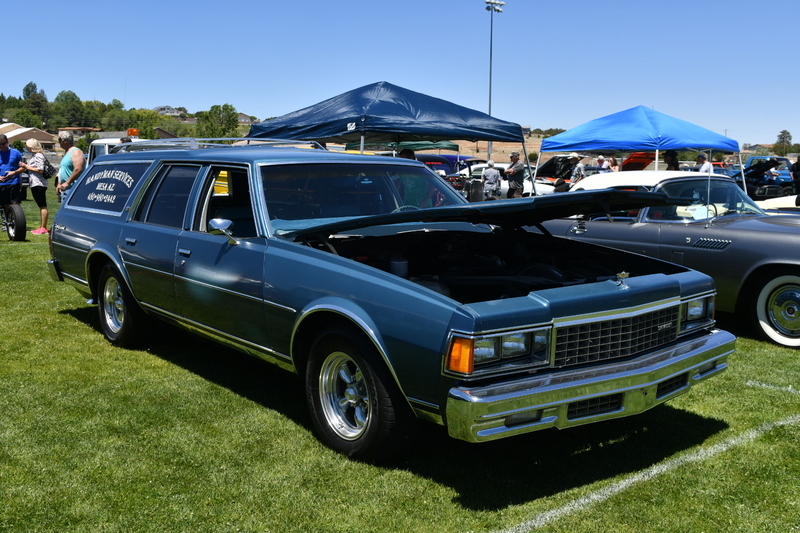 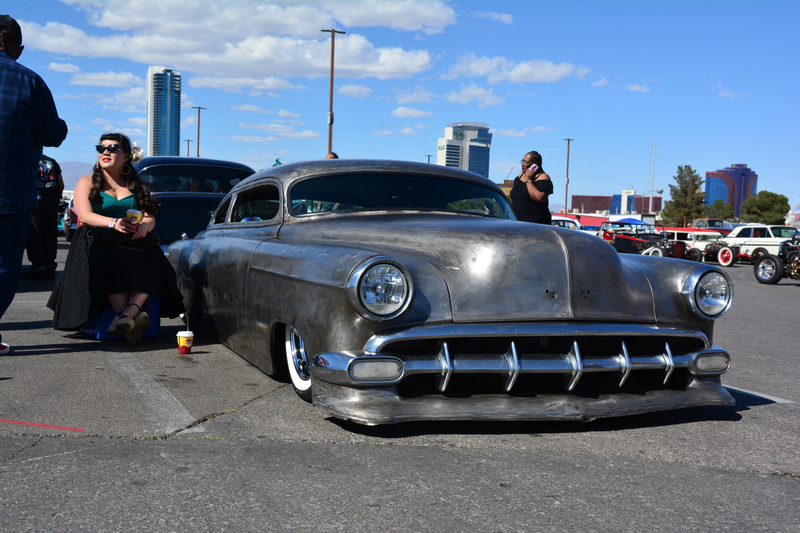 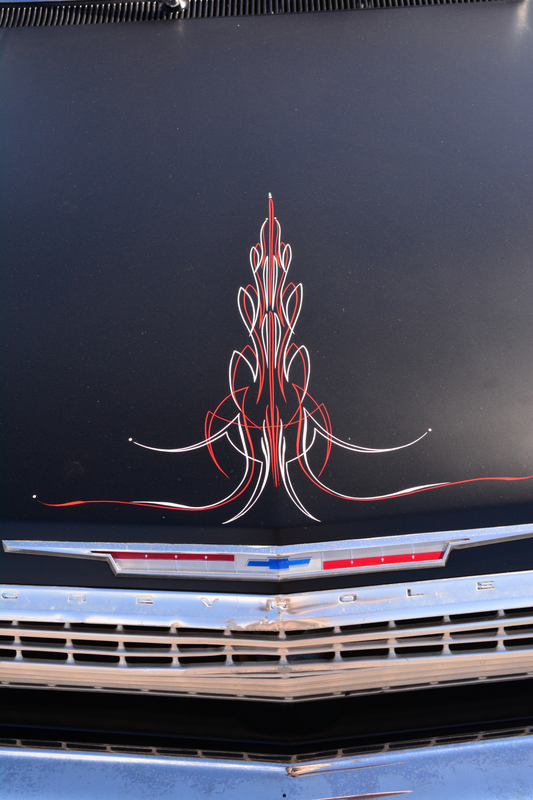 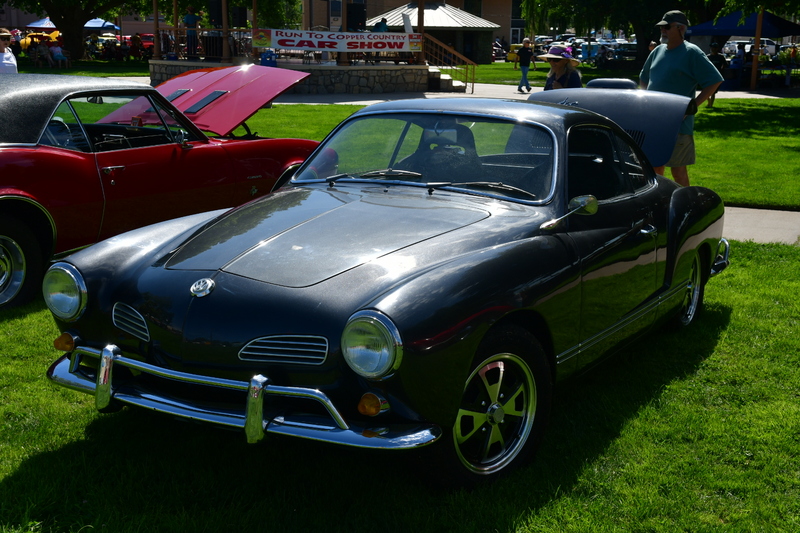 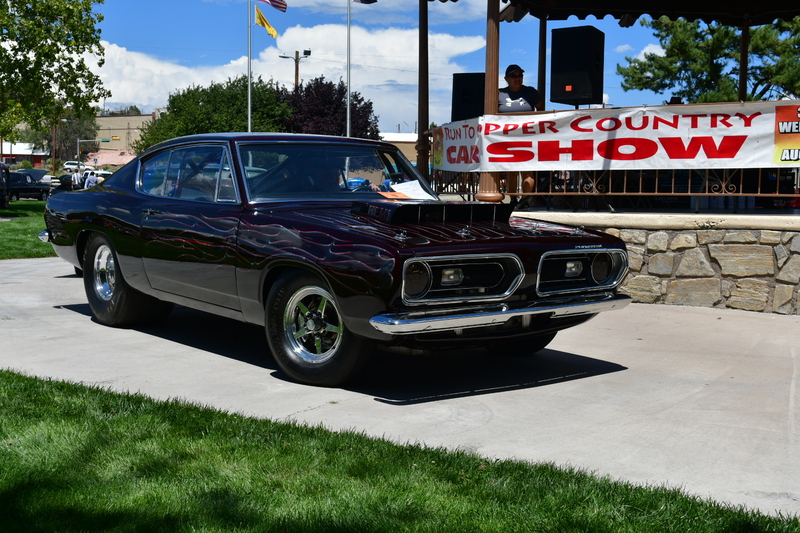 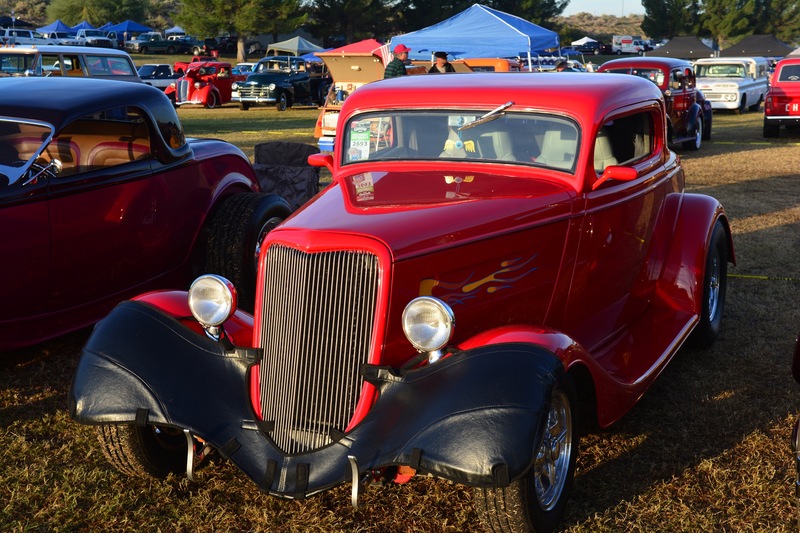 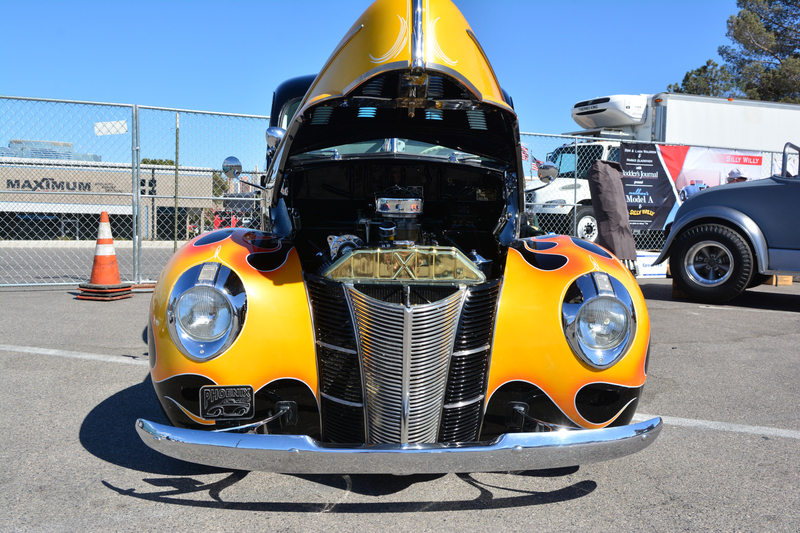 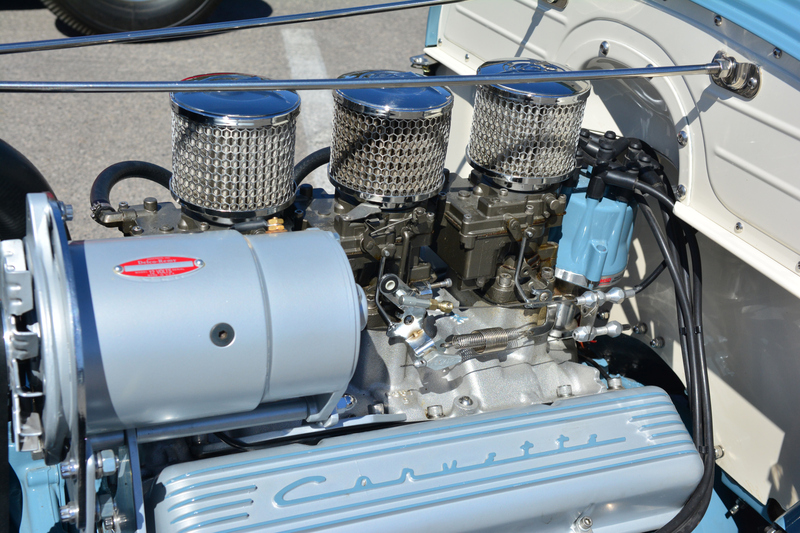 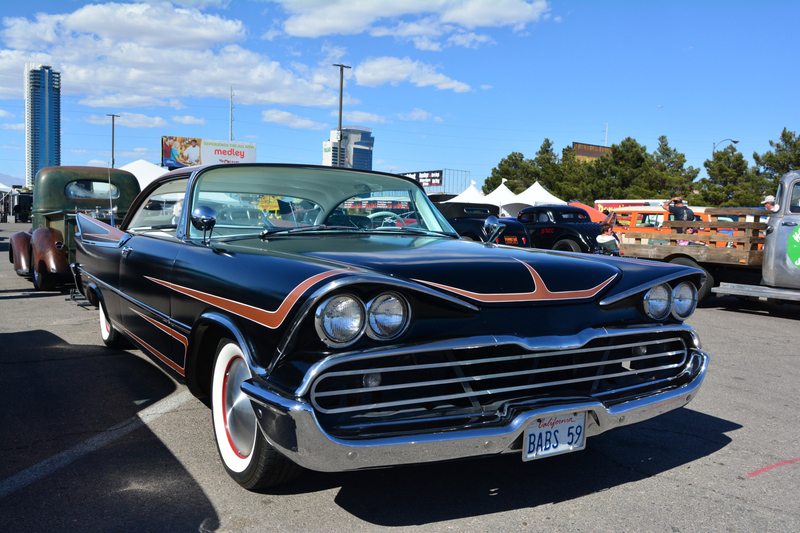 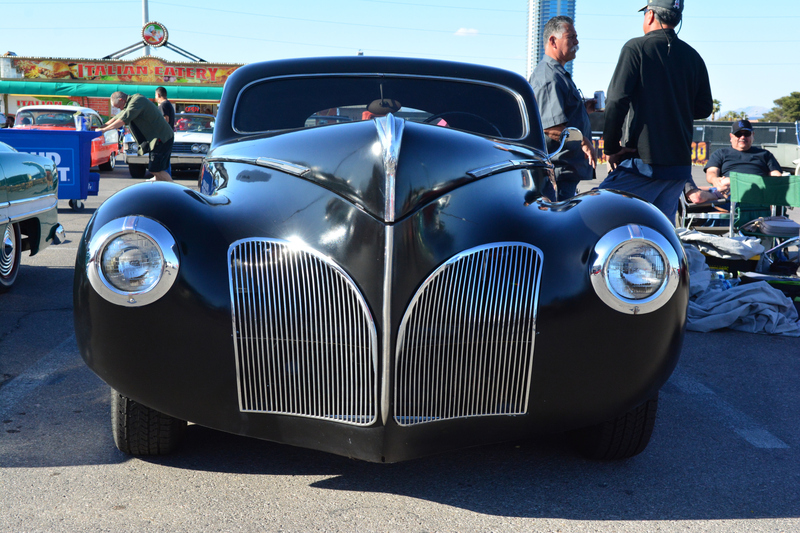 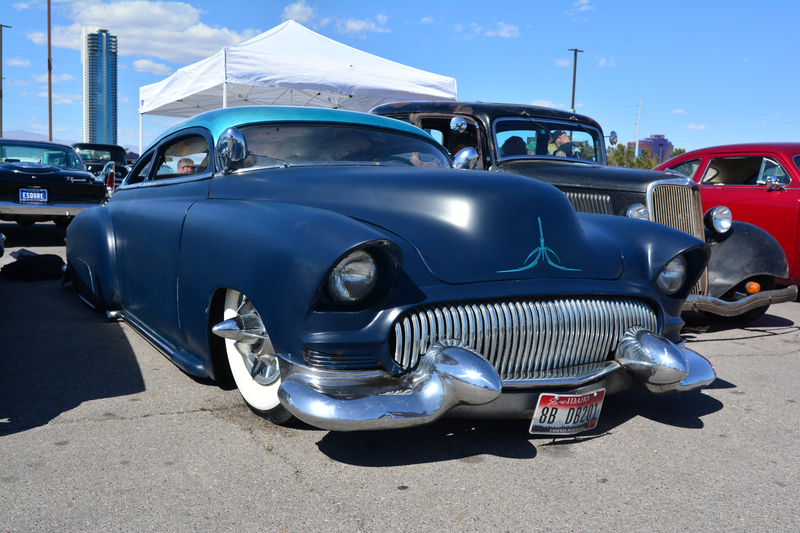 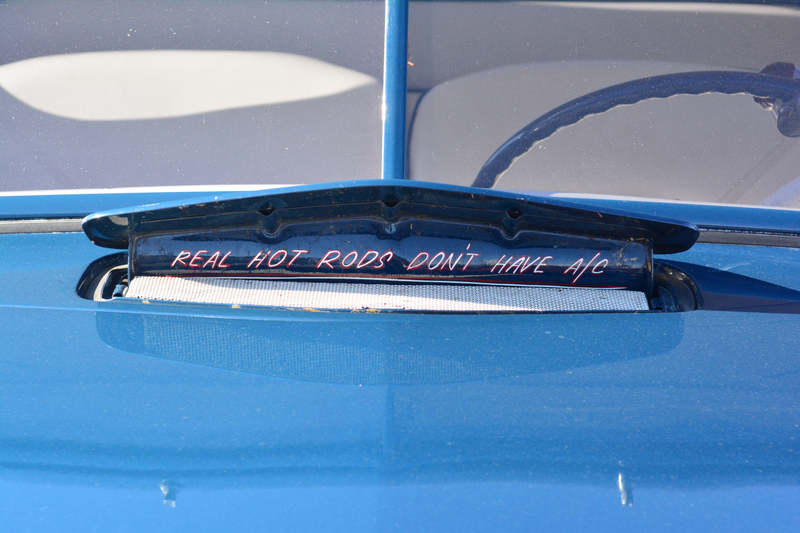 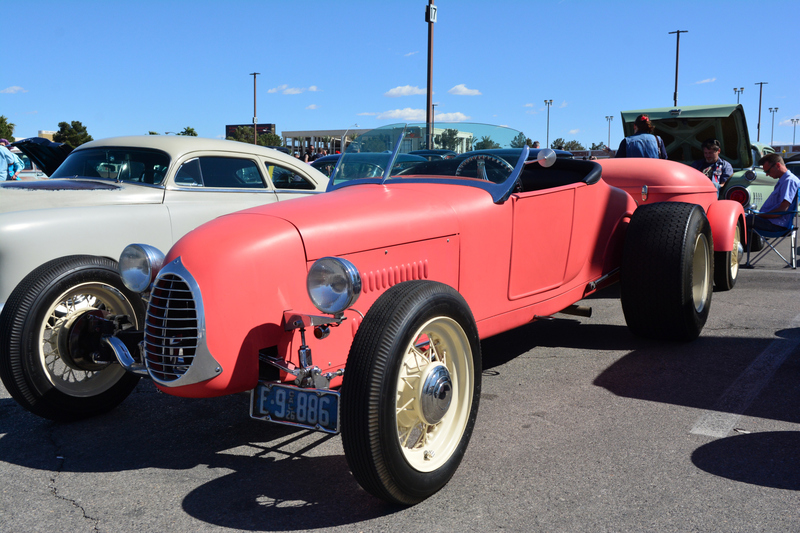 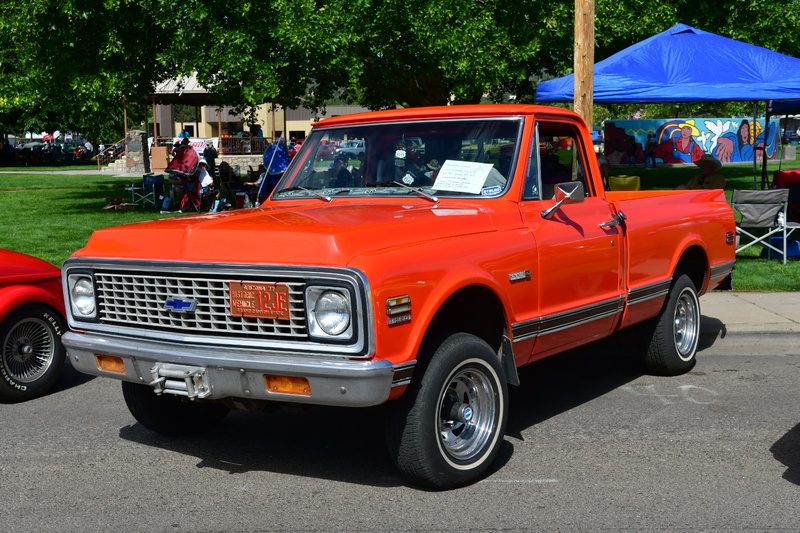 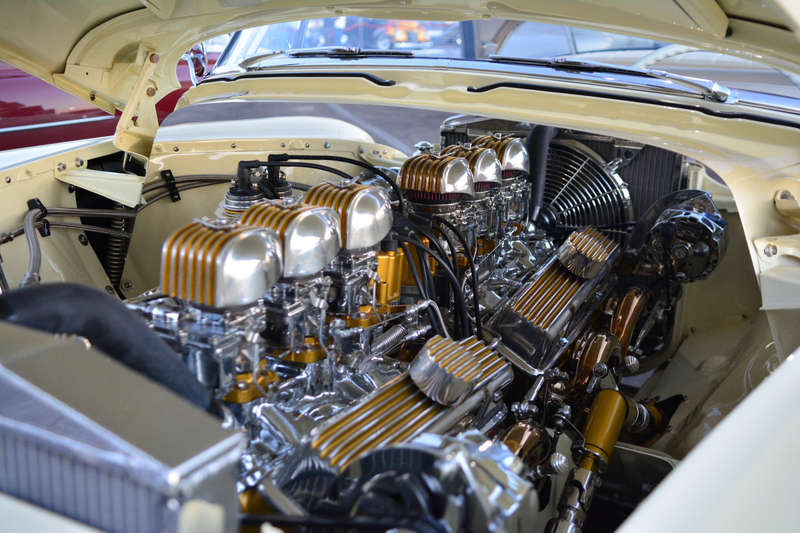 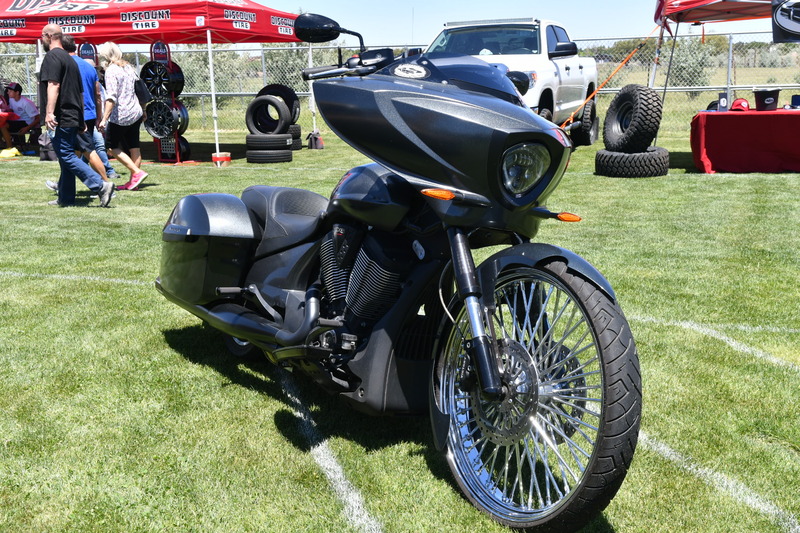 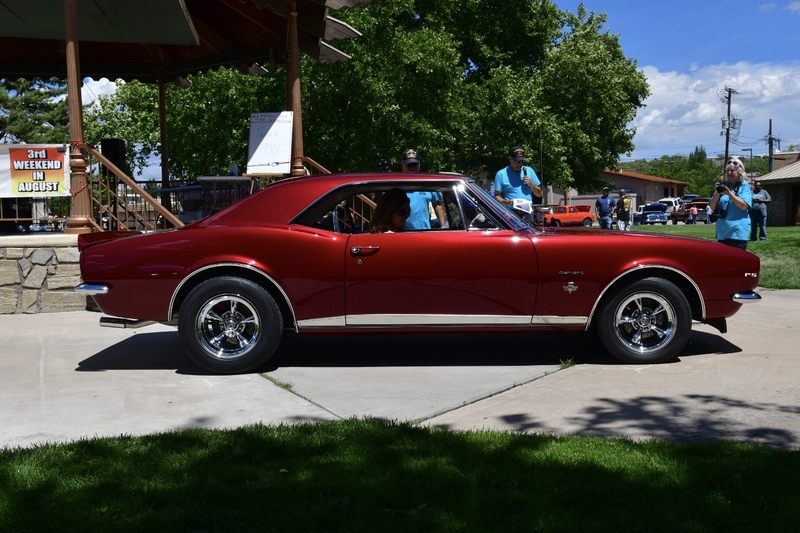 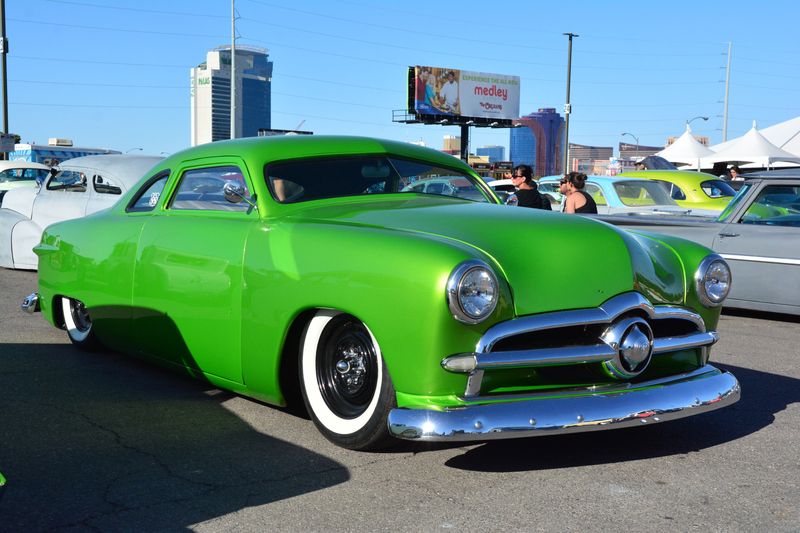 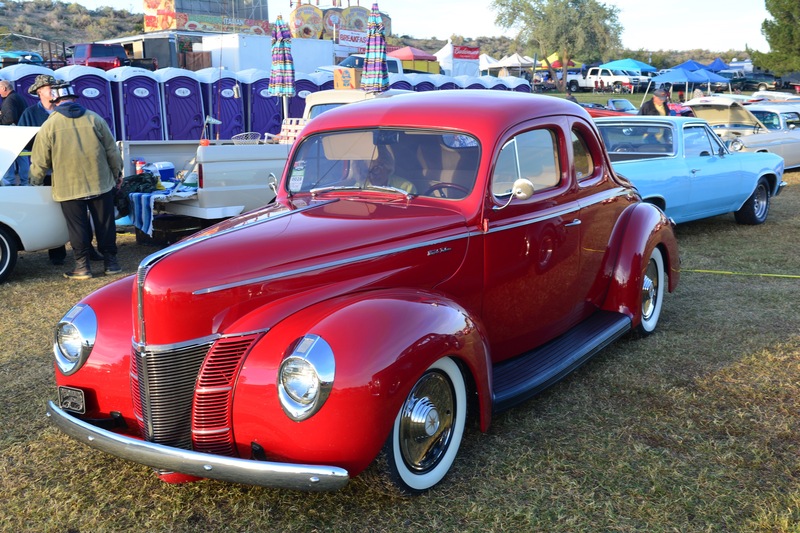 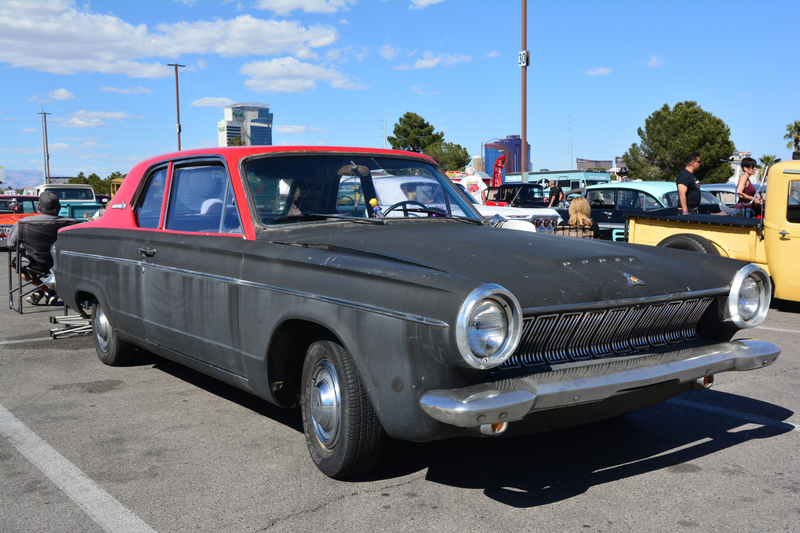 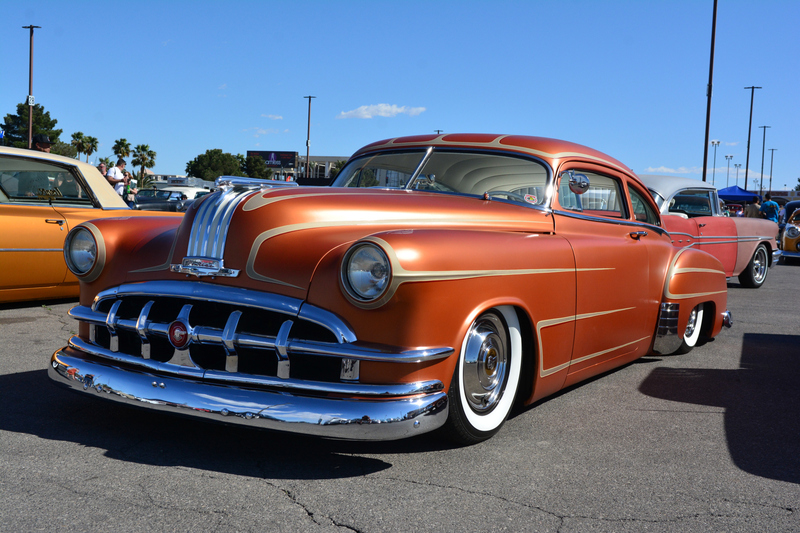 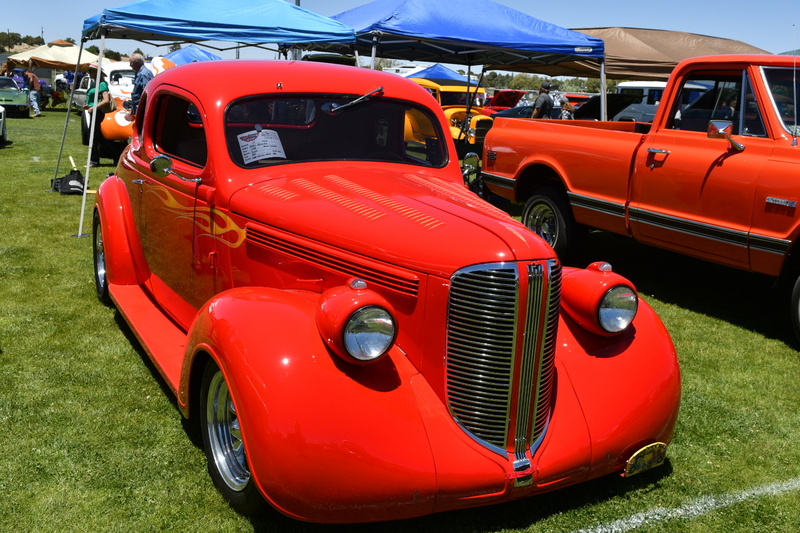 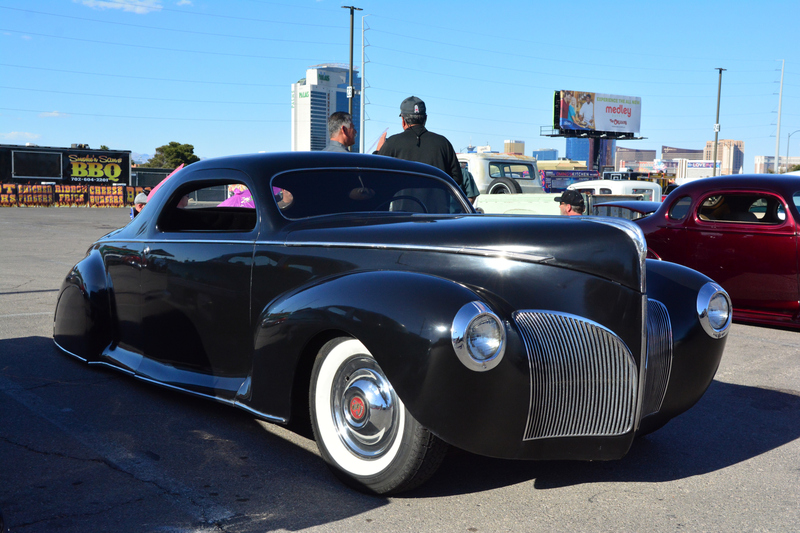 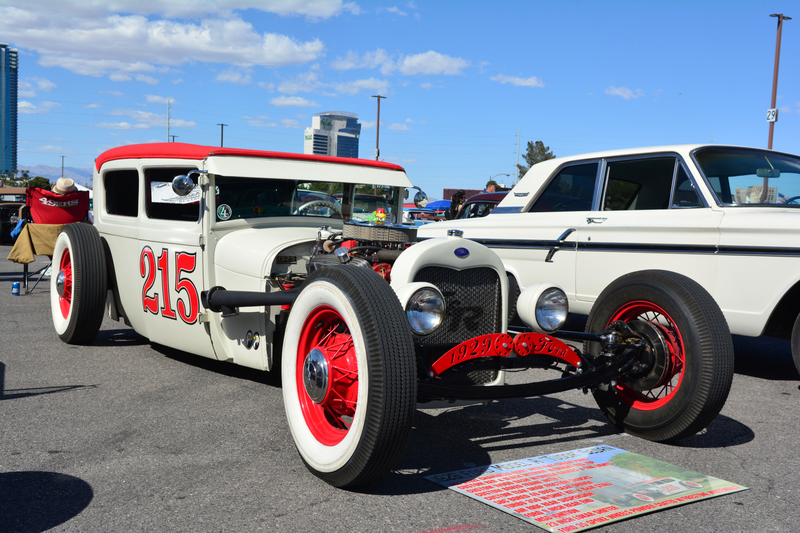 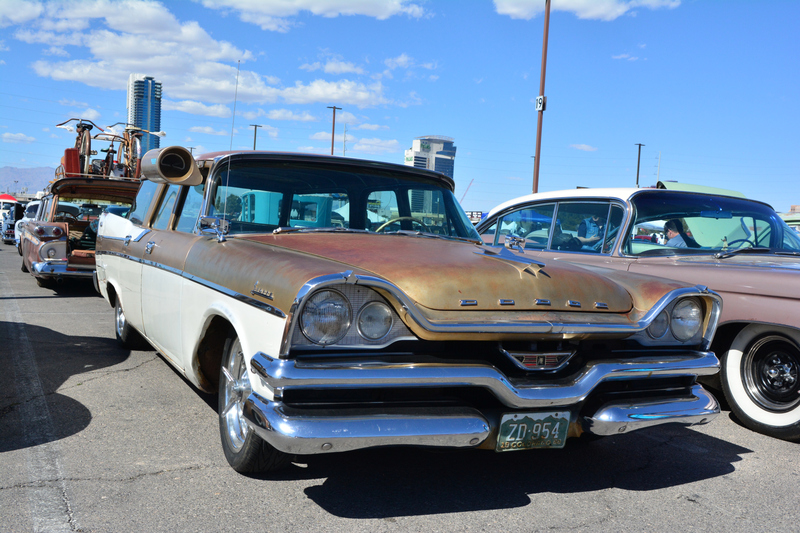 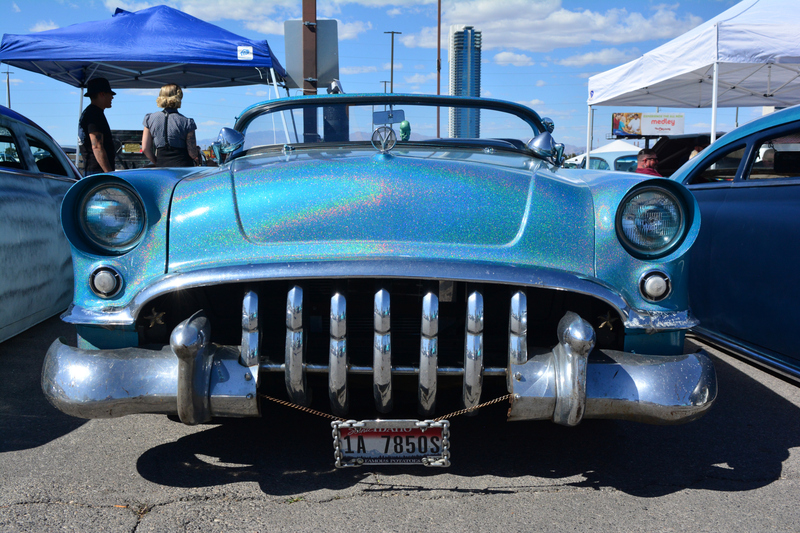 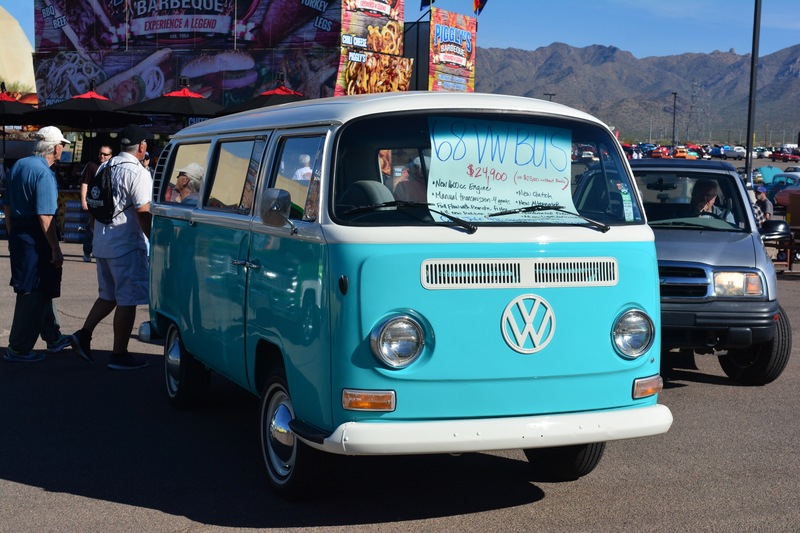 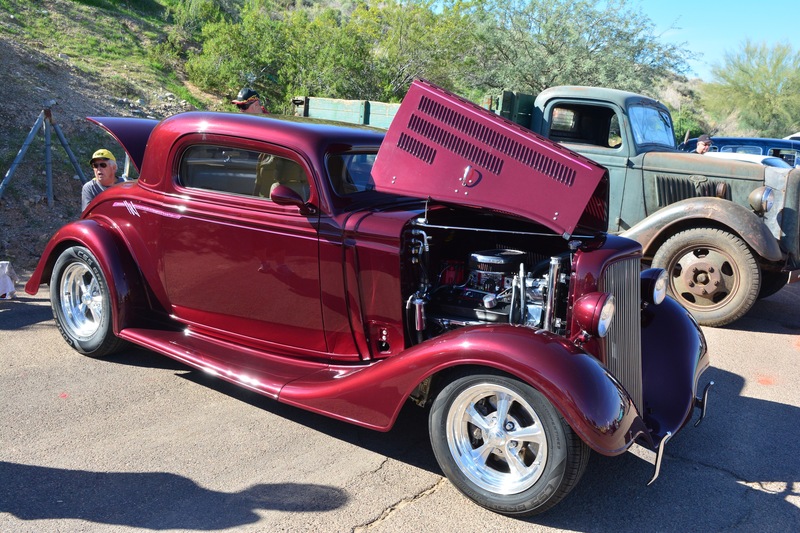 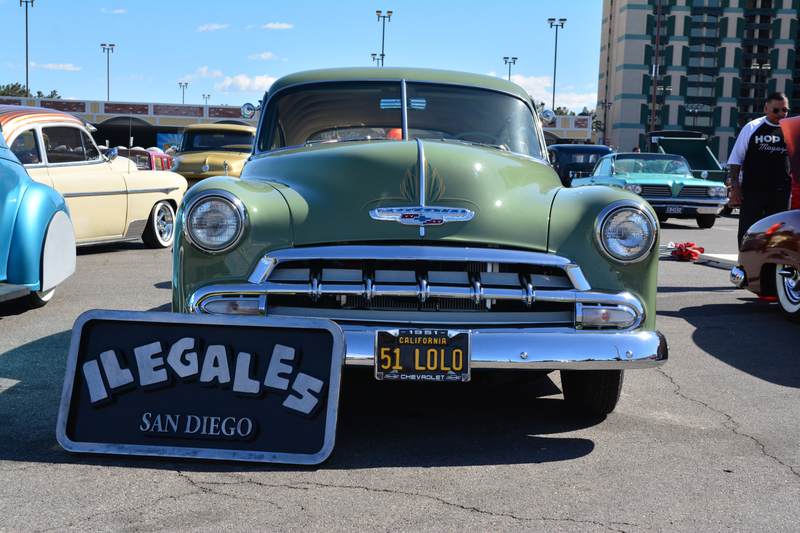 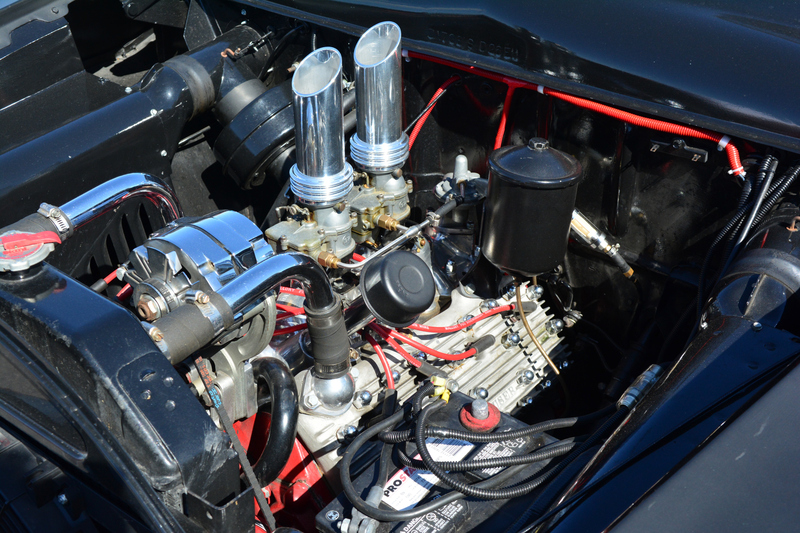 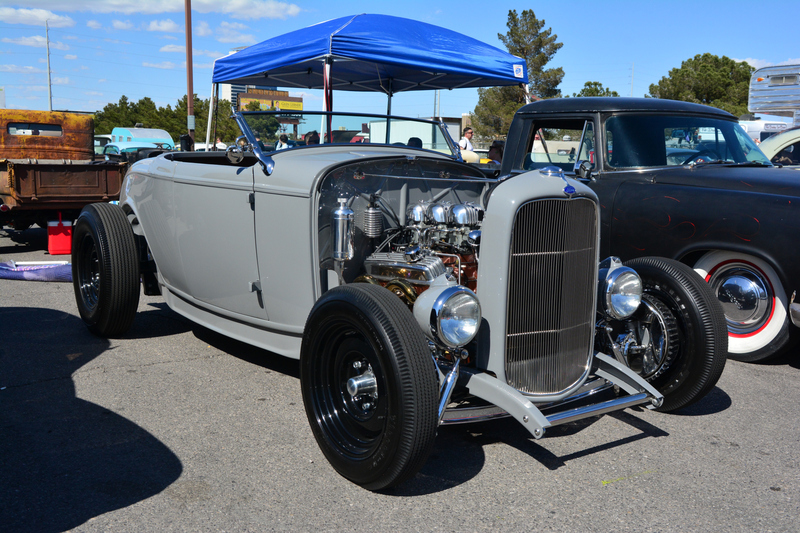 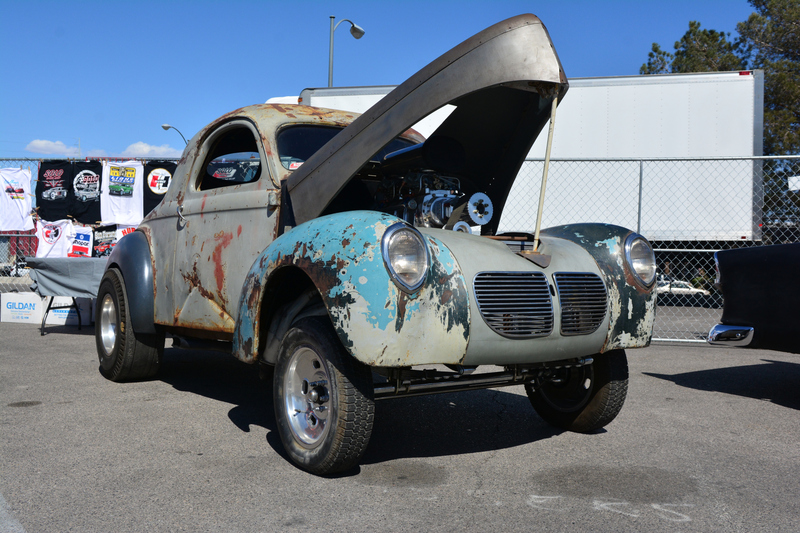 This year’s Goodguys Show at West World in Scottsdale marks a major milestone for the club. 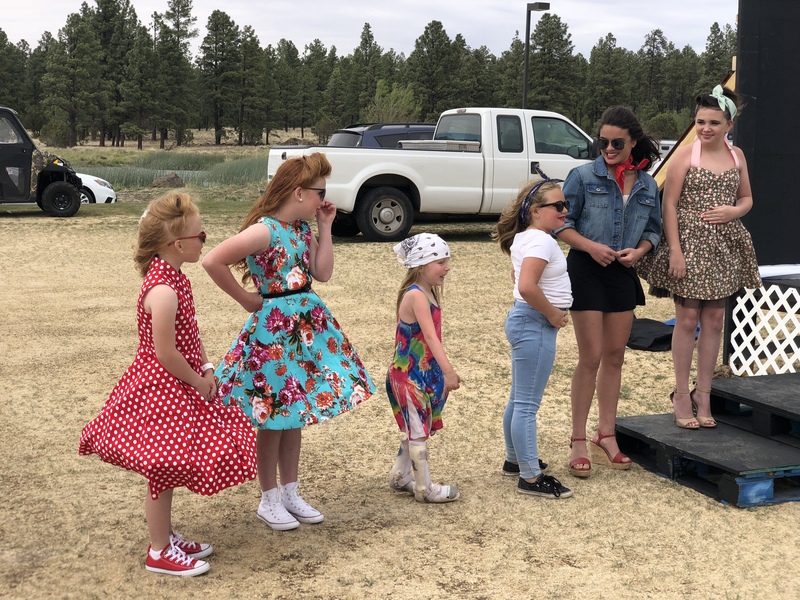 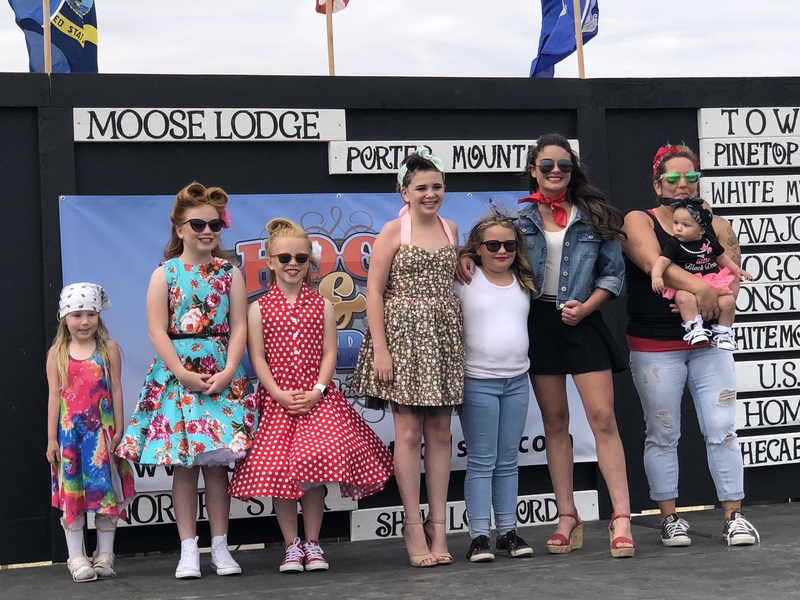 After almost 20 years of hosting the show which has grown each year, and picking up a spring show a few years ago, the club voted that enough was enough and that it was was time to move on. 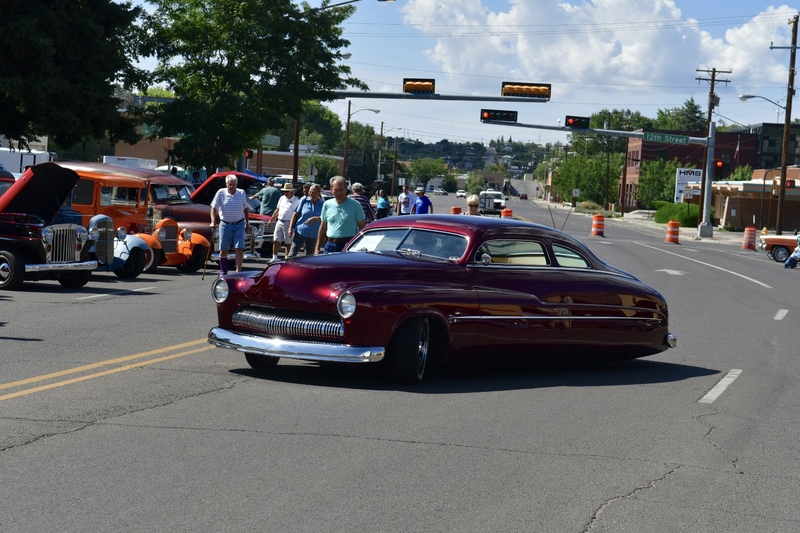 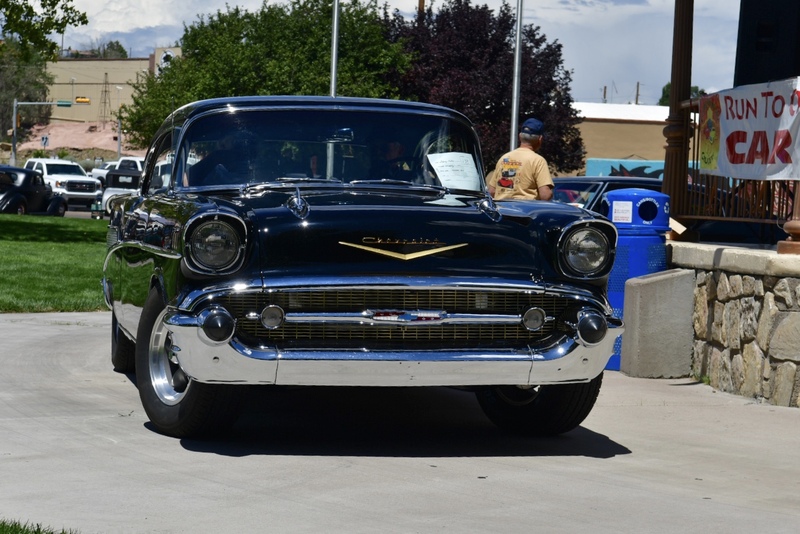 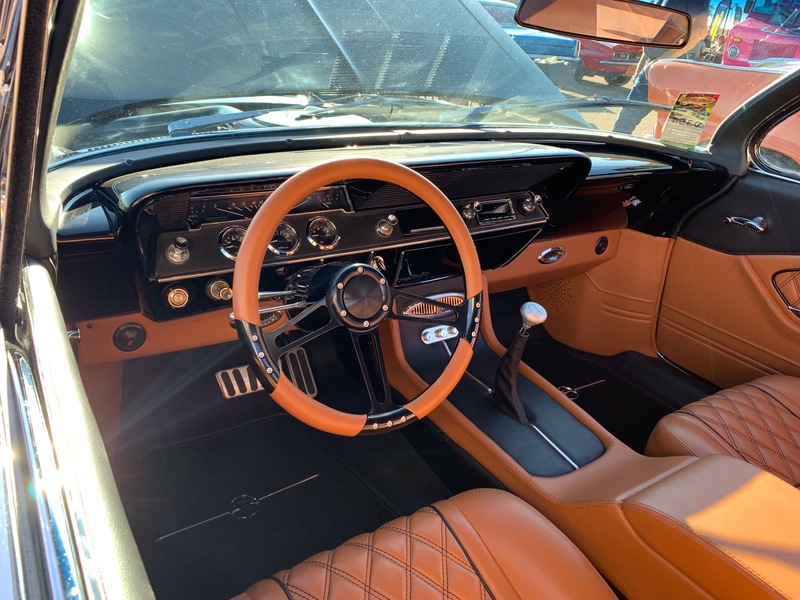 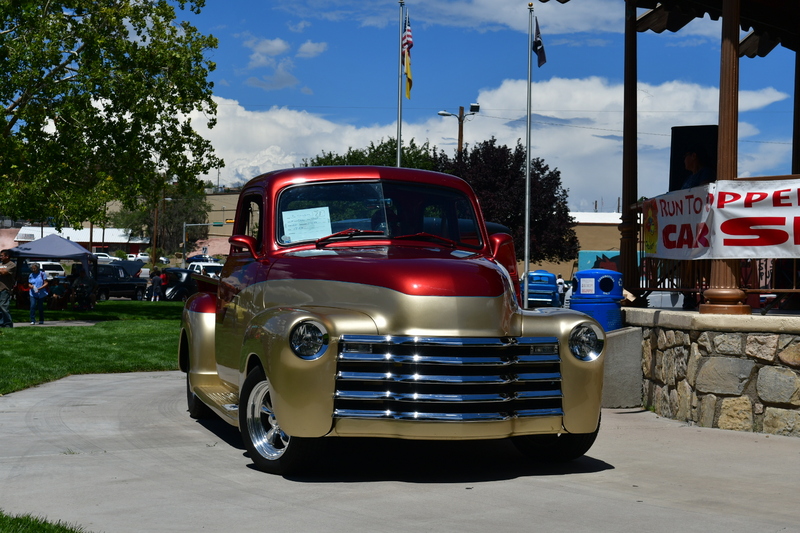 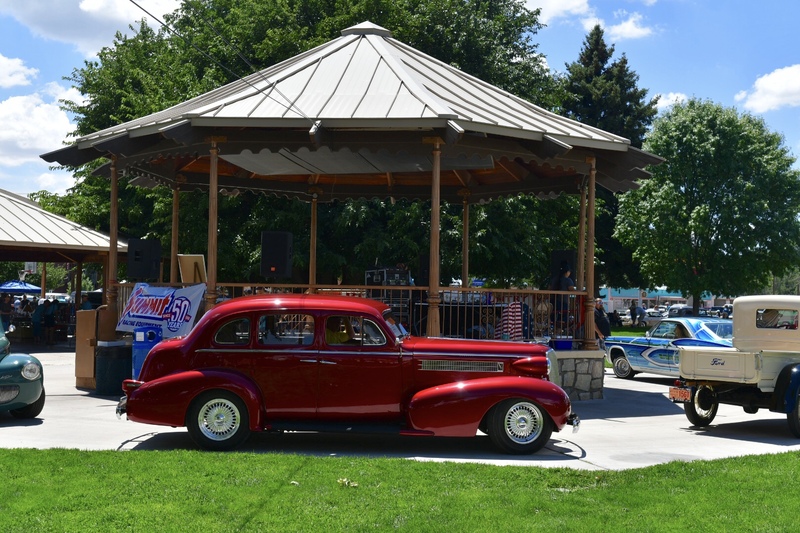 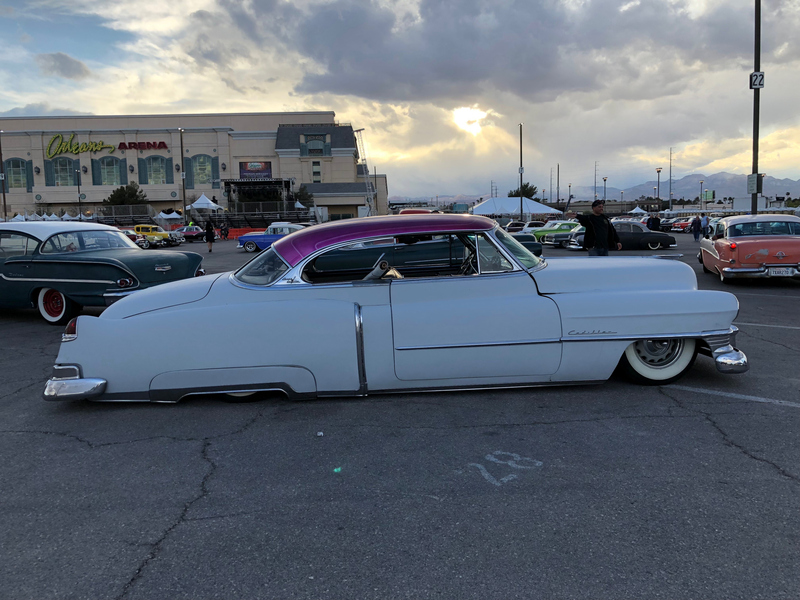 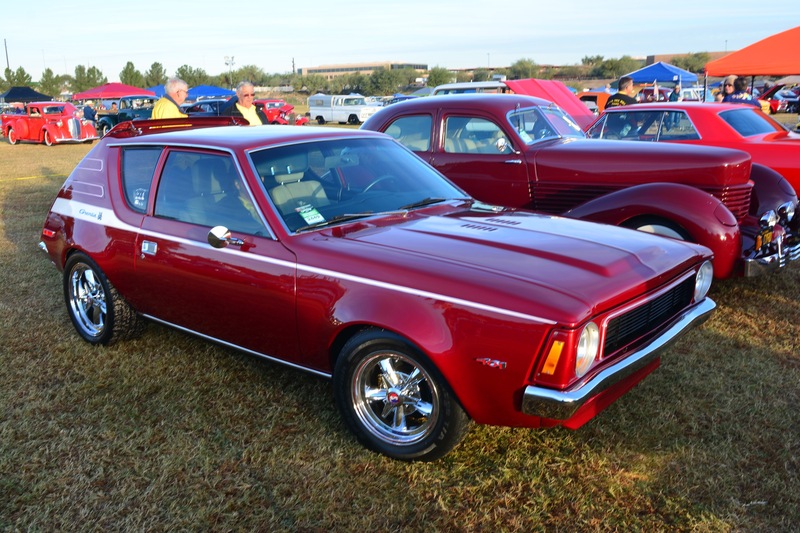 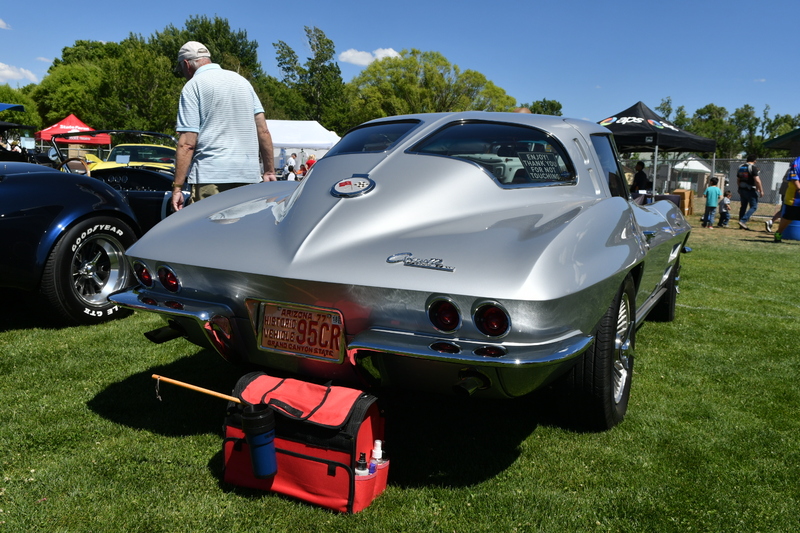 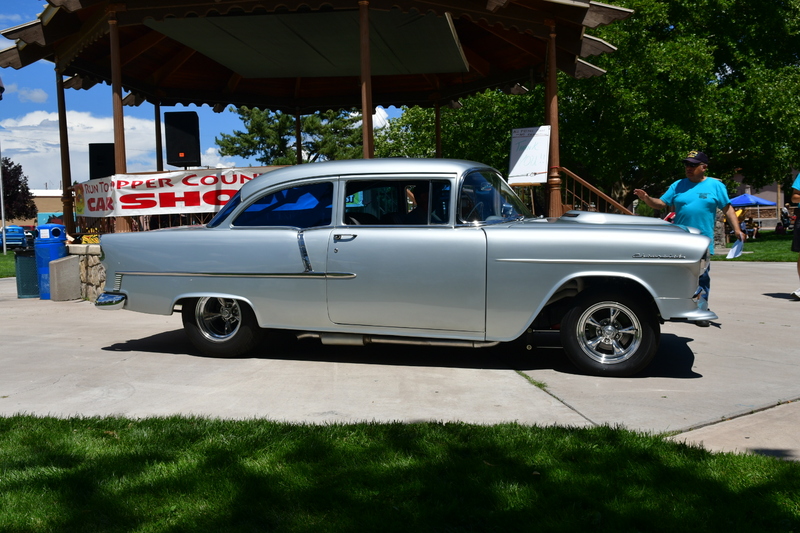 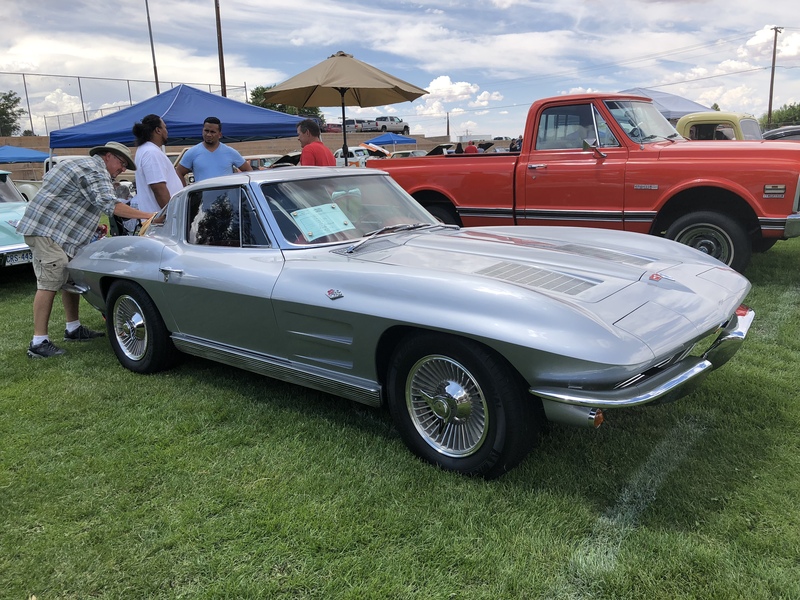 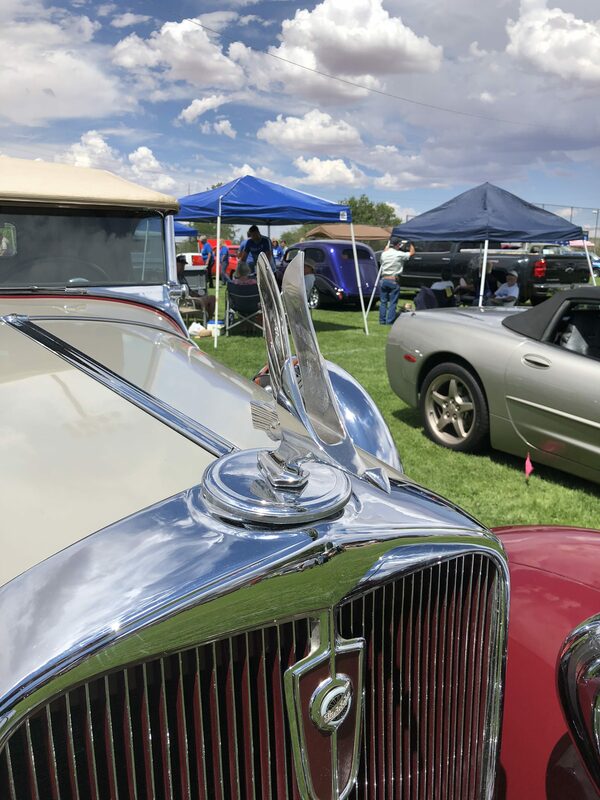 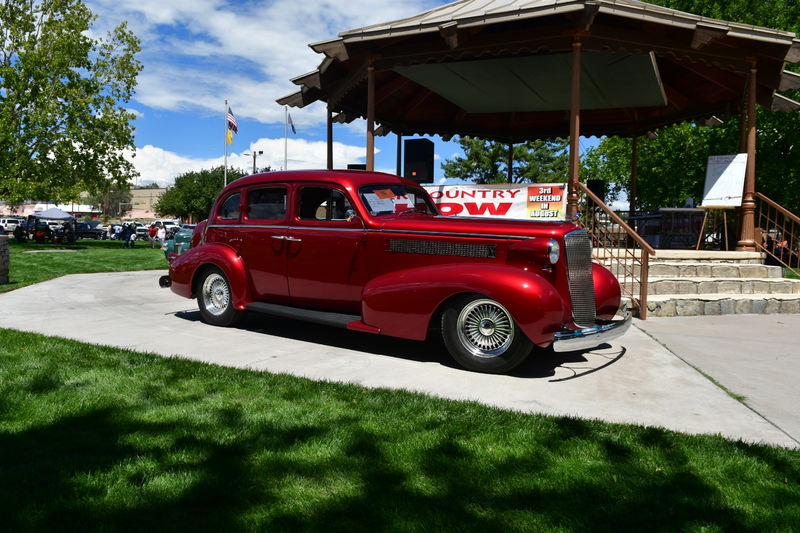 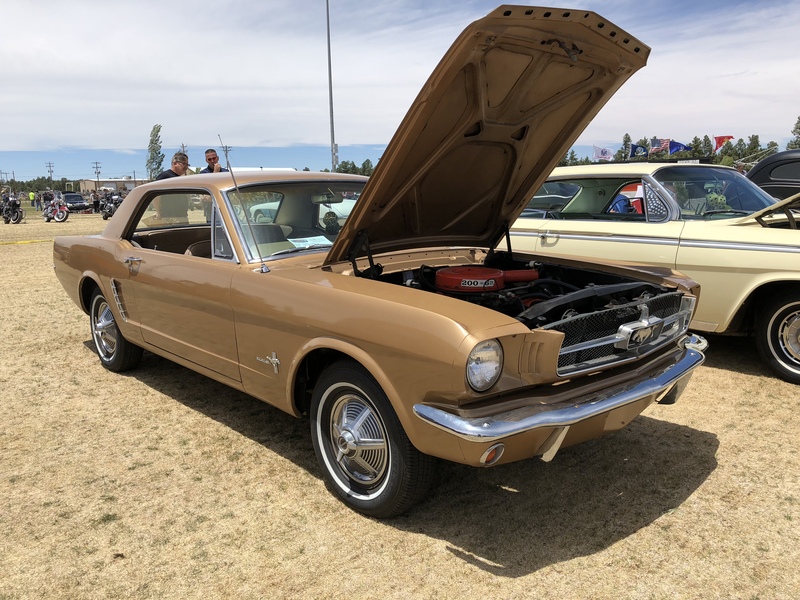 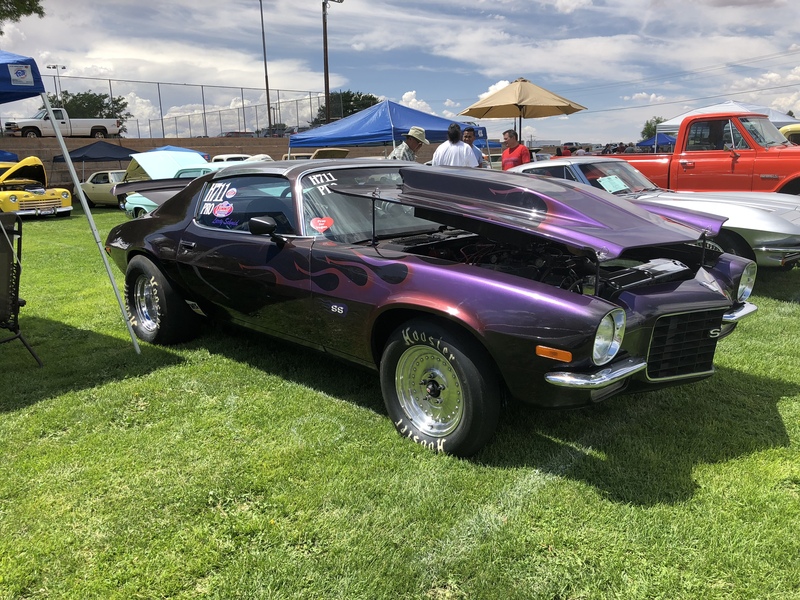 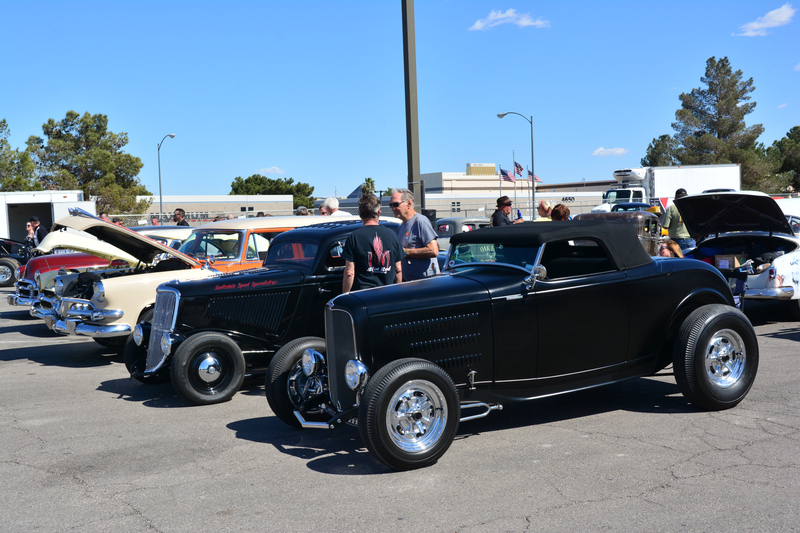 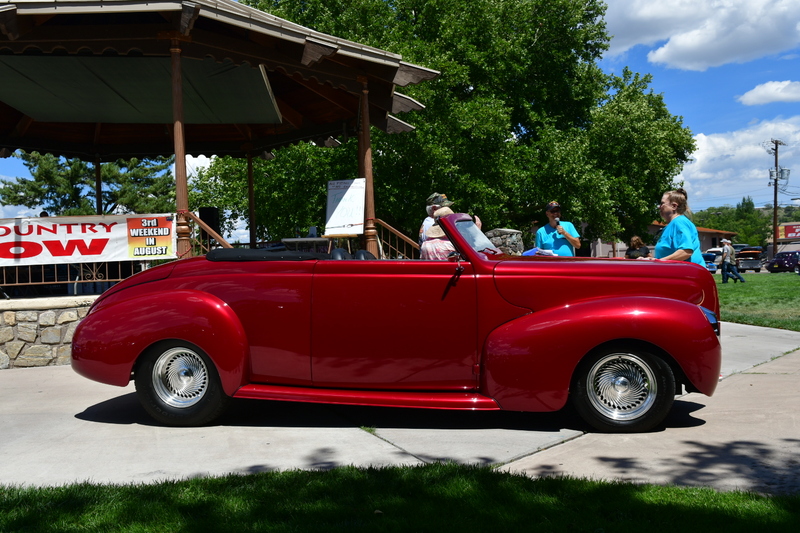 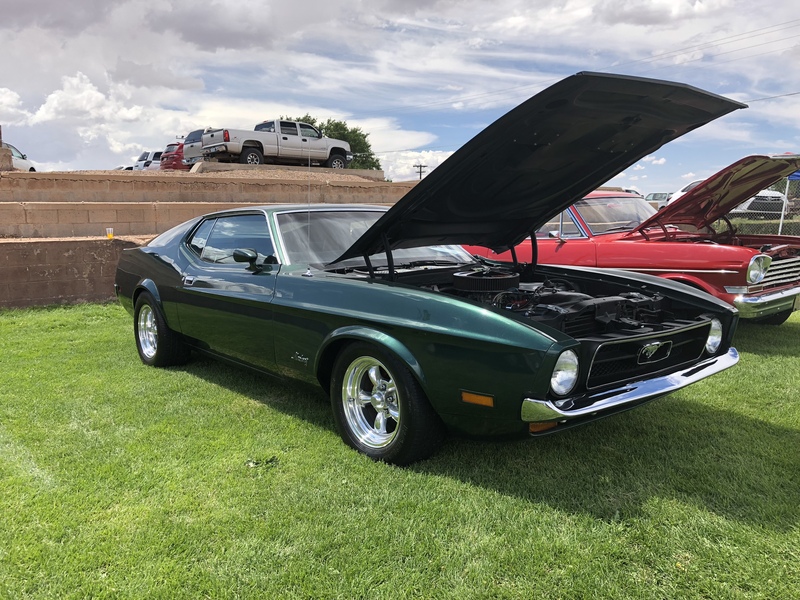 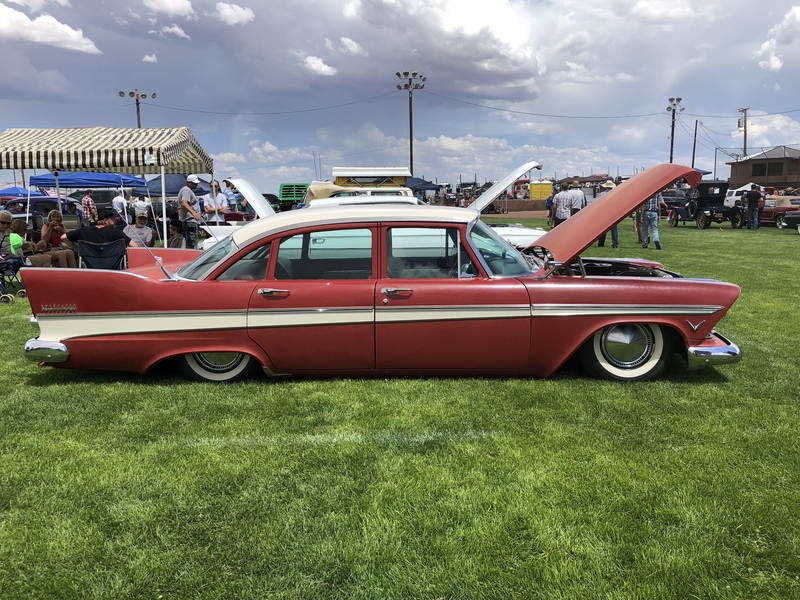 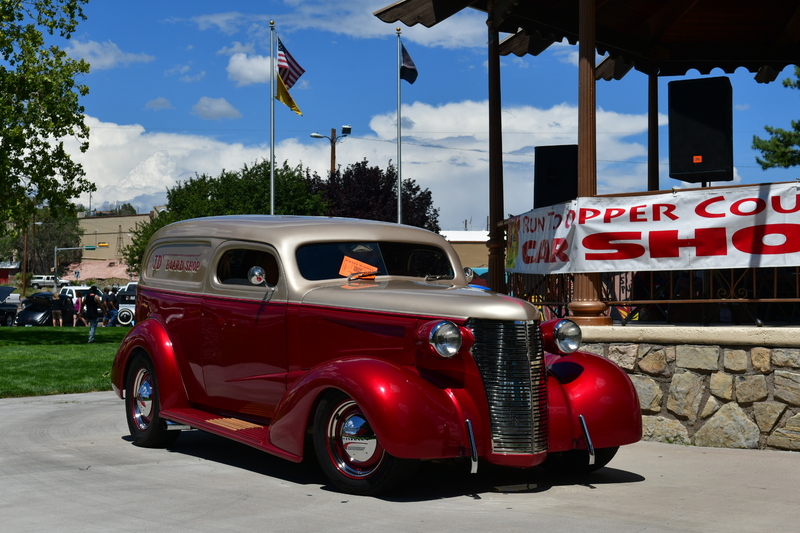 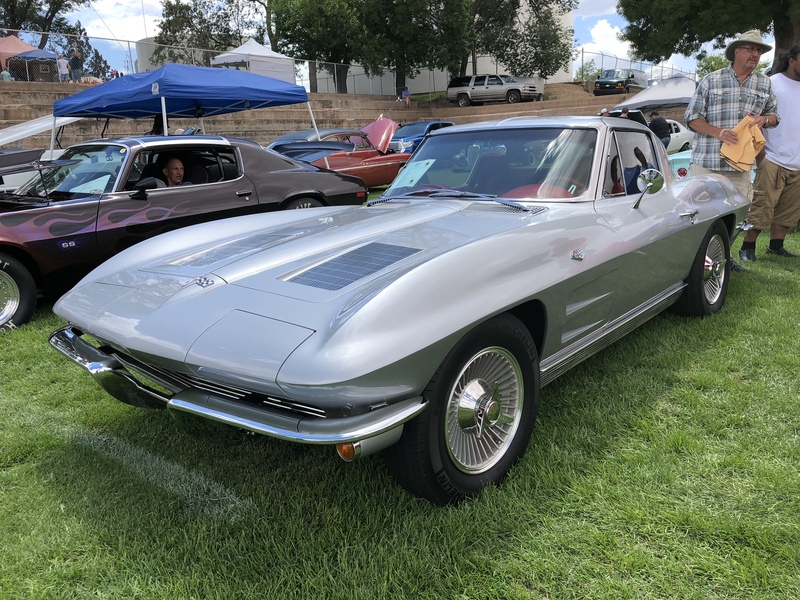 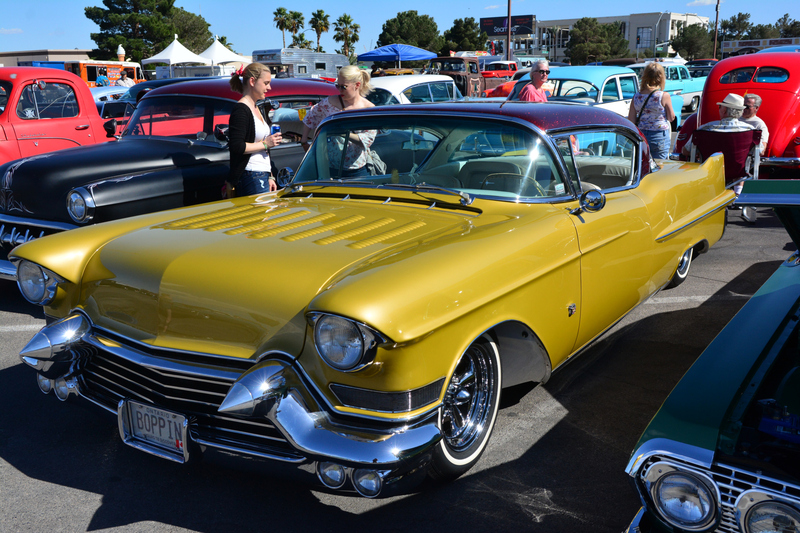 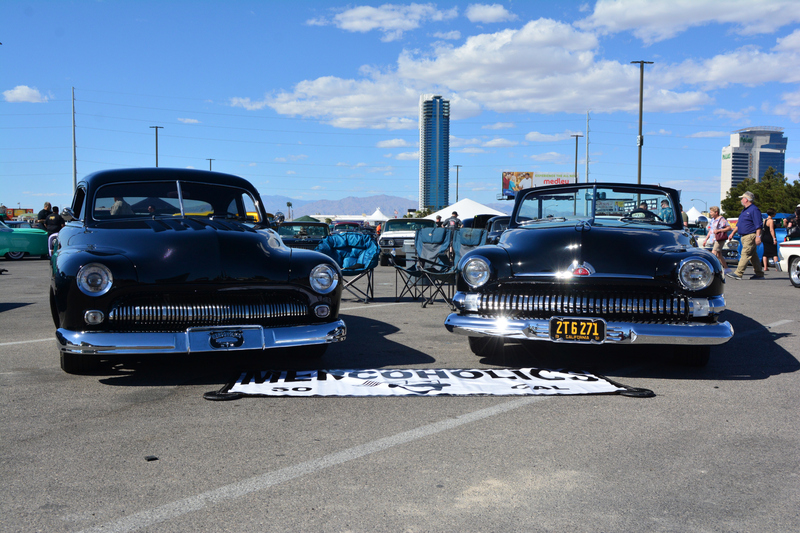 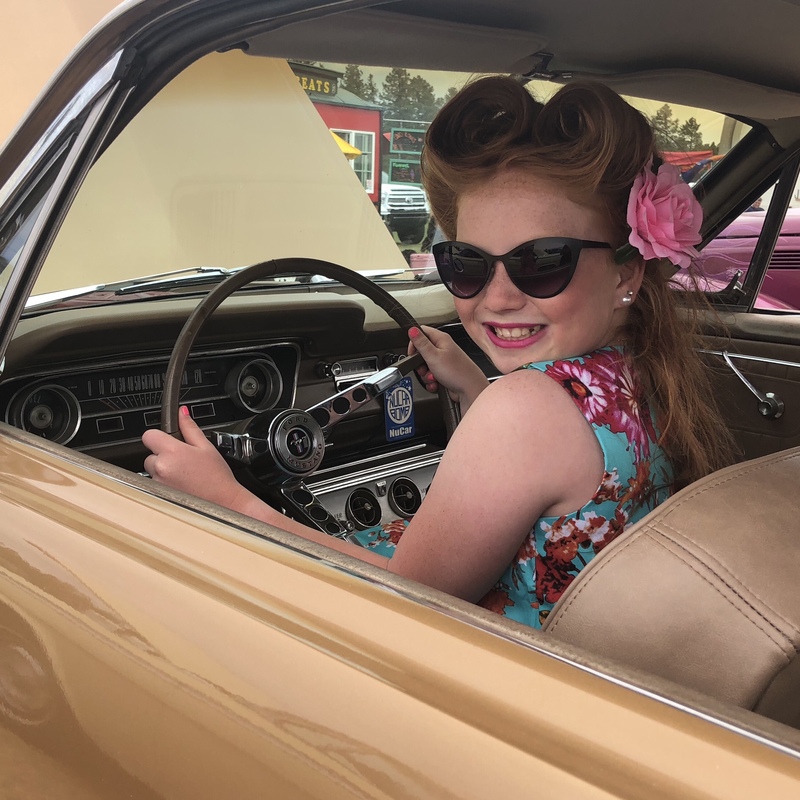 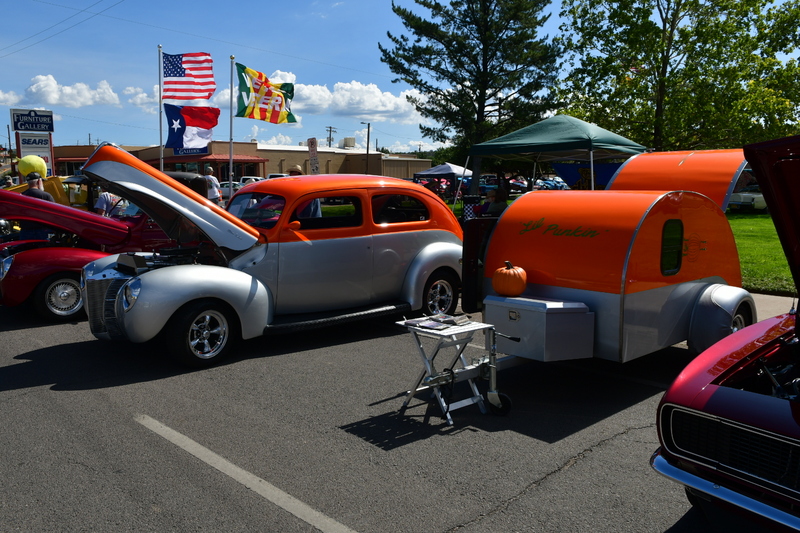 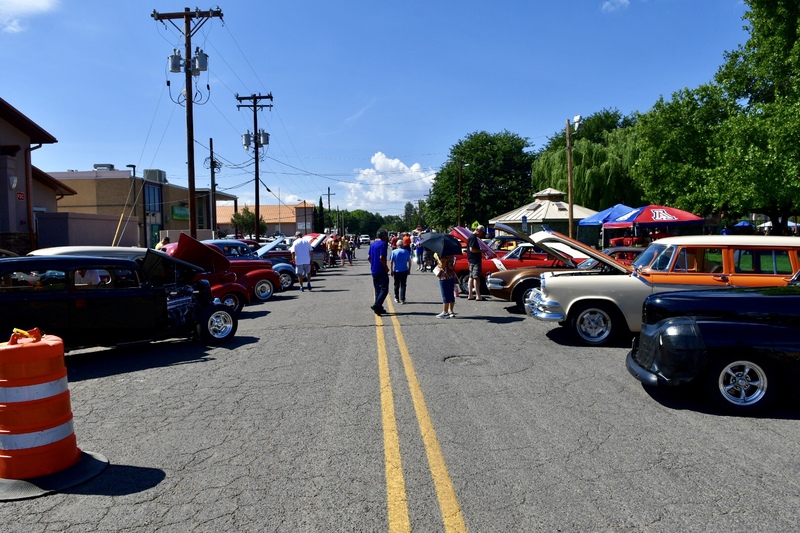 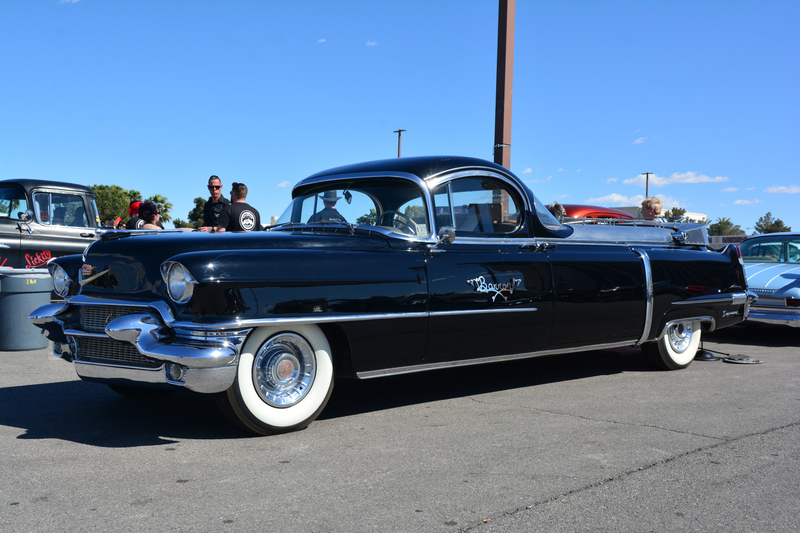 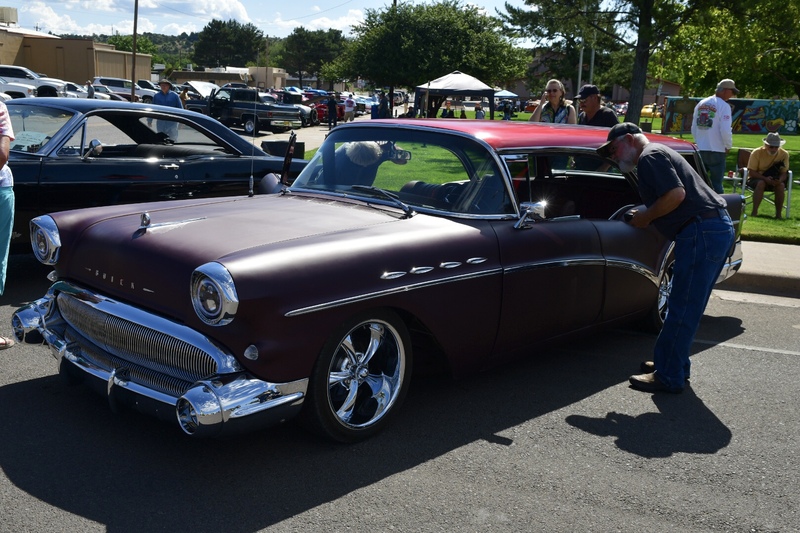 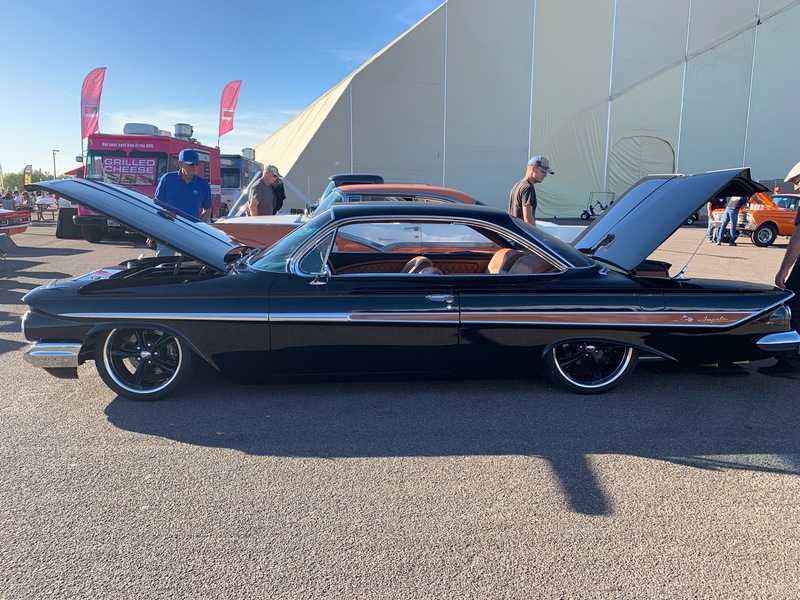 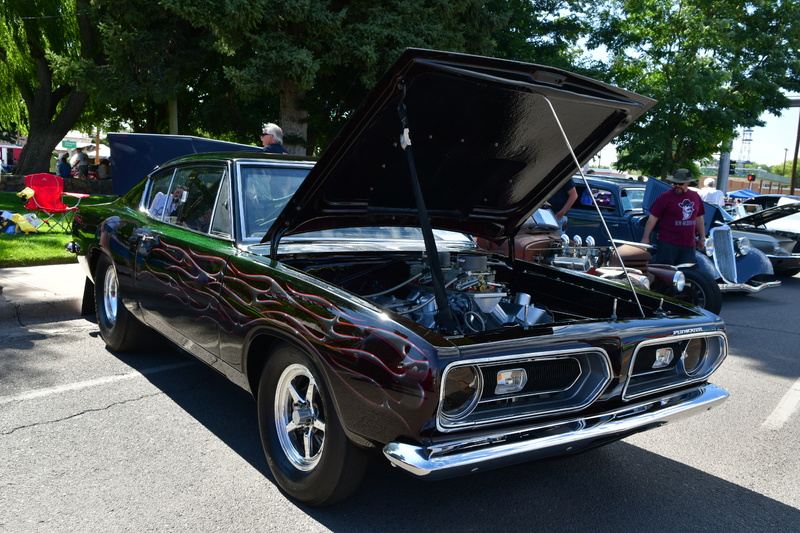 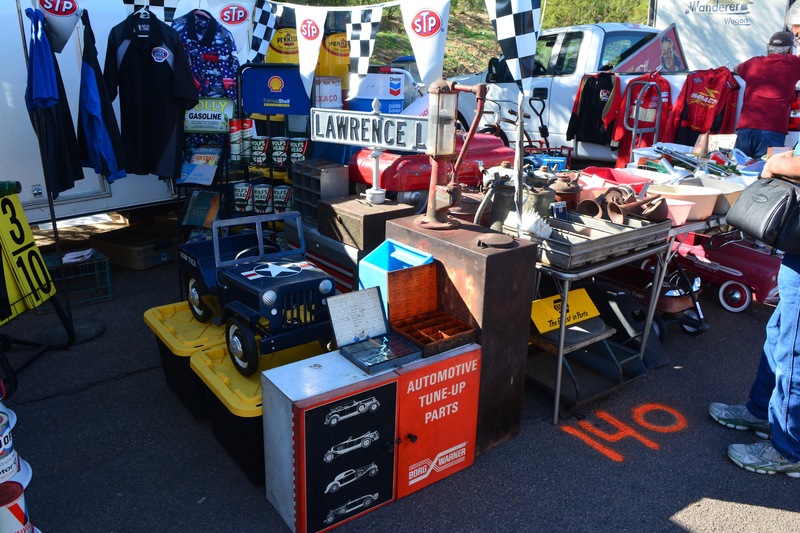 In honor of our service the Goodguys organization gave club members free admission and preferred parking for the event. 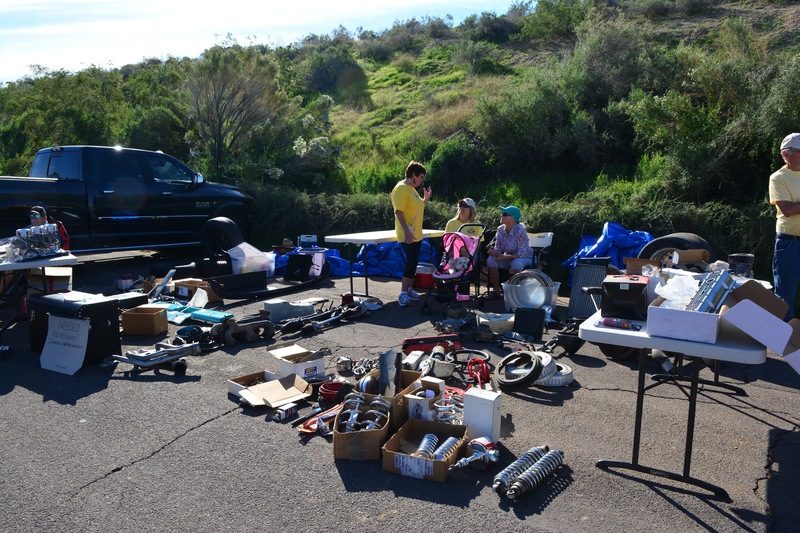 By all measures this was a huge event. 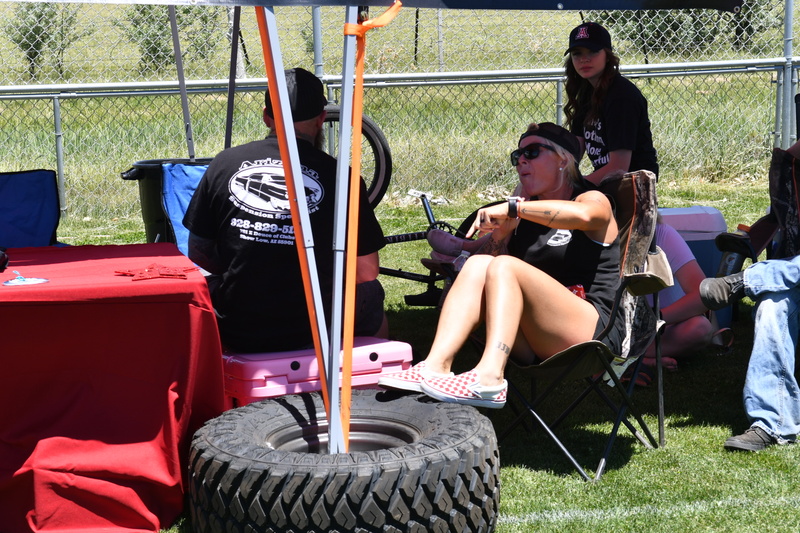 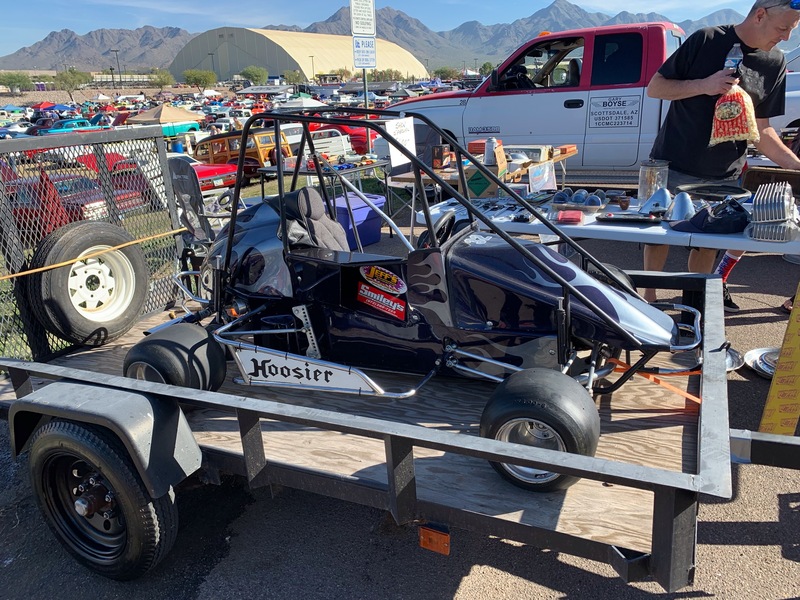 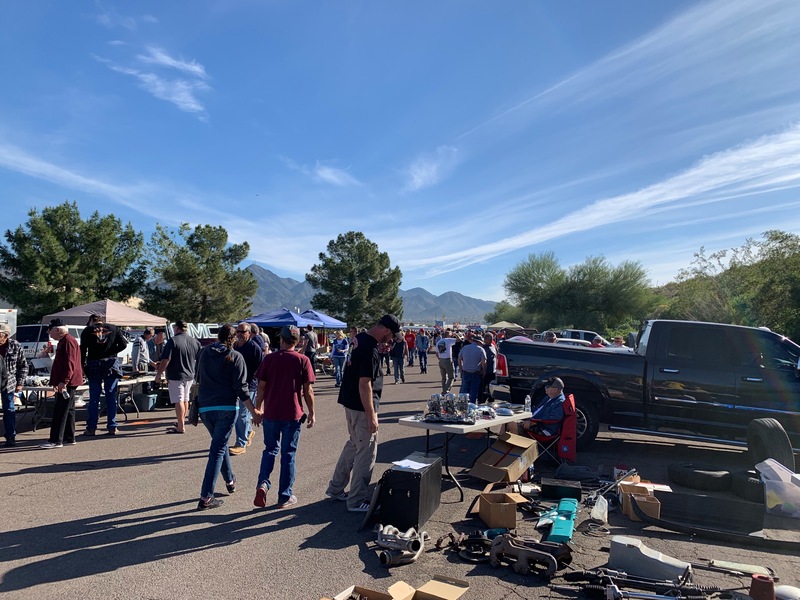 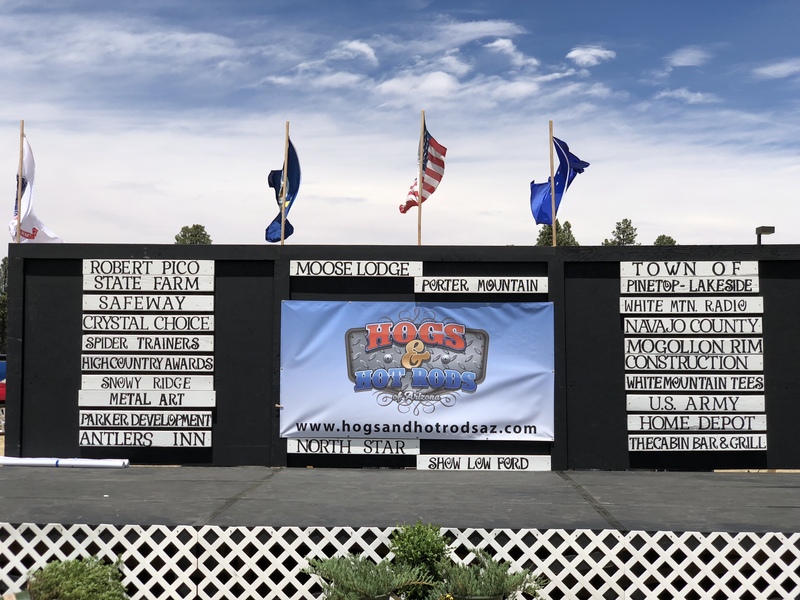 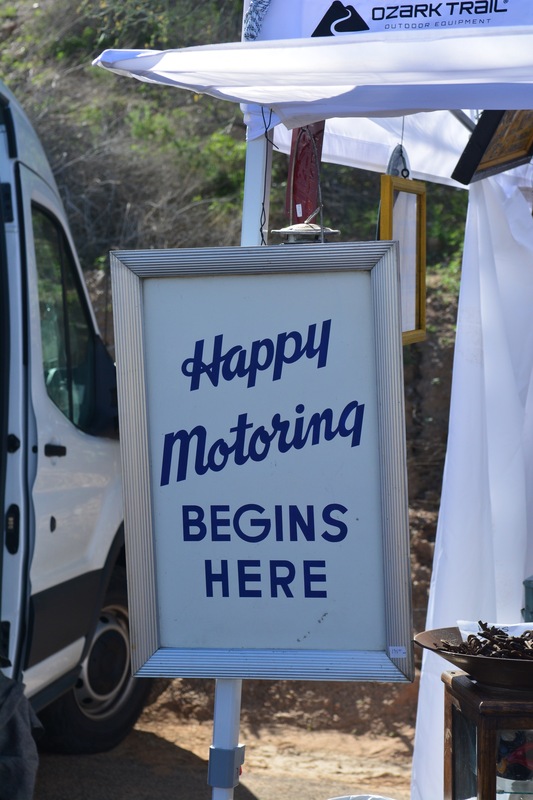 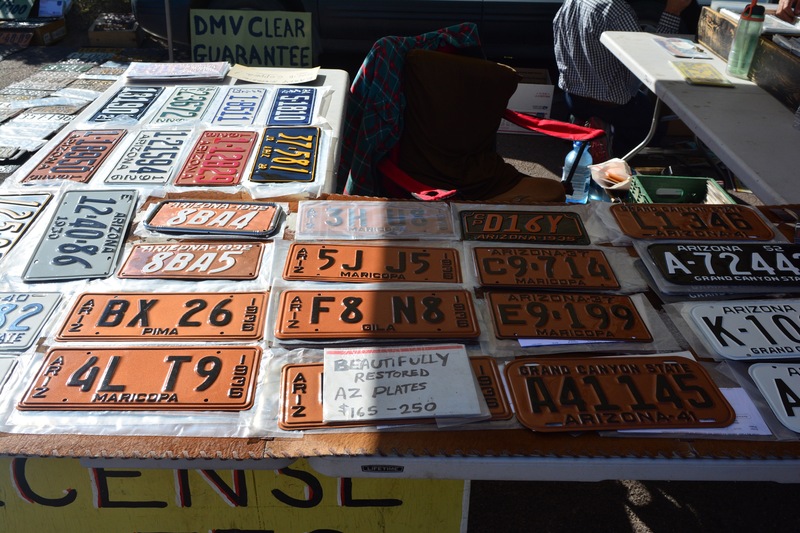 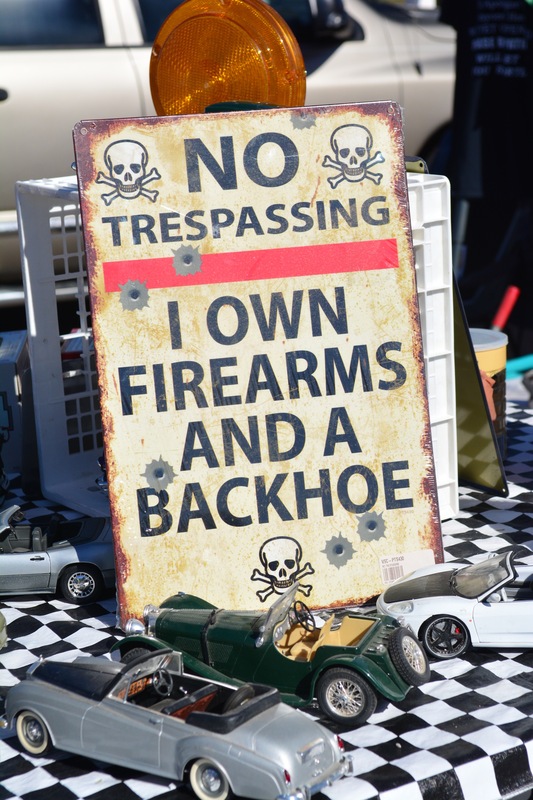 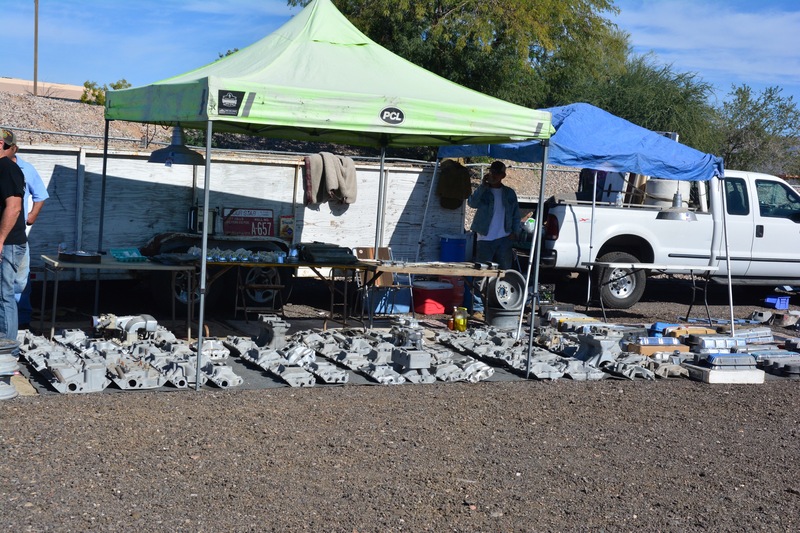 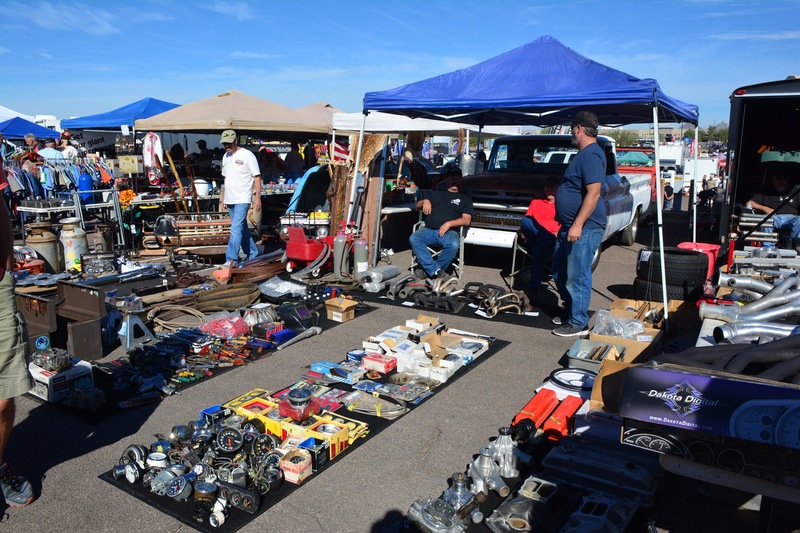 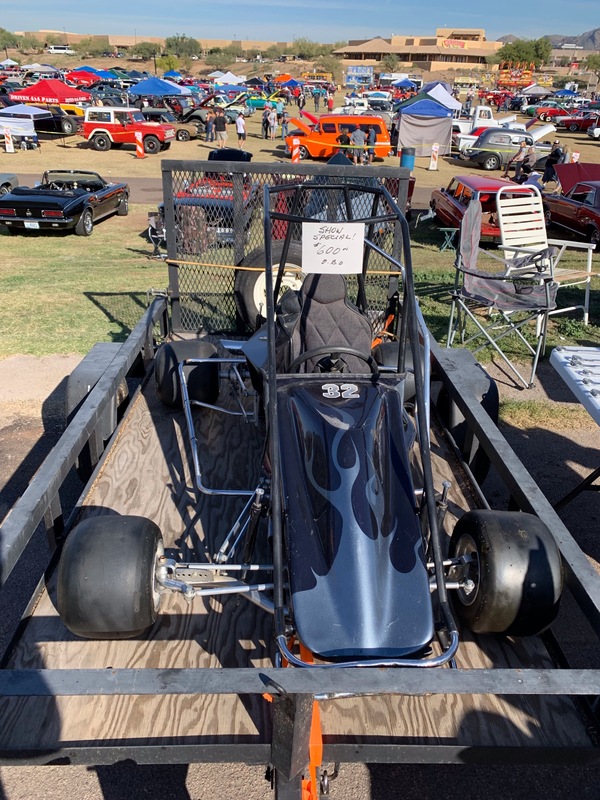 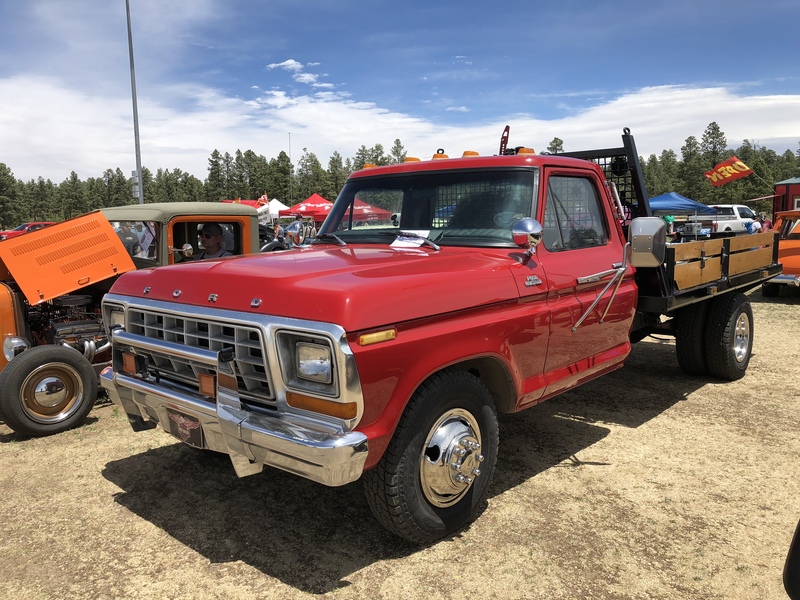 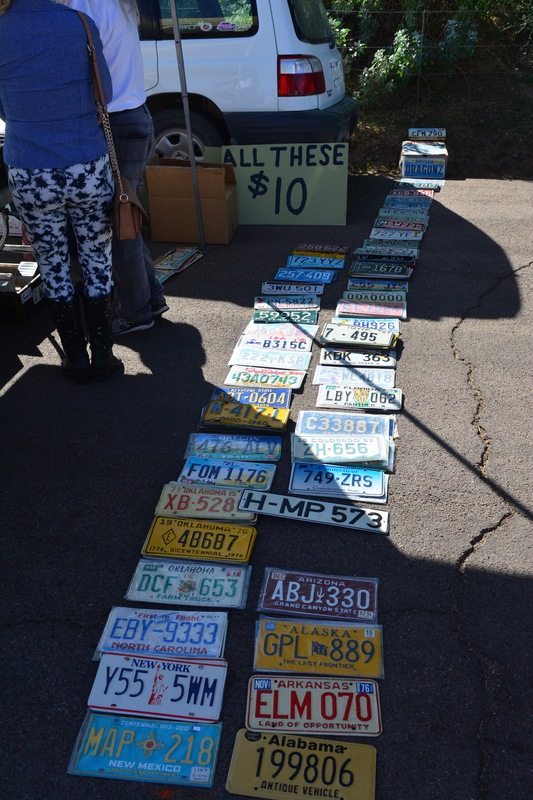 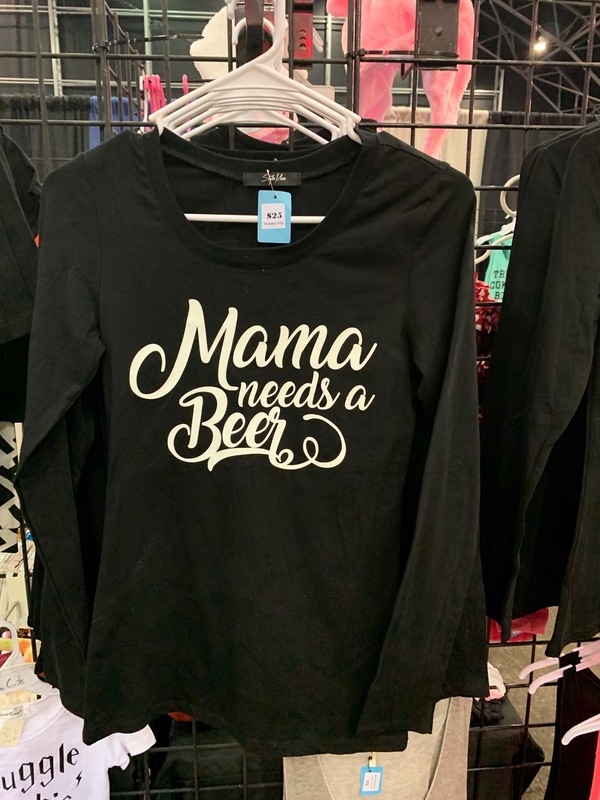 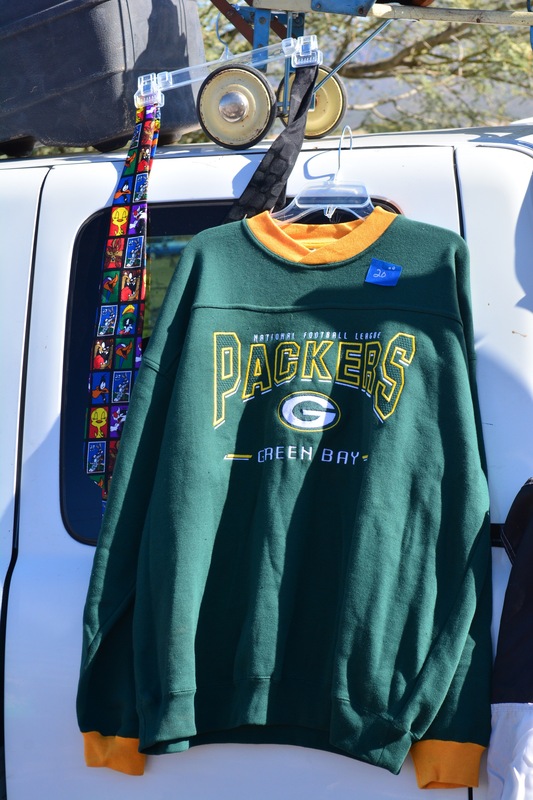 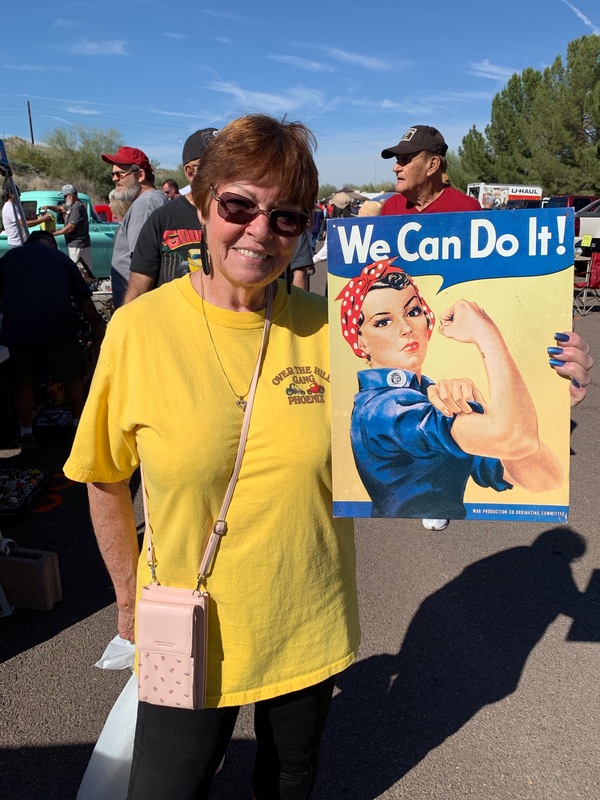 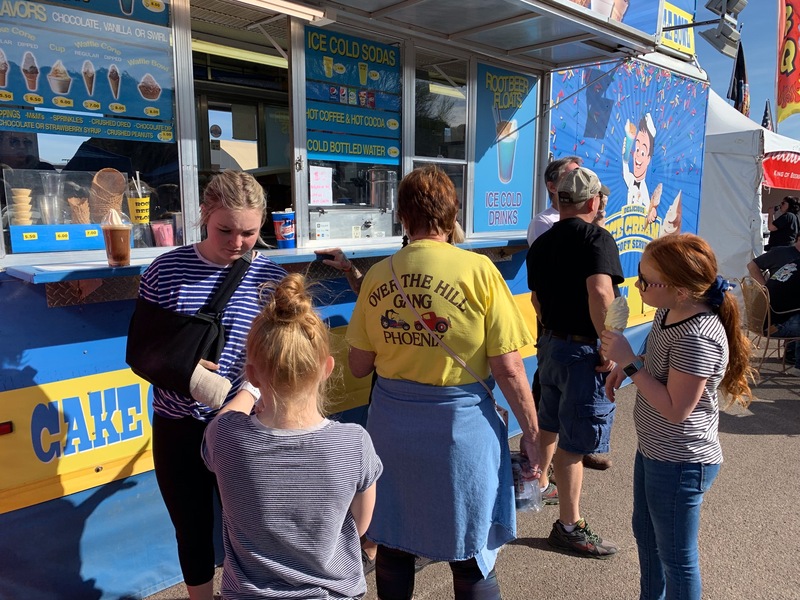 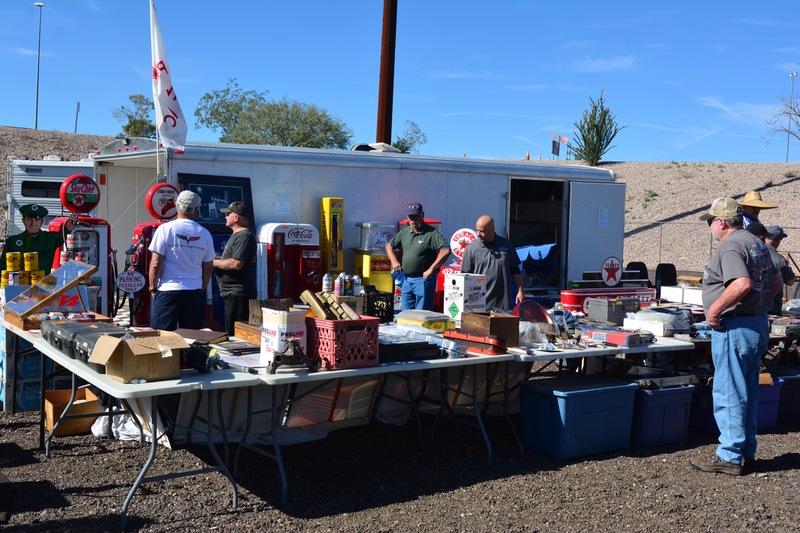 The field was full by 10 AM on Saturday, the Swap Meet was sold out by noon on Friday and the Vendor Semitruck parking area was filled as well. 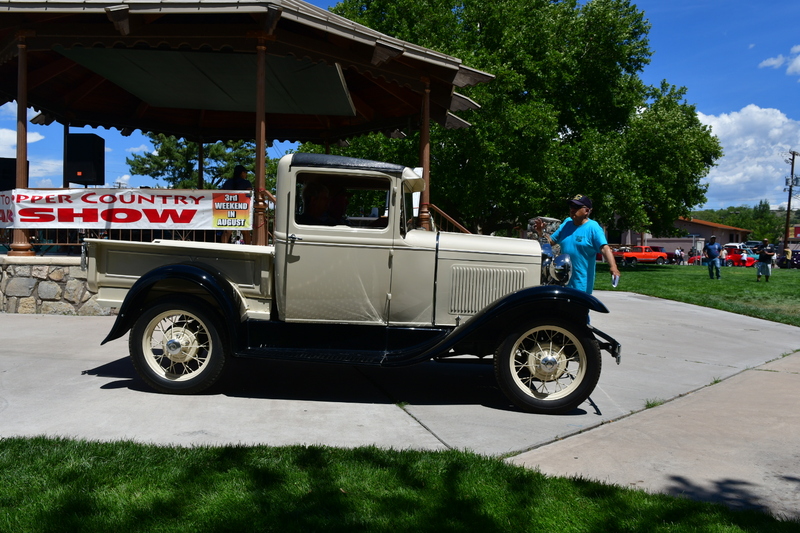 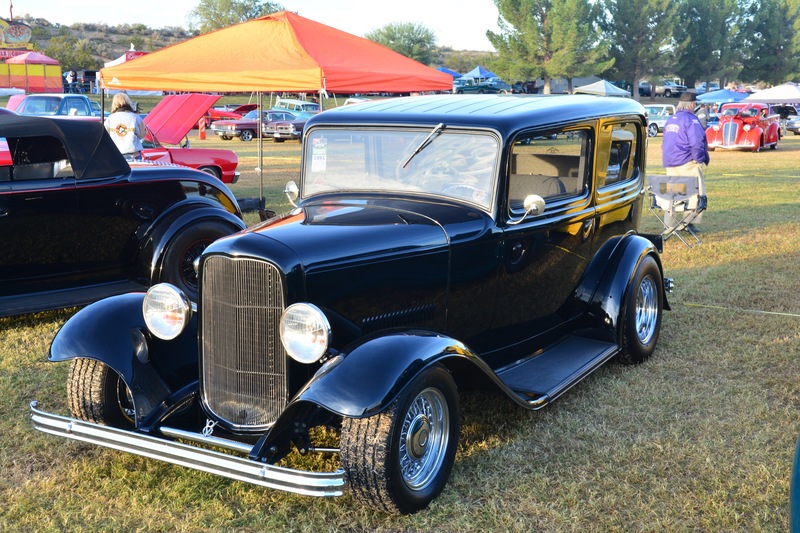 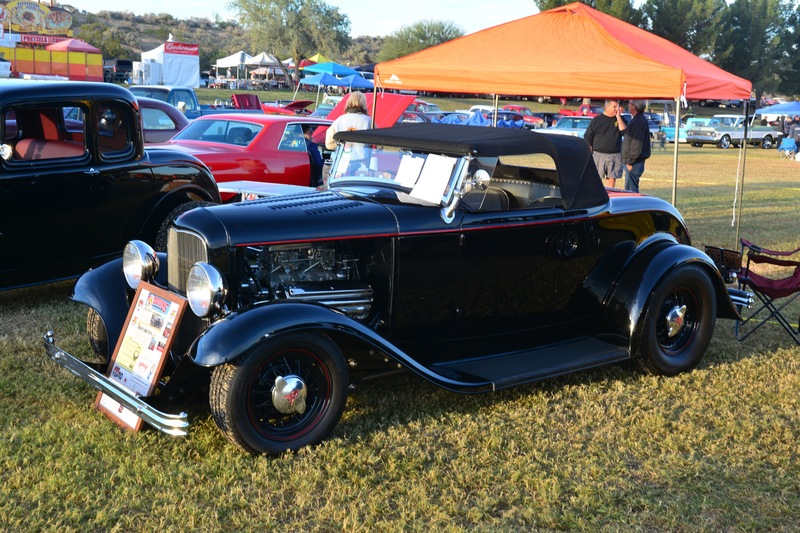 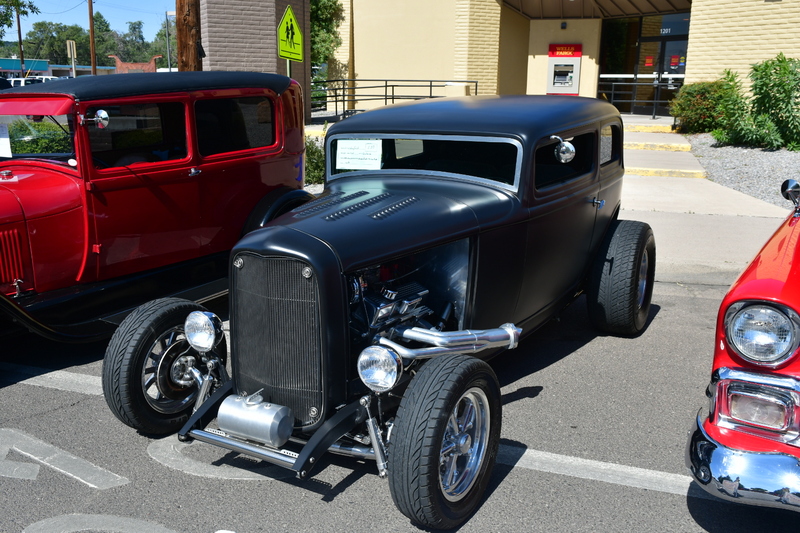 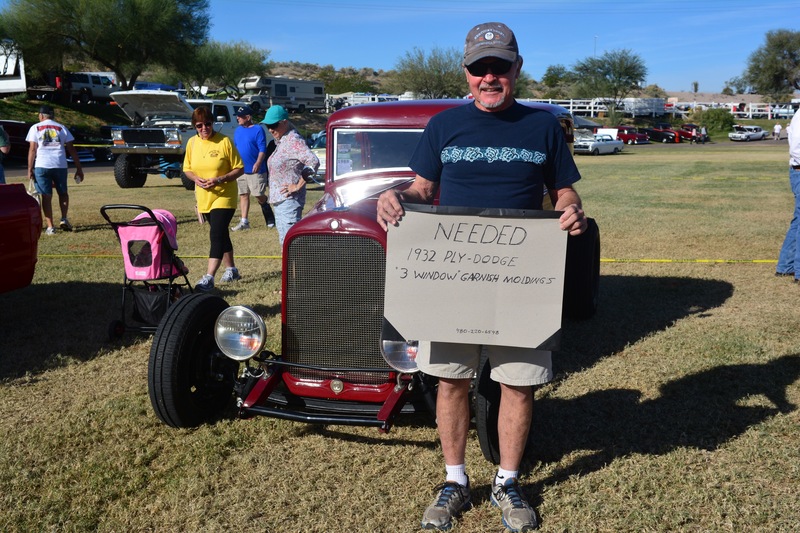 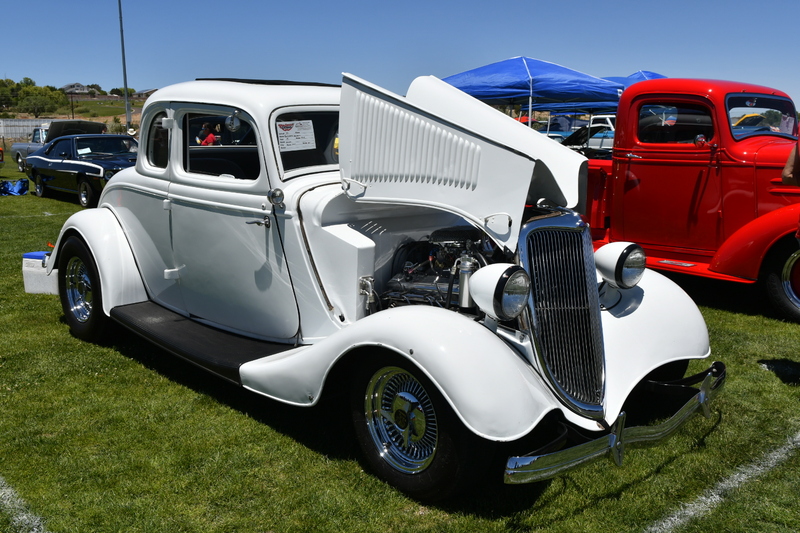 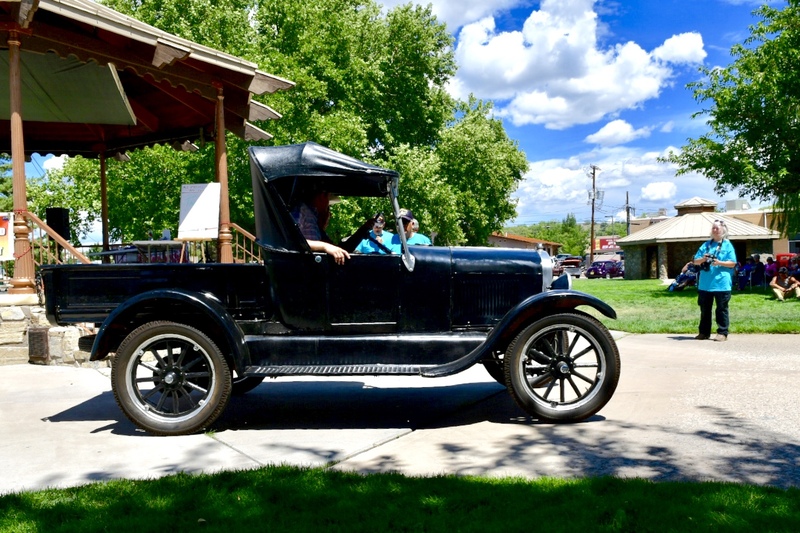 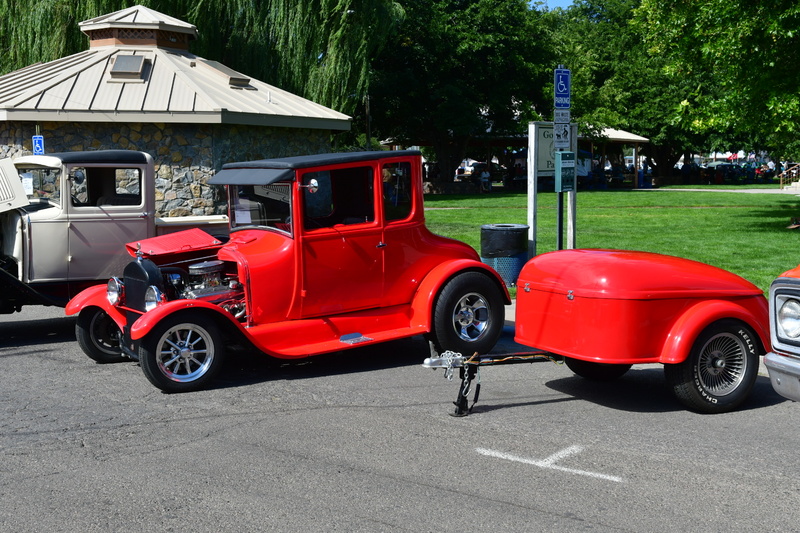 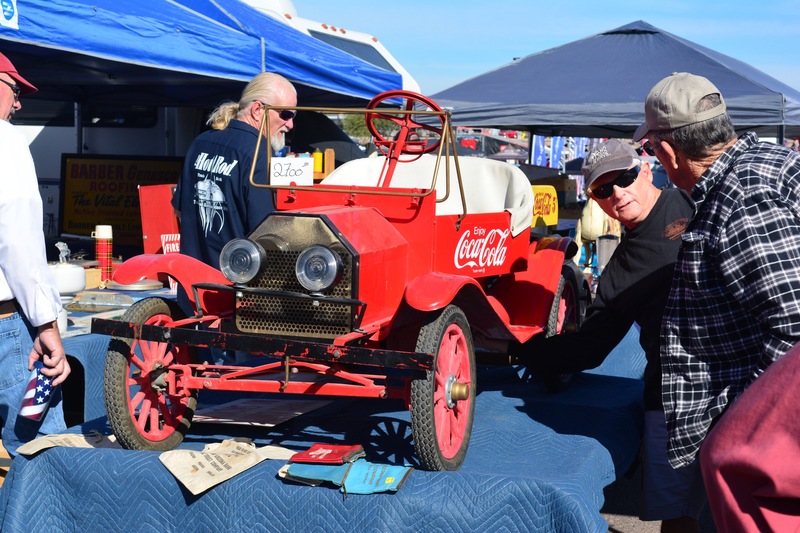 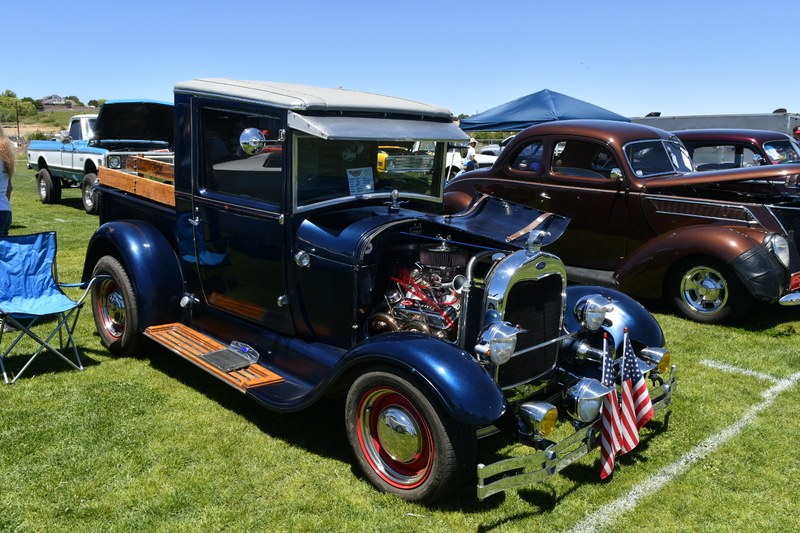 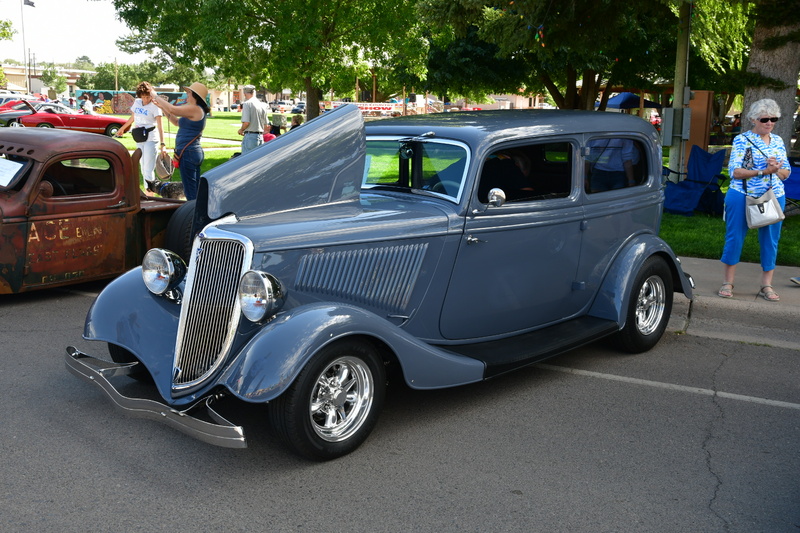 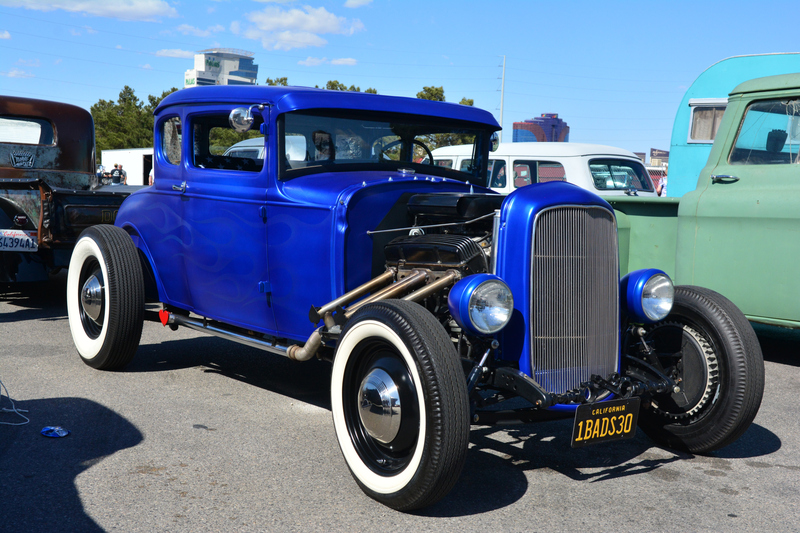 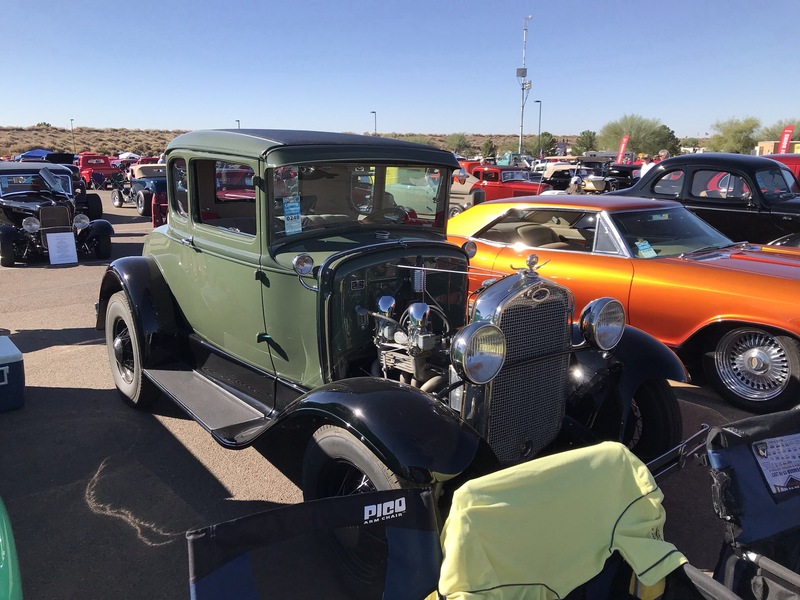 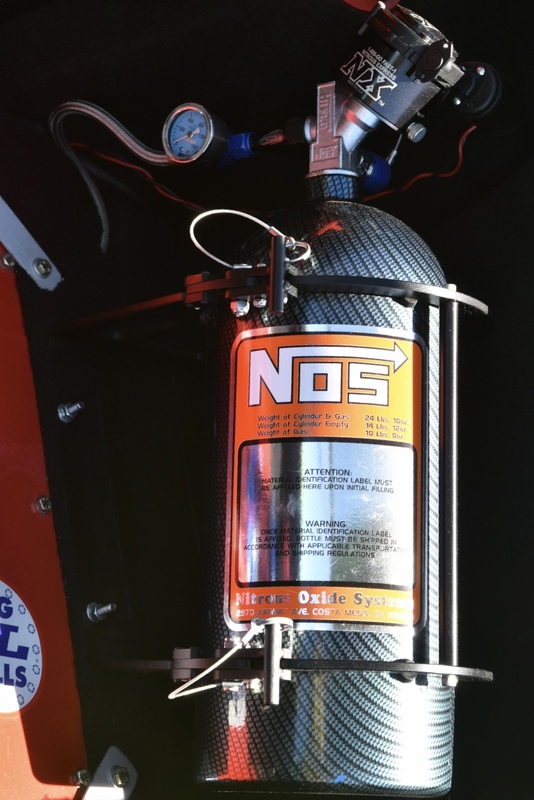 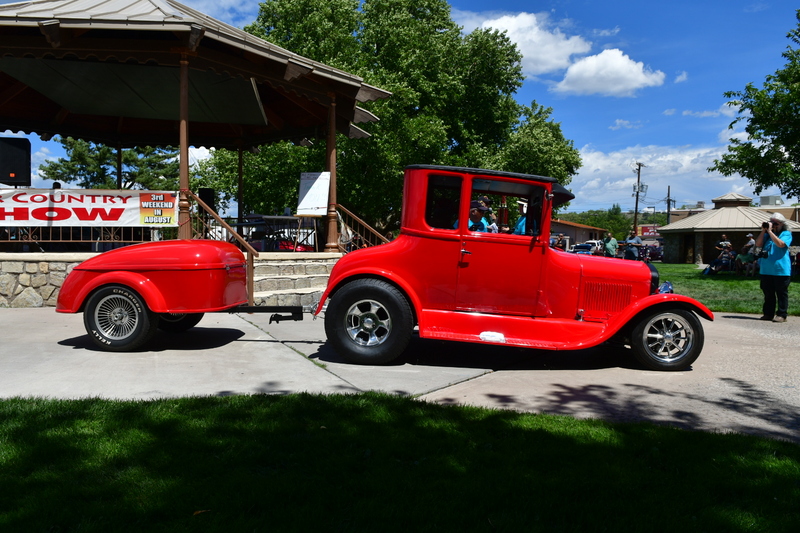 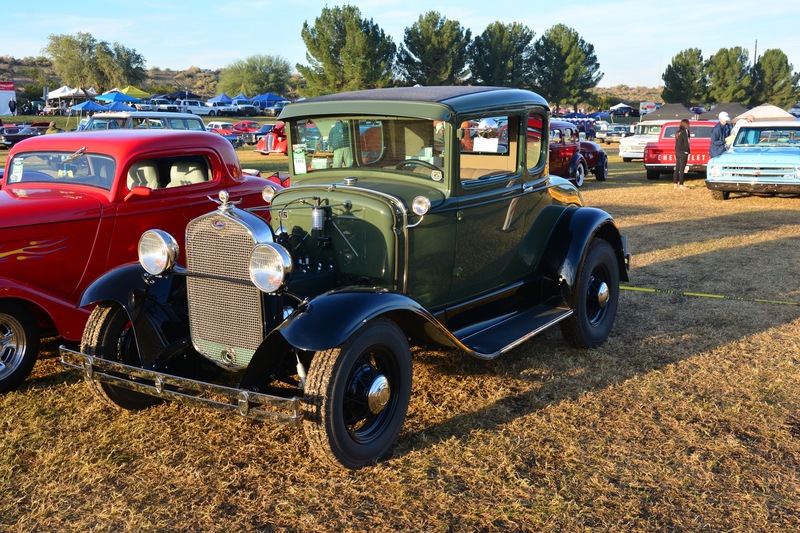 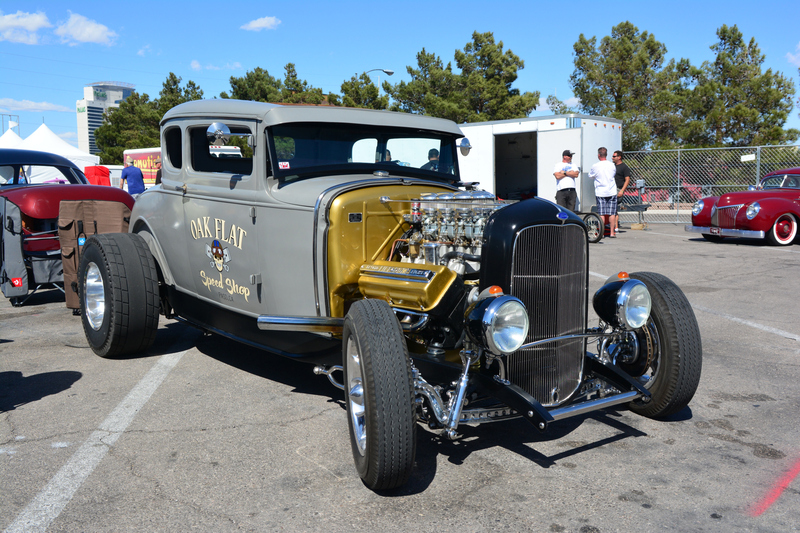 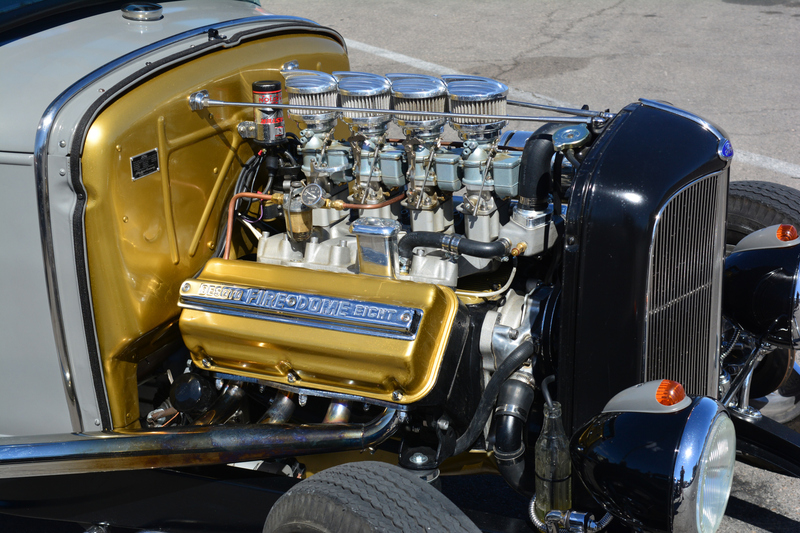 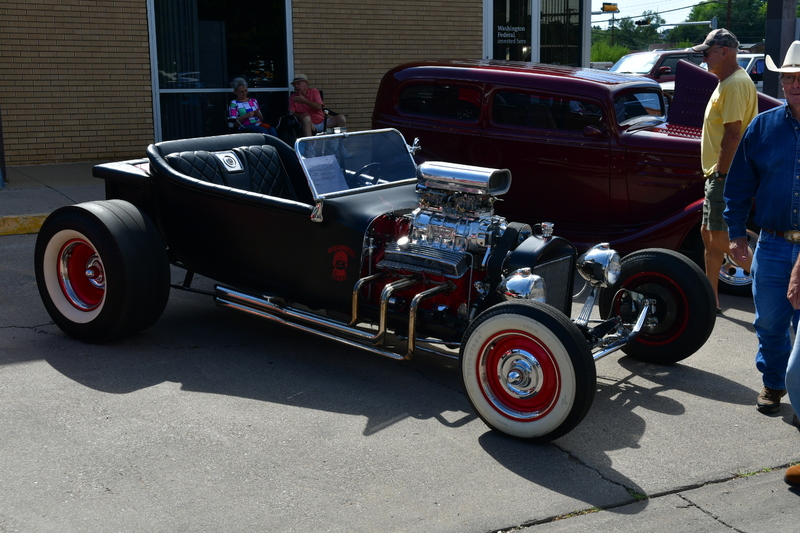 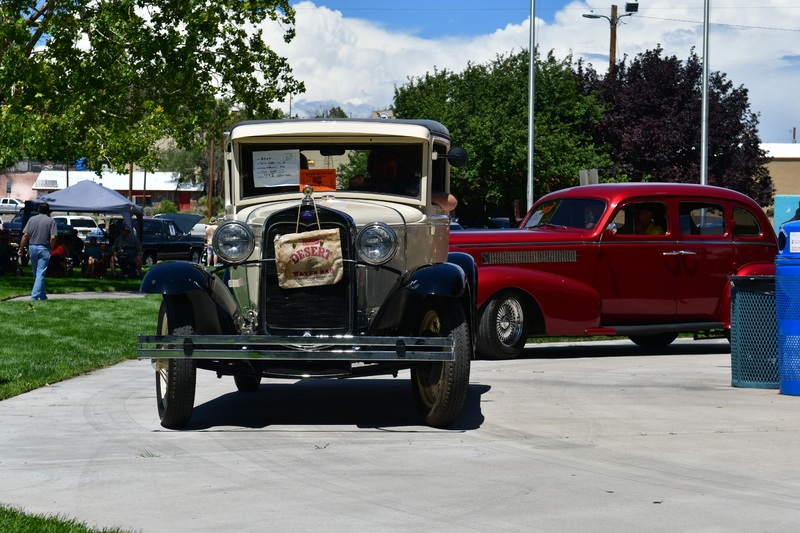 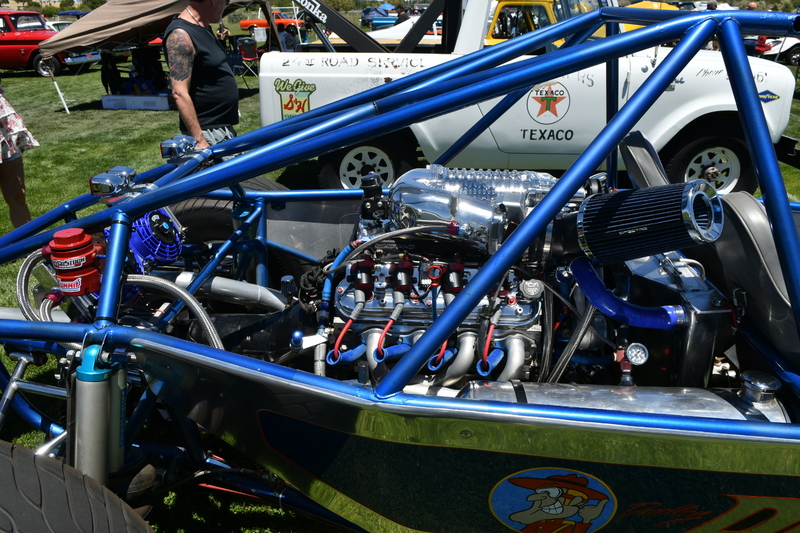 Dan Burnett garnered the Best Ford in a Ford with his totally correct Model A banger. 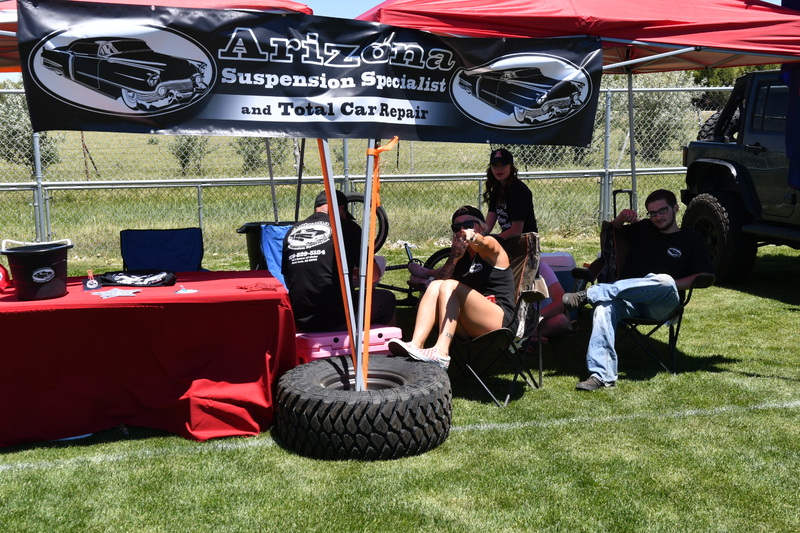 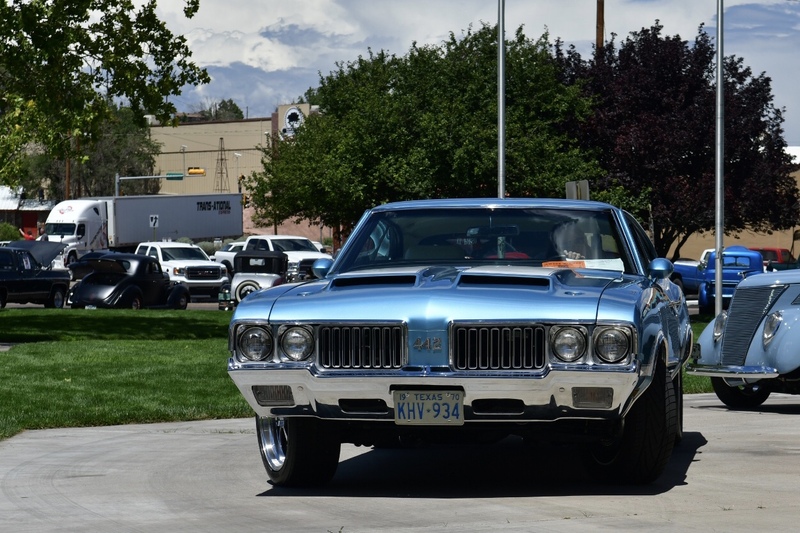 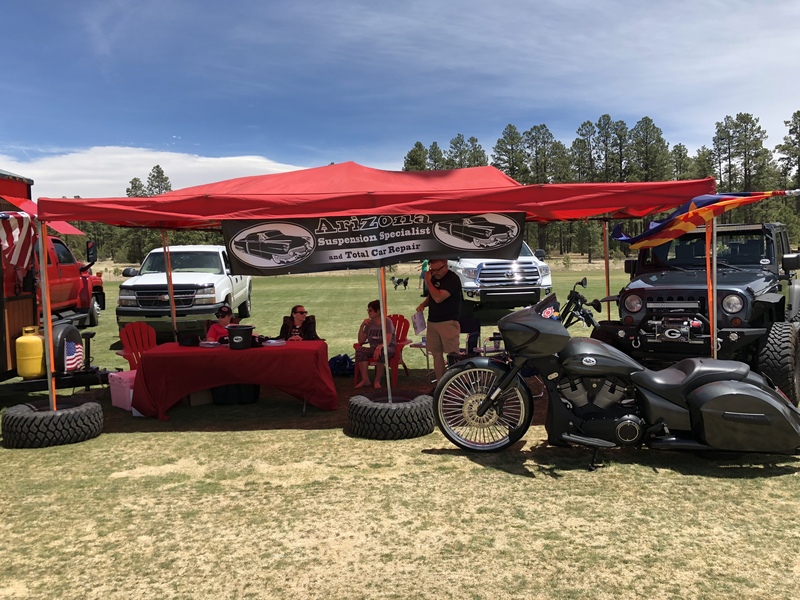 OTHG – Phoenix enjoying not having to work the GG Show! 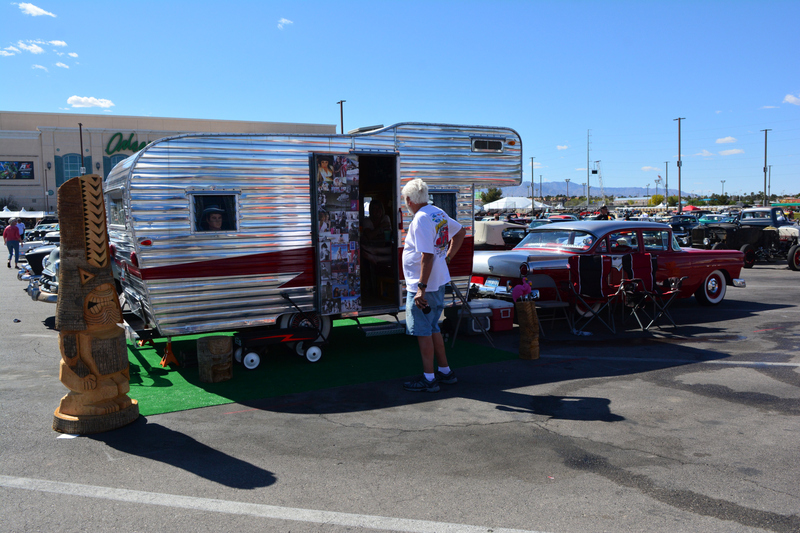 I would love to be able to say that Goodguys is trying to make the car hobby tent larger and more inclusive, but… next year the Big Tent will be gone and the entire field will be laid out differently… the inside vendors will move to large building, the Vendor semis will move to where the RV Parking is now and the RVs will move to where the Swap Meet was, the Swap Meet is headed toward where the Big Tent was… the Times They Are A Changing!